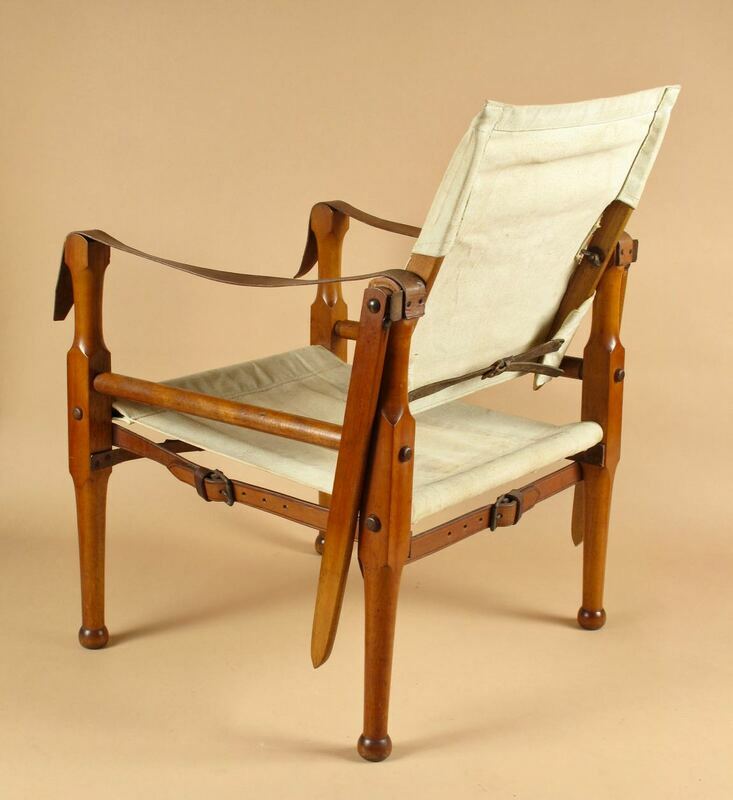 FOR THE NEW COLLECTOR AND THE MUSEUM DIRECTOR. 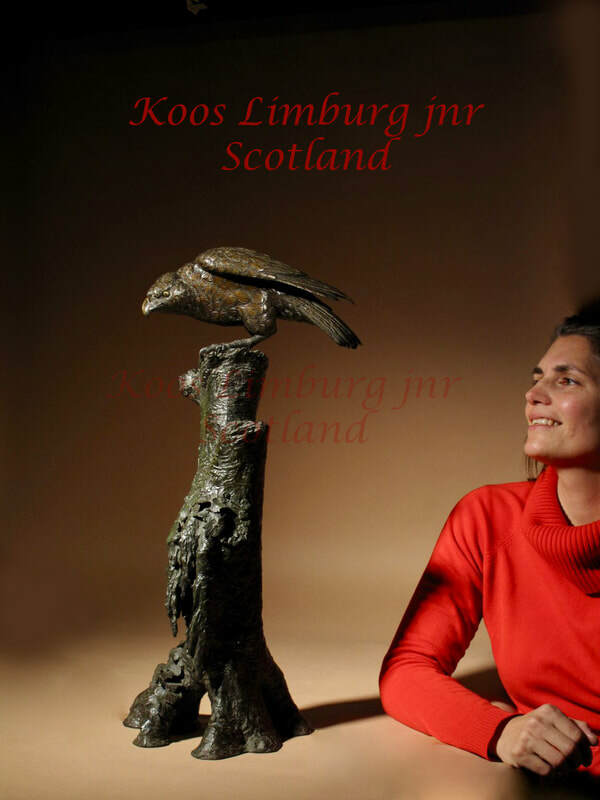 Koos Limburg Jnr. 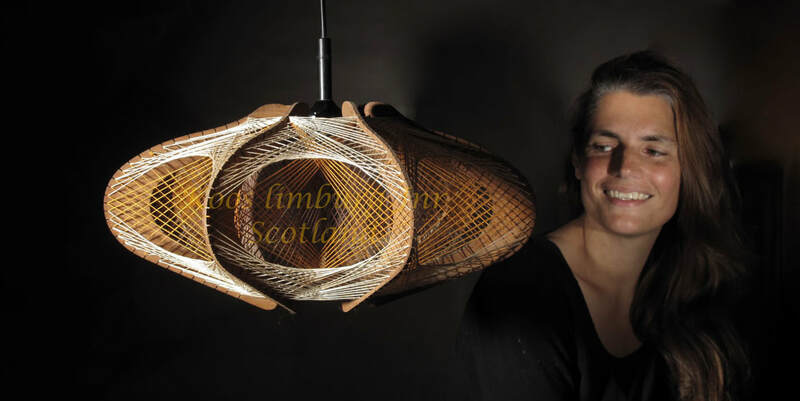 was born in The Netherlands, but lives already since 1994 in Scotland. 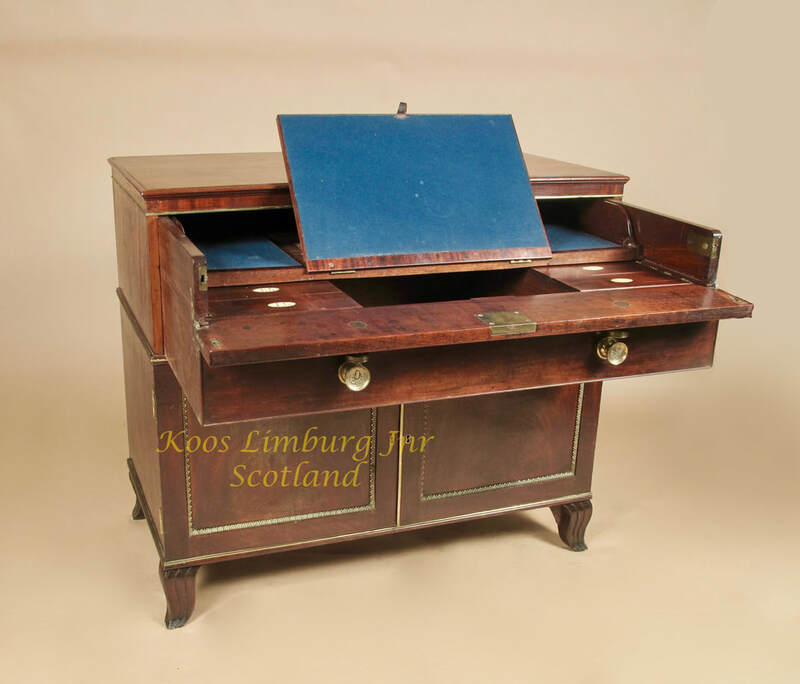 Over those years he has build up a well established and well respected antique business by participation only on important antique fairs in the UK as well as at the continent. 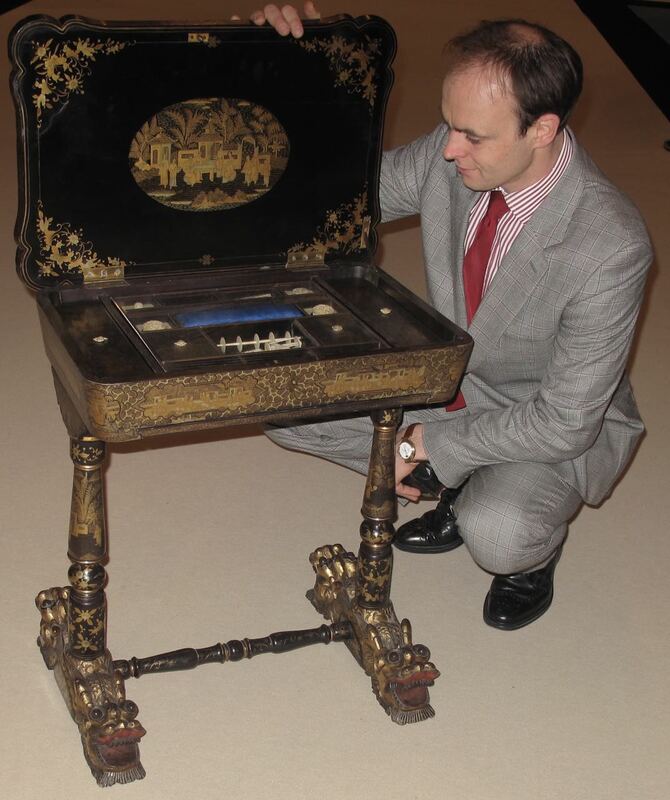 He does not want to be indentified as a specialist in one particular field or another, with the result that you can find anything and everything on his stand, covering the whole range of rare and unusual quality items of interest to the first time collector up to the Museum director. 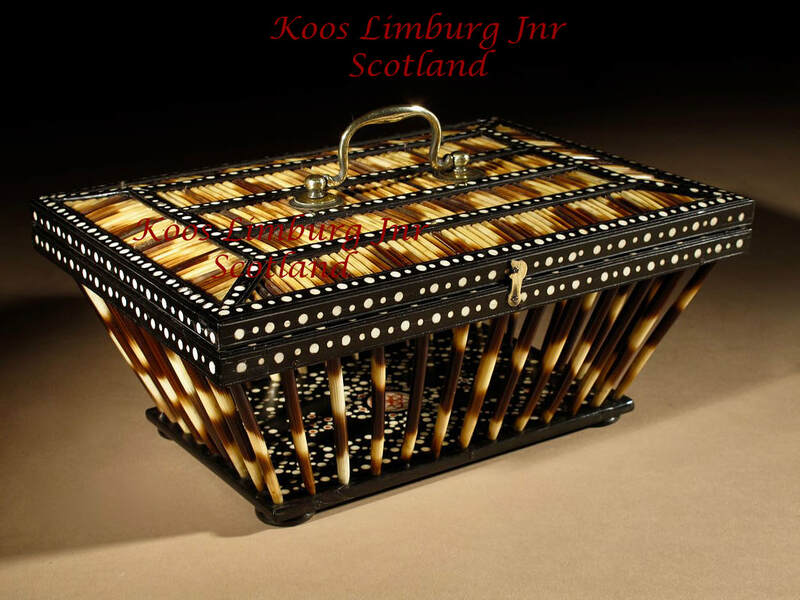 Koos Limburg Jnr est né aux Pays-Bas, et s’est installé en Ecosse en 1994. Au fil des années il a créé son entreprise d’antiquariat bien établie et respectée en ne participant qu’aux salons et foires d’antiquaires au Royaume-Uni ainsi que sur le continent. 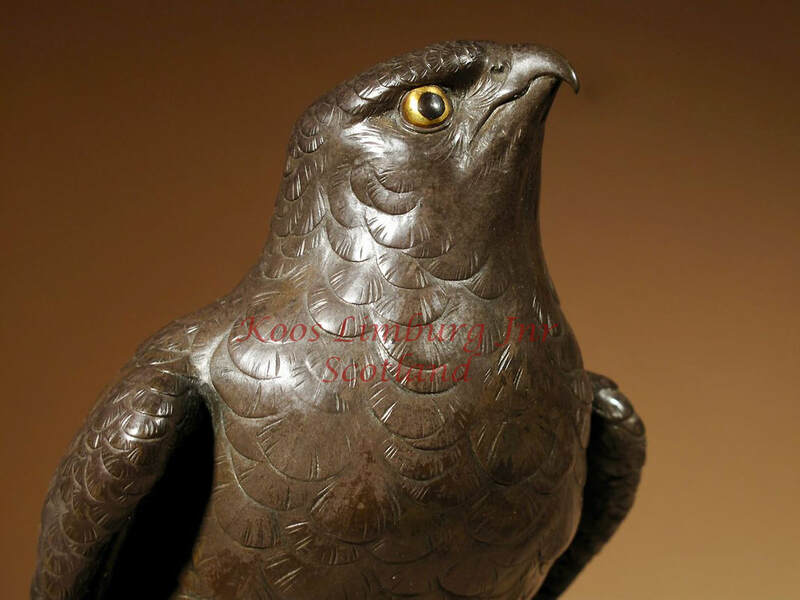 Koos est spécialisé dans les objets de qualité exceptionnelle sur toute la ligne, ce qui lui a permis de vendre des objets aux musées dans le monde entier. 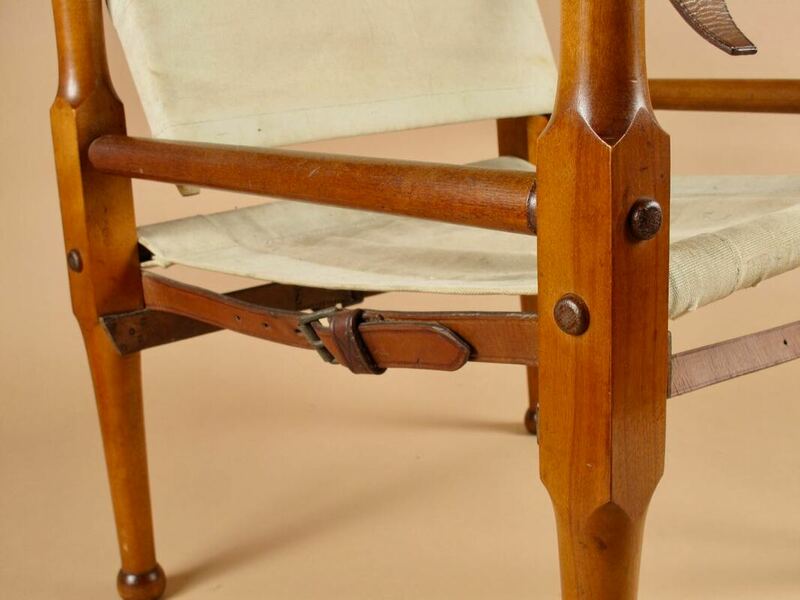 Son slogan est de vendre « du nouveau collectionneur au directeur de musée ». 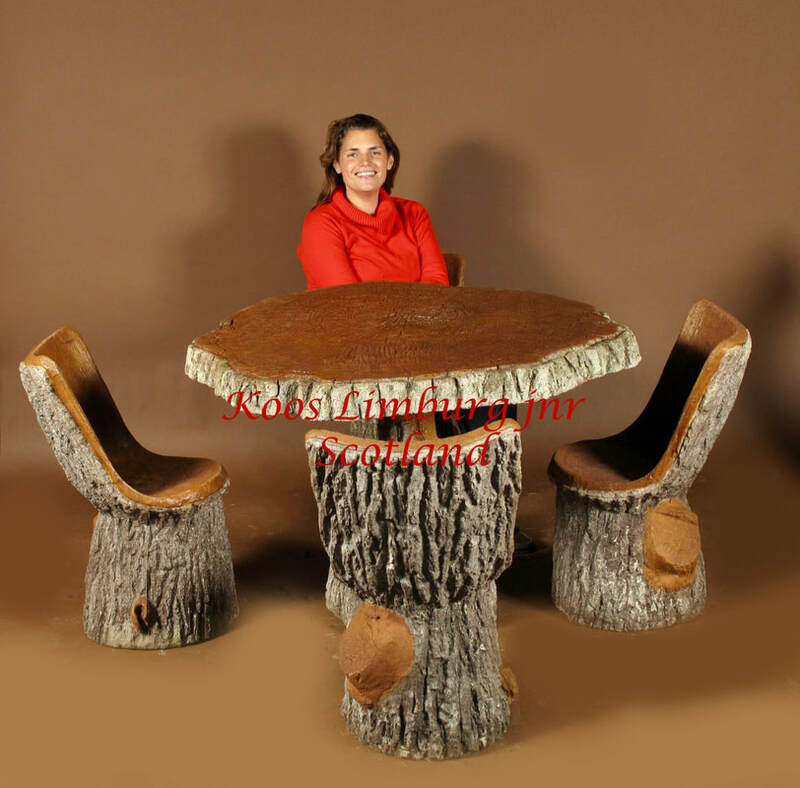 Koos a une connaissance approfondie de tous les objets qu’il vend. Sa présentation du stand sur les salons et foires est bien connue et renommée pour sa valeur artistique et dramatique. Ses stands montrent la qualité exceptionnelle de ses objets. 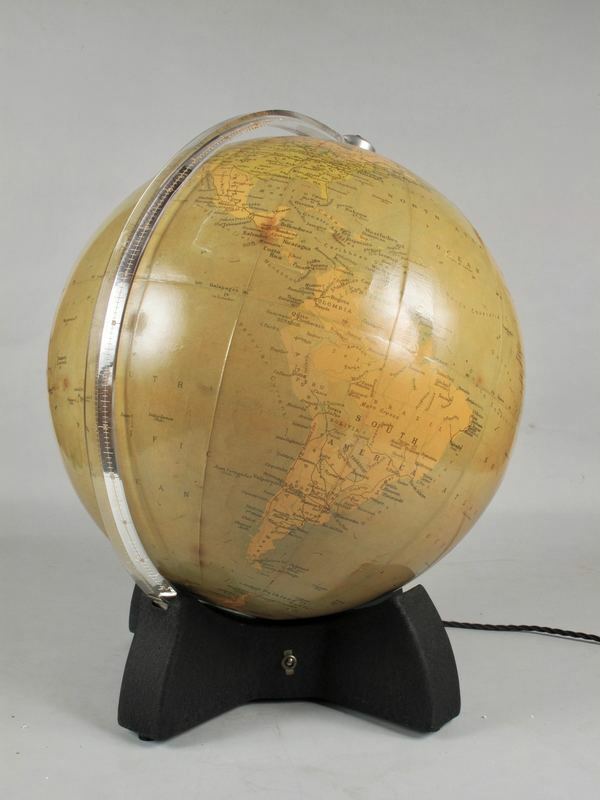 Il ne désire pas se spécialiser dans un seul domaine ou dans une période spécifique, et c’est pour cela que vous trouverez de tout sur son stand, de l’objet rare pour le collectionneur débutant aux objets de qualité exceptionnelle pour le directeur de musée. Il a été beaucoup influencé par ses parents, qui l’ont formé et qui lui ont transmis leur savoir, leur connaissance et leur enthousiasme pour l’antiquariat. 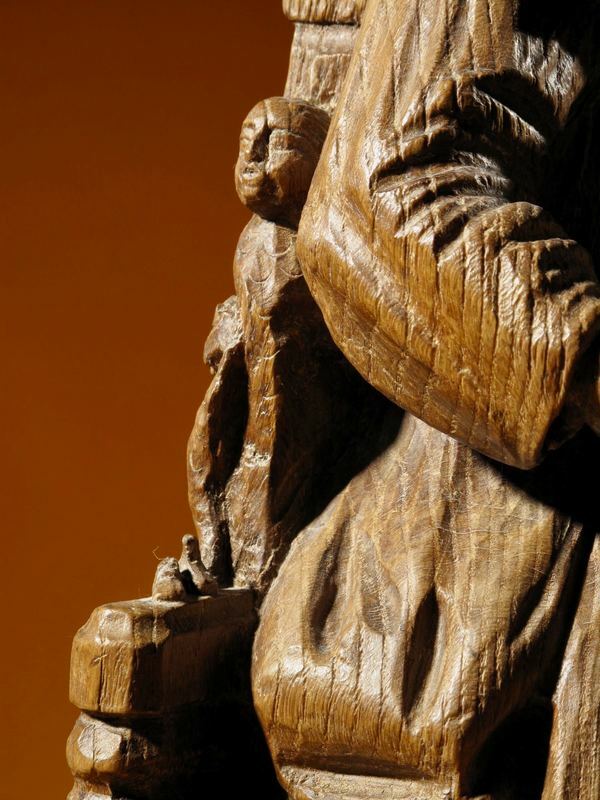 Koos se sent très privilégié par ce support familial, ainsi que par l’accès à la bibliothèque familiale qui lui permet de faire des recherches détaillées. 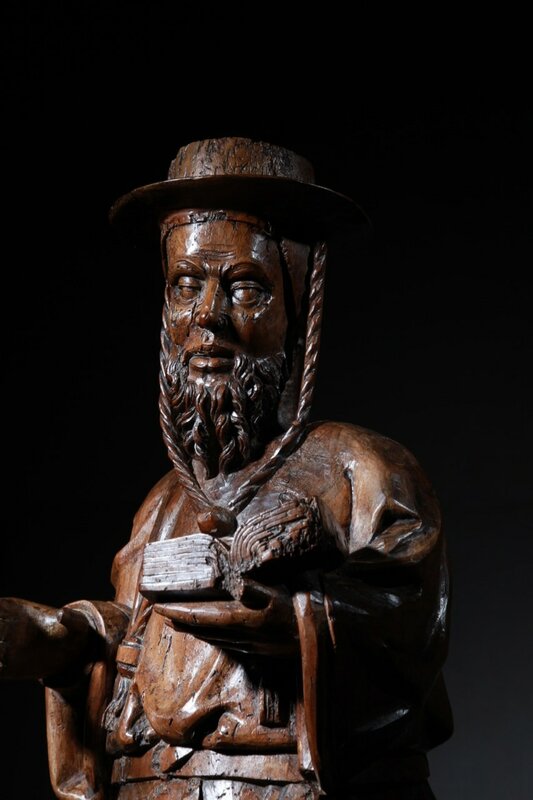 Koos garantit à chaque collectionneur potentiel qu’ils sont entre de bonnes mains et que les objets présentés ont été minutieusement étudiés par lui-même. 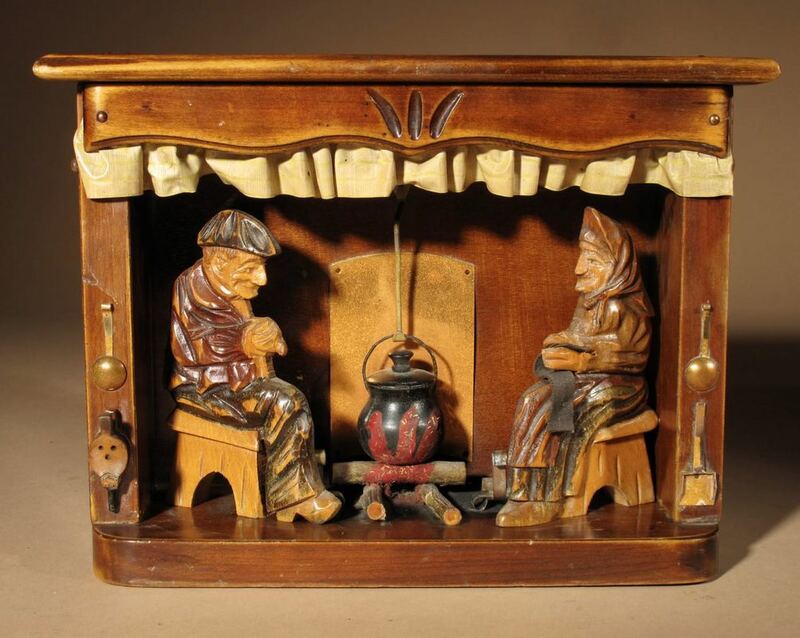 A nice carved example of the typical Dutch oak foot stove. 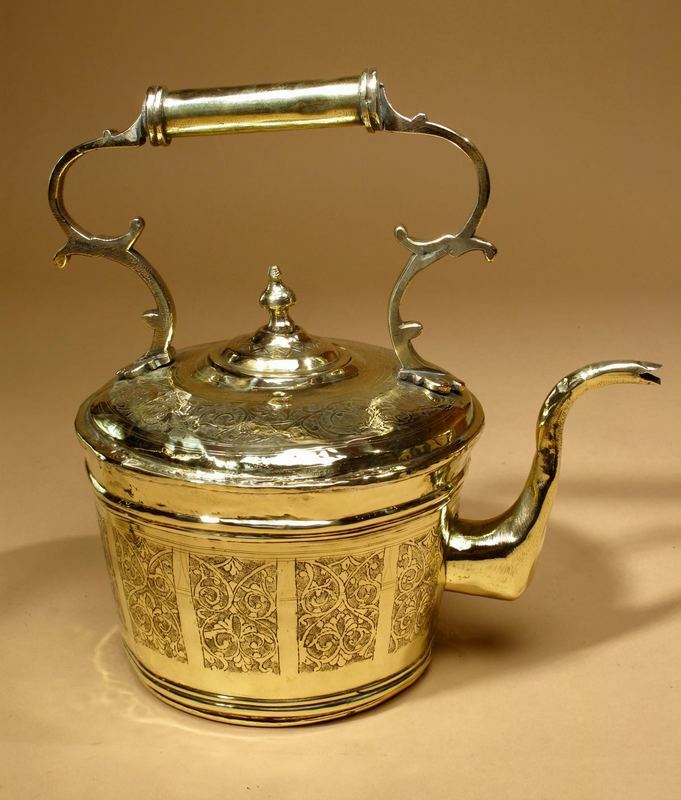 With brass handle and beautiful old patination. 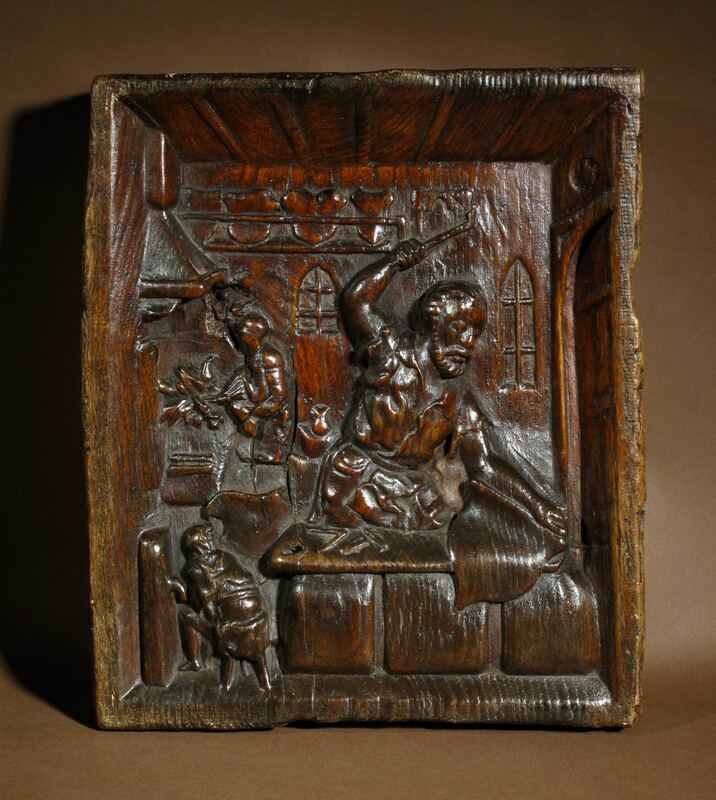 A rare Renaissance Sculpture with the subject of a Blacksmith Making a Chest Plate of Armor. 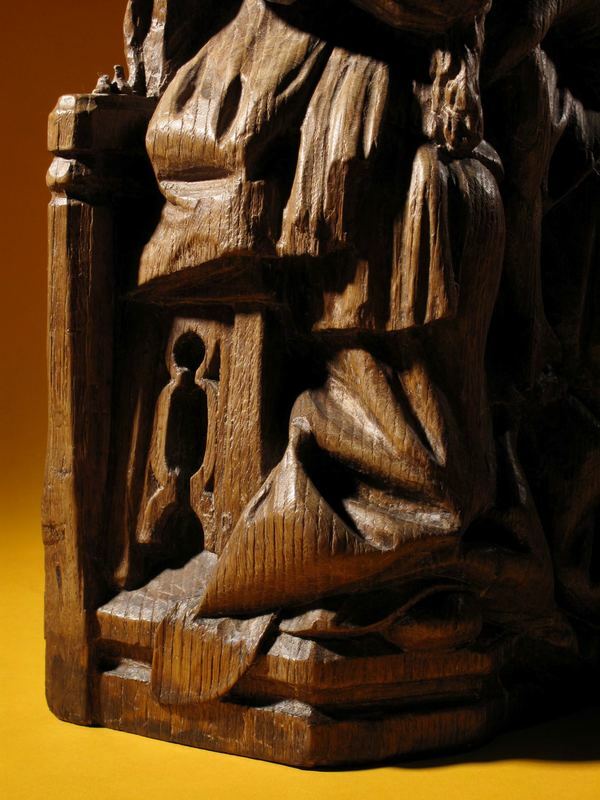 It is very rare to find carvings with the subject of the daily life, most of the time the subjects are religious. 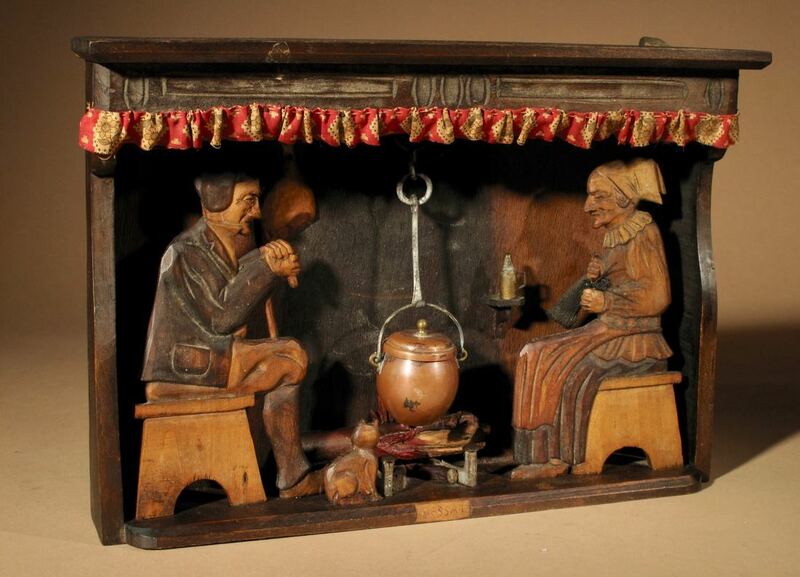 In this case you see the blacksmith in his workshop with one figure by the fire with a pair of bellows and a young apprentice sitting by a water tape. The blacksmith is hammering a chest plate of armor. 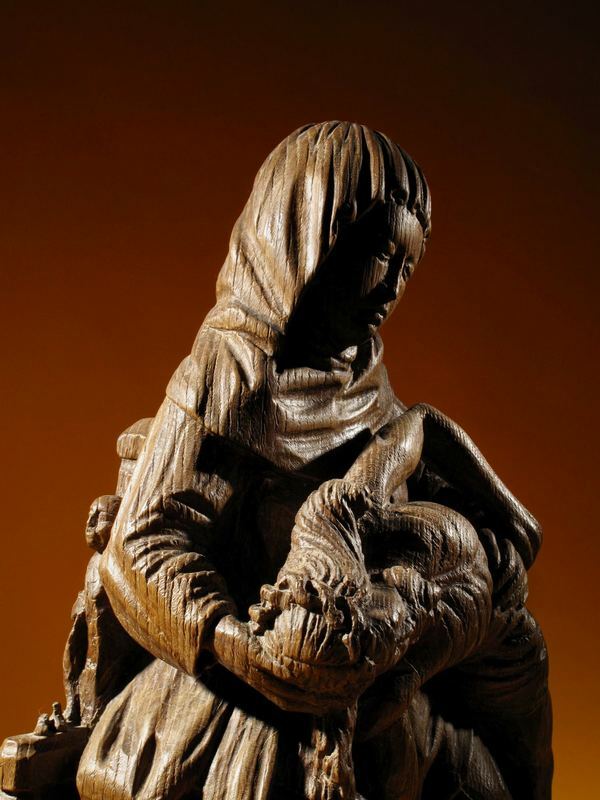 Carved in a heavy piece of oak. 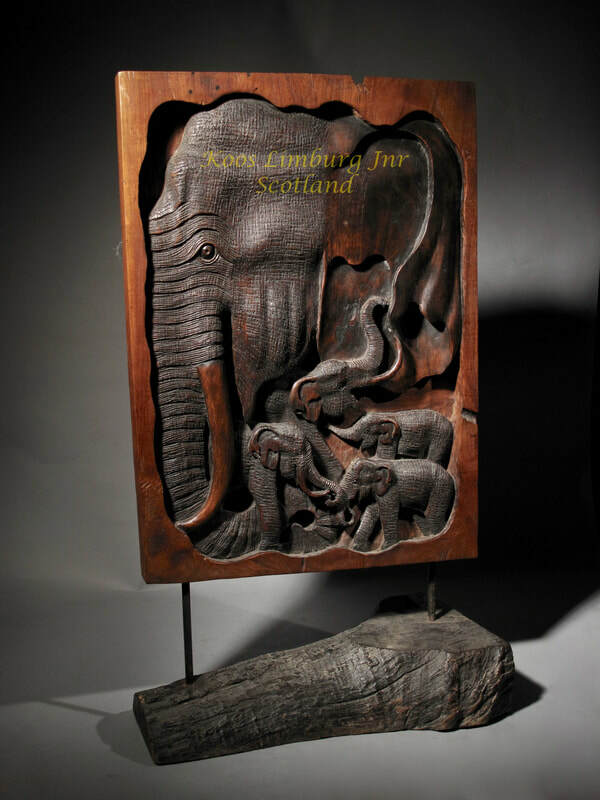 this complete carving was never a part of a piece of furniture, but it was part of an insert off a stone wall decoration. 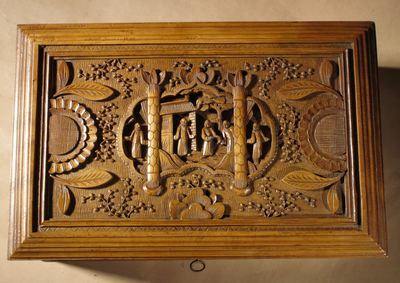 Beautiful deep carved in the chip carving technique with the Date 1868 and Initials T R and brass handle, Carved with love birds and flowers. 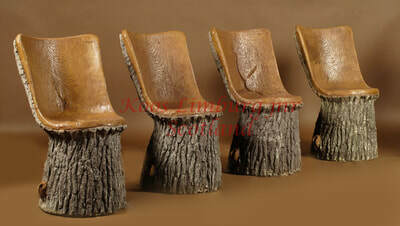 31cm high till top of handle 23.5cm wide 20cm deep. Decorated with sphinges, rams heads and masks of romain emperors. With very nice old gold patination. 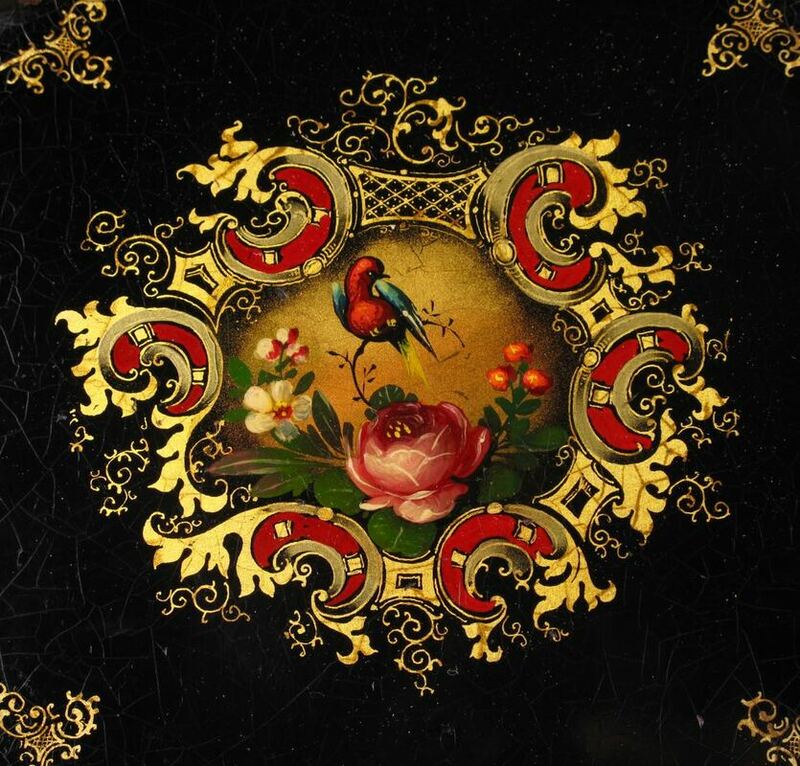 Attributed to the bronzier Auguste Maximilien Delafontaine (1813-1892). 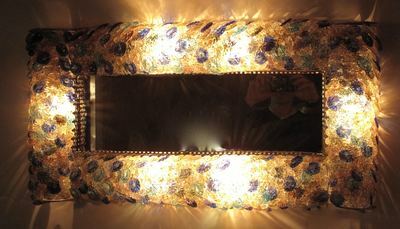 Still with the original paintwork and glass mirror, fine details were already scratched in the wet paintwork whole over. Whole over carved with the typical Dagobert Peche ornaments. 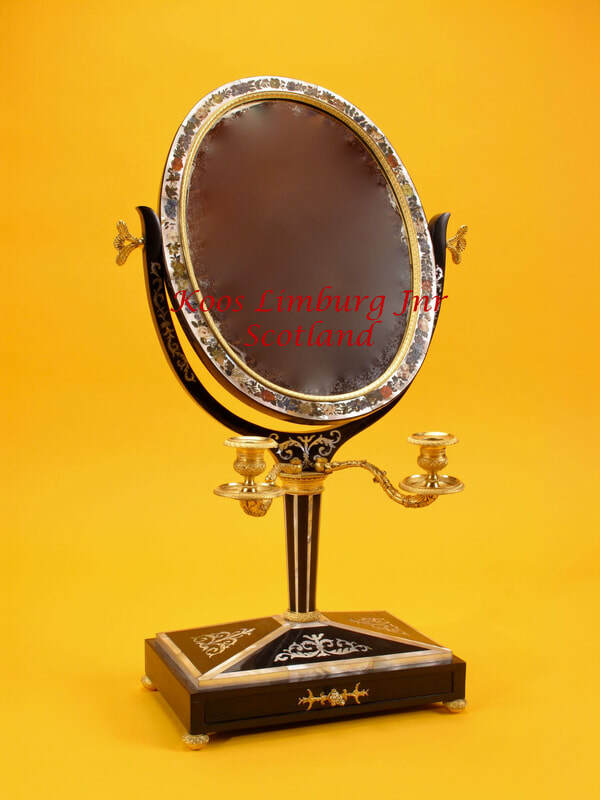 The mirror still has the beautiful old patination and is in original condition, also the back. With silvered numbering on the dial with Original chromium hands, striking every 30 minutes on 3 gongs. The movement is stamped by the well known clock makers Junghans, in an 8 points star from Wurttemberg. The case has model numbering on the bottom. In very good original condition , movement serviced and in fully working order. Indistinctly Signed AT Polleau 2/3 ? see image. 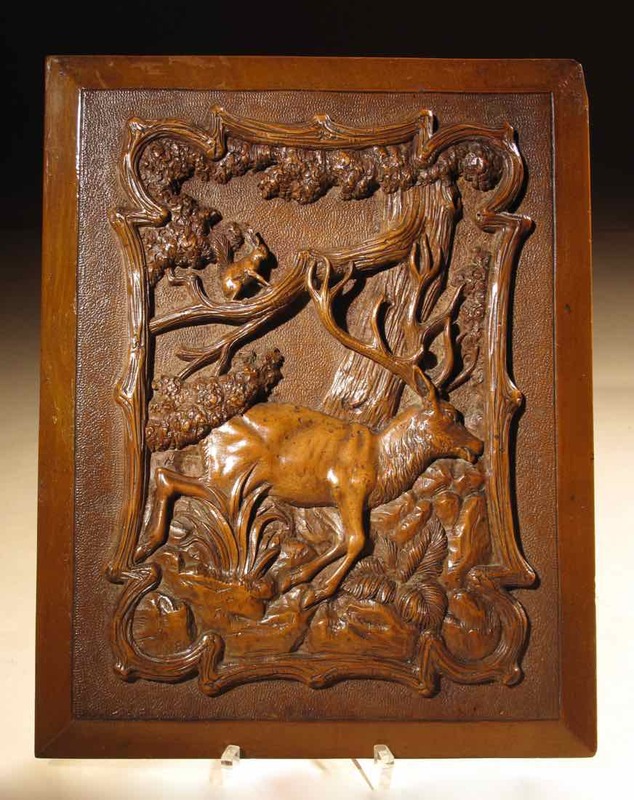 With the subject of a deer and squirrel in a wood. 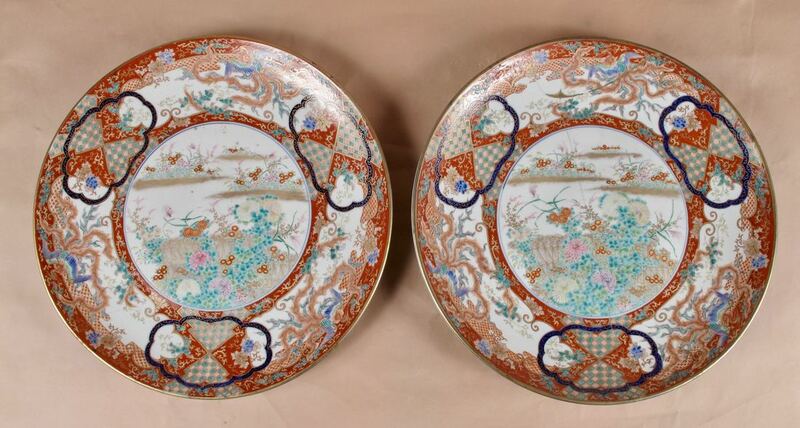 With very nice old original patination in very good original used condition. The movement of the clock is stamped, Hamburg-Amerikanische-Uhrenfabrik-Schramberg. 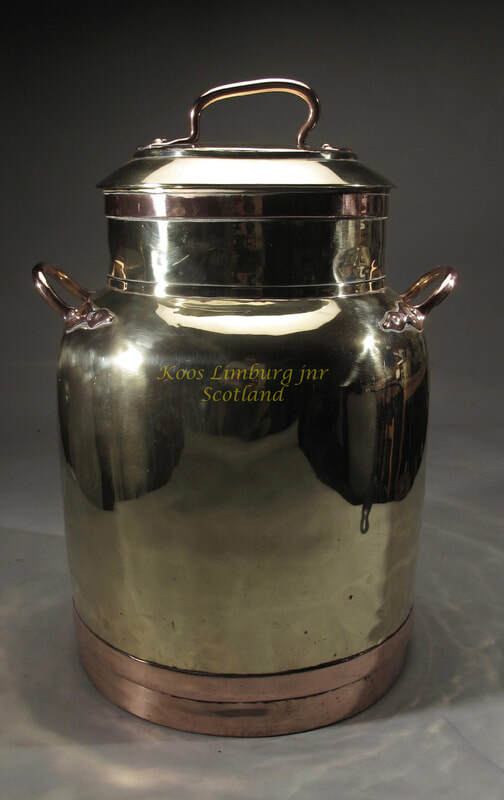 The pewter case has the text: made in Germany. Interesting to see is that the hands are on the inside of the two glass sheets and you can’t see how they are moving, that is very interesting, we have never seen this before, specially by an Art Deco clock. 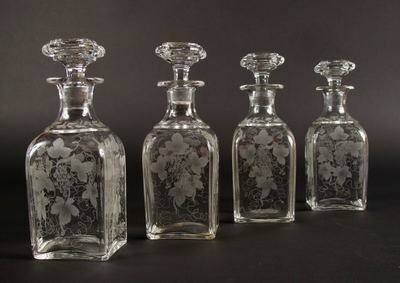 Some tiny fritting’s to the outside rim of the glass dial. 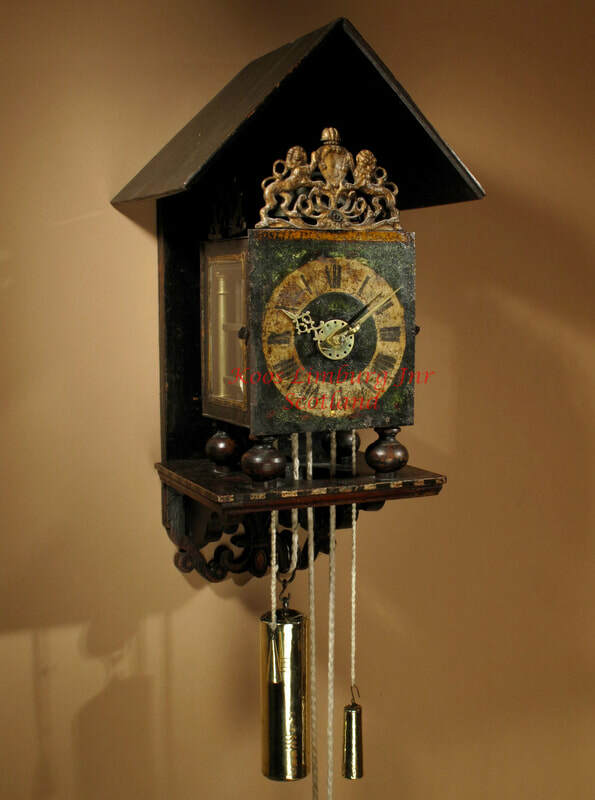 To your information this is a very stylish pewter art deco mystery clock witch are very rare to find on the market. 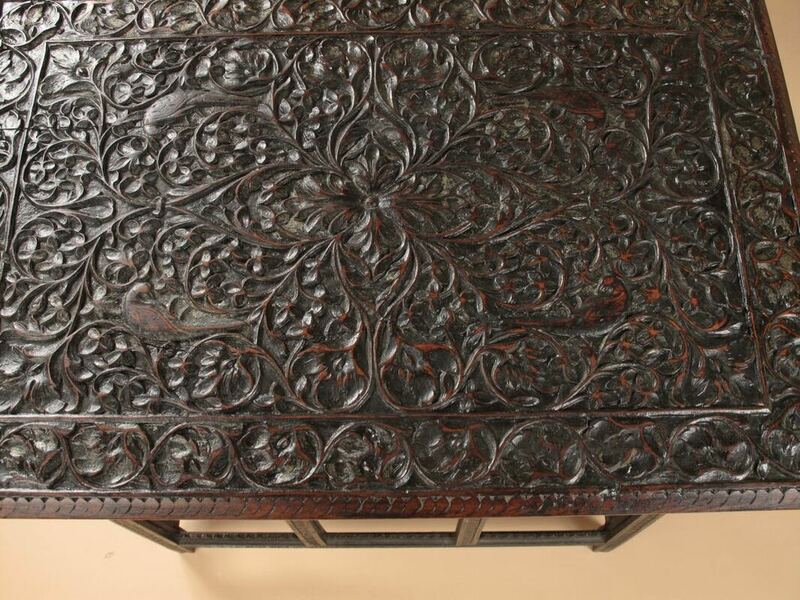 Carved on the lid with Wajang figures and flowers all over. 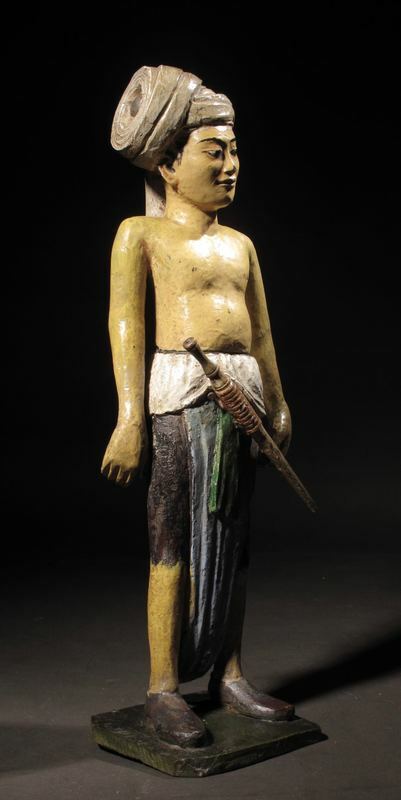 Wajang figures are famous in Indonesia, they are used in the shadow play theatre. 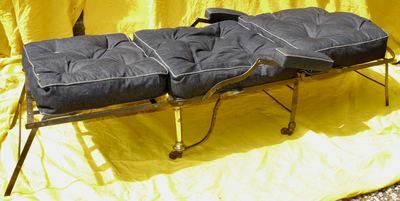 In very good original used condition with beautiful old patination no dents. Signed with the master stamp of Jan Kriege. 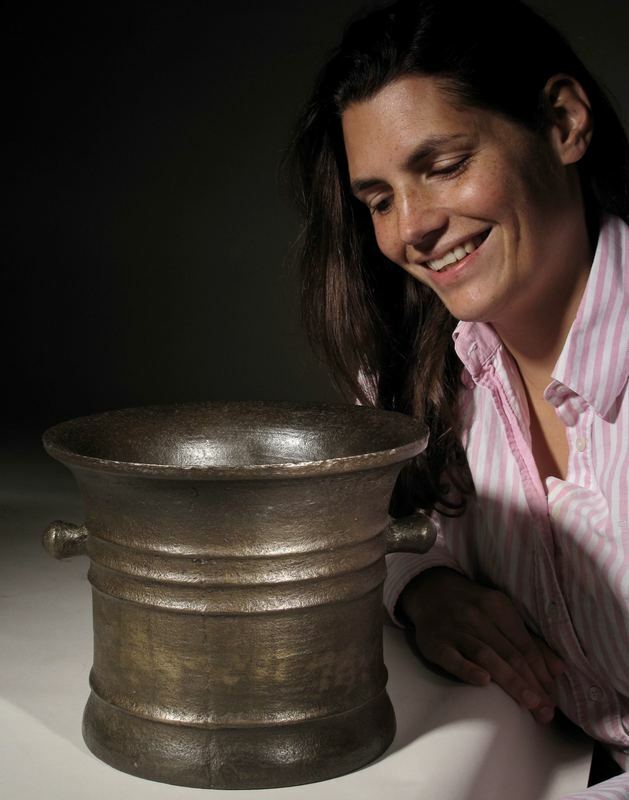 the other vase 80cm high is in the collection of museum Boymans van Beuningen in Rotterdam. Already in his working time the town Museum in Amsterdam ( Stedelijk Museum) was interested in his work and Jan Kriege became a respected craftsmen who was also know outside The Netherlands. 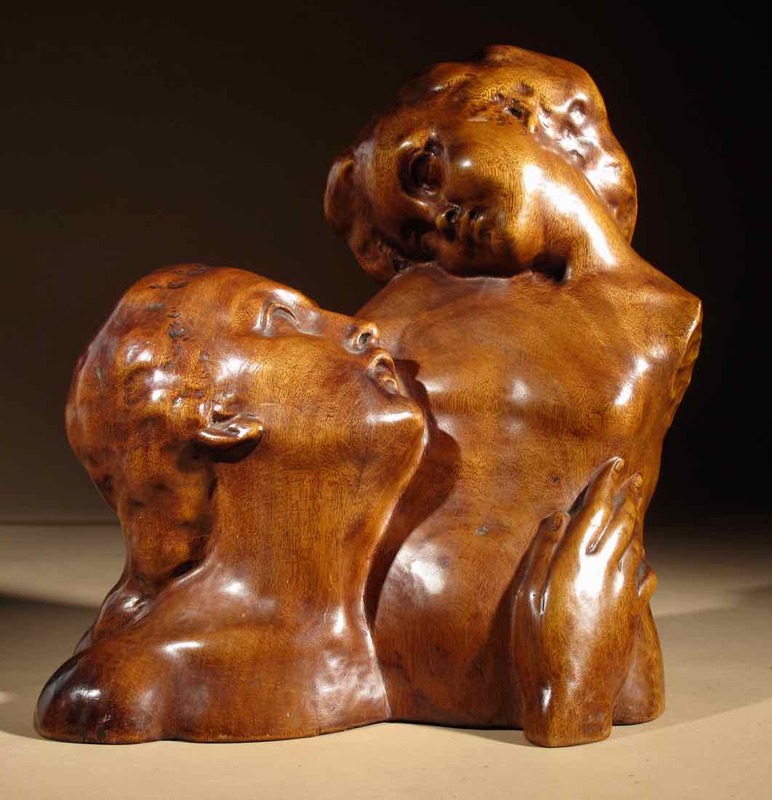 A large part of his work was completely destroyed in 1940 by a airraid. 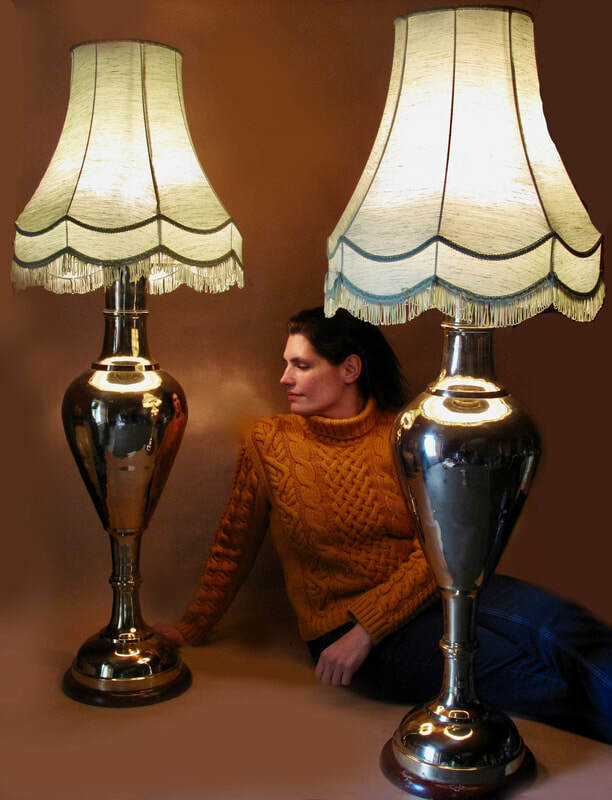 The shade of our lamp is also hammered out of 1 sheet of copper, our lamp is complete and in fully original condition, even the fabric has the lead small weights to stretch the fabric downwards. 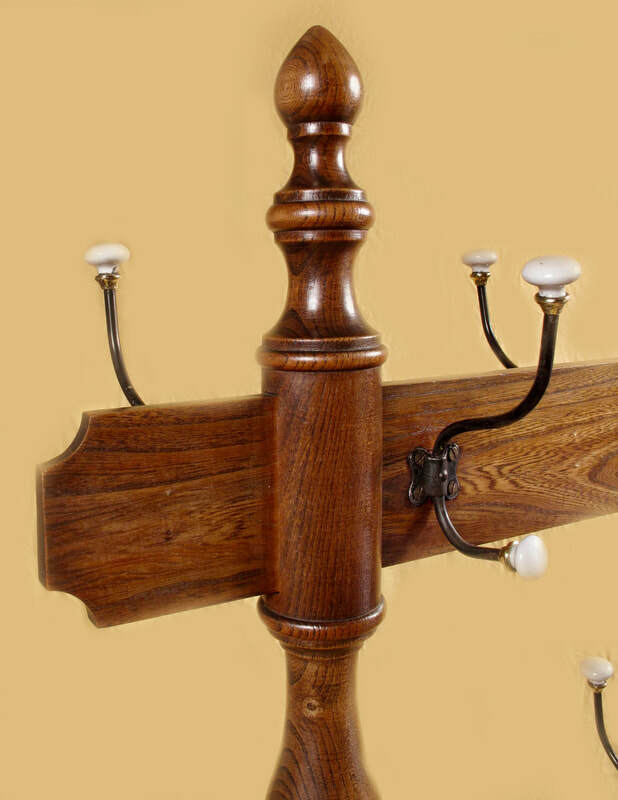 The part against the ceiling has place for 4 fittings. 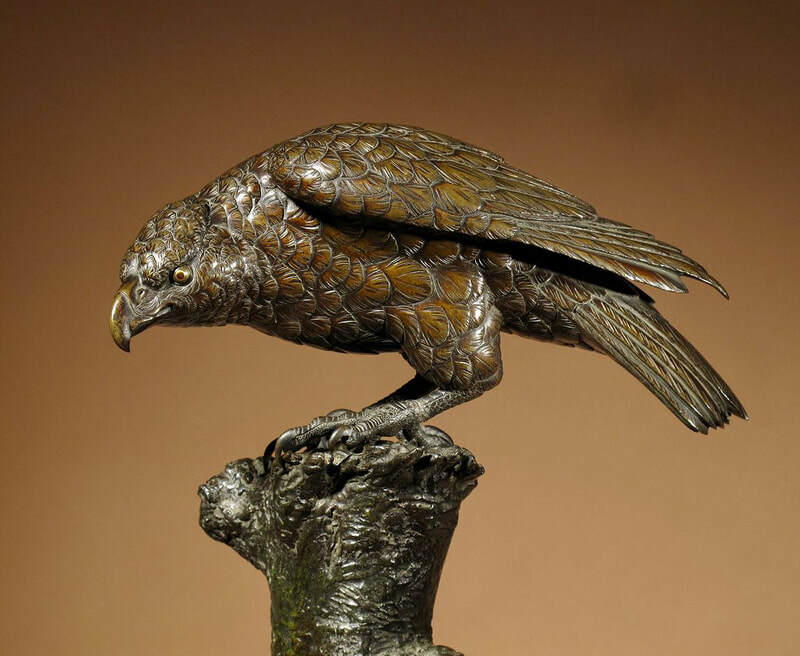 Jan Kriege 1884-1944 was a sculpture silversmith/goldsmith and jewel designer, wit a speciality in hand hammered copper objects. 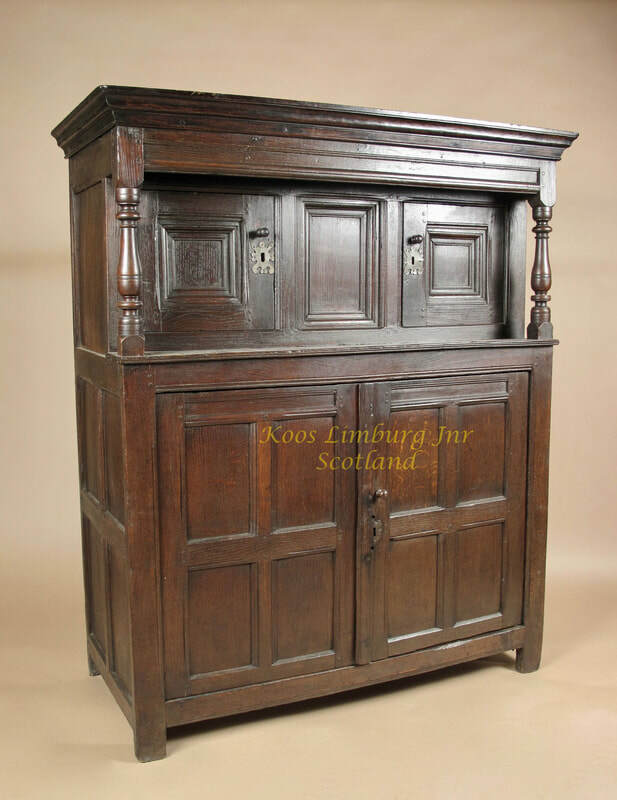 In wonderful original condition with beautiful old patination, no cracks no dents no repairs. 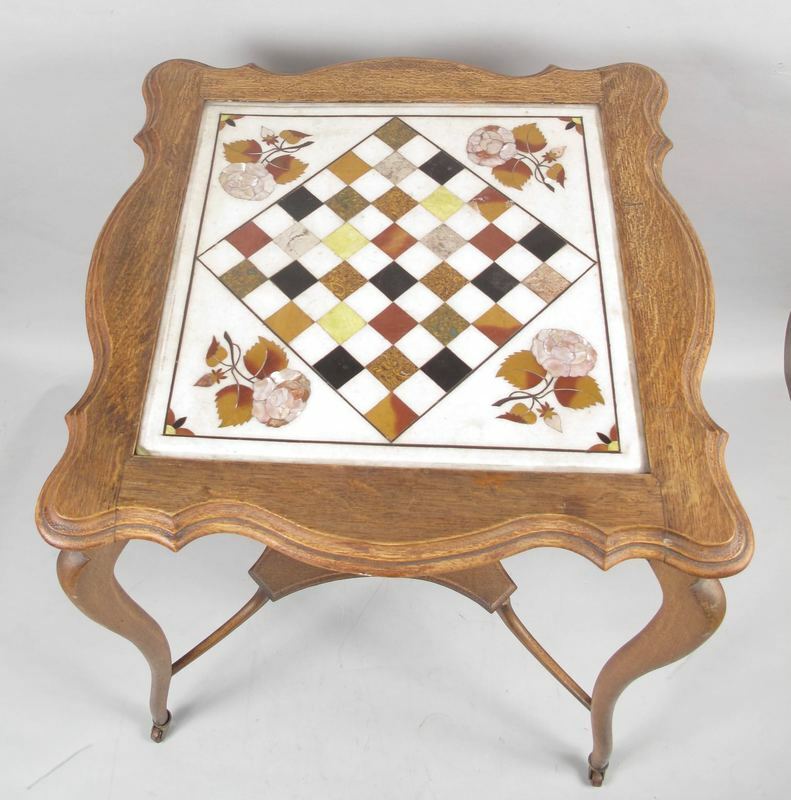 Inlaid with bone/ivory dots, in very good original used condition with no missing pieces. 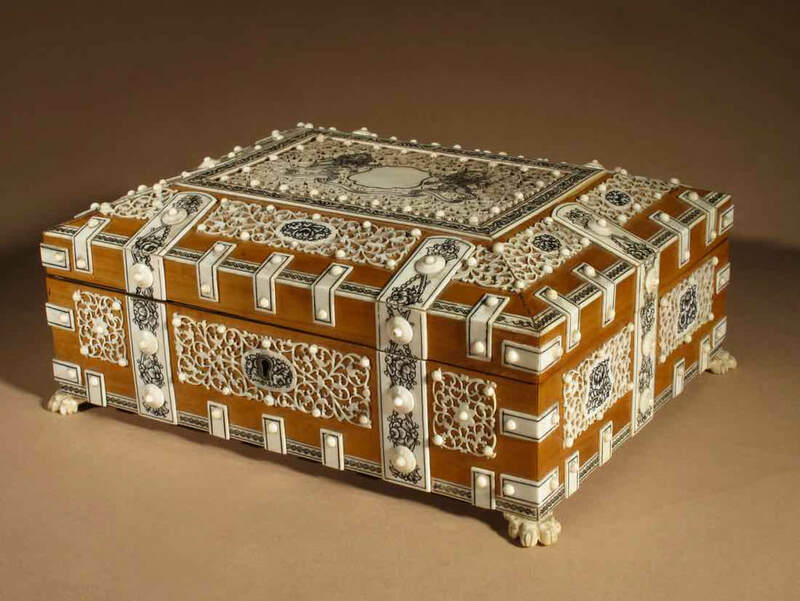 A very decorative Vizagapatam Anglo Indian sandalwood en fine ivory box. 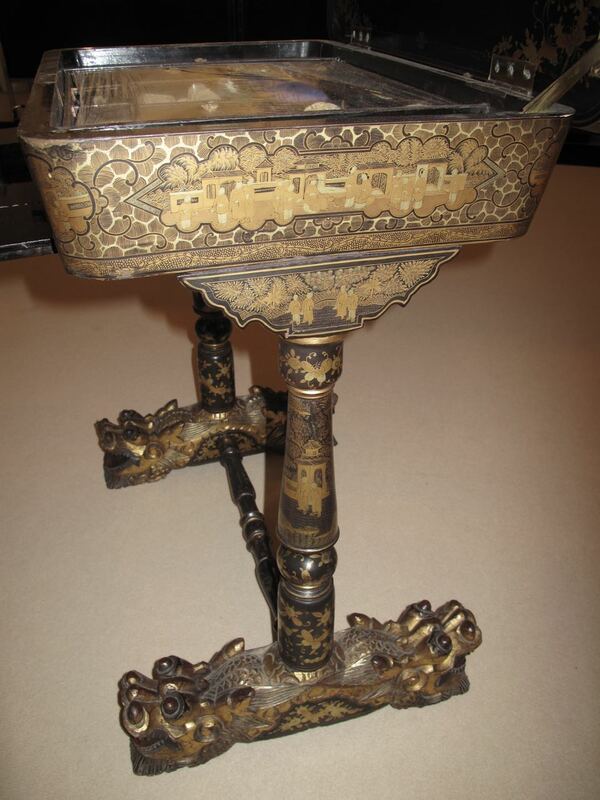 Decorated with engraved lions and flowers between very fine ivory fretwork, standing on 4 ivory claw feet. In very good original used condition with nice old patination, complete nothing is missing. 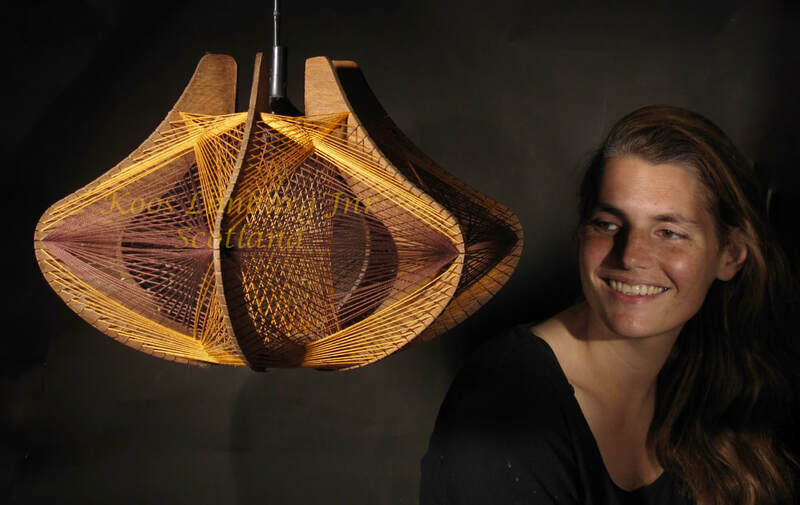 A very decorative and stylish art hanging light made as a sculpture in the style of Naum Gabo. Complicated woven in three colours of thread. 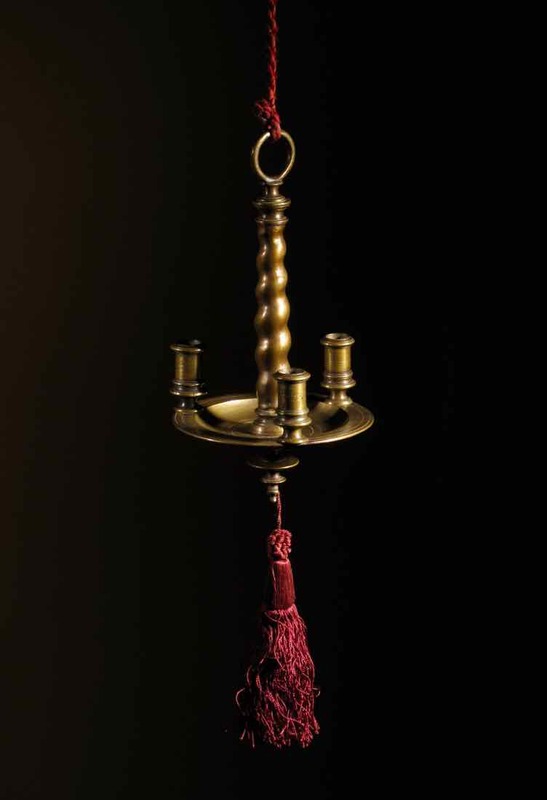 This is one of three hanging lights in the same style with the same continental provenance. 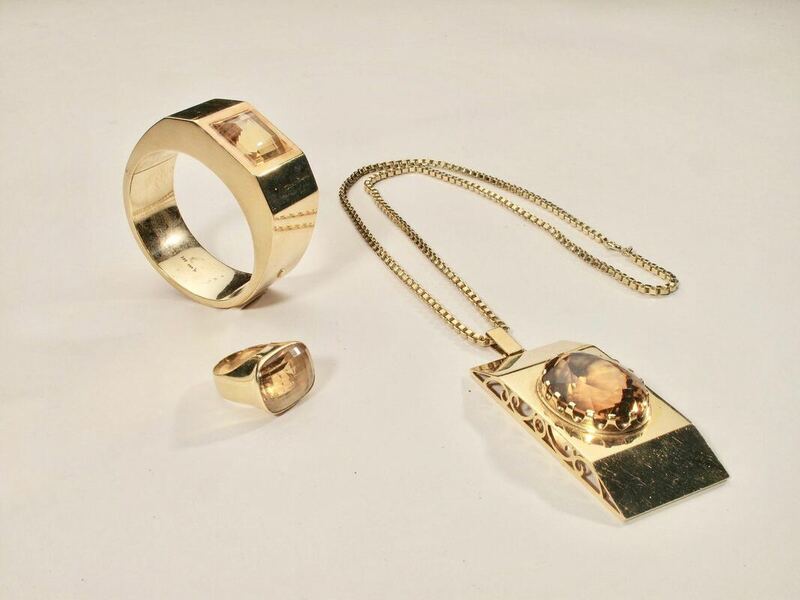 The golden jewellery is mounted with Citrine. 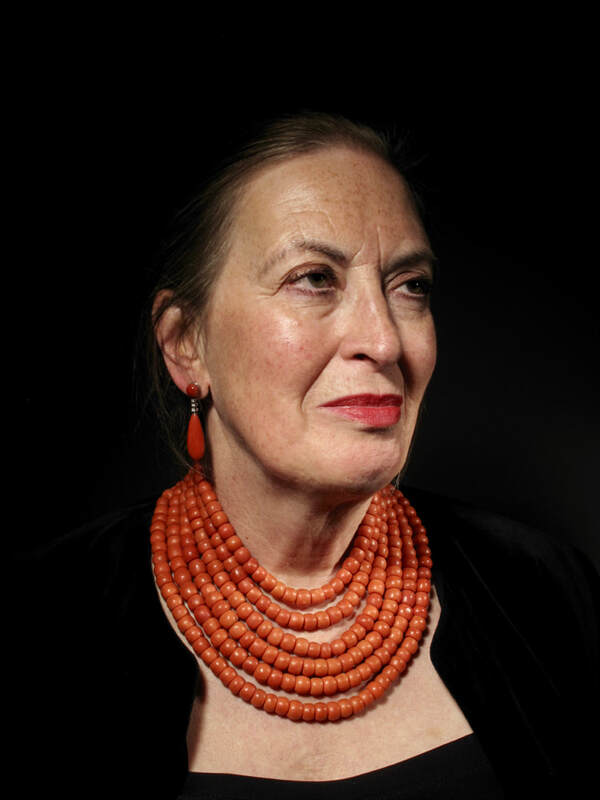 A famous Czech, Austrian and German Actress. Max Schmeling, ( 1905 -2005 ) heavy weight boxing world champion of: 1930-1932. 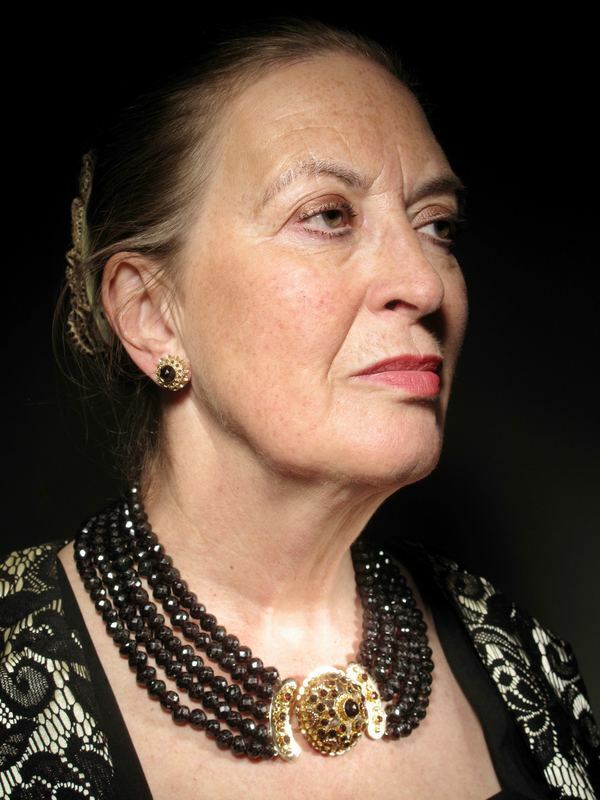 Anny Ondra has also played in two movies of Alfred Hitchcock. 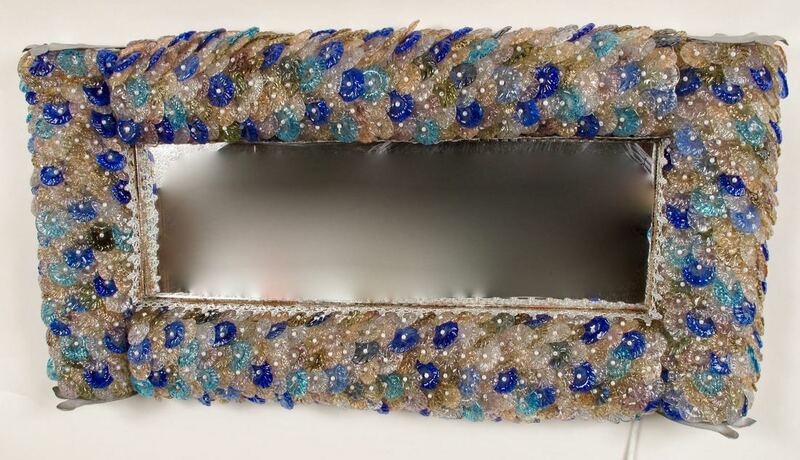 After Anny Ondra died, Max Schmeling has sold a part of the property of Anny Ondra including these three pieces of jewellery by Christie’s in Amsterdam. 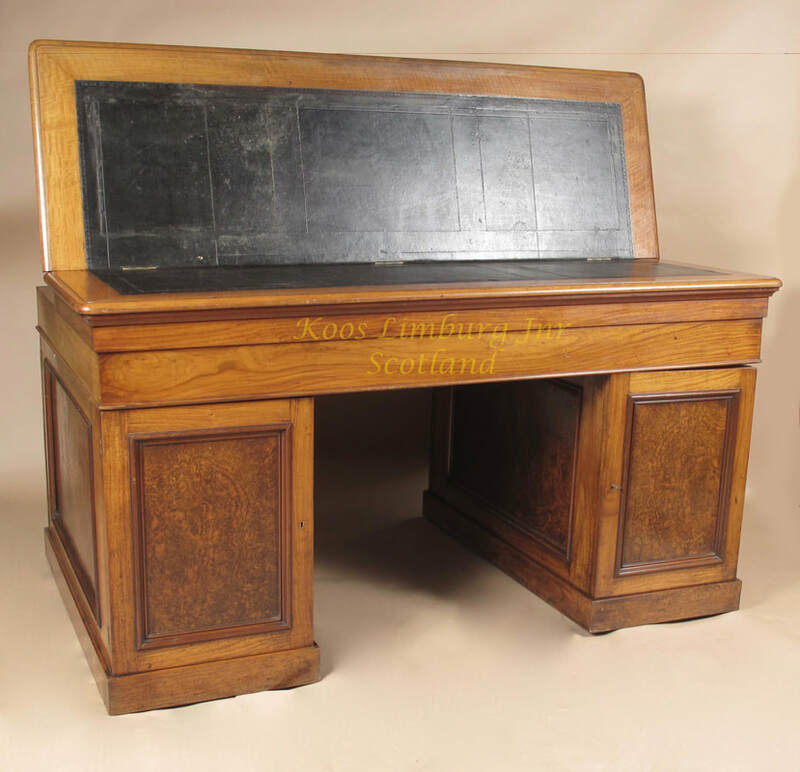 Still with the original glass top. in excellent original used condition, the glass top with using marks. Not restored and still with the original old patination. 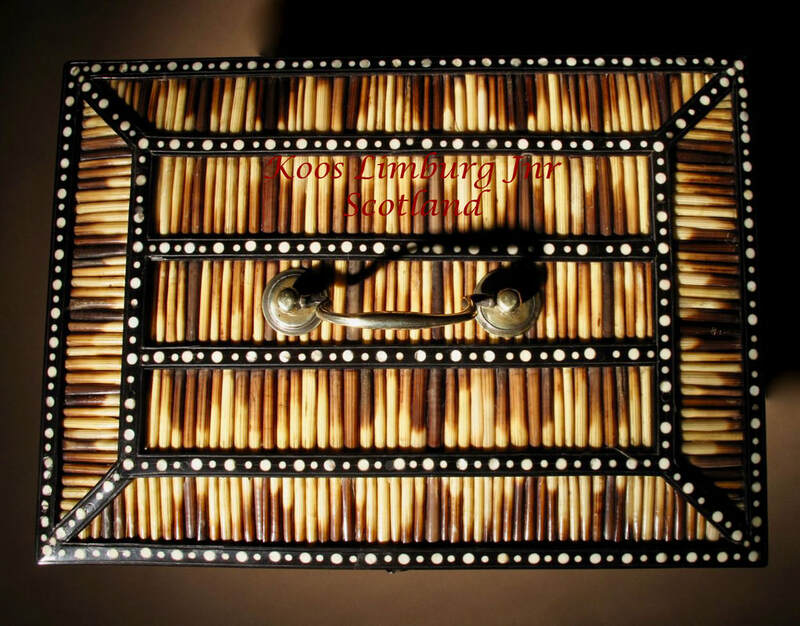 The inside of the lid also decorated with bone/ivory dots. 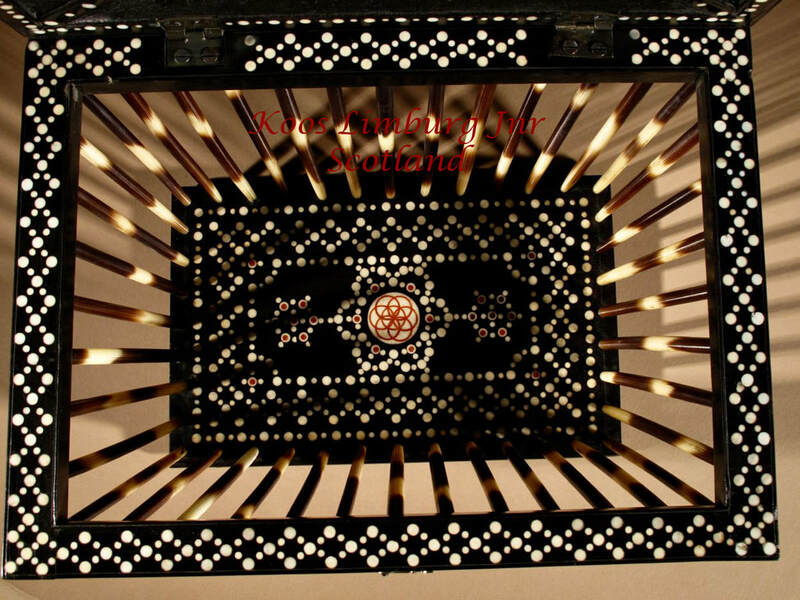 Made of ebony standing on horn feet and inlaid with bone. 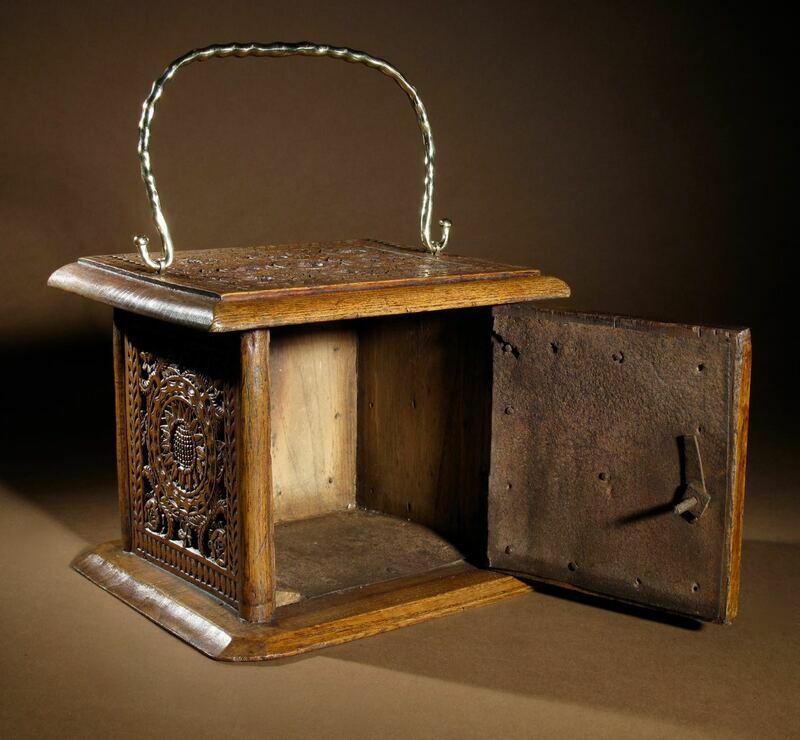 Still with the original brass handle, hinges and lock hook. 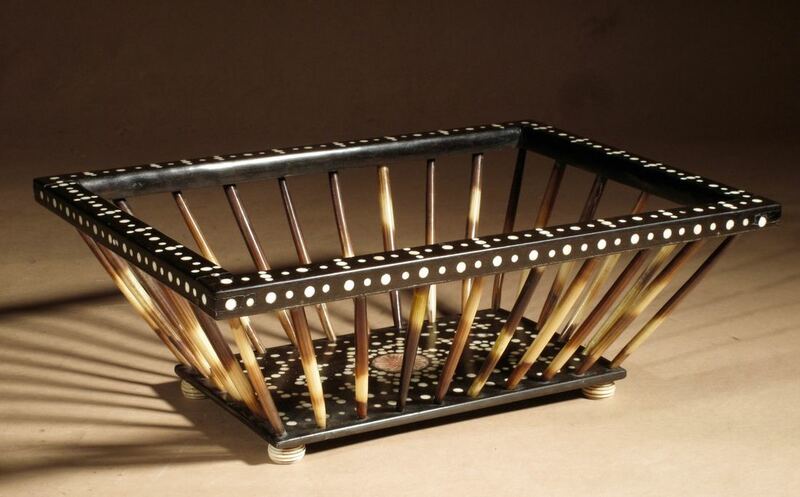 Important by this basket is that it is still very strong and stable and not bend or out of shape. 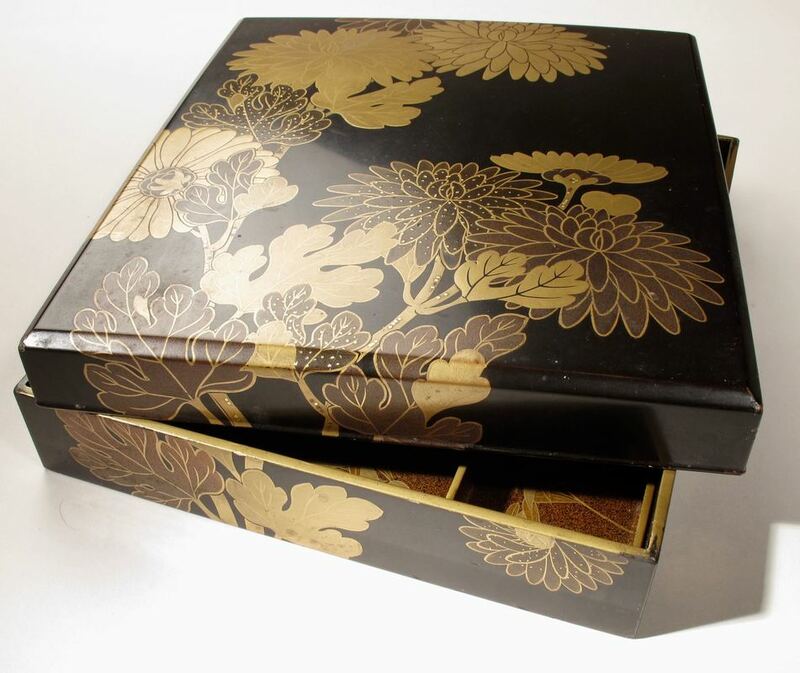 The lid is decorated with a nice pattern. 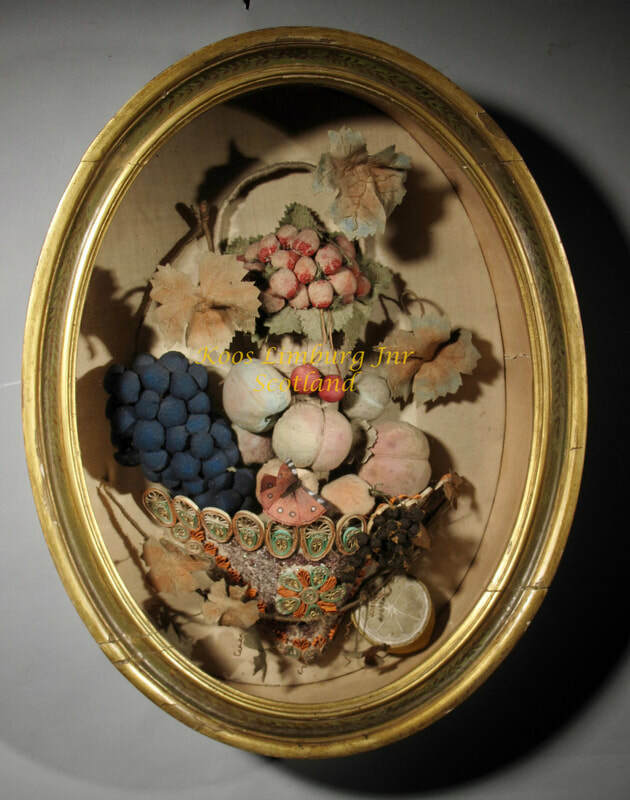 In very good original used condition with beautiful old patination no missing pieces. 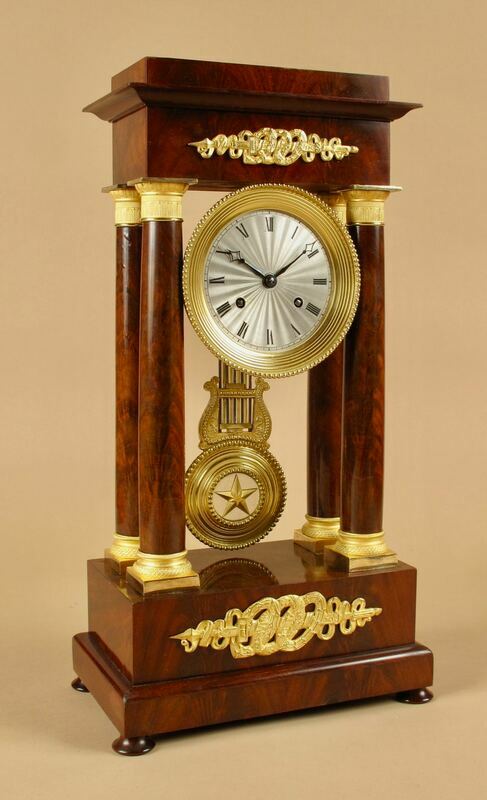 ​A French Very Stylish Charles X Period (1824-1830) Mahogany Portico Clock. 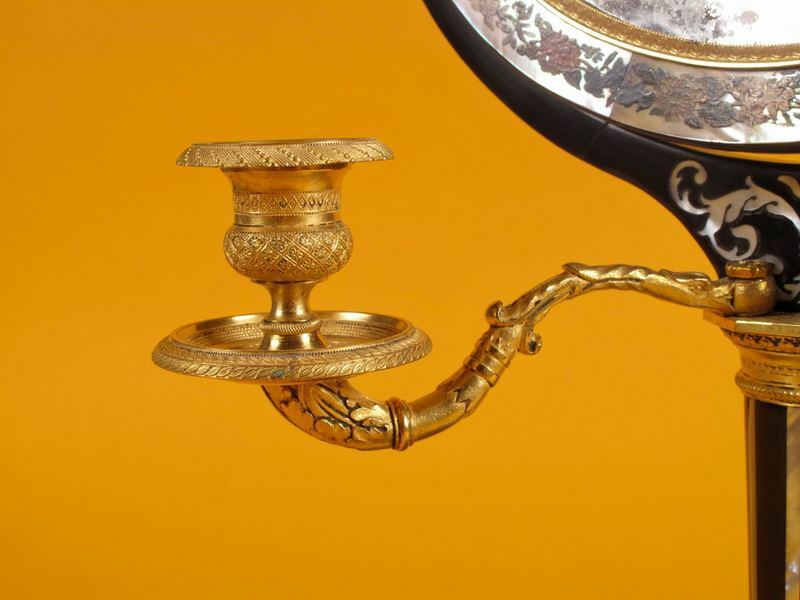 Still with all the original ormolu mounts. The original movement only cleaned and in fully working order. 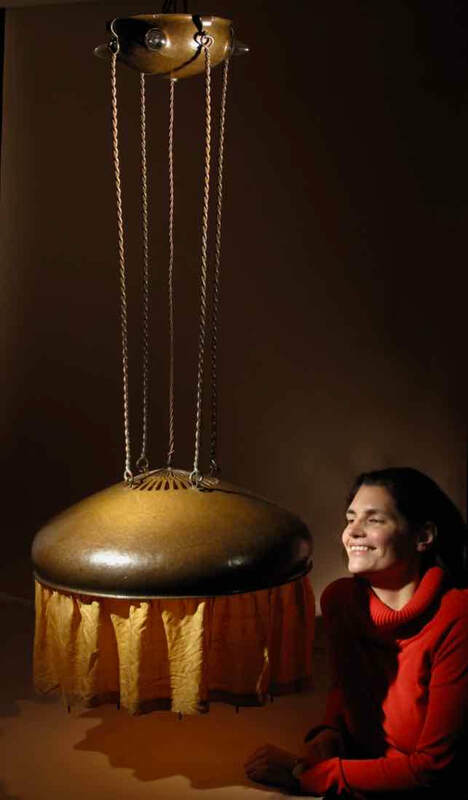 The clock is running for at least 7 days and chimes every 30 minutes on a bell. 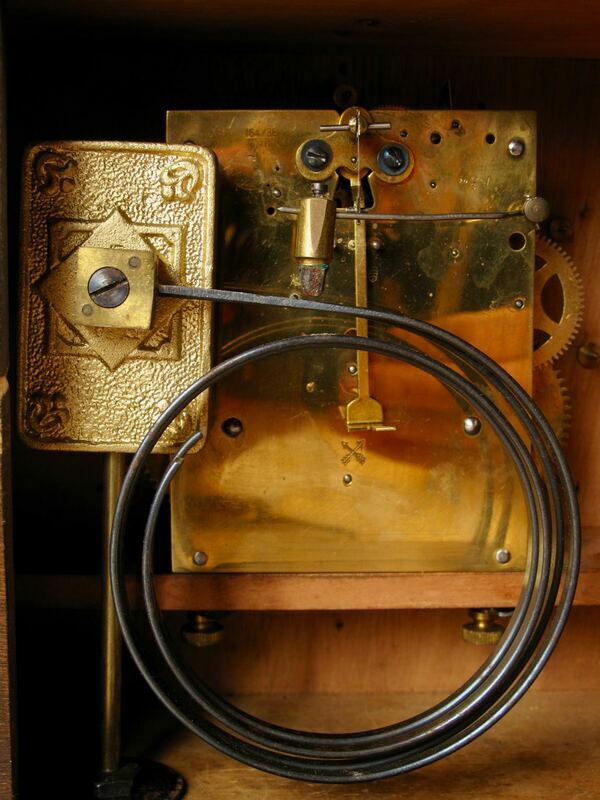 Still with the original ormolu and steel pendulum. 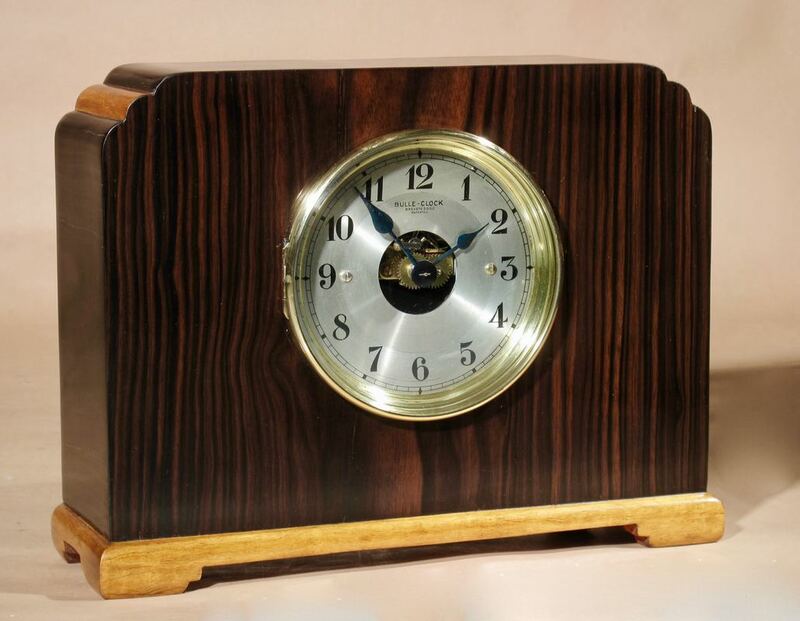 The clock is whole over in wonderful original condition and in very good condition. 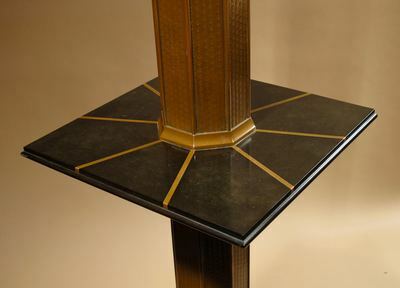 54cm high 29cm wide 18cm deep. 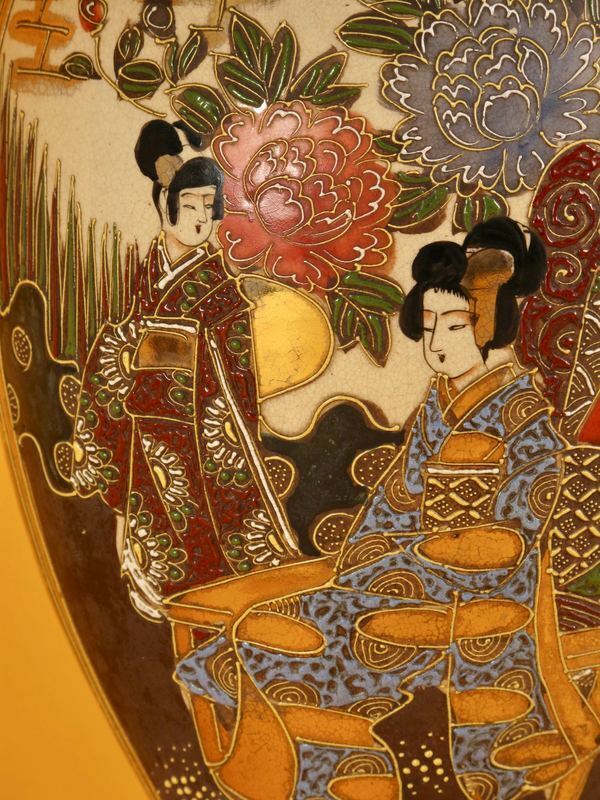 The vases are inlaid with gold and silver with the subject of a japans man sitting on the righthand vases and a Japanese lady sitting on the lefthand vase, facing each other. 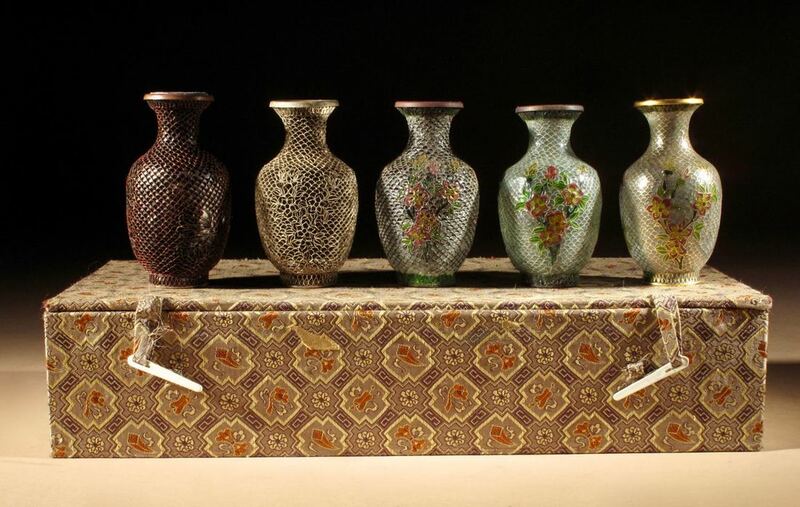 The back of the vases are decorated with flowers. 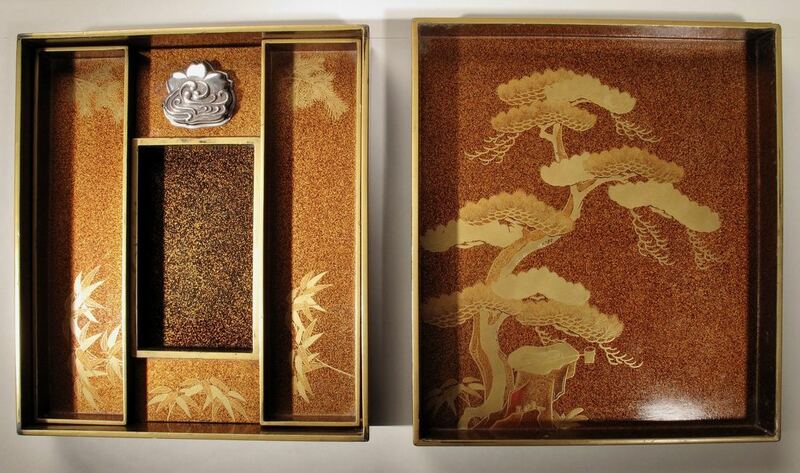 Also nice to see the small animals on the rim edges and also bamboo decoration, crabs and a lot more. 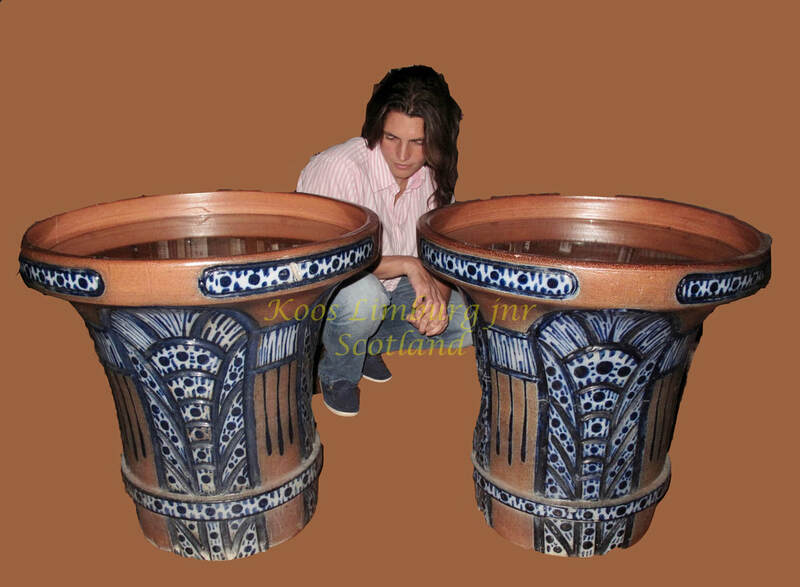 44cm high 27cm diameter top of the rims. 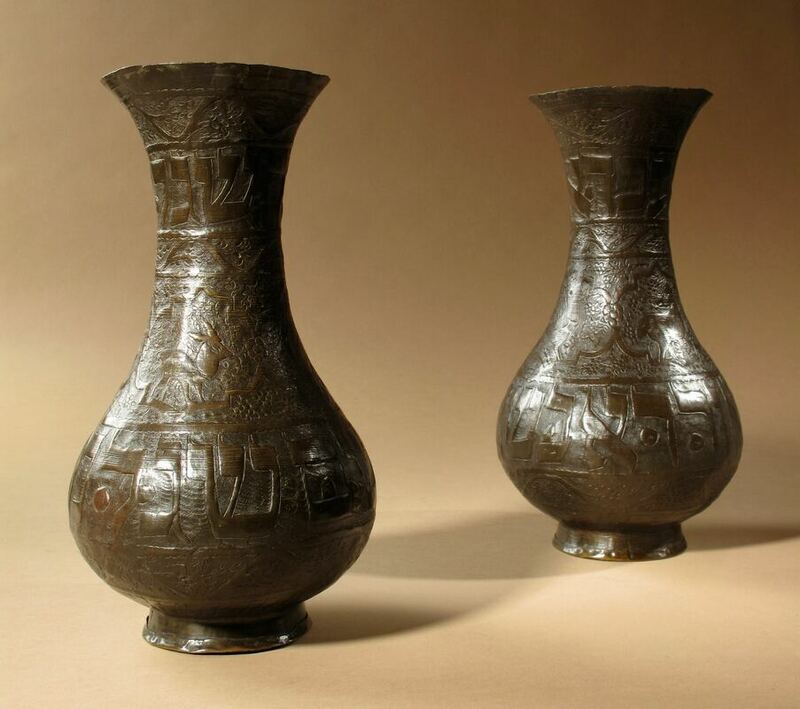 the vases are hole over inlaid, and are in original condition with old patination. 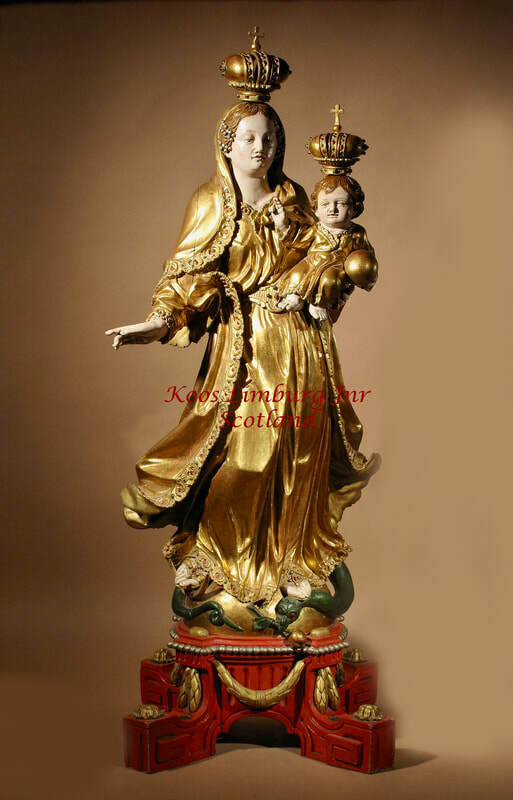 A beautiful finely carved and original gilded Madonna and child. 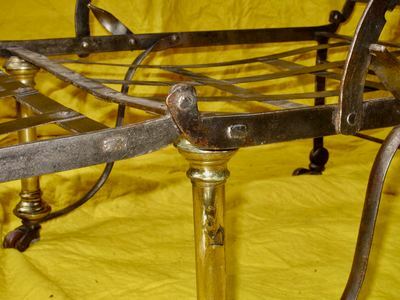 Still with the original stand. 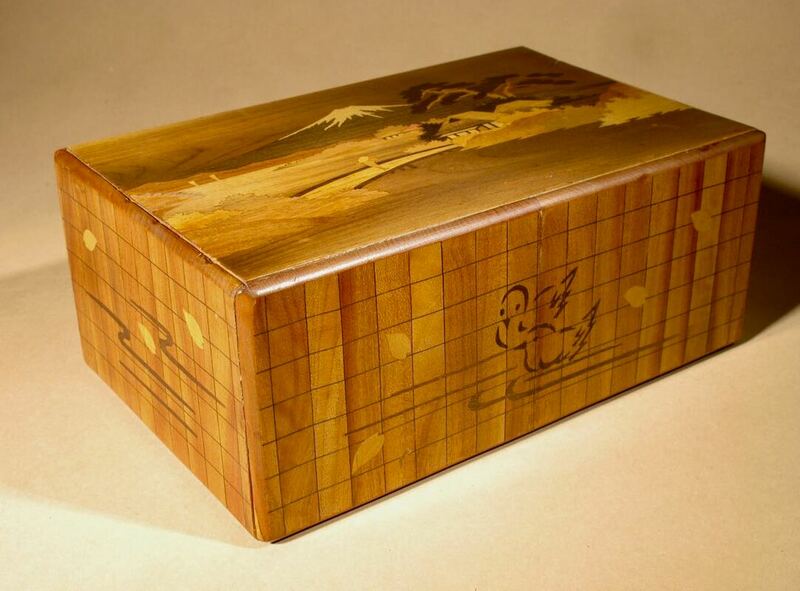 Decorated on the top with finally inlay work of a landscape with houses and mount Fuji. 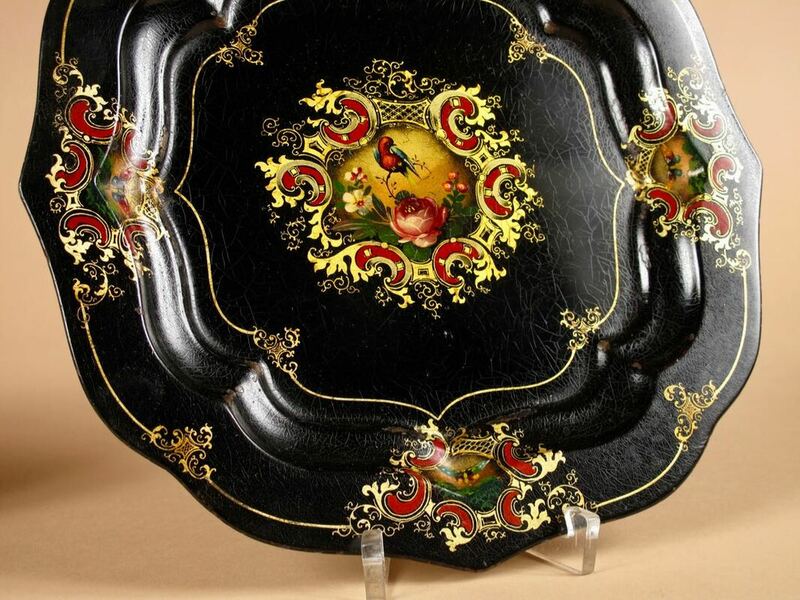 The sides artistically inlayed with ducks on the water, the bottom inlayed with a branch of flowers. 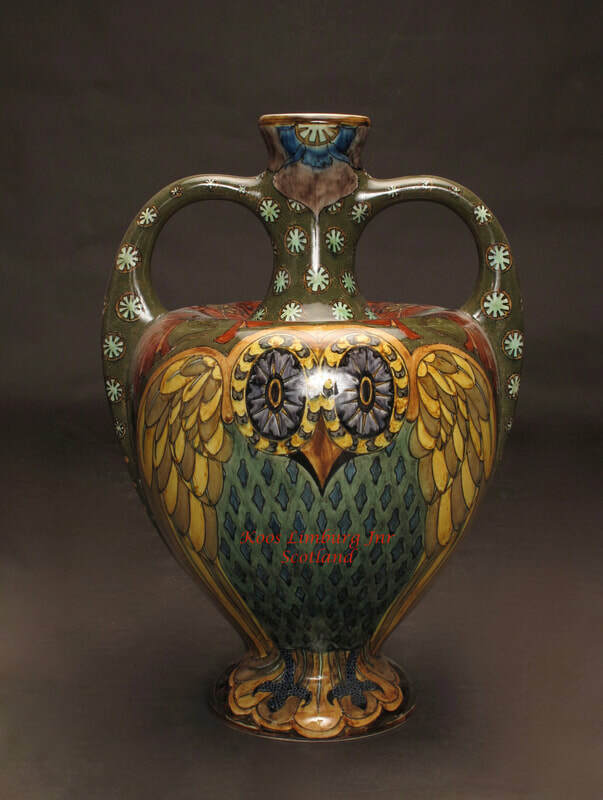 In very good used condition with nice old patination. 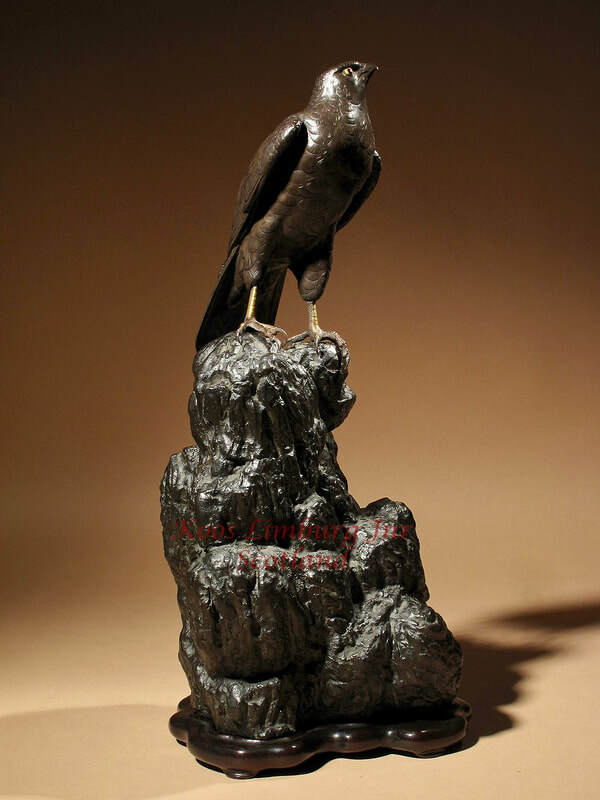 A very decorative bronze model of a hawk sitting on a craggy rock. 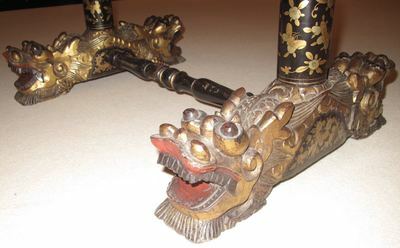 The eyes inlaid in gilt and shakudo. Nakano Bikai Saku, Tankin Shiki,with seal Tankin. 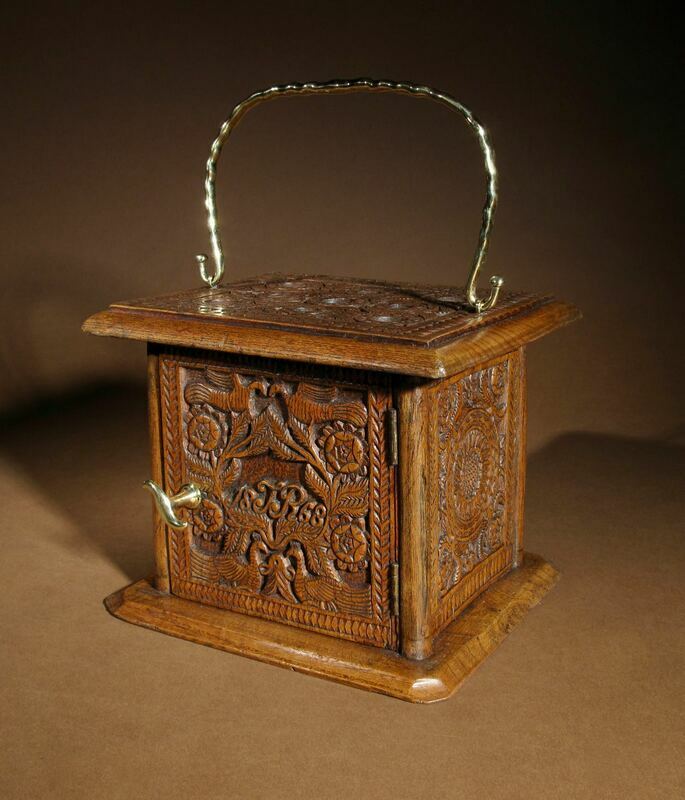 With very fine wood turn work . 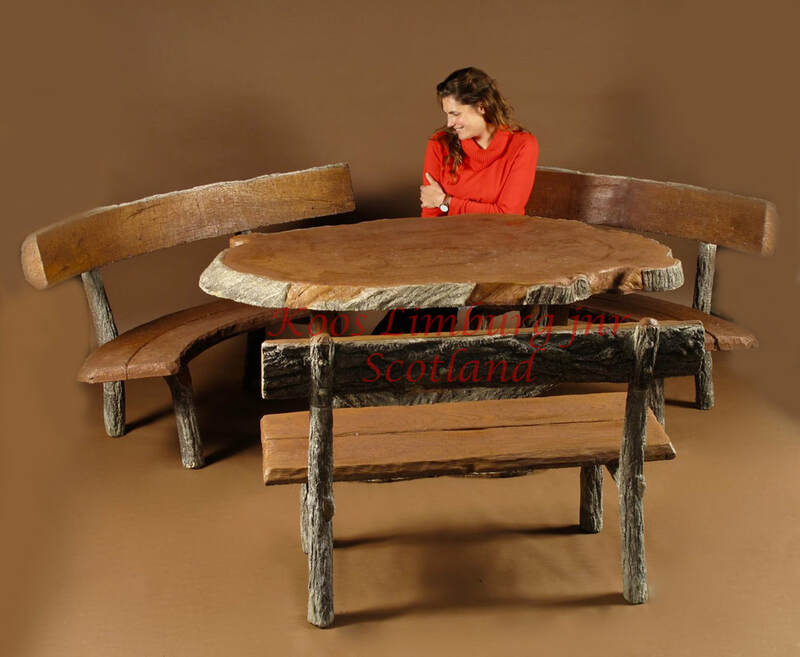 59cm high 65cm wide 36cm deep. sitting on a Maple leave clad tree. signed in seal form: Masayuki. 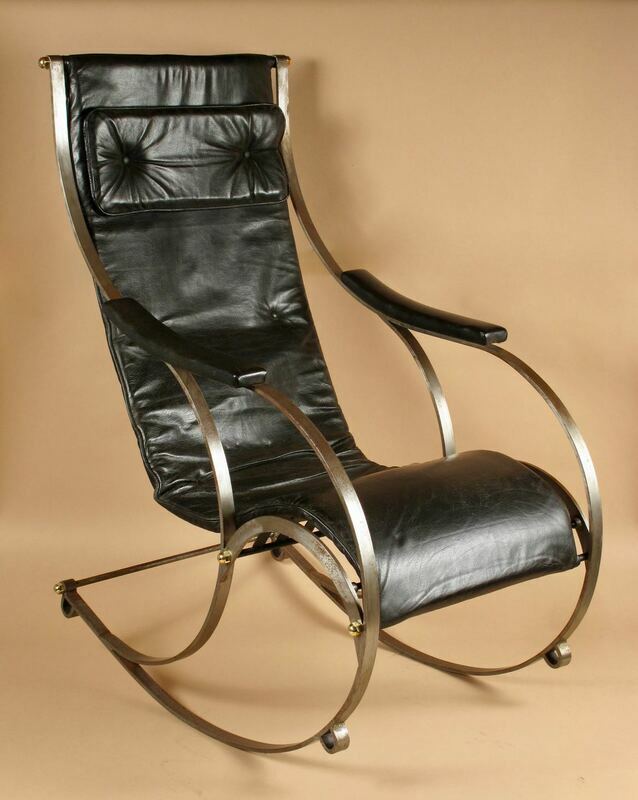 The Steel and brass nuts rocking chair and arm rests with black leather cushions. The ebony not restored or broken, in very good original old condition. 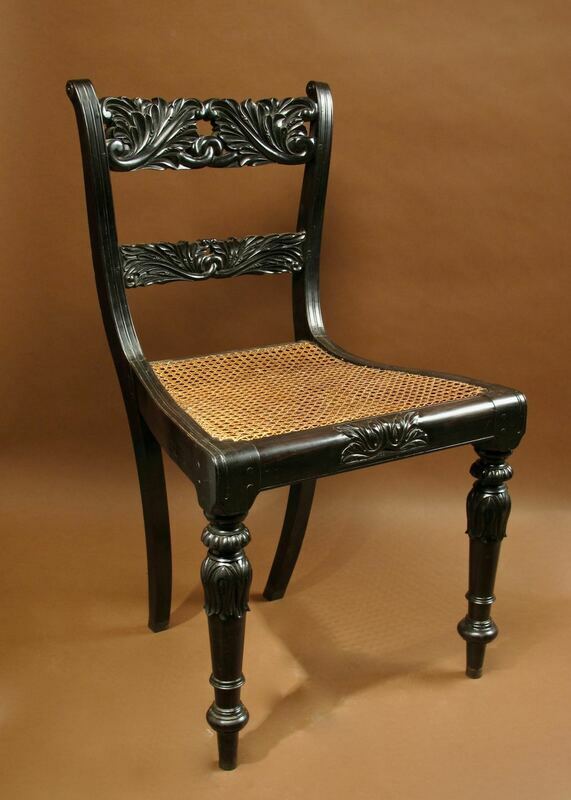 The cane work rewoven ( what is normal for a chair of this period) in original style. 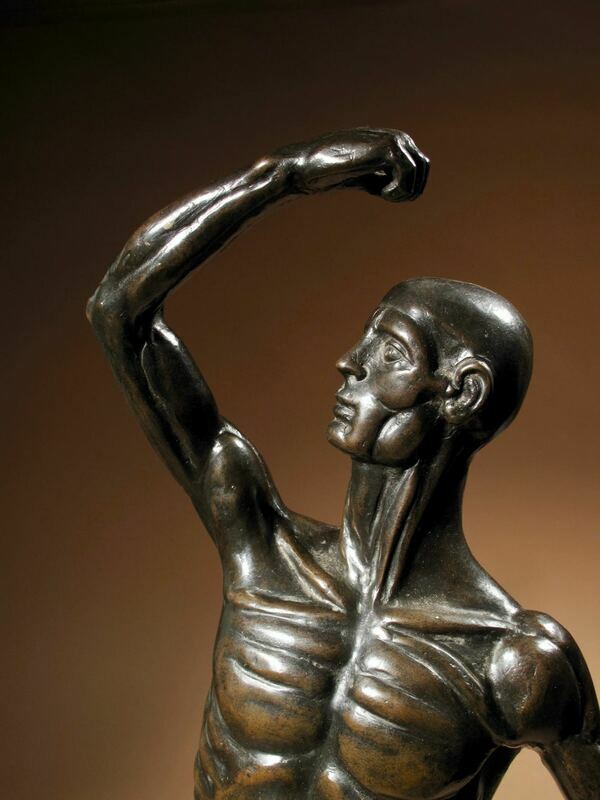 it openly serves as a heroic statue rather than primarily as an anatomical demonstration piece. 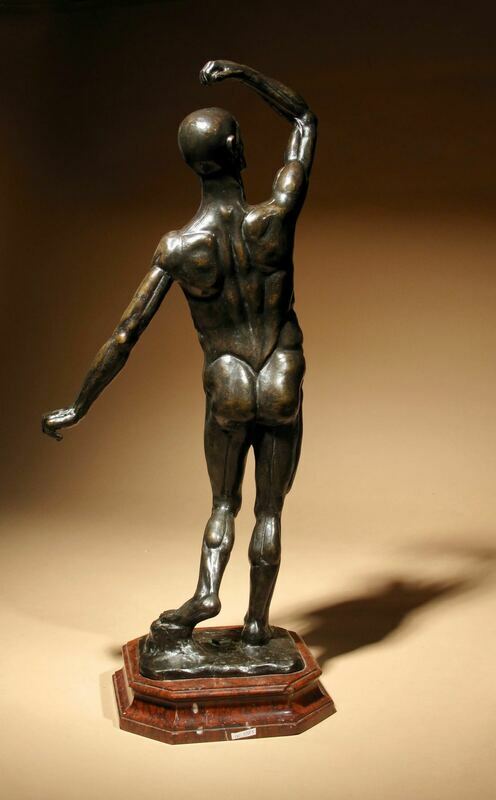 The Ecorche is standing in the pose of:William Hunters life cast for the Royal Academy. No. 13 and page: 216, Cat. No. 13. 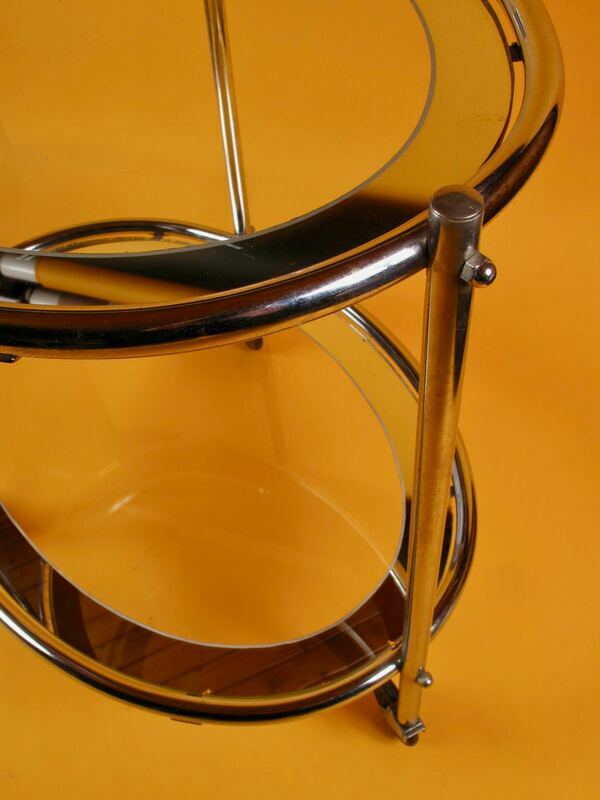 Original 1930s Art Deco Chroom and Mirror Modernist Cocktail Trolley. 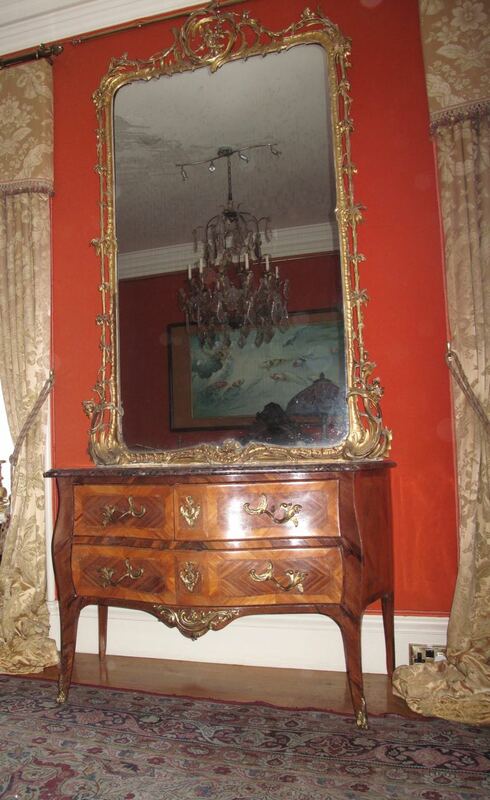 Still in the original condition also the mirror glass shelfs. 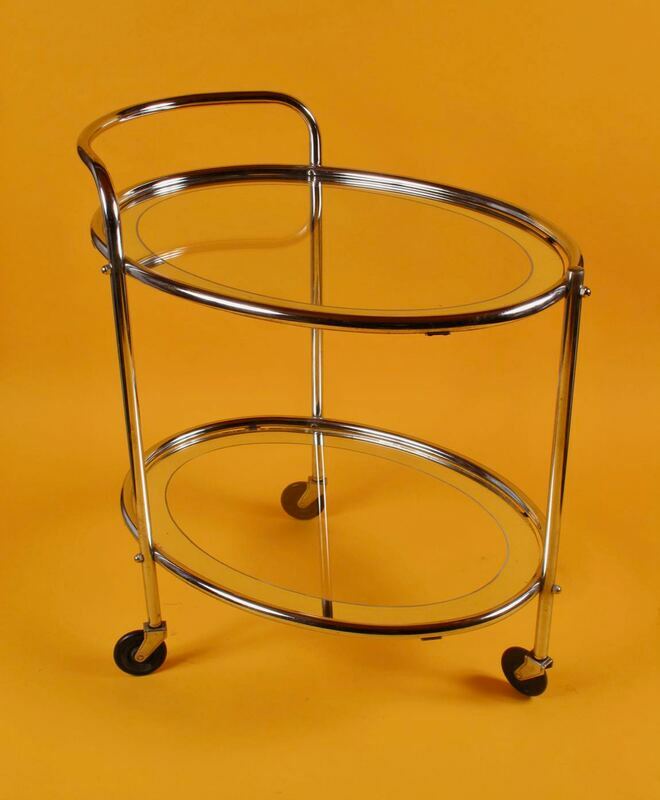 It is rare to find this type of trolley with the original oval mirrored clear glass shelfs. 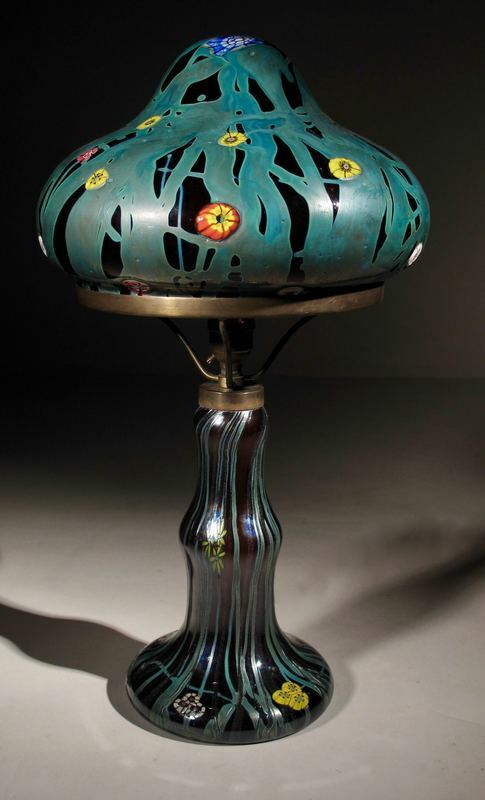 The original wheels/casters all signed "Olgryp"
A spectacular metal tole floor lamp with flowers by Hans Kögl Germany. 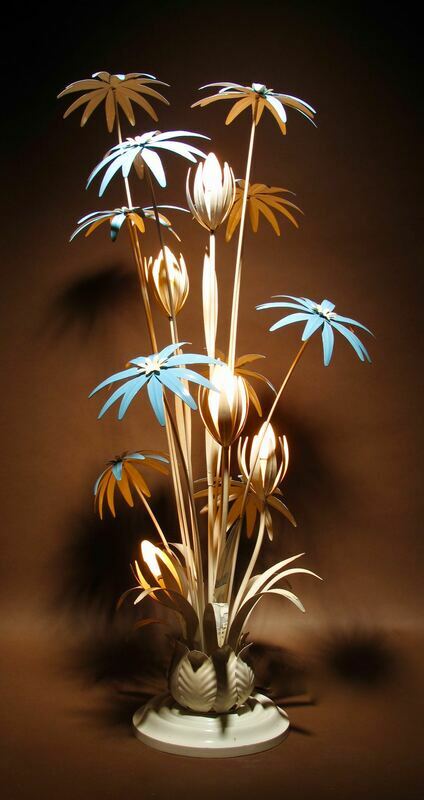 White lacquered metal stems and leaves holding 5 light bulbs on white lacquered base. 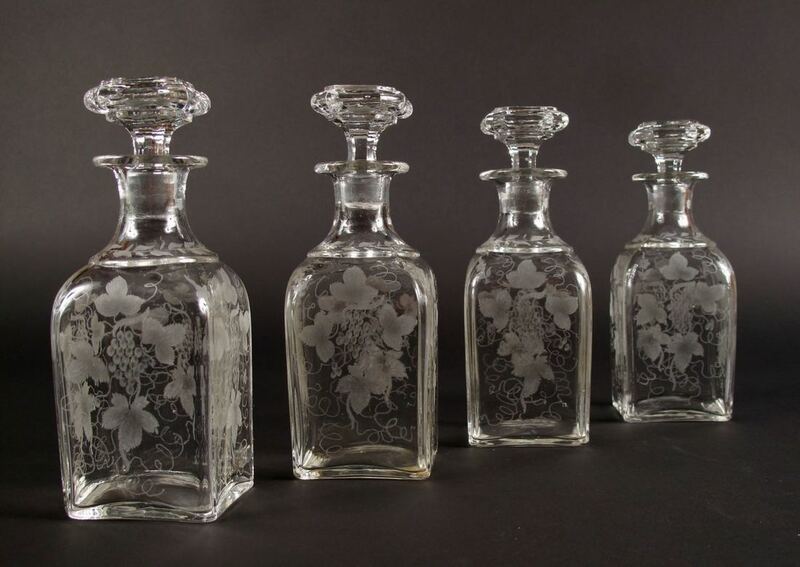 The white stems decorated with 10 blue enamel flowers. In good vintage condition, wear consistence with age and use. 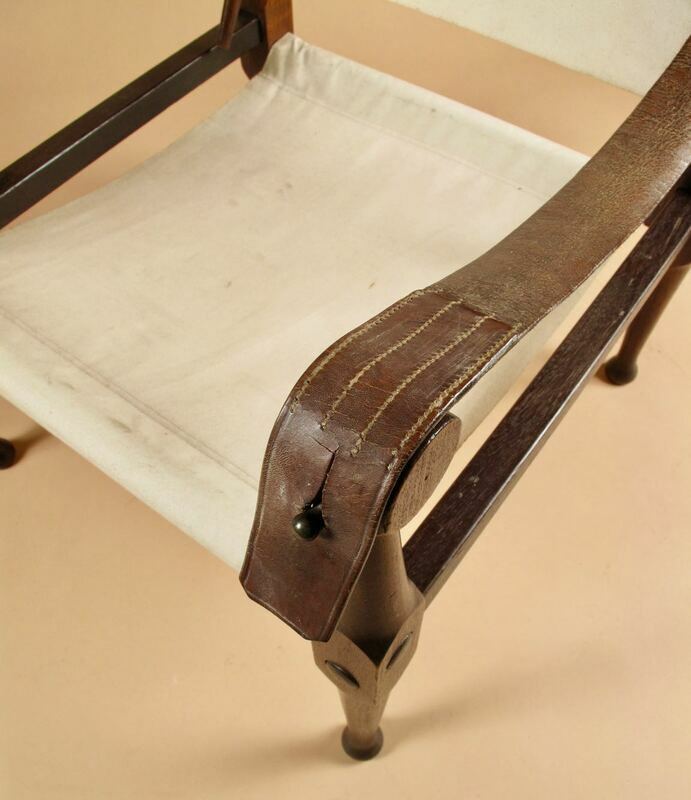 The chair still has the original leather straps ( one leather arm rest strep with old repair) The canvas not original, the chair is overall in original good used condition and with a nice old patination. 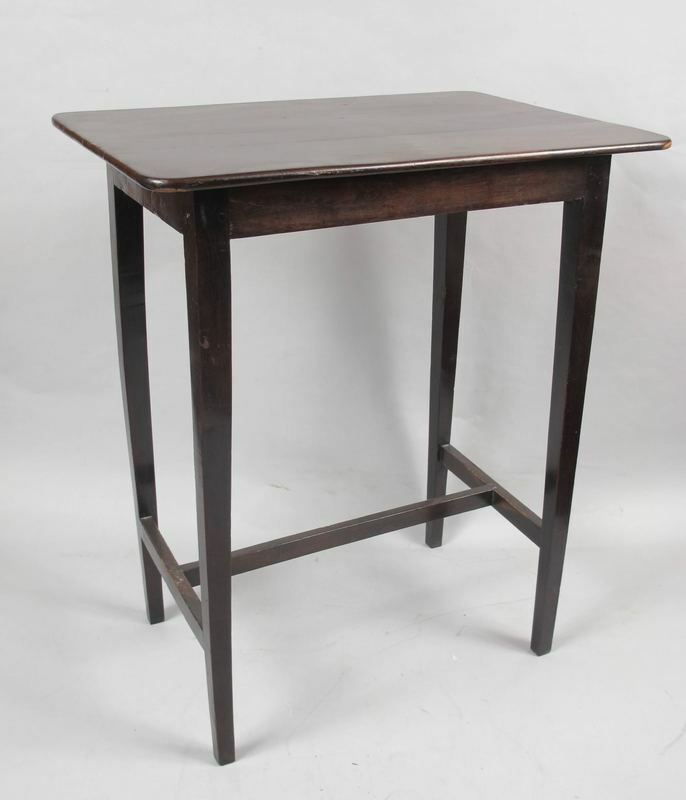 78cm high 57cm dep 57cm wide. 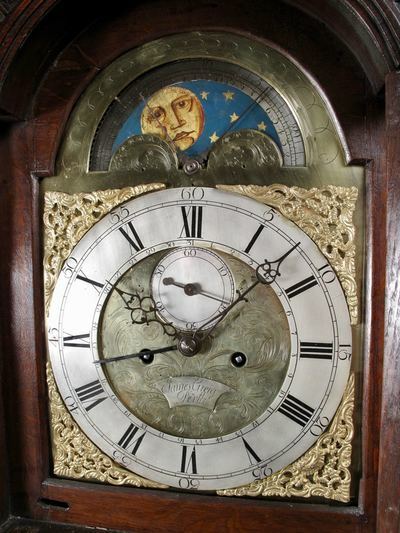 The warm colour mahogany case with original patination, the original ormolu ( bronze doré) in original condition finely cast and chased, the original harp shaped pendulum with star decoration on silvered background, also the dial is silvered with nice blued hands. 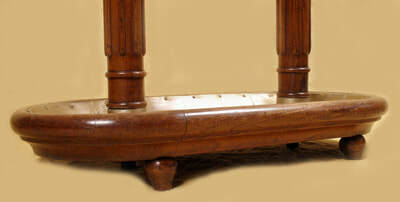 Still on the original turned mahogany feet. Complicated woven in two colours of thread. 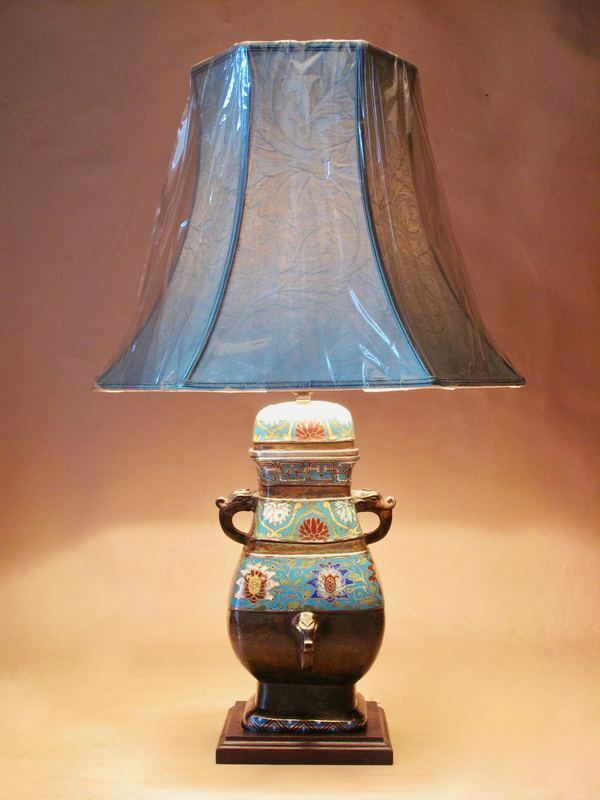 In original used condition with nice original beautiful old patination. 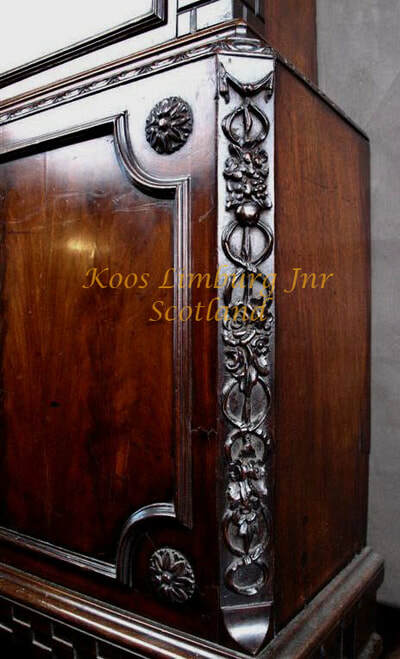 The top with a fine carved door with 4 glass panels, the lower part with two very fine caved drawers. 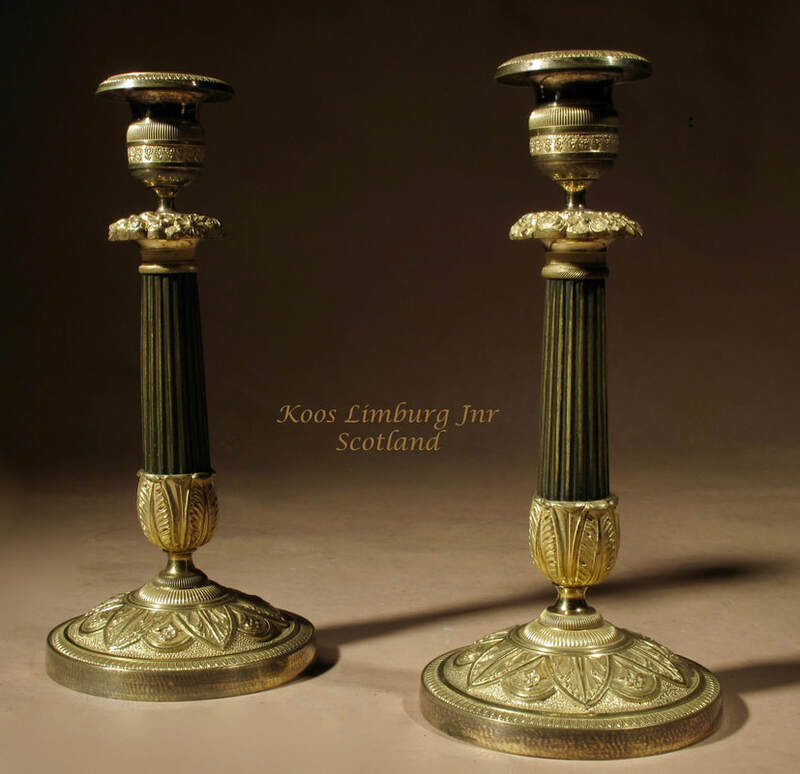 overall in original condition and with beautiful old patination, no missing pieces. 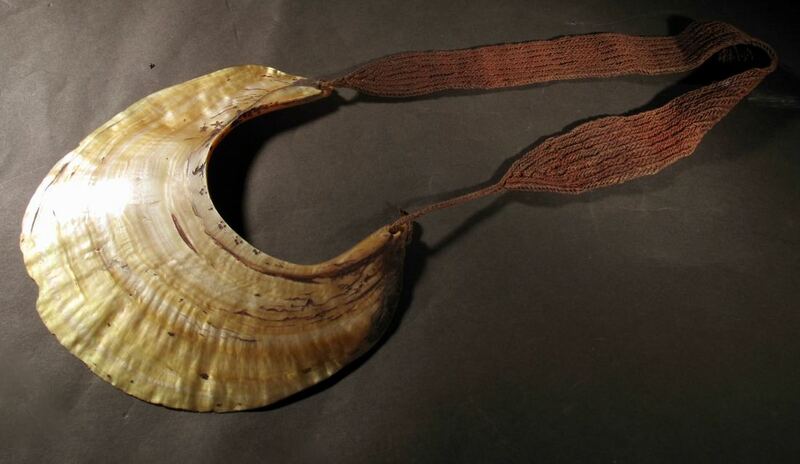 the top part divided with the original shell including two loose silk covered sheets. 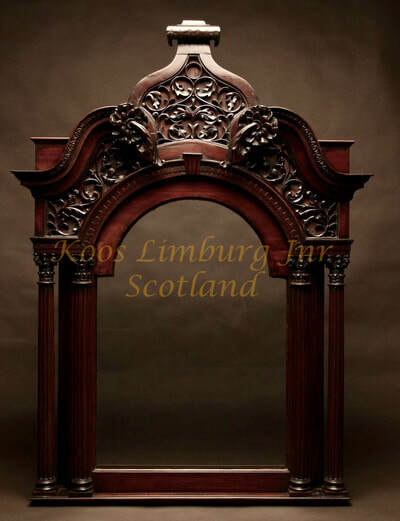 The bottom part with beautiful lambrequin carved decoration between the claw feet. 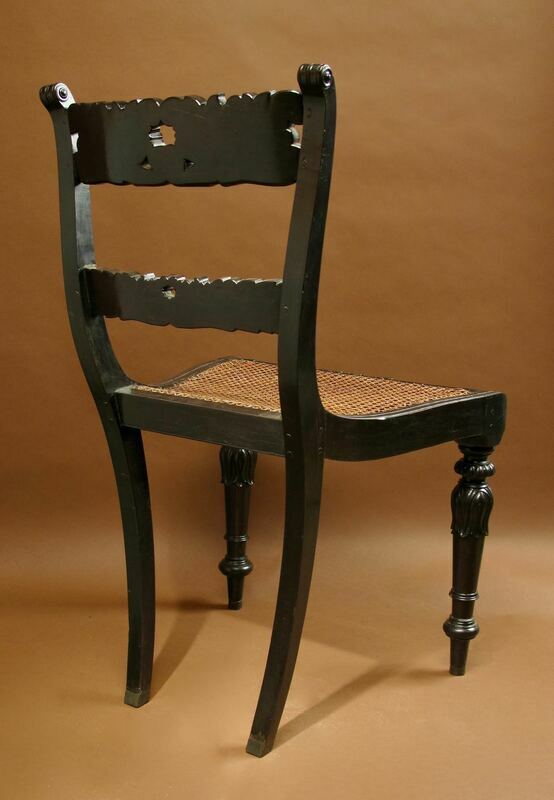 In original used condition, not repaired or repainted. 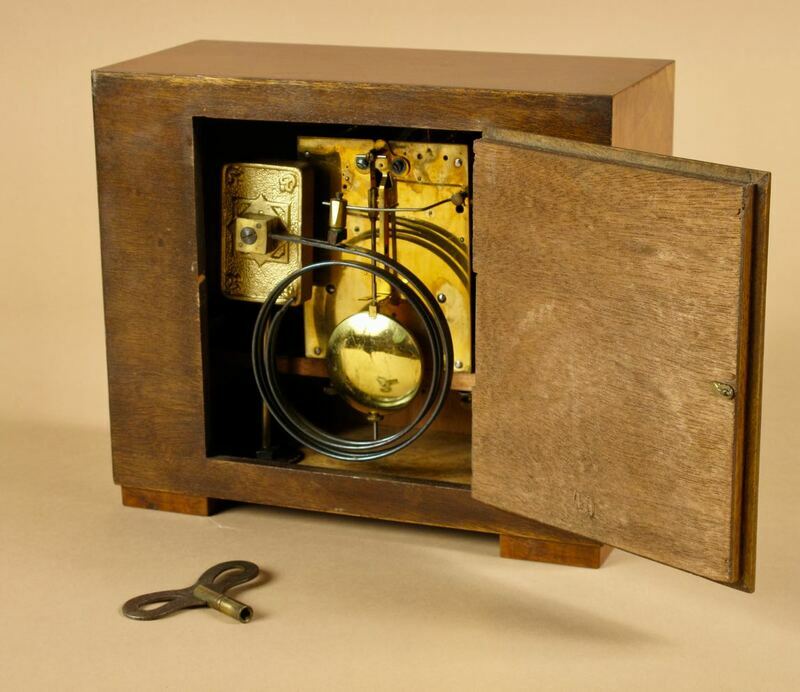 Still with the original marked movement pendulum and key. The movement is cleaned and in working order marked for: Junghans. Striking on a double coil every 30 minutes. 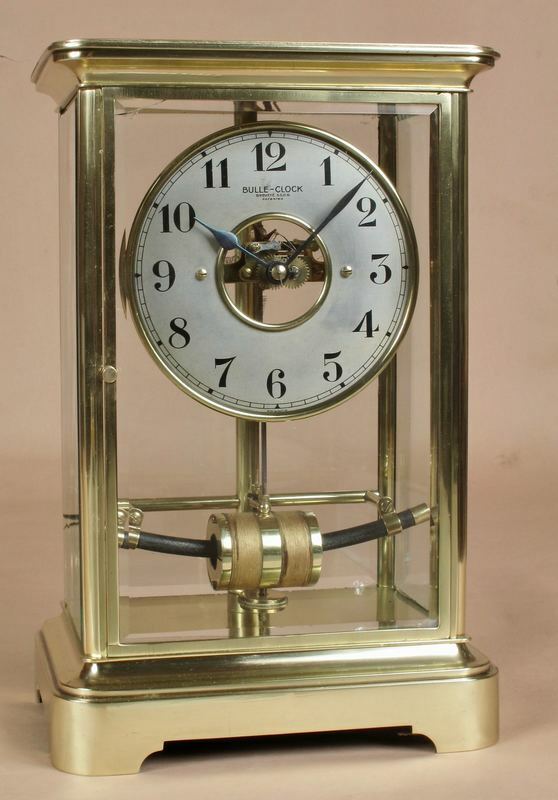 A top quality design clock with heavy brass quality movement. 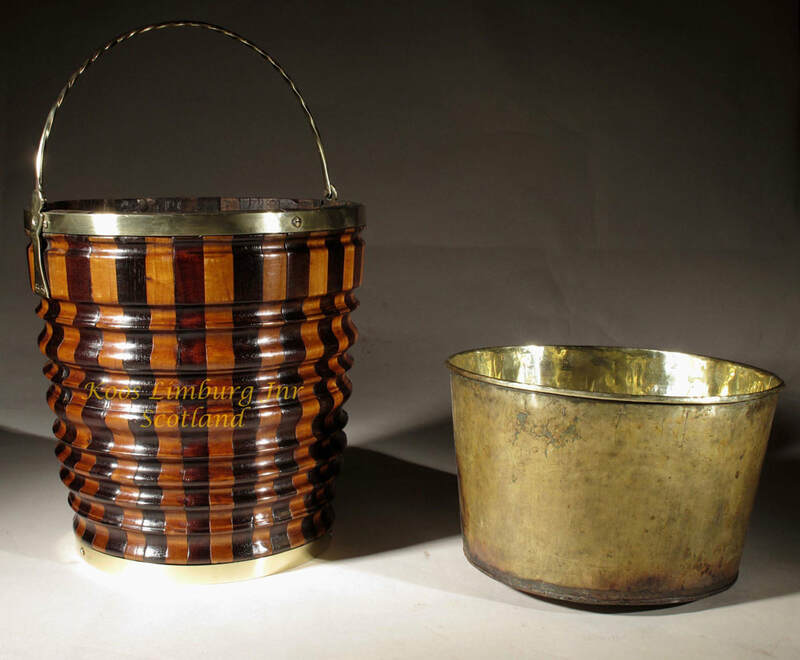 In original used condition with original patination. 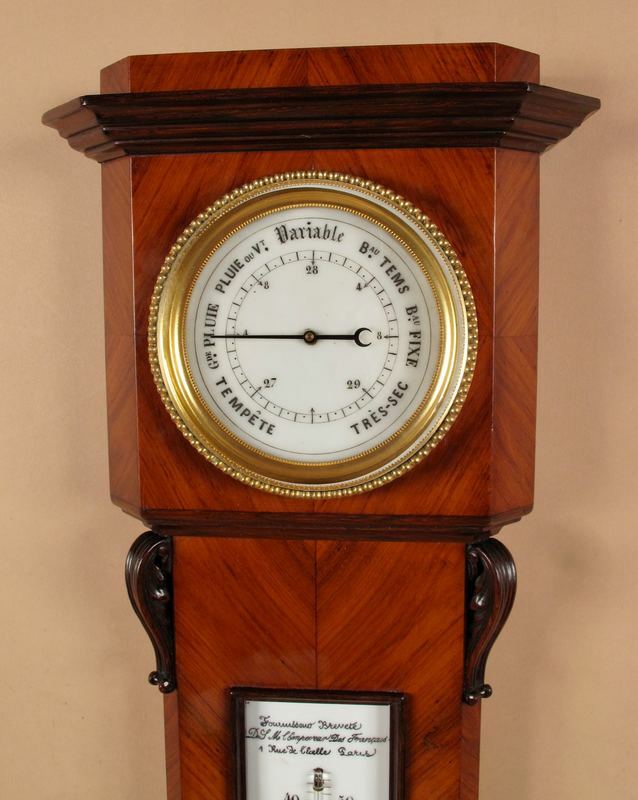 A very decorative and unusual Rosewood/Tulipwood Barometer with Thermometer. 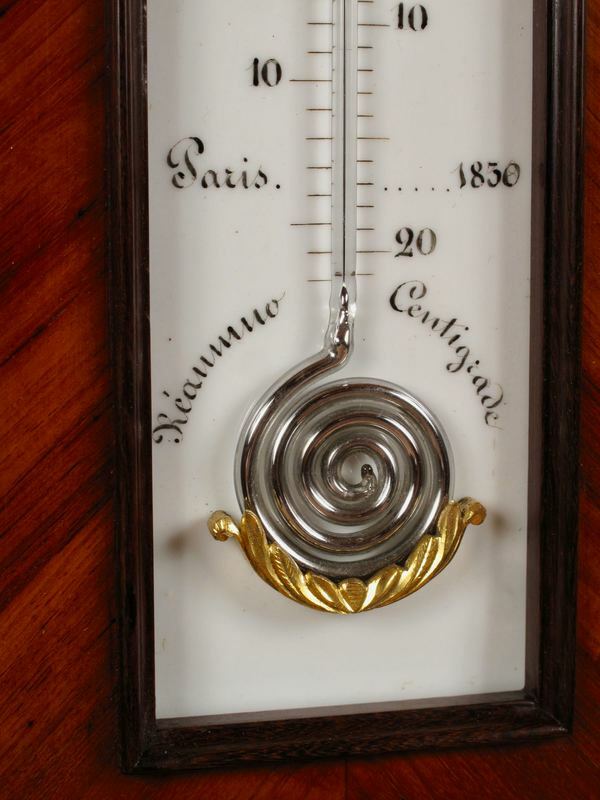 With original gilded beveled glass dial and original glass thermometer and snail form gilded holder. Including wonderful carved leaf corner Capitals and Basements around the thermometer. 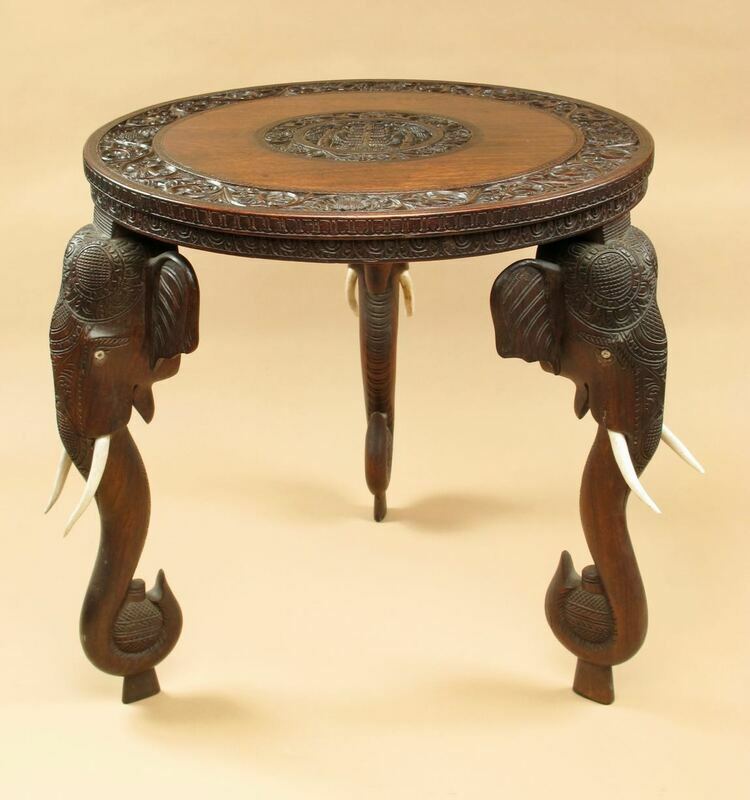 Carved in the centre and on the side of the top with classical Indian motives, supported by 3 very nicely carved elephant heads and trunks . 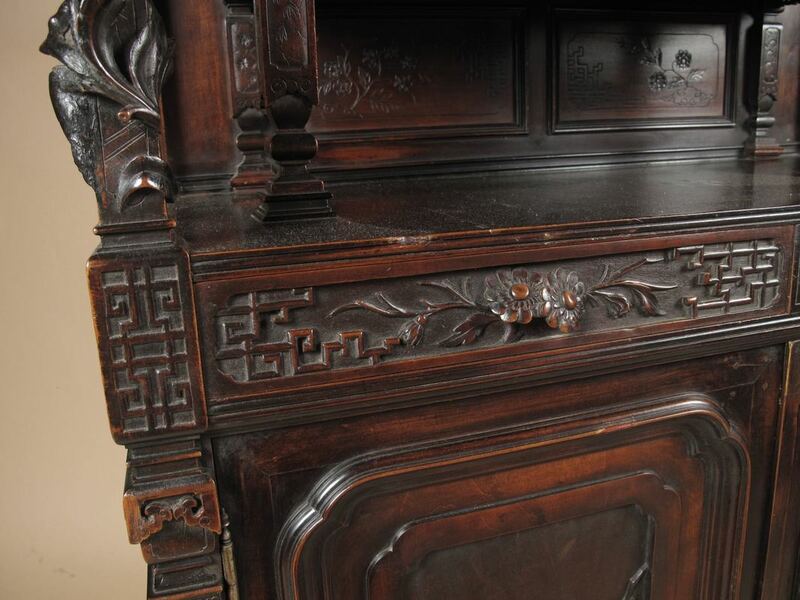 In very good condition, with original old patination, no missing pieces and the top is not bended or out of shape. 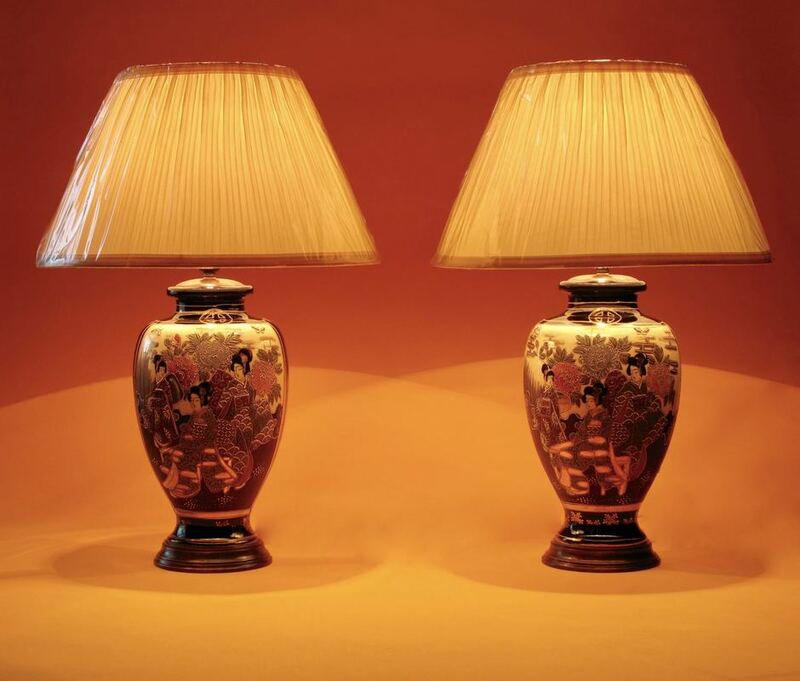 An Original and Decorative Pair of Japanese Satsuma Vases now Fitted as Table Lamps. 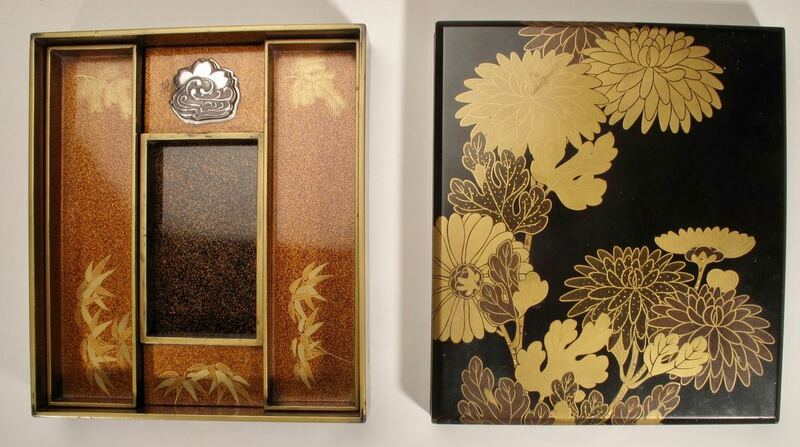 Decorated with Japanese Geisha's and butterflys in a Garden , at the reverse Geisha's in a mountain setting. 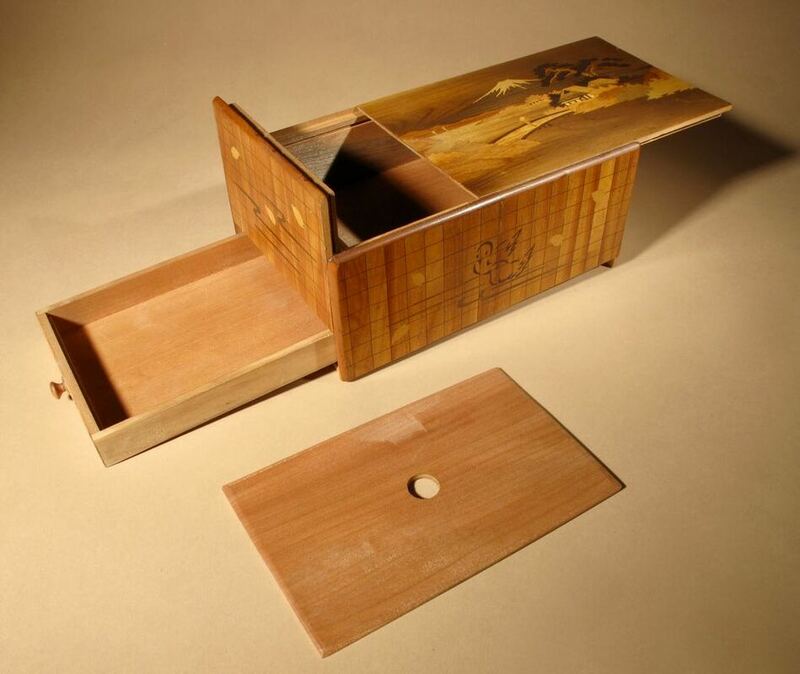 Decorated with the Shogun symbol on the top, all set in a dark blue surrounds frame. 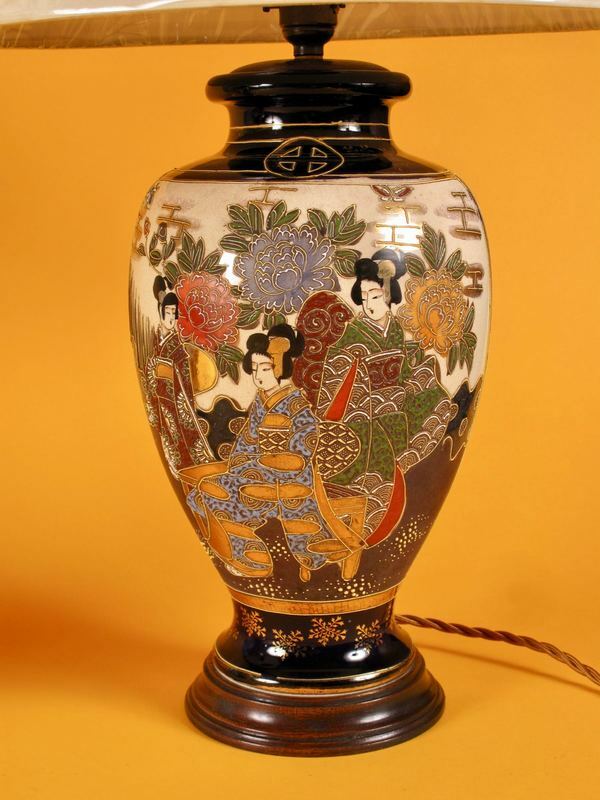 A rare Complete Chinese Demonstration Set How to Make Plique-a-Jour Vases circa 1920-1940. 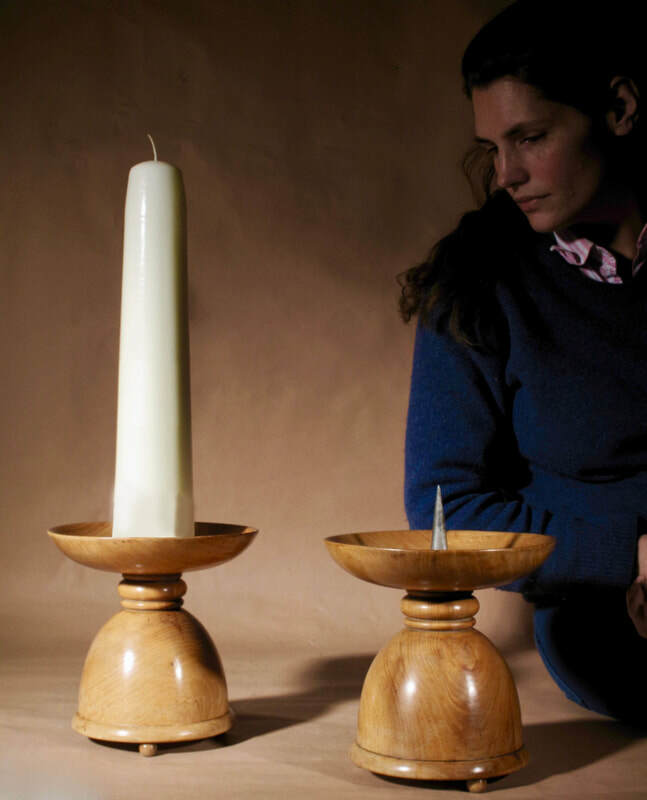 Each vase demonstrates each phase how a Plique-a-Jour vase is made. As you can see it is a very complicate process and very interesting to see and find a early complet set, still in its original box. 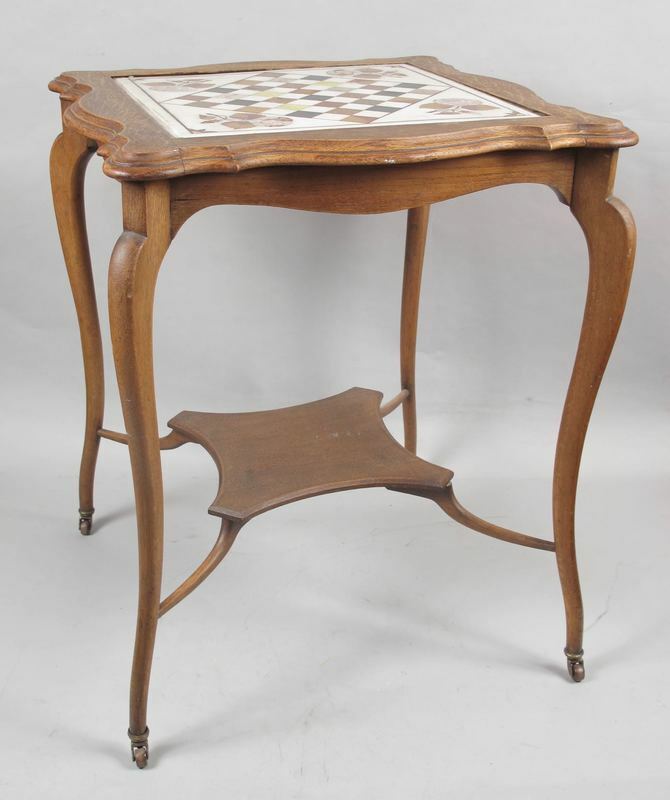 A fine 19th century carved anglo Indian hardwood folding table circa 1880. 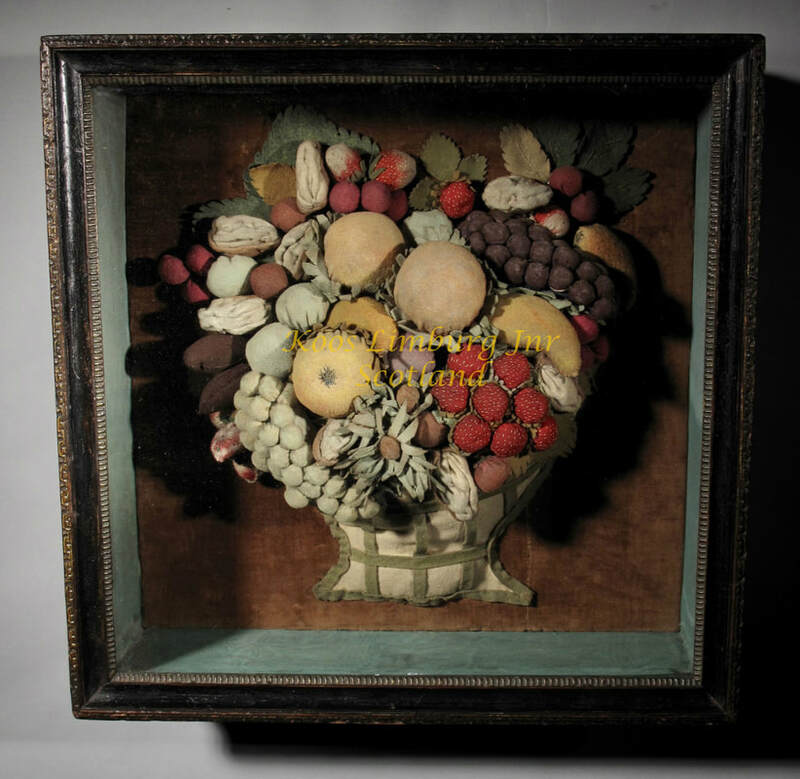 In very good original condition with nice old patination, no missing pieces. Jumping Fish with glass Eyes. 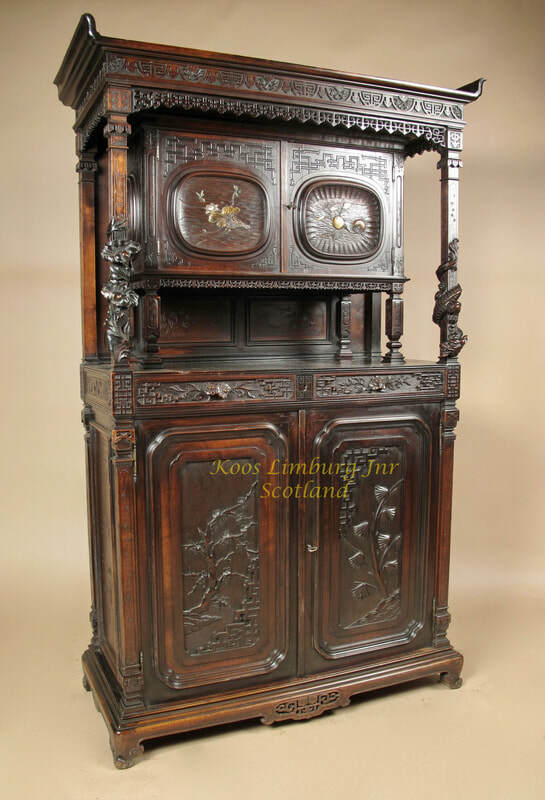 An exceptional very decorative Tyrollean carved pine display cabinet. 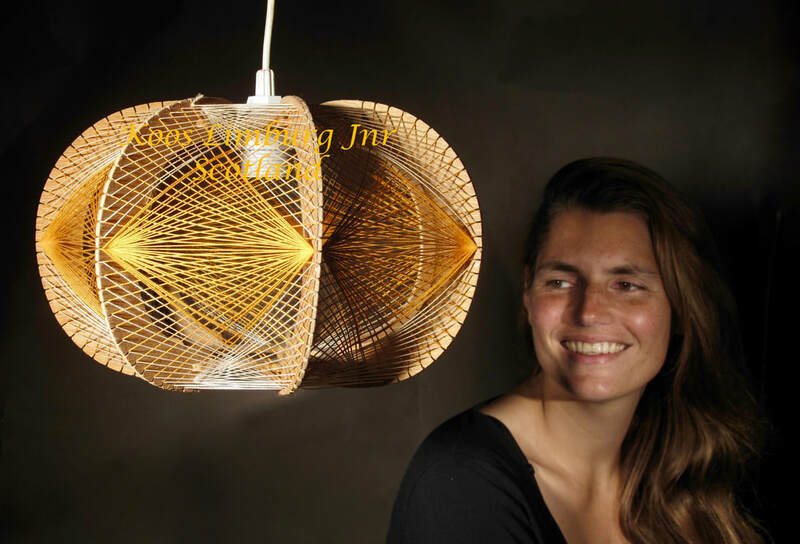 Made in the Dutch style. Overall with typical Tyrollean fine carving, it is possible that this display cabinet was painted in the past. 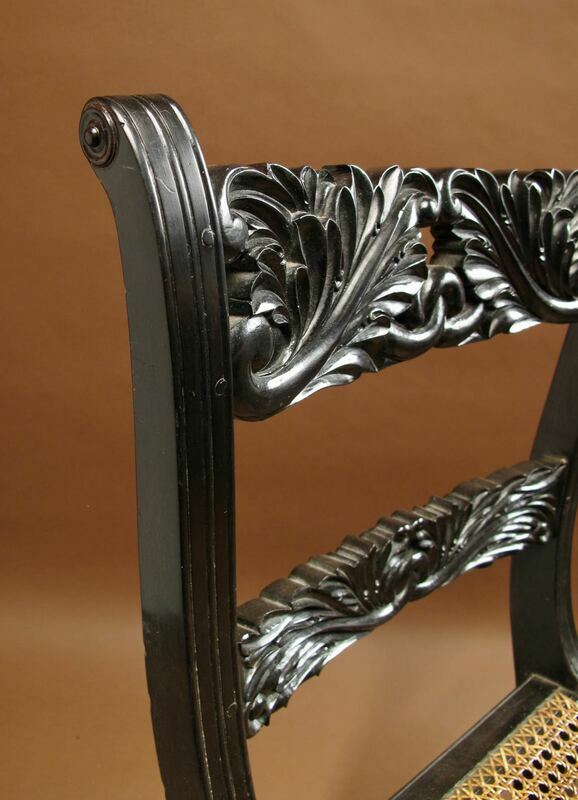 Now with the beautiful old wax patination. 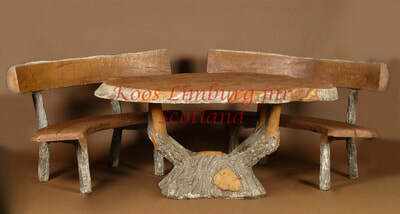 Magnificent Very Complete Garden Set in the Grotto/Natural design style, circa 1950-1960 . 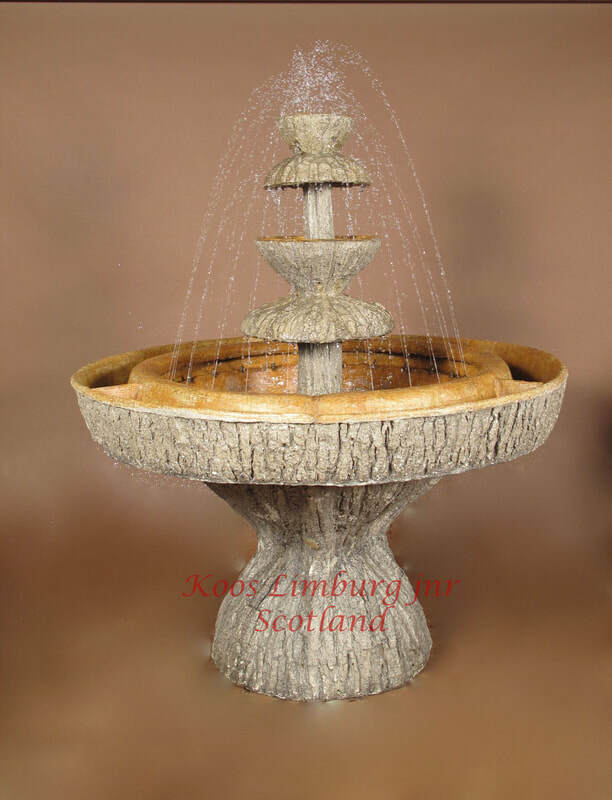 With a spectacular, beautiful and unusual fountain/ jardinière with 24 fine jet sprays. 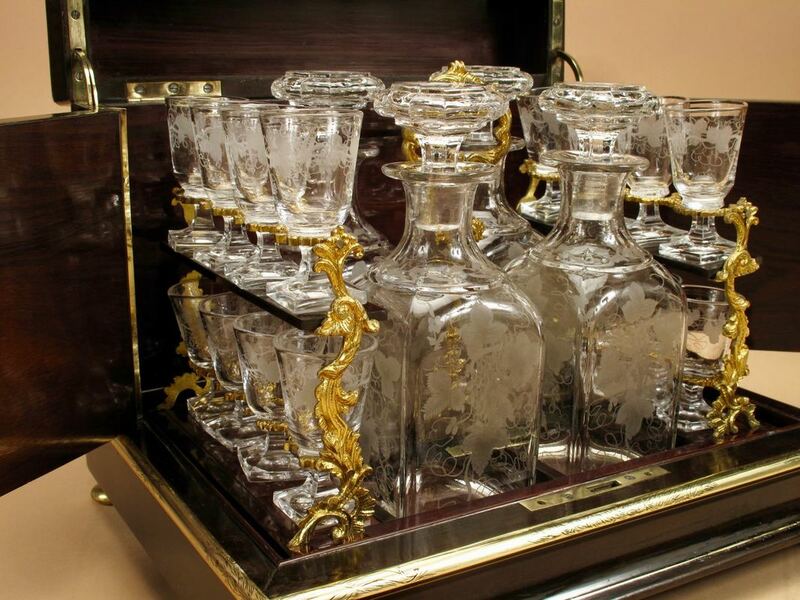 the 12 piece set is in very good original used condition. The fountain with a new electrical pump and in fully working order, the fountain circulates it own water. 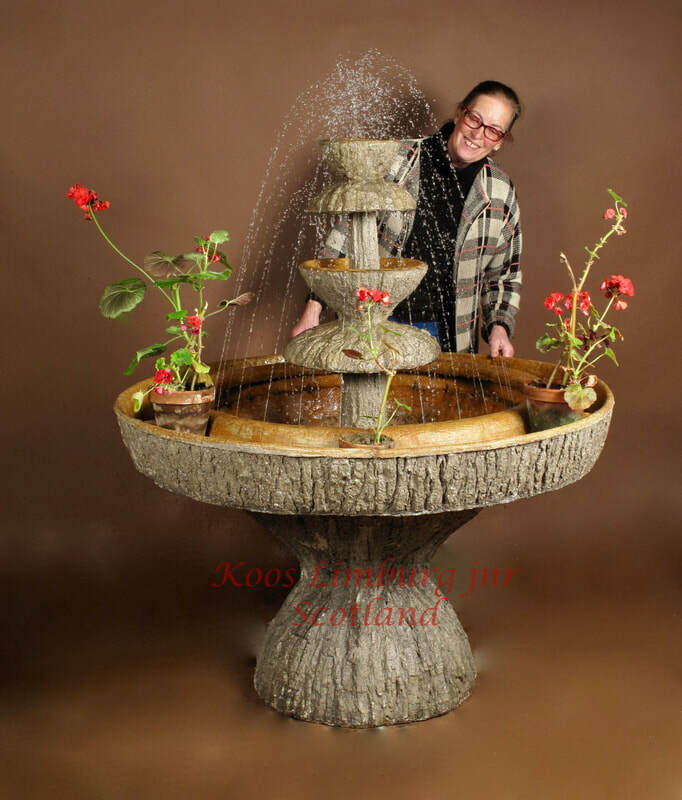 The garden set is made of a kind of concrete. The table tops and seats have a original grain structure of a wooden tree pressed in the concrete. 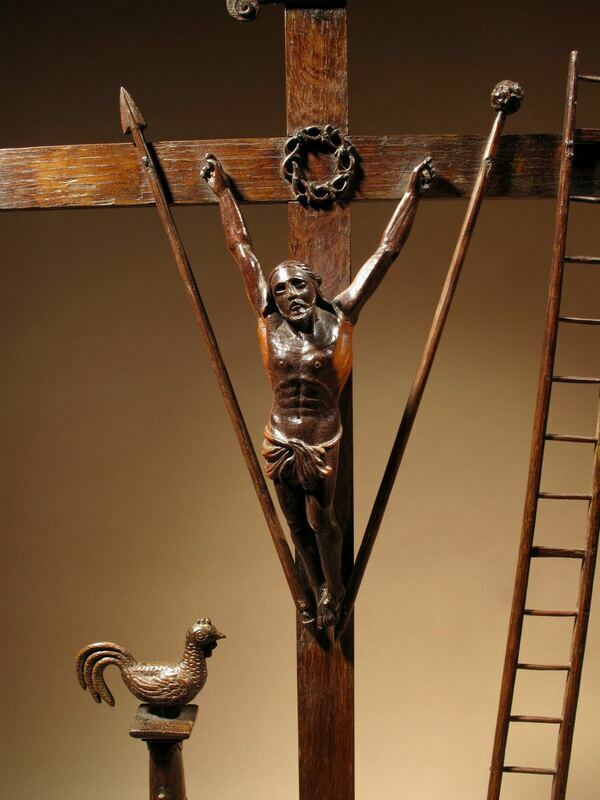 It is very unusual to see a Christ figure with all the symbolic attributes. 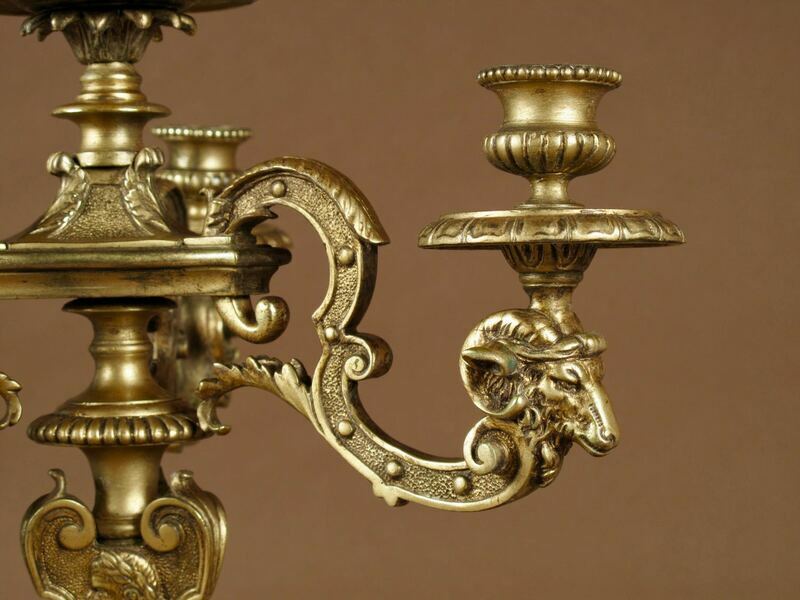 An original decorative finely chased brass jardiniere, with lion handels and claw feet. 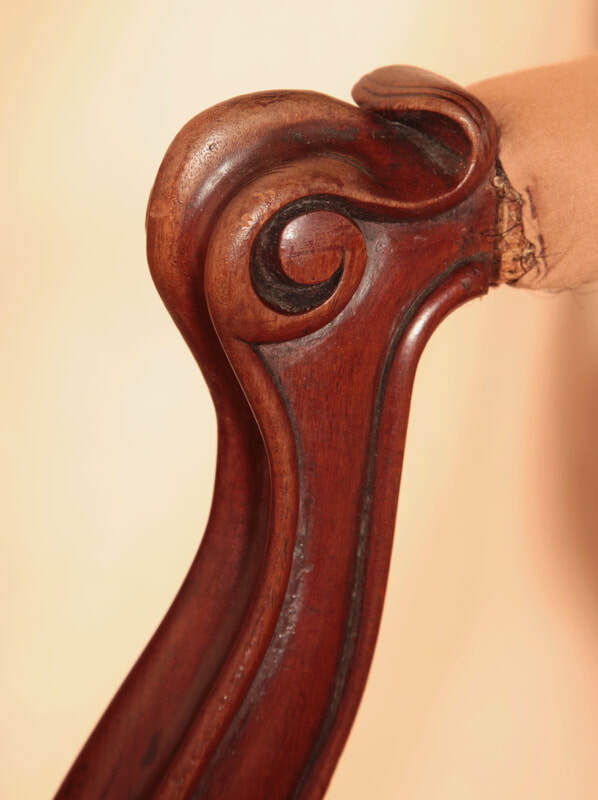 Still with the original wooden handle. 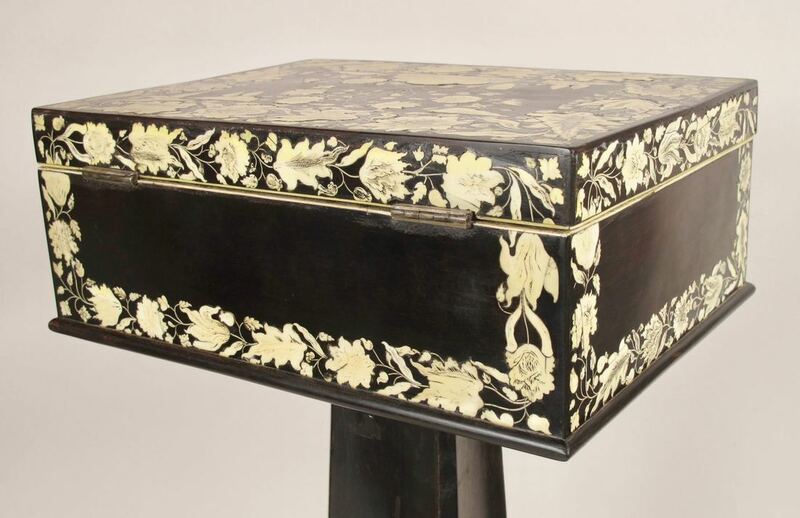 Very nice to see is that the original brass lid with the cut out ajour fretwork of flowers in a vase is not over polished, witch means you can still see the fine engraving in the brass. 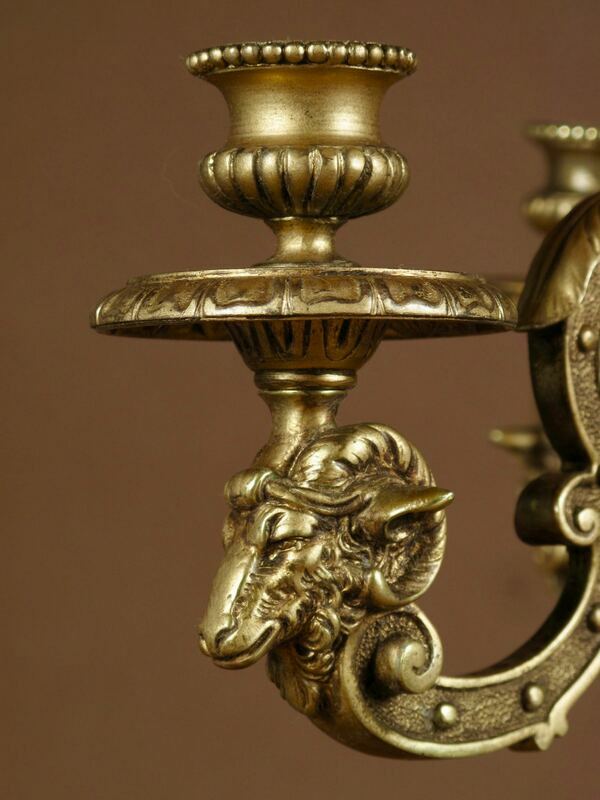 ​Still with the original ormolu mounts and candle holders. in original good old condition, with nice old patination. 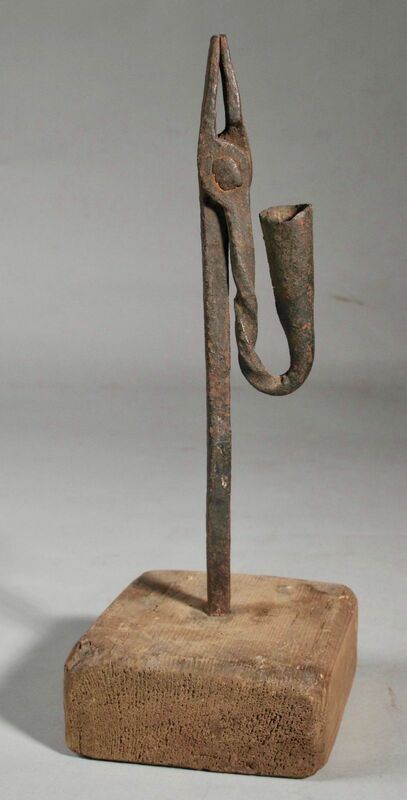 A very stylish and artistic wooden sickle-stroke carved sculpture of a Guisha. 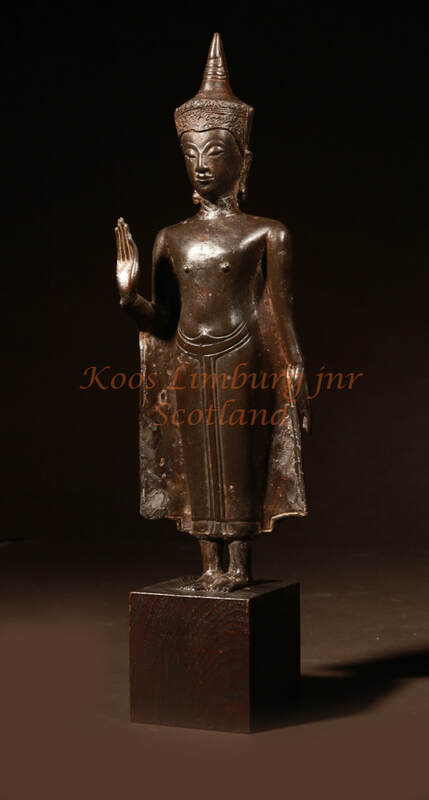 In very good condition with nice patination. 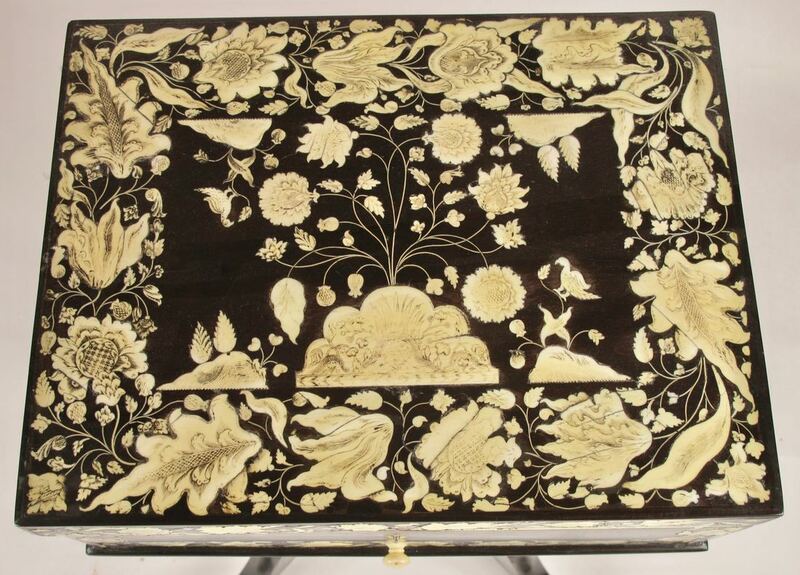 A beautiful very Artistic Linoleum cut Aesthetic Movement Fire Table Screen. 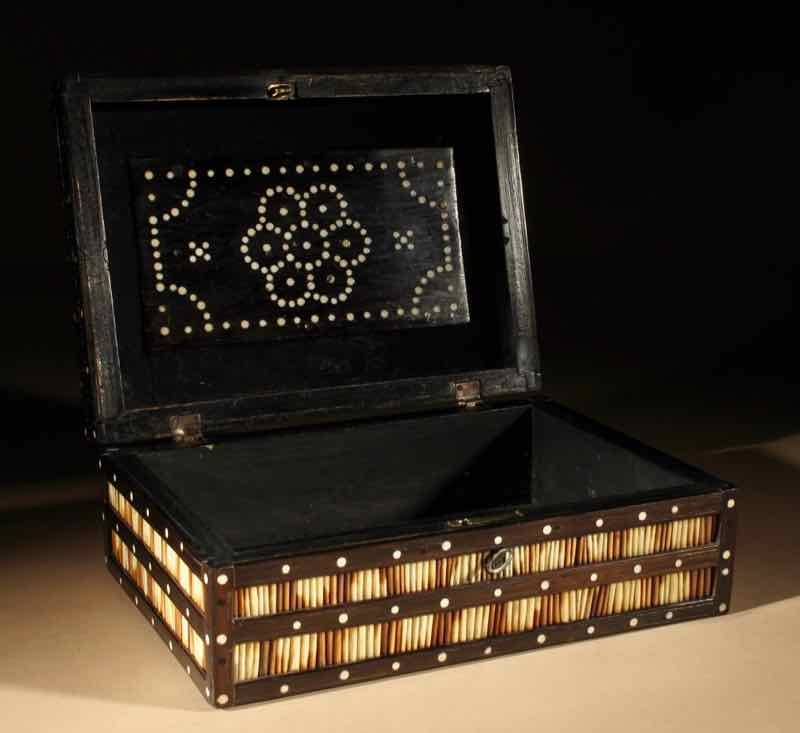 Beautiful made and finished with ebonised wood and pewter mounts and brass flower buttons. 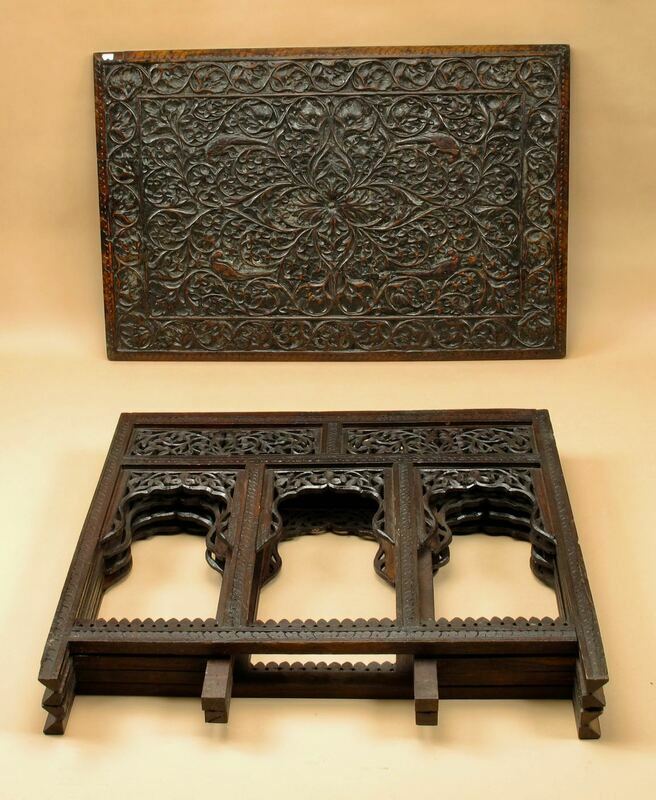 The pewter mounts simulating a window overlooking a garden. An interesting set of 5 completely finished wooden carvings. 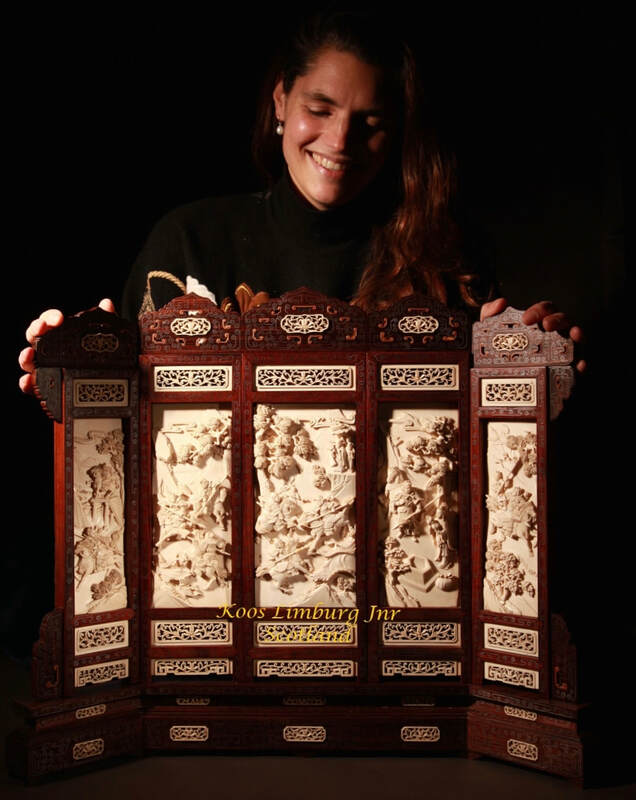 These carvings where original the center panels of the doors of a Dutch renaissance armoire. The panels have bible subjects. The 5 relief carvings are completely finished carvings and where not and are not fragments of larger carvings. 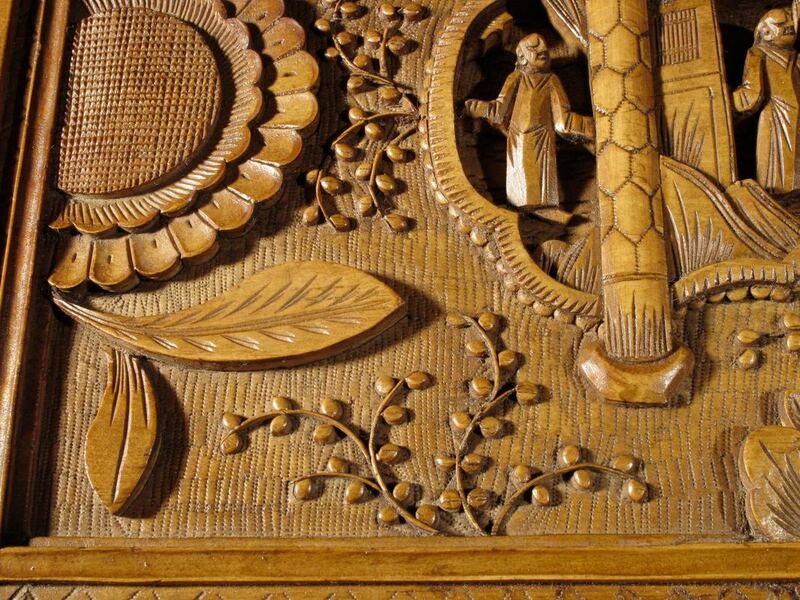 The carvings are now in later frames. 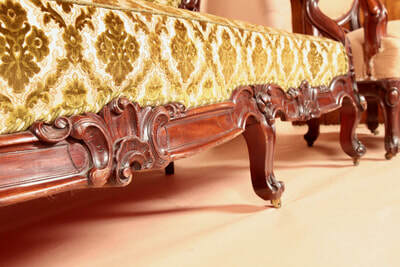 In very good original condition, there are no cracks or restorations. 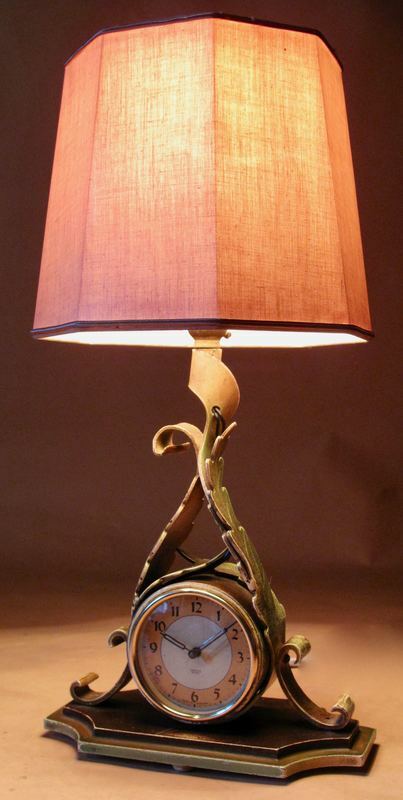 The lamp has been rewired and has been tested for electrical safety with a old fabric style new cable. 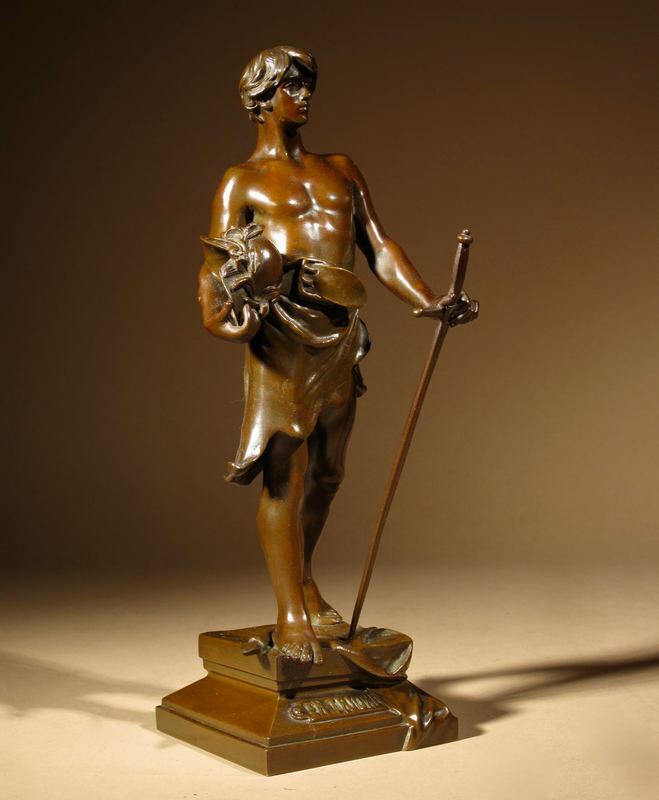 Signed H. Levasseur and with the founders seal of Societe des Bronzes de Paris, (the Paris art brons society) Was in activity from 1875 till 1930. 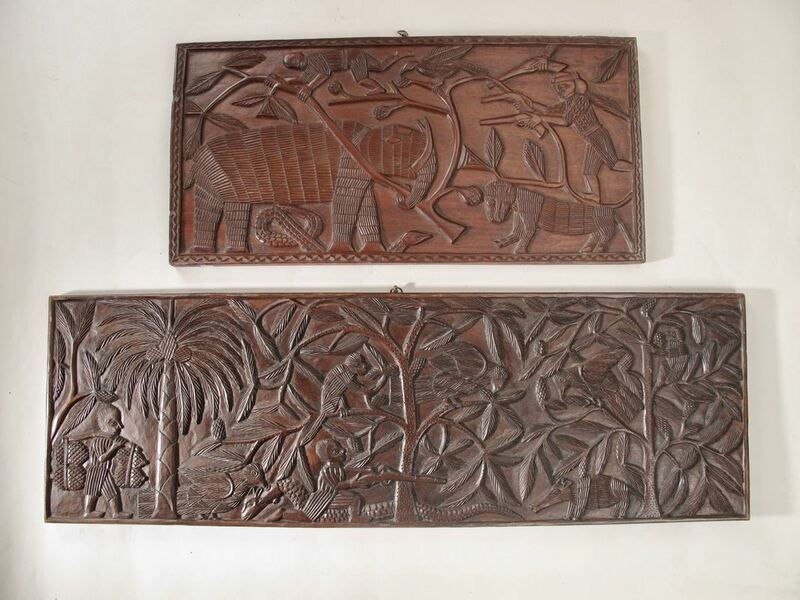 African Art, sixties / seventies period. 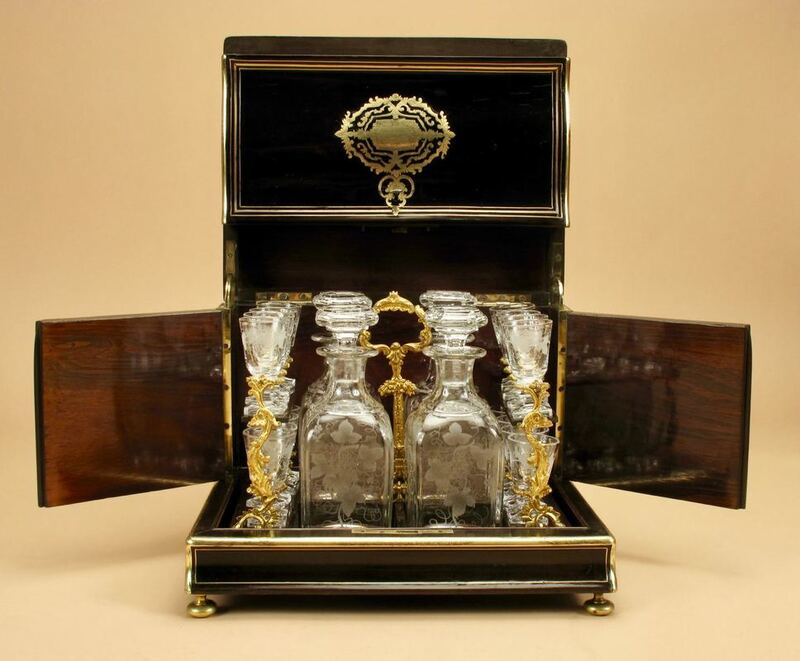 "Cave A Liqueur" Original Complete Tantalus Napoleon 3 ( 1852-1872) Ebonised Inlaid with Engraved Brass And Brass Fillets. It is rare to find an original complete Cave a Liqueur still with the original complete set of 4 decanters and 16 glasses. The decanters, stops and glasses are all the same engraved with vine leaves and grapes. 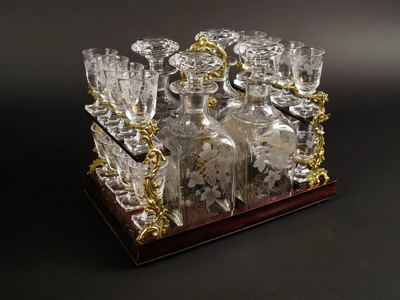 All the glassware is in original condition no cracks or missing pieces, two of the stops on the underside have some small chips, invisible when the stops are on the decanters. 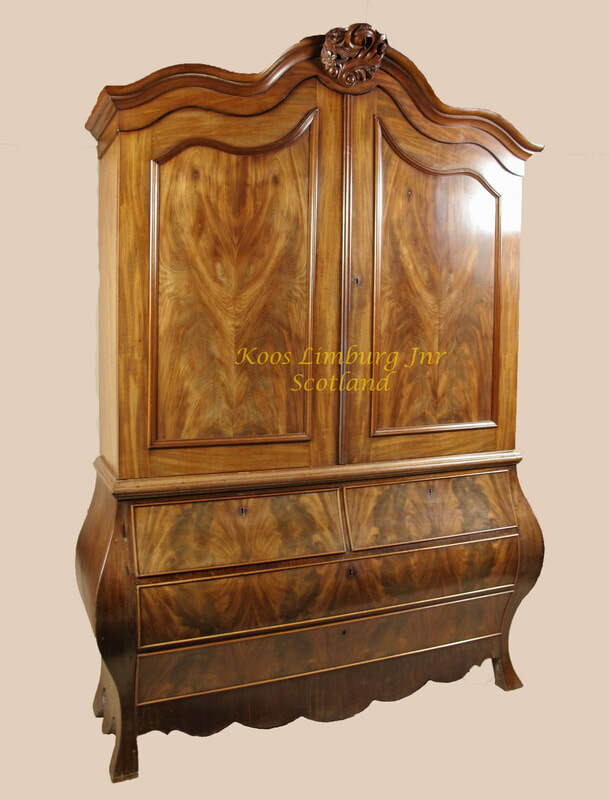 the cabinet is all over in original old used condition with a beautiful french polish finish. 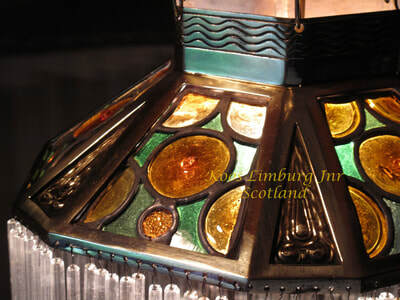 Exceptional Copper, Malachite, Bakelite and Glass Design Standard Lamp. 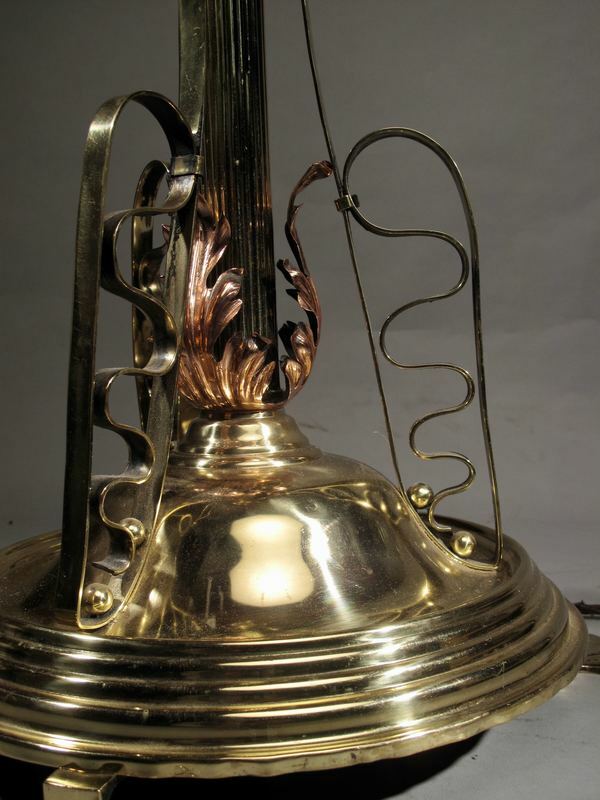 The copper has a very fine impressed chain and waves decoration whole over the lamp. 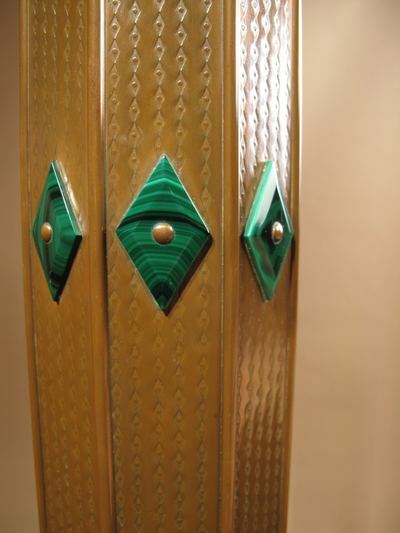 The bakelite top in the middle is very fine inlaid with copper, the top part of the lamp stand has eight malachite diamond shaped decorations. 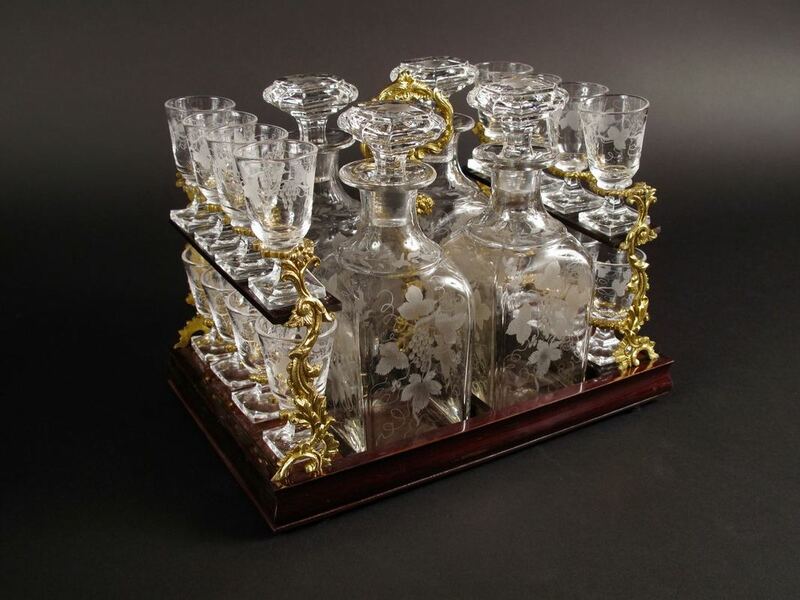 The top build up with 16 wedge shaped glass sections. 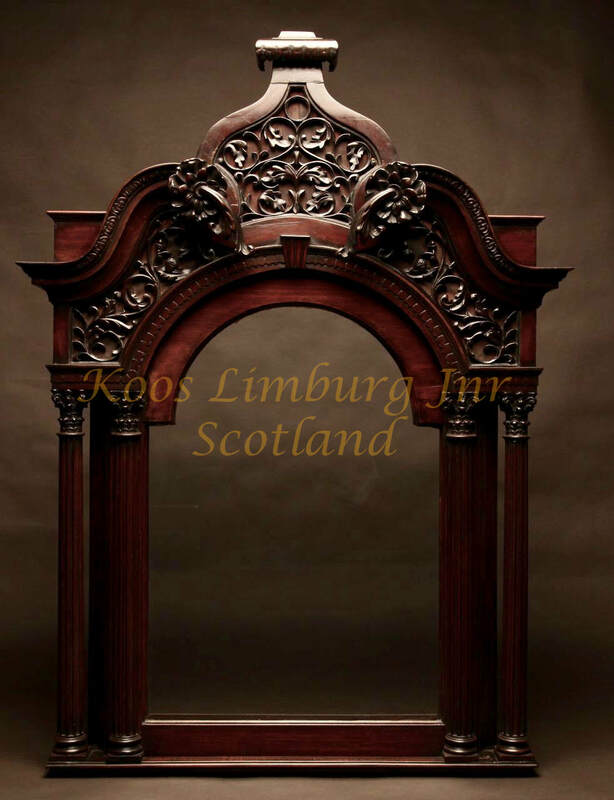 We have seldom seen such a high standard and quality of design and craftsmanship. 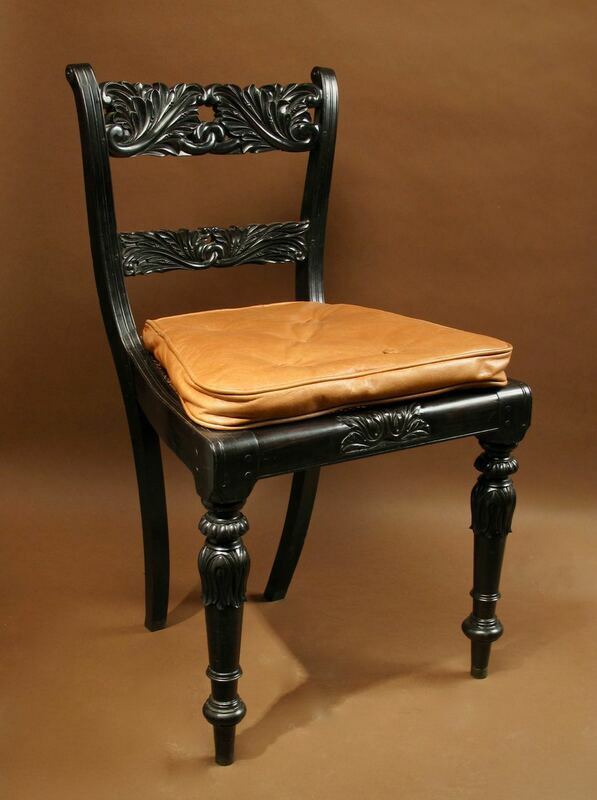 Still with the original leather, the leather with some old repairs, with a beautiful old patination. still with the original luster spray paint, in original condition. 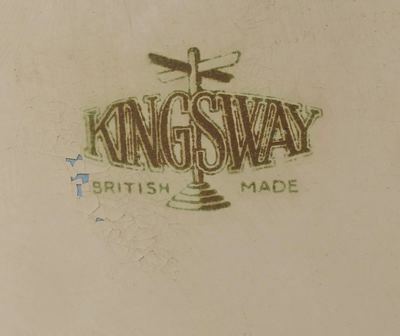 Still with the original mark of "a product of Suckling (limited) Birmingham Engeland" and Kingsway British made. 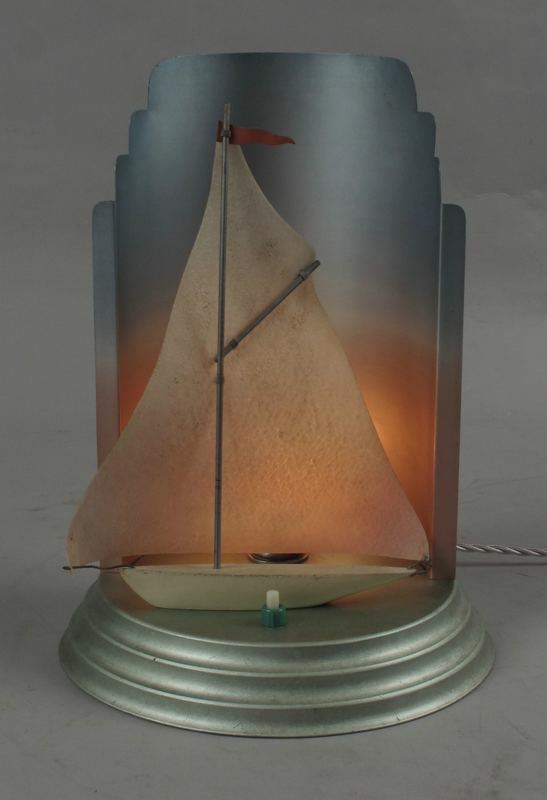 Very interesting with the sailing boot with its original sail and flag. 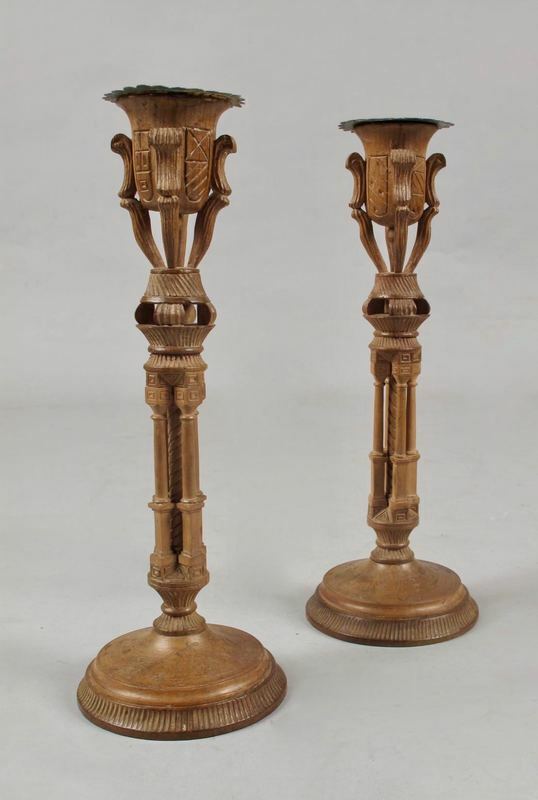 A pair of very stylish unusual very fine carved and engraved walnut candle sticks. 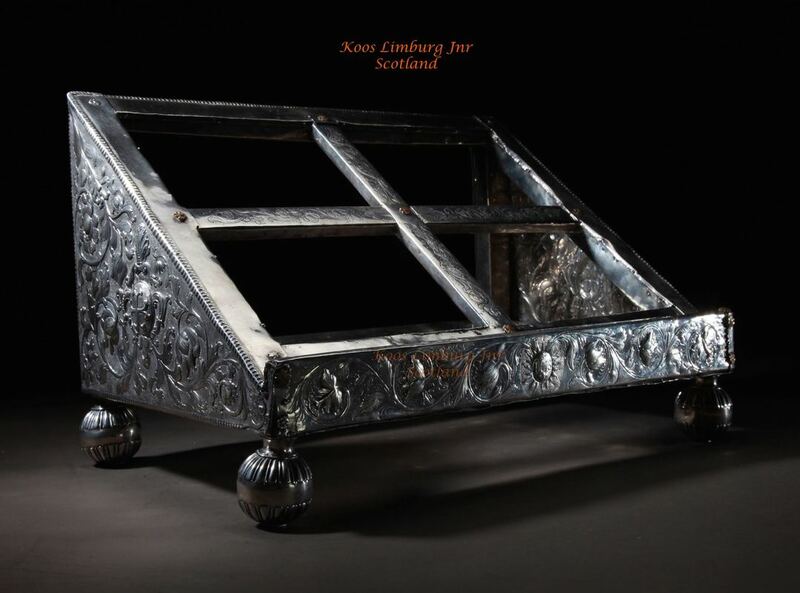 Mounted with metal drip pans on the top, the feet are finally engraved with amusing animals and human heads. 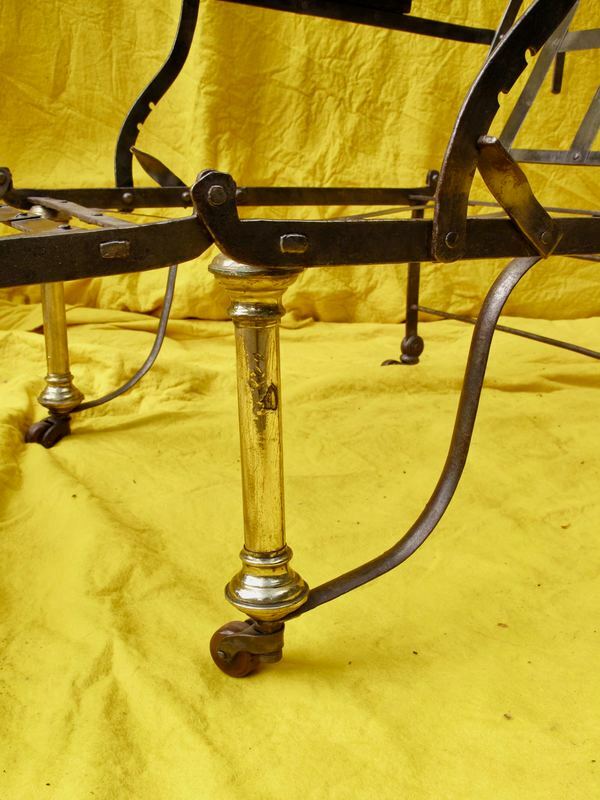 Overall in original good condition with nice old patination. 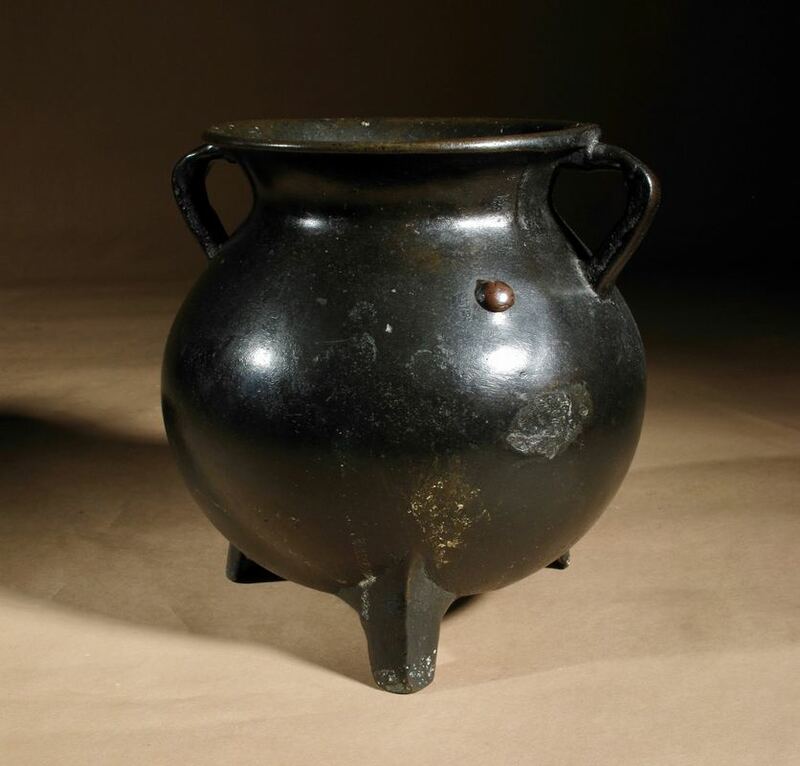 Still with its beautiful chocolate colour old patination, whole over. 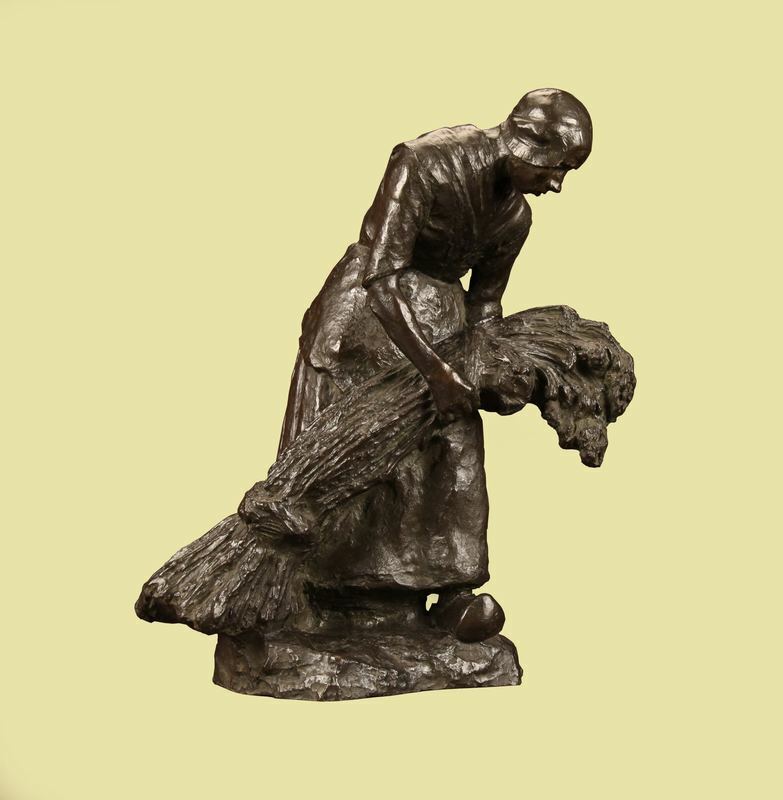 Usually you’ll see sculptures of this subject in a larger cast. 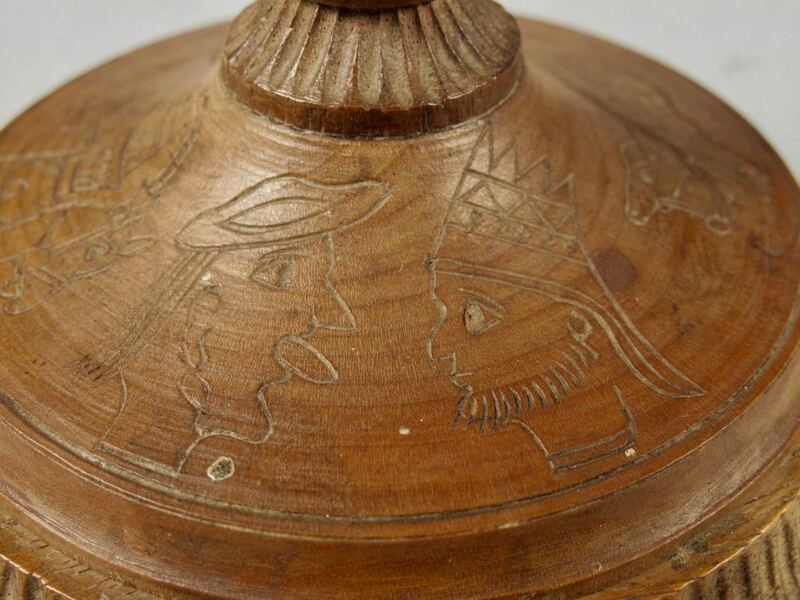 But also the foundry mark of Paris. 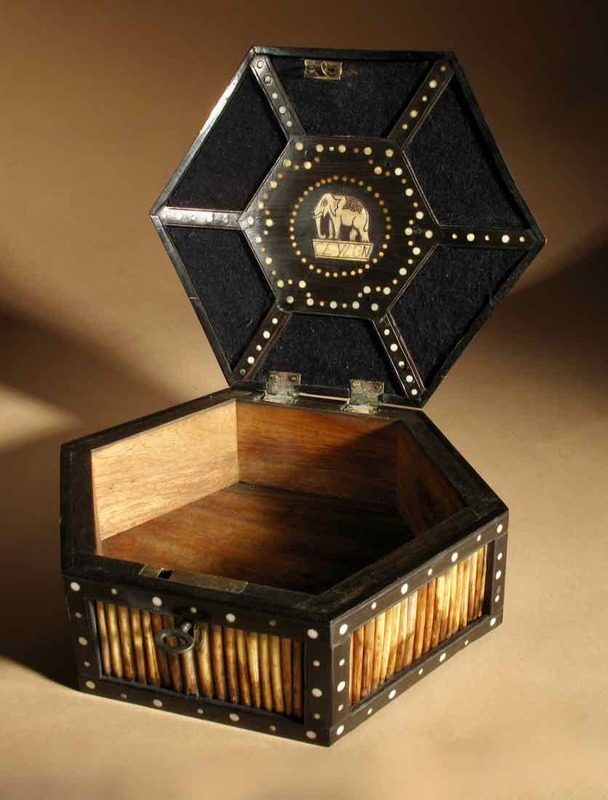 The wooden frame is inlayed with silver wire and different kind of wood. 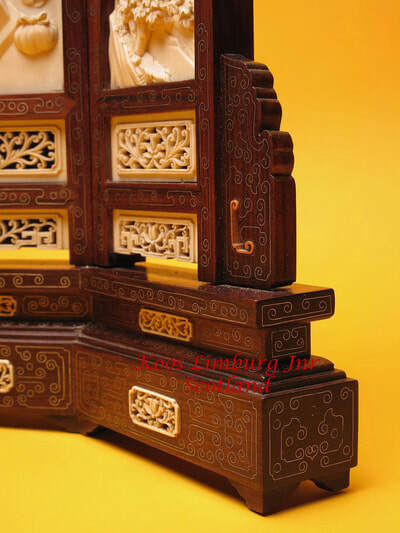 With the subject of the historical Battle of Changban, the famous Chinese Romance of the Three Kingdoms. 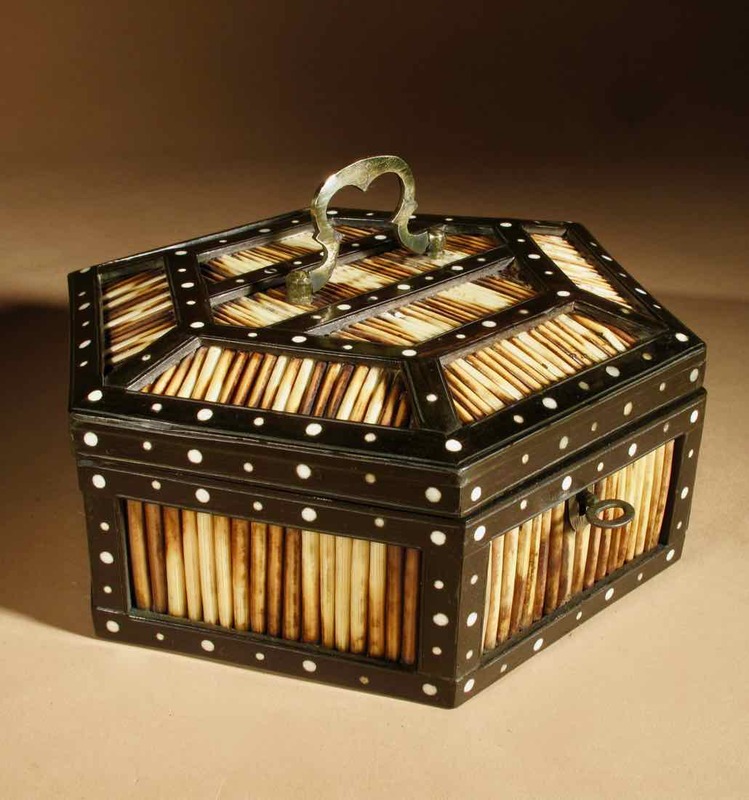 A very decorative and original salt coopered pot/box what you can hang on the wall, is beautiful hand made and turned on a lath wonderful piece! middle of the 19th century. 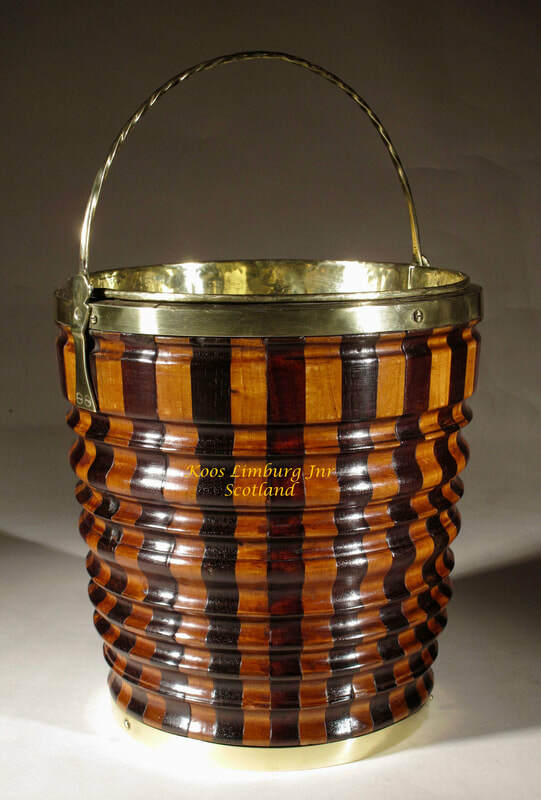 26,5cm high 15,5cm till lid and 14cm diameter. 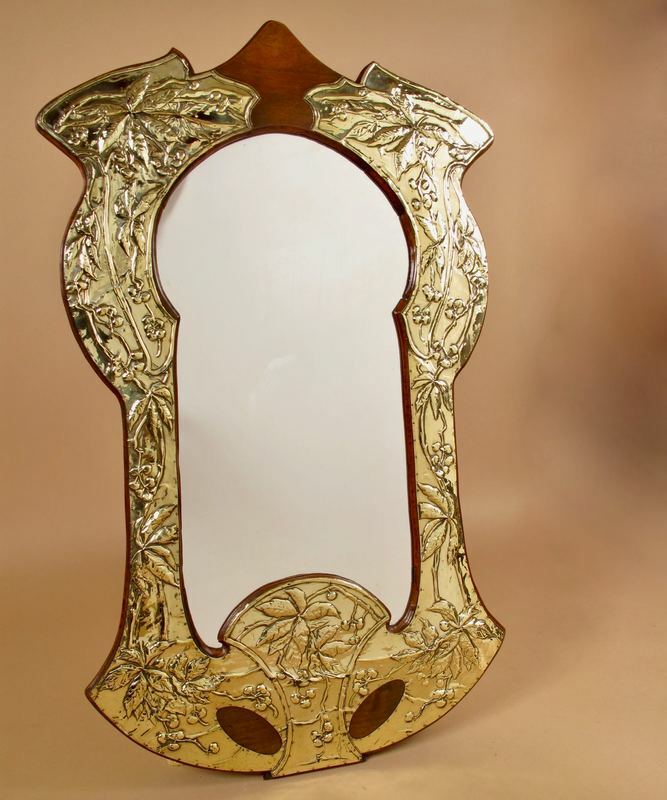 A Decorative and Stylish Art Nouveau Embossed brass Mirror, on laid with a (cabochon in enamel). The brass decorated with grape vines and two dragons. of a panther on bronze and marble base. 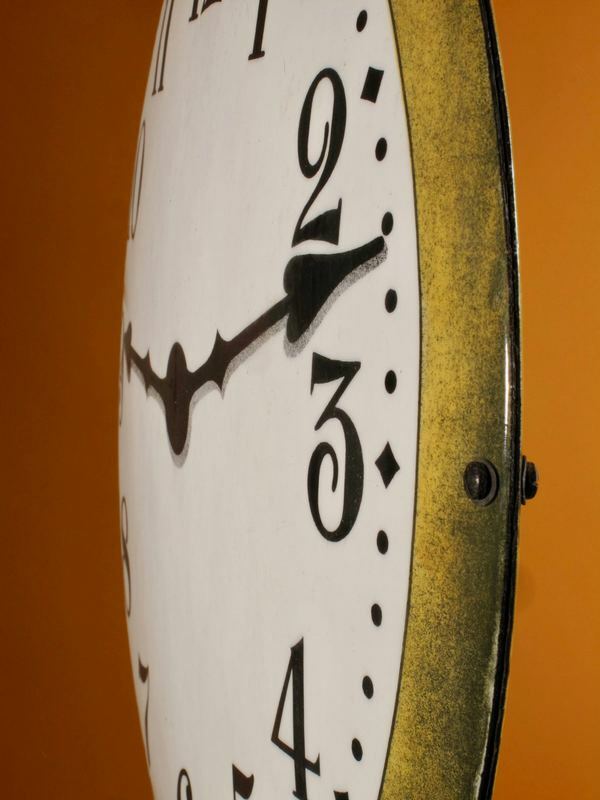 Rare Old French Brown Colour Gild Cast iron Alarm mantel Clock. 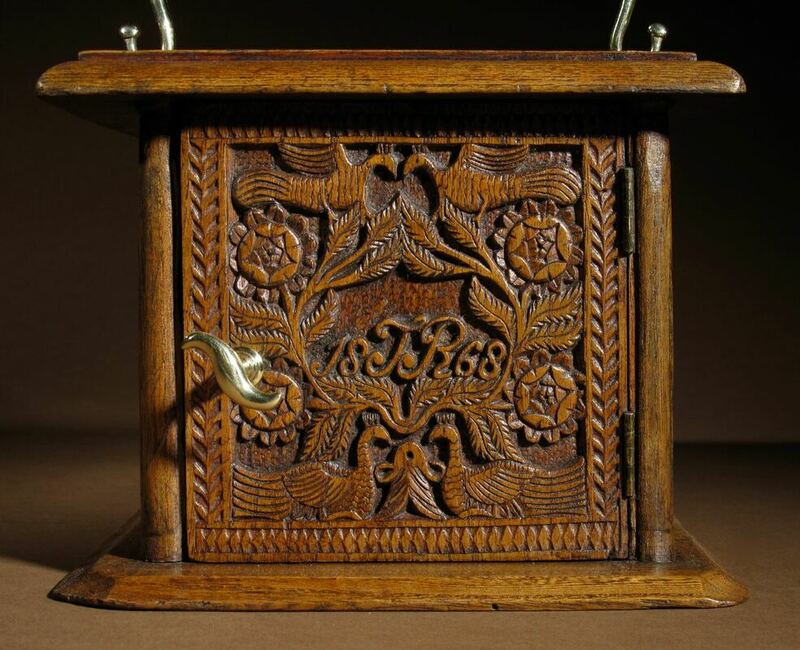 Stamped for Japy Freres, The Clock with bird in nest and birds sitting on flowers. Still with the original cleaned movement in working order, no chiming. 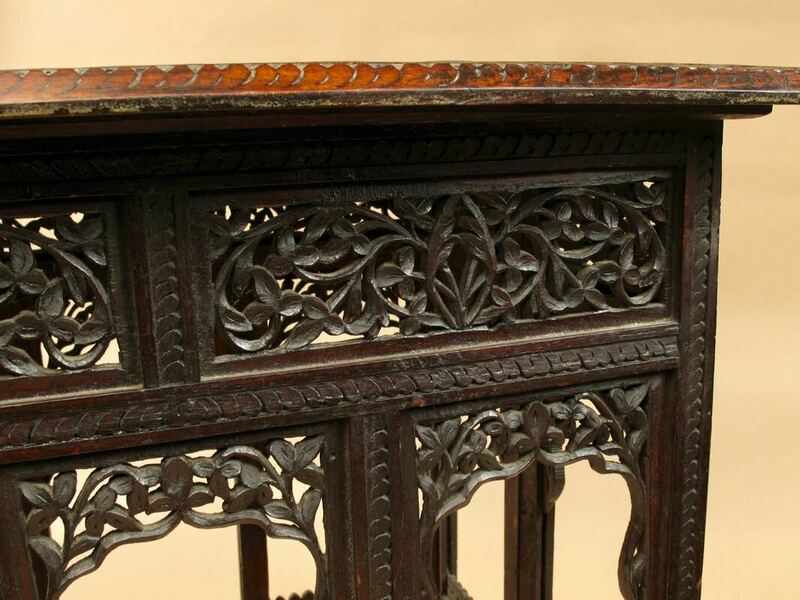 The old brown colour gilding has a beautiful old patination, no broken of or missing pieces and no cracks. 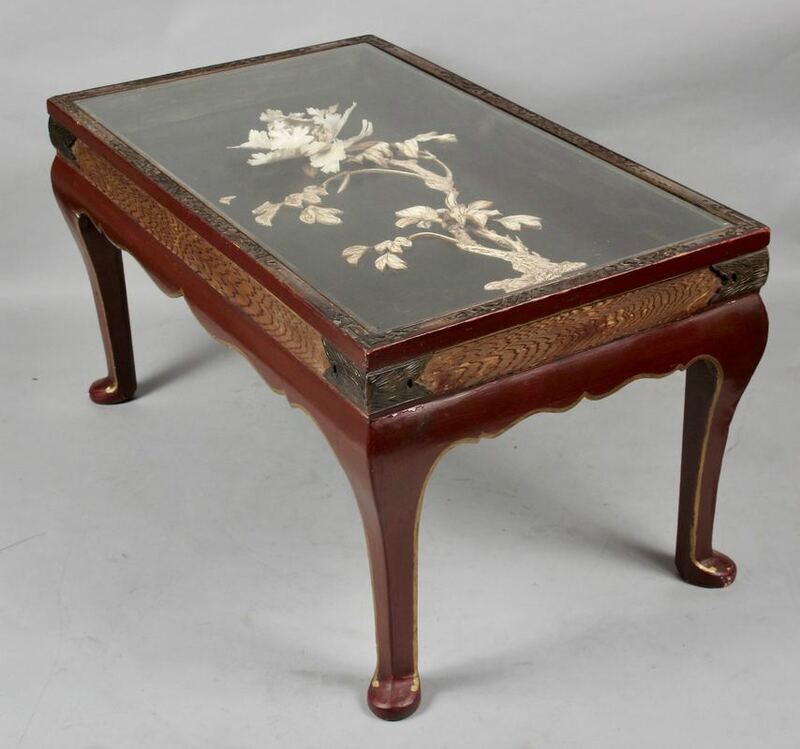 An interesting unusual lacquered oriental coffee table, with under the glass top an original Japanese lacquered pannel. 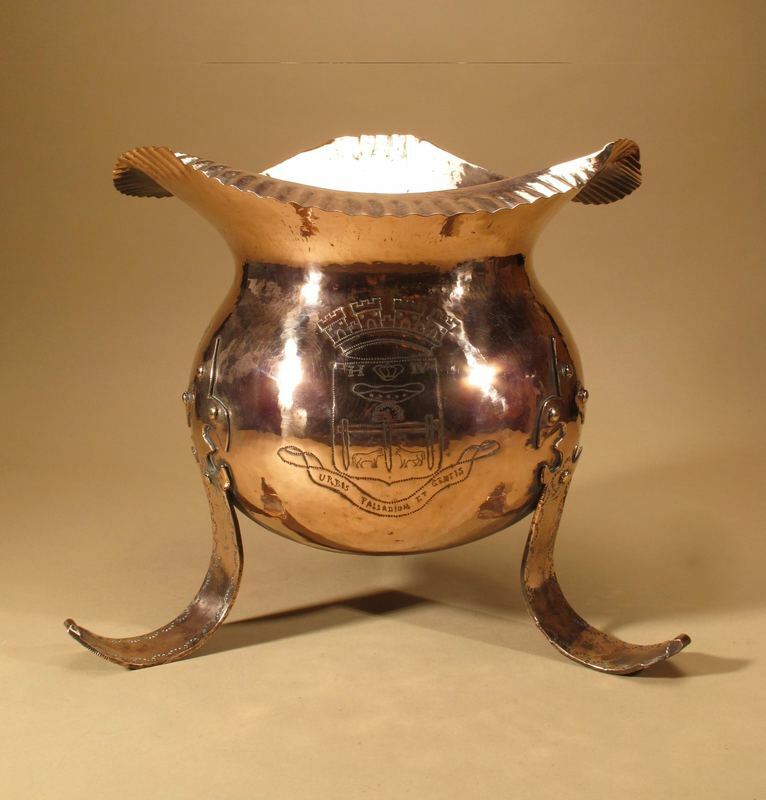 Large Copper Jardinière With Coat of Arms of Pau France. Pau is the birth place of Henry de 4, His initials are also in the coat of arms on the Jardiniere. 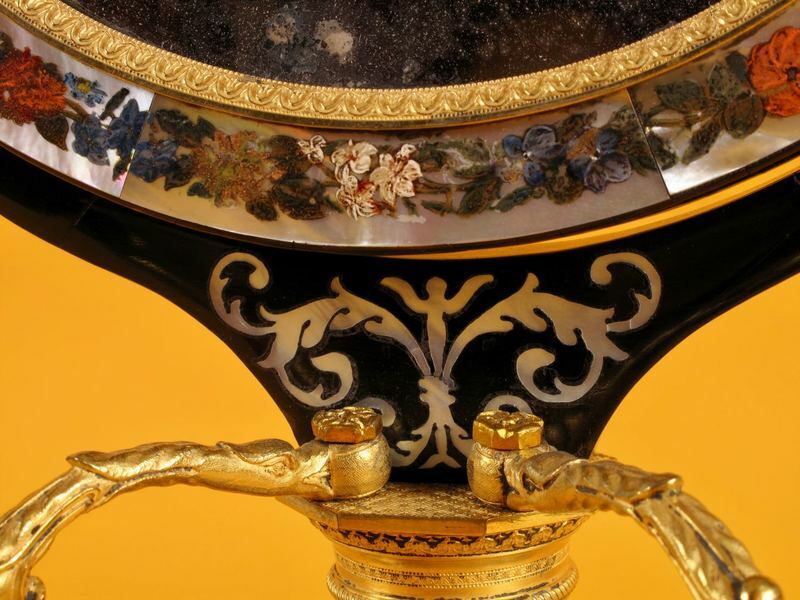 Standing on three legs, the jardiniere has punch decoration of flowers and ornaments. The copper is showing nice dovetail constructions. 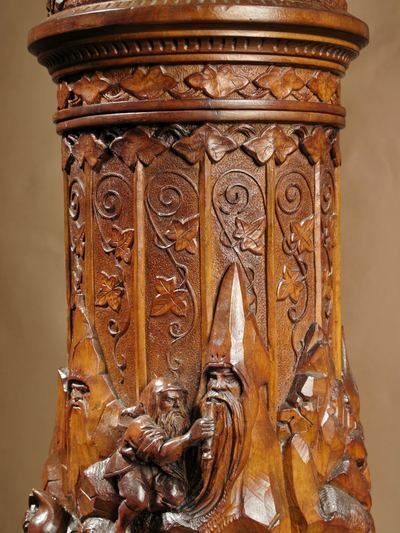 An exceptional very fine carved Lime Wood Black Forest Museum Quality Humidor / Tobacco Centre Piece Carved with 22 Gnomes,3 snakes, 3 lizards, 1 toad and 5 snails sitting on a mountain. 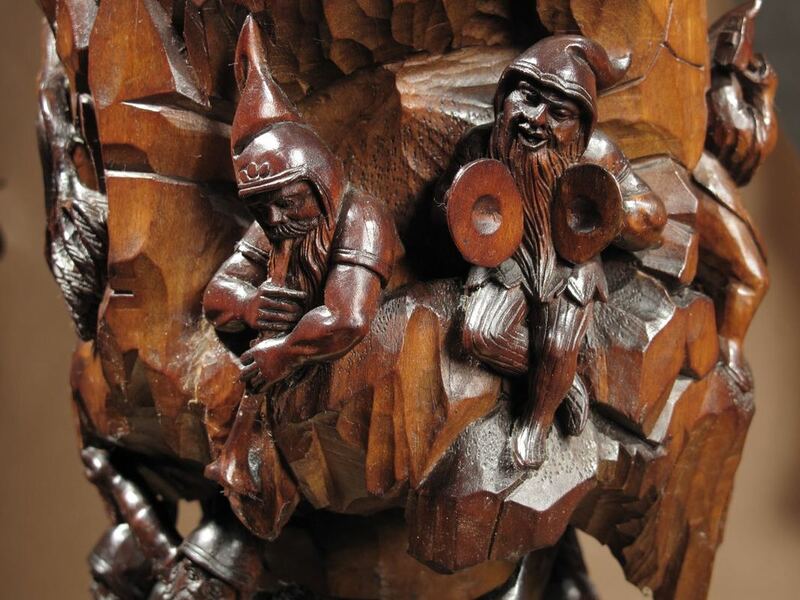 Carved with nineteen Gnomes who are drinking dancing and making music and with one other gnome with a normal model hat and two mountain top carved with faces, one of them is drinking out of a wine glass offered by a gnome. 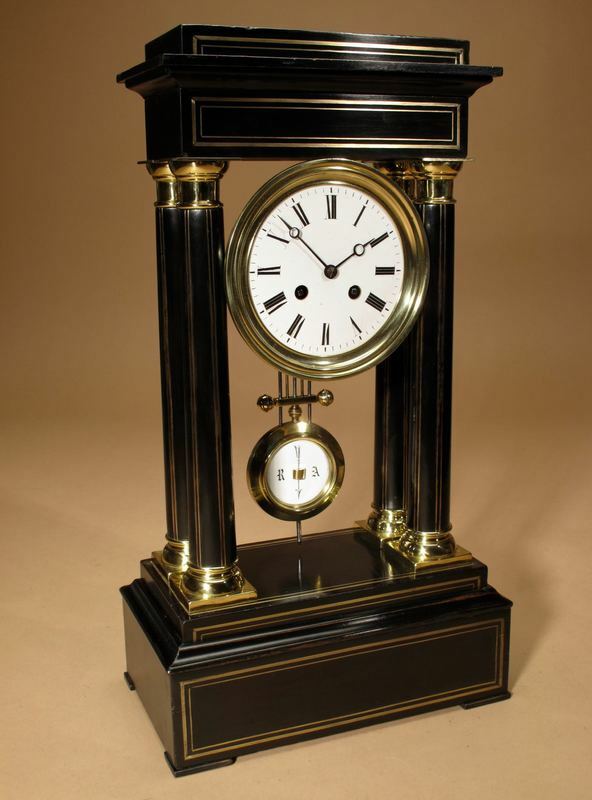 Ebony and Ebonised with Brass Inlaid French Portico Clock. Original Movement in working order and fully cleaned, stamped Japy and retailers stamp from Paris. 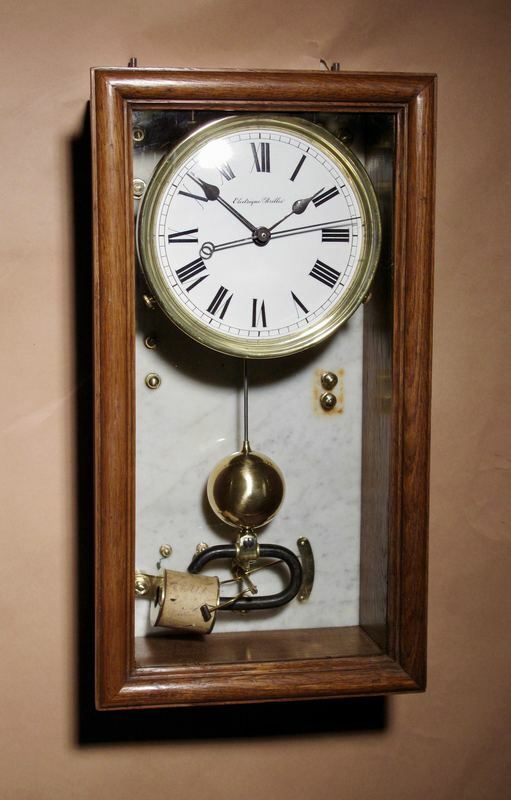 Chiming every half hour, still with the original pendulum and brass mounts. The base, collum and top inlaid with brass linings. 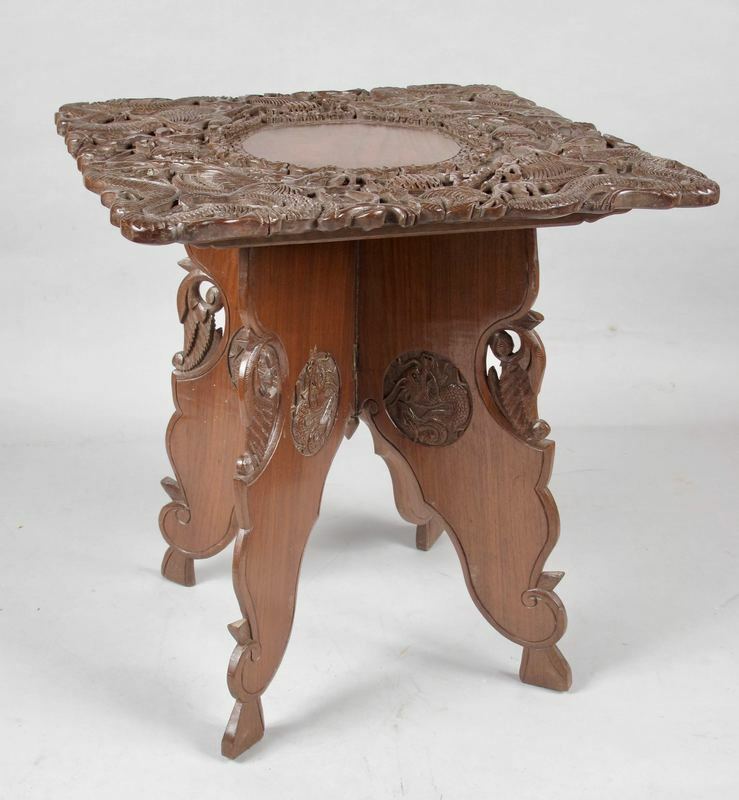 A very decorative and beautiful inlaid Kidney Shaped Table. 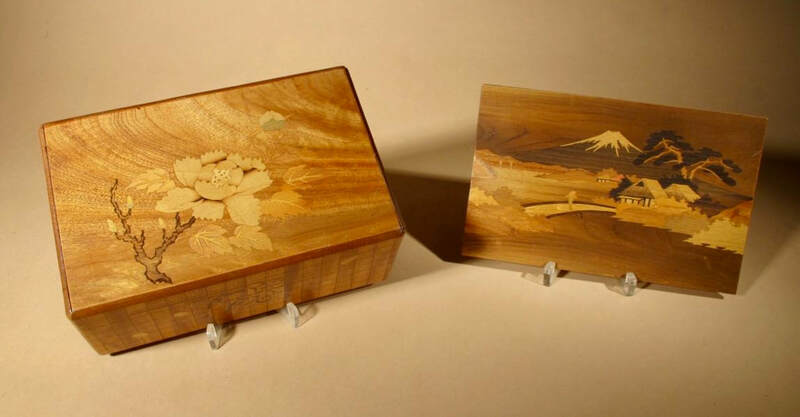 Inlaid with different kinds of wood. in very good original used condition, and with beautiful original old patination, not cracked or restored. 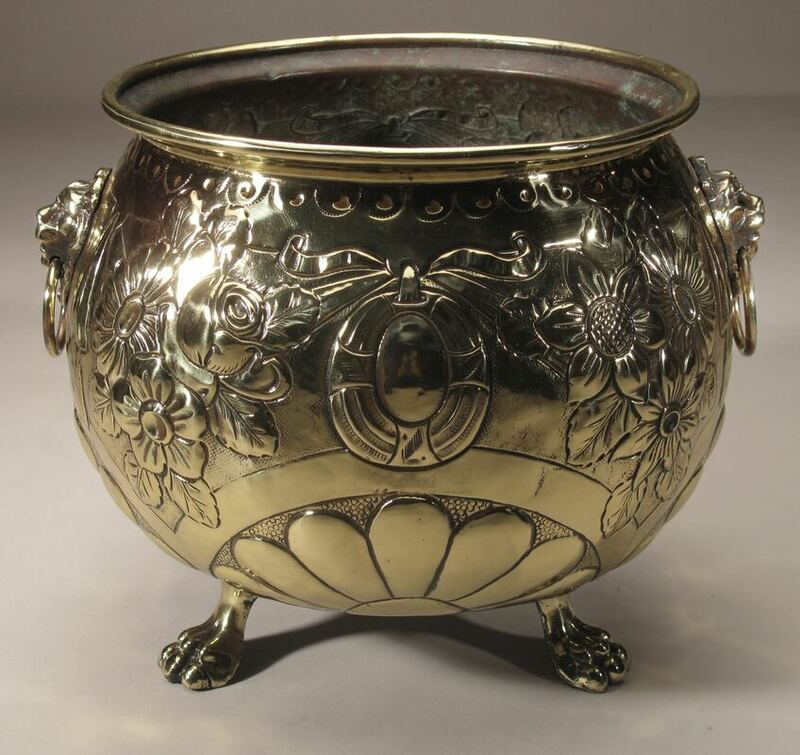 Oval Brass Embossed Jardiniere / Wine cooler on claw feet with lion heads. Also with the original liner inside. 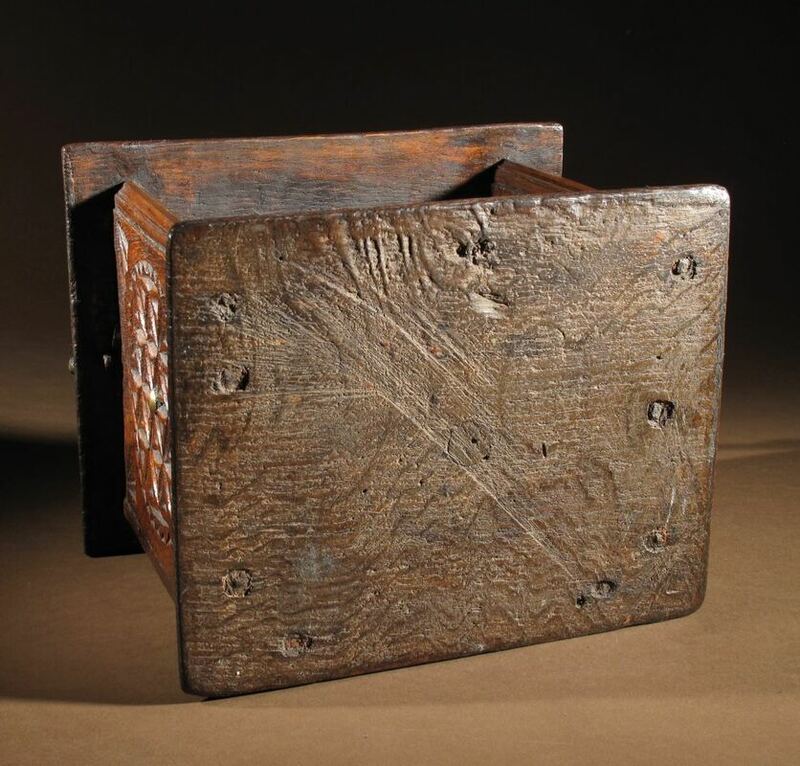 27cm deep, 43cm wide, 19cm high. 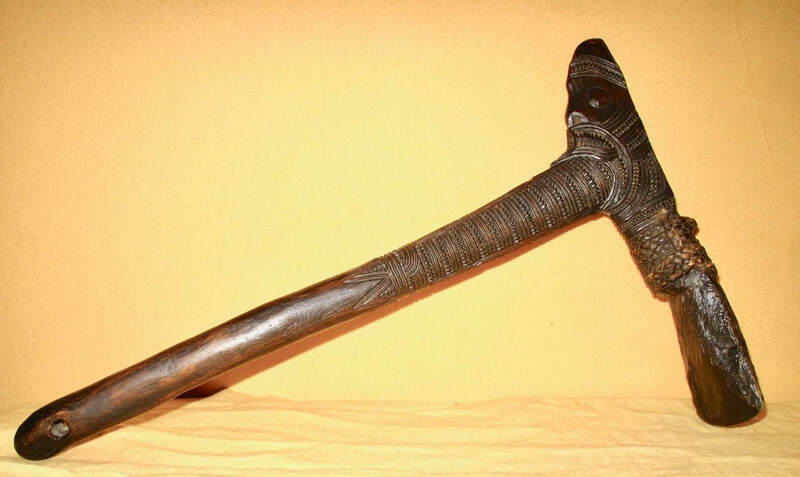 A finely carved wooden Maori Toki with hard stone (axe). 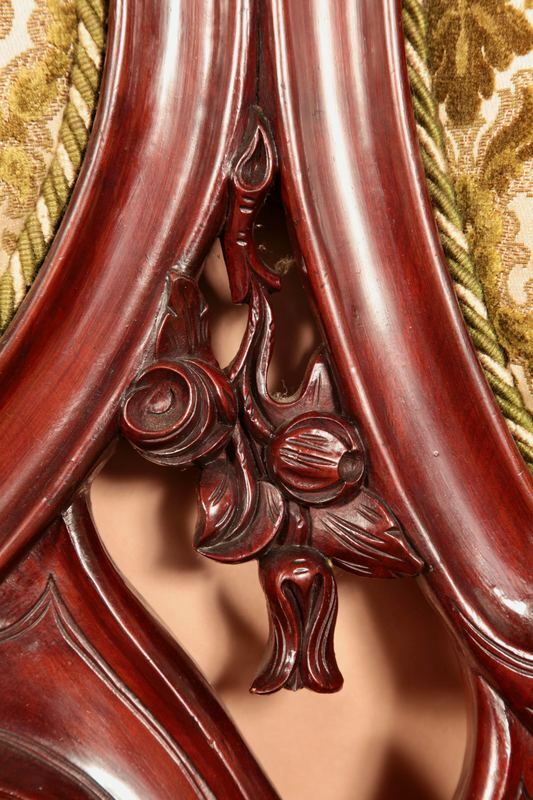 The handle wonderfully carved showing a face with open mouth the handle is the tongue of the face. 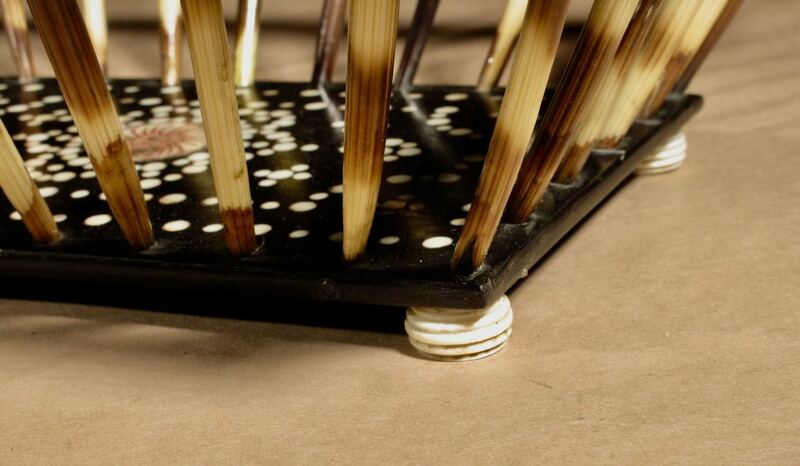 The hard stone is fixed to the wooden handle with woven rope. 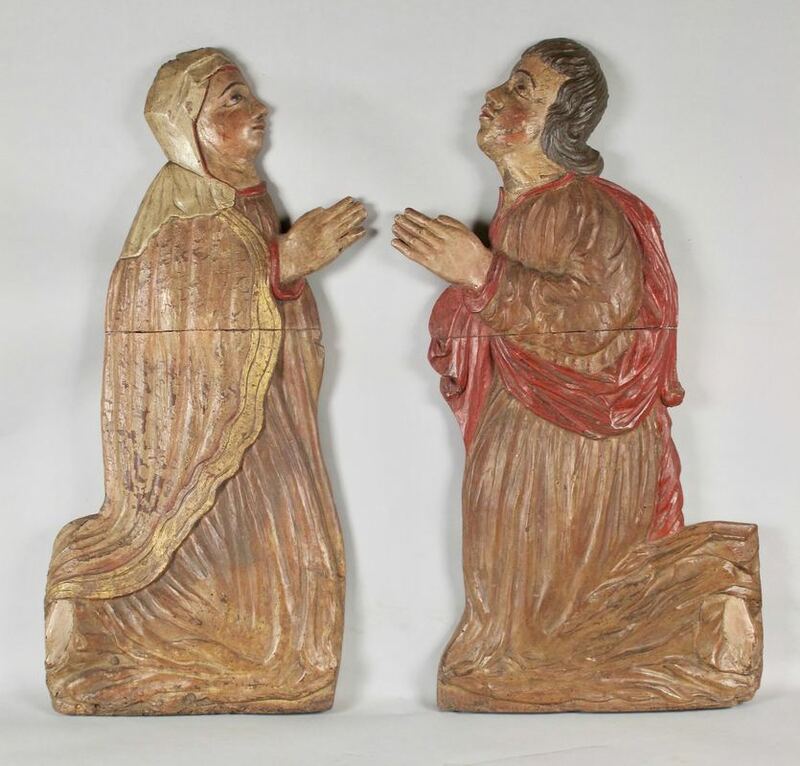 in very good original condition with wonderful old patination. 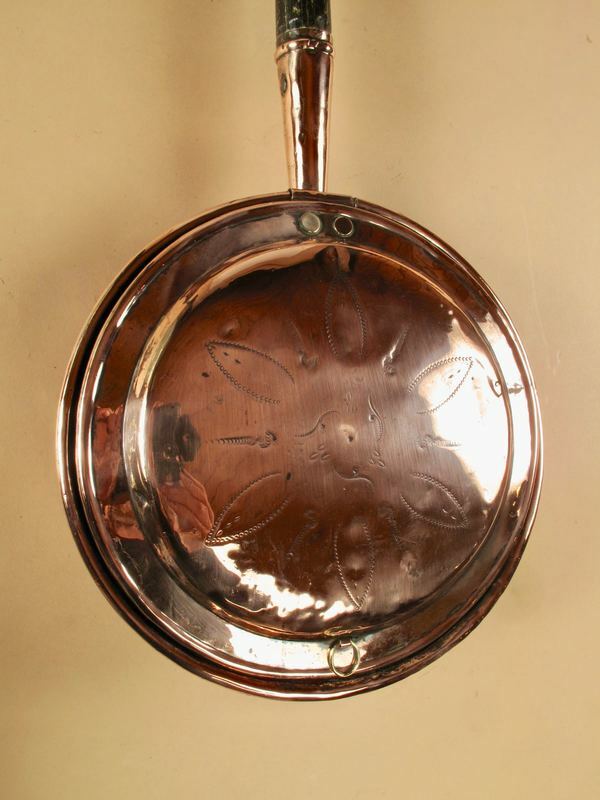 Very decorative Copper and Wood Bedwarming pan English 19th century. The lid with some flower decoration and wooden original handle. 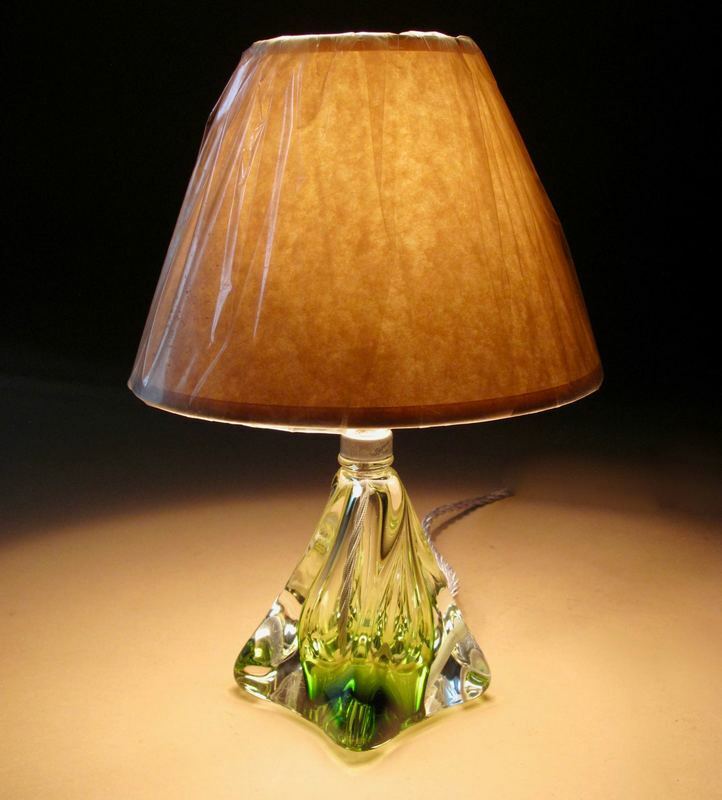 ​and Clear Twisted Glass Table Lamp. 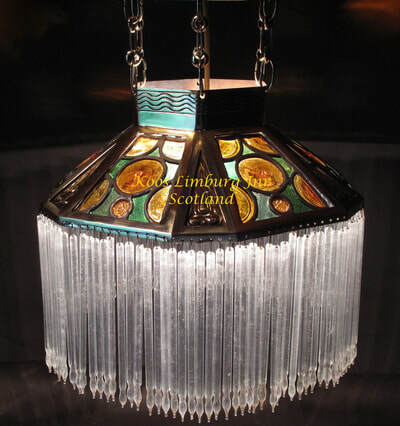 The twisted clear glass base with dark and light green centre. ​in very good original condition , no repairs or restorations to the glass. 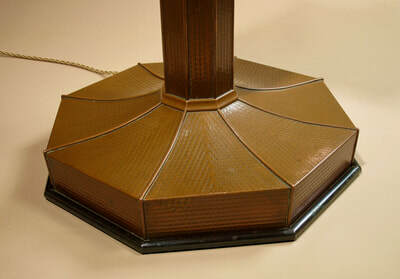 The lamp has been rewired with new old style cable. 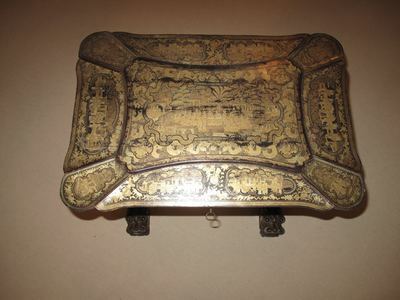 Of wonderful shape , the embossed brass is decorated with flowers and fruit. 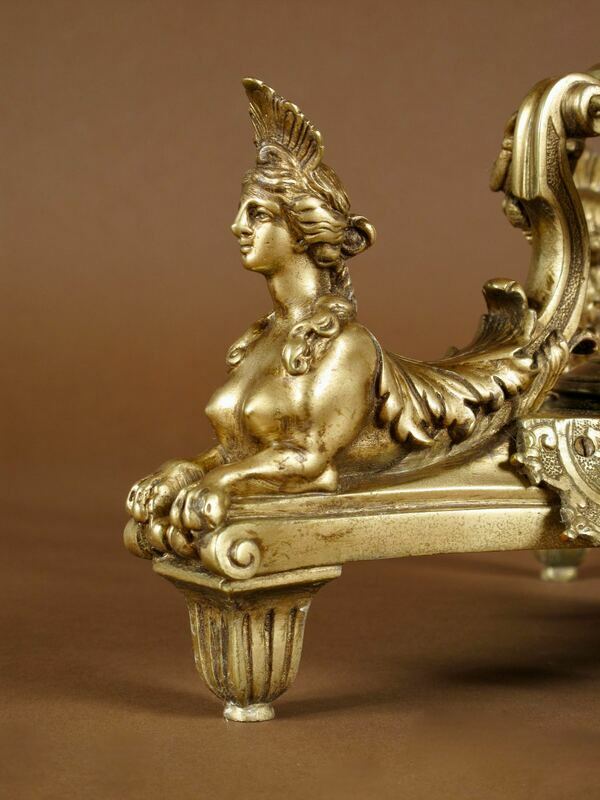 Still with the original ormolu. 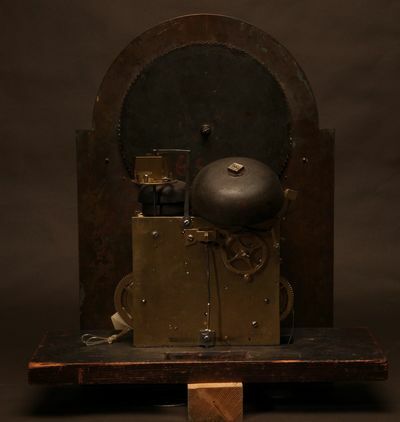 The dial and movement signed: J.F. Bourgeois a Paris. 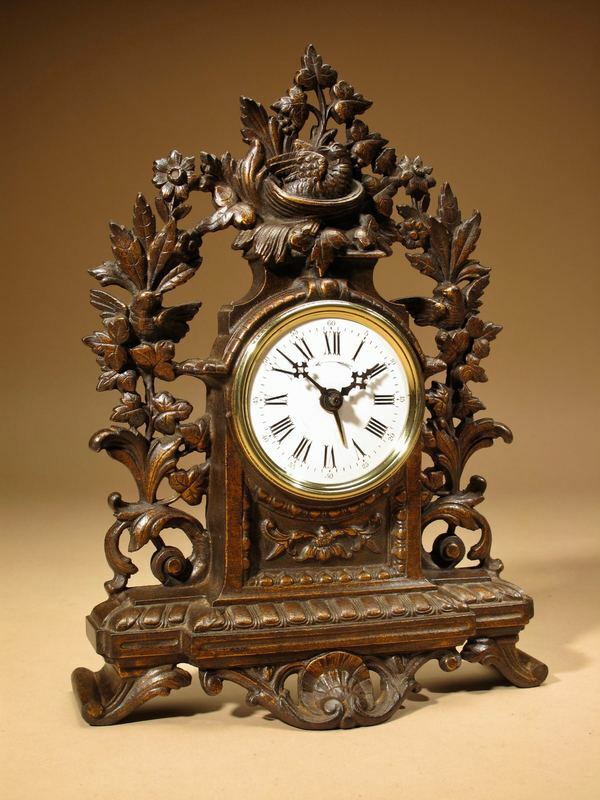 French, the clock dates from circa: 1775. 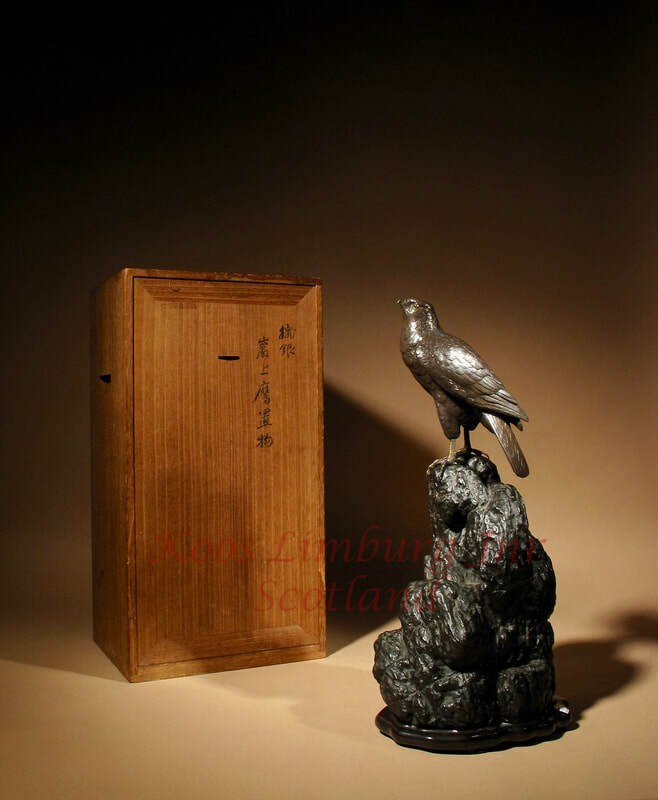 A very fine Chinese carved type of sandalwood wooden box. 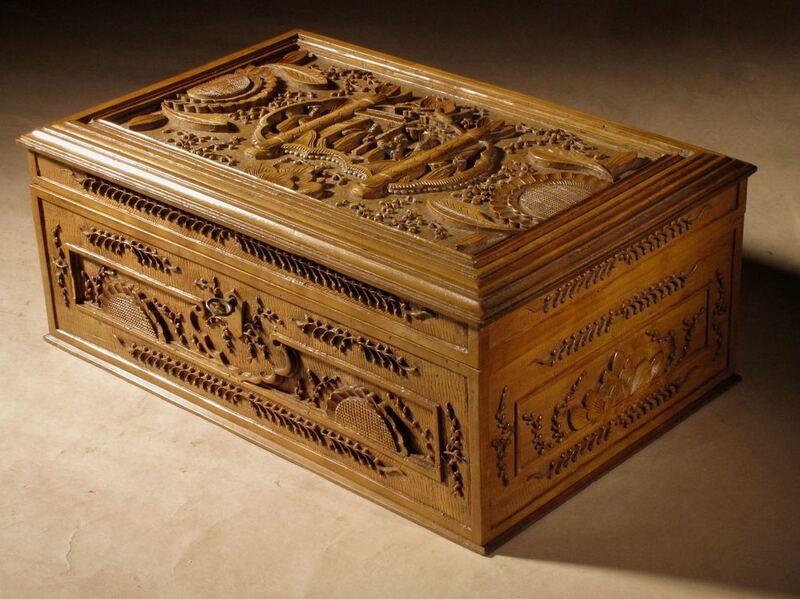 Carved with extremely fine branches and leaves also 5 figures in front of a house in a garden on top of the lid. Moroccan, Marrakesh or Fez Brass Kettle on Original Brass Copper and Bronze High Stand. 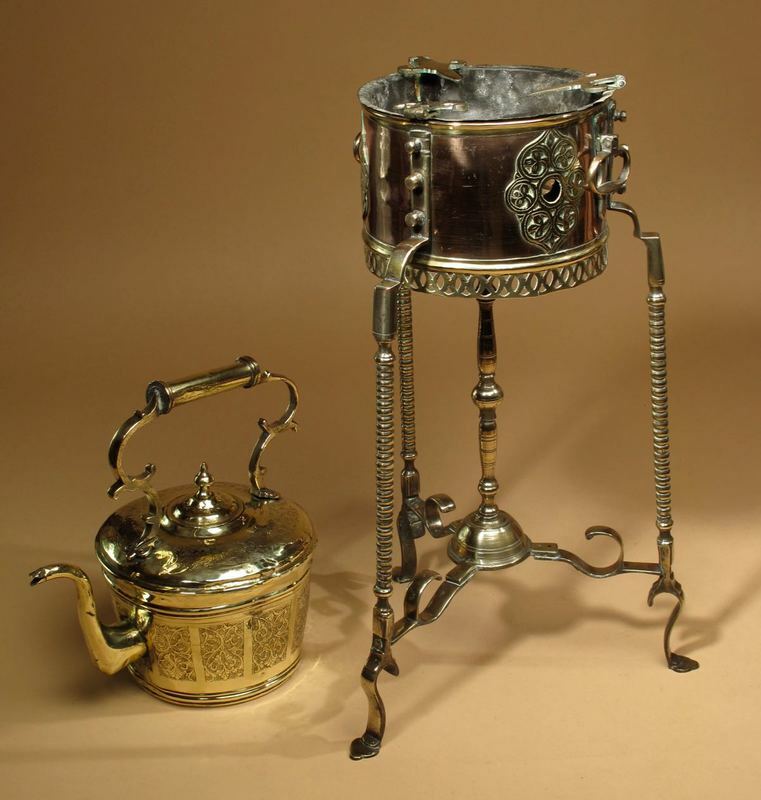 Still with its original charcoal burner. 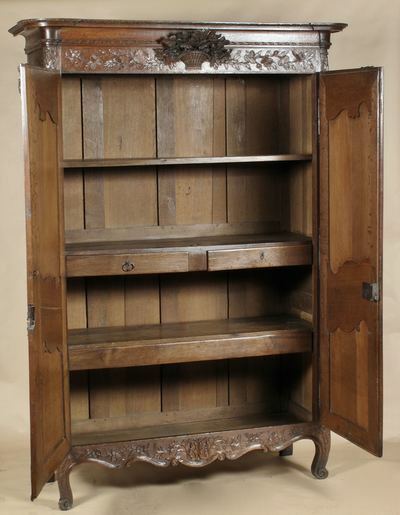 A very useful armoire with a lot of storage space. 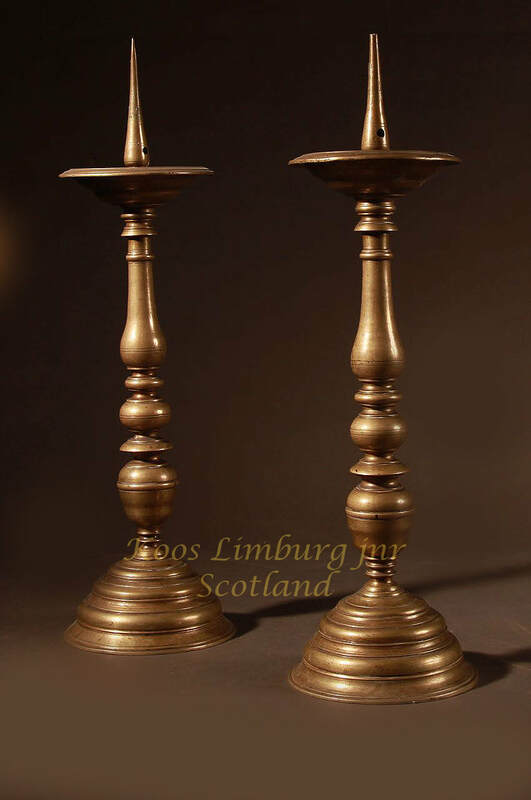 A Real pair of original Netherlandish/German bronze candlesticks. 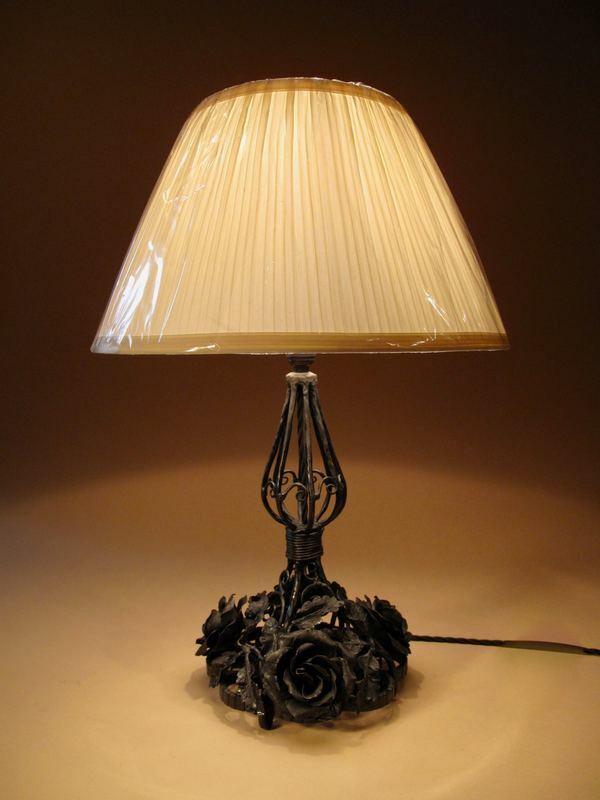 Design Wrought Iron Amusing and functional Tete a Tete Standard Lamp. 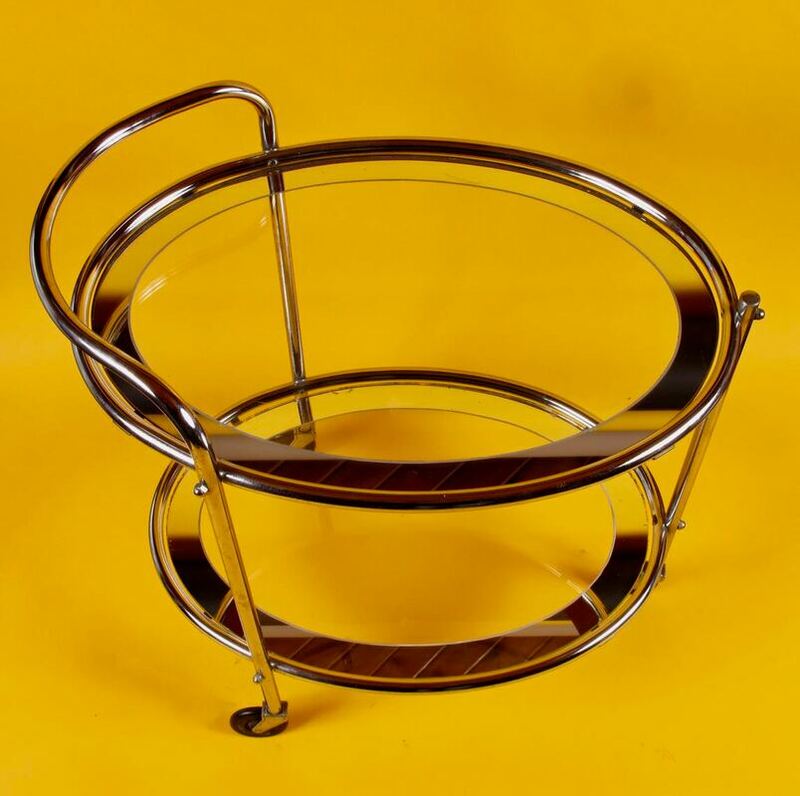 With stands for wine bottle and wine glasses. 177cm high till top of shade. With unusual very fine carving. The same coat of arms is also painted on the moon dial. The three train unusual movement also has quarter chiming. The finely engraved dial with the signature also has a large central seconds hand and the original finely painted moon disk with the coat of arms. The clock has three weights. 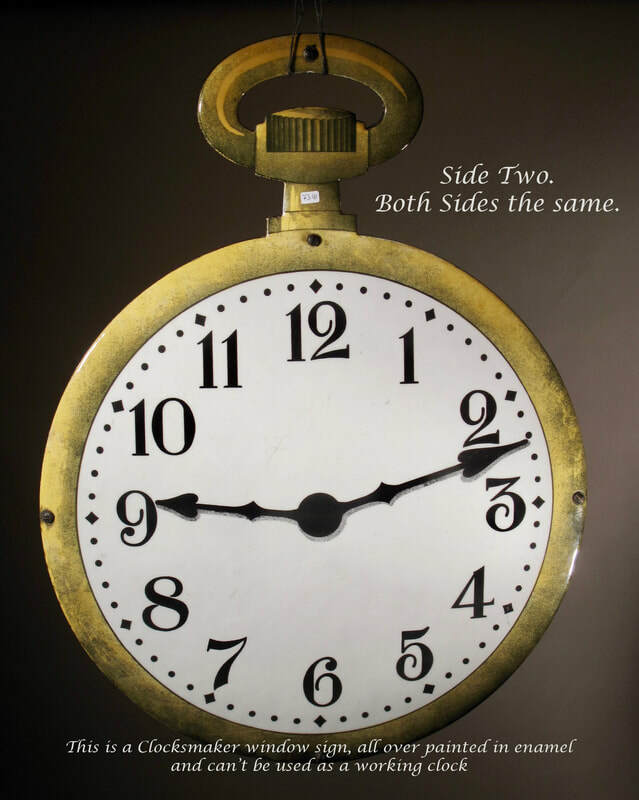 which you also find on our clock. 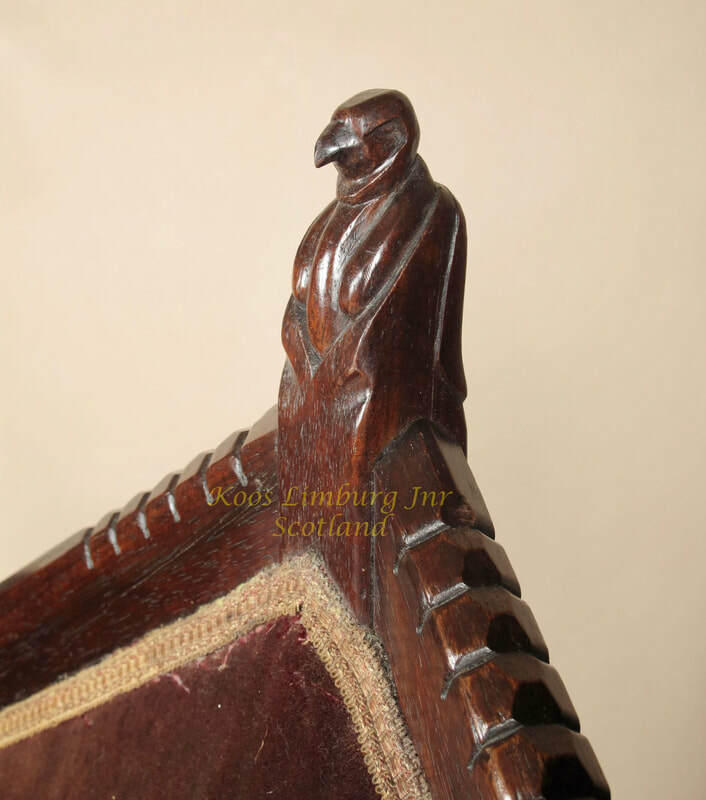 The contents of the Guild Hall of the Joiners and Ceilers was sold on auction in circa: 1799. Illuminated on three places, with original movement in working order. 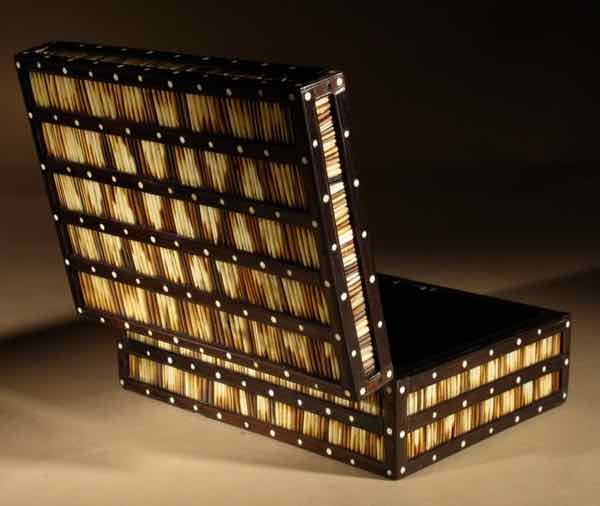 To illuminate you can use a flat battery in the special made compartment in the base or a 4,5 volt transformer. You can set the weather settings on the chimney with the original gut string. 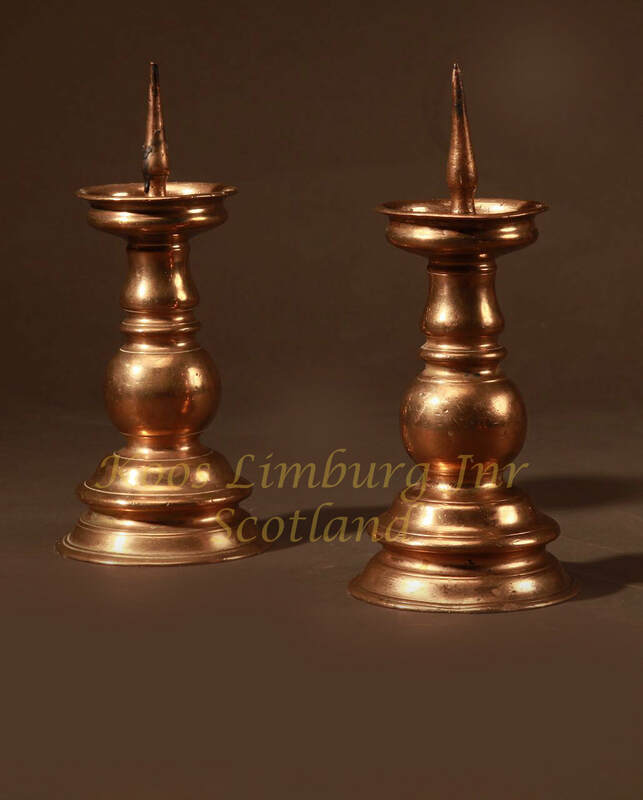 A real pair of original Nurnberg bronze candlesticks. 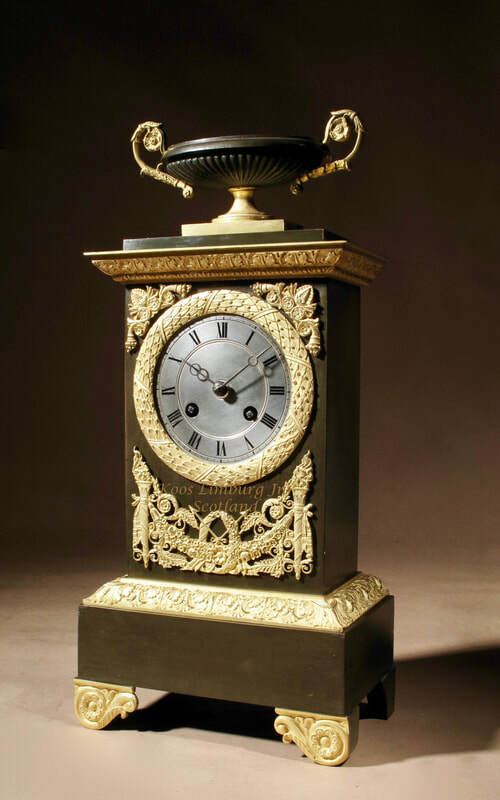 An Unusual Very Decorative French Marble and Gilded Brass Mantel Clock With Painted Scottish Thistles. 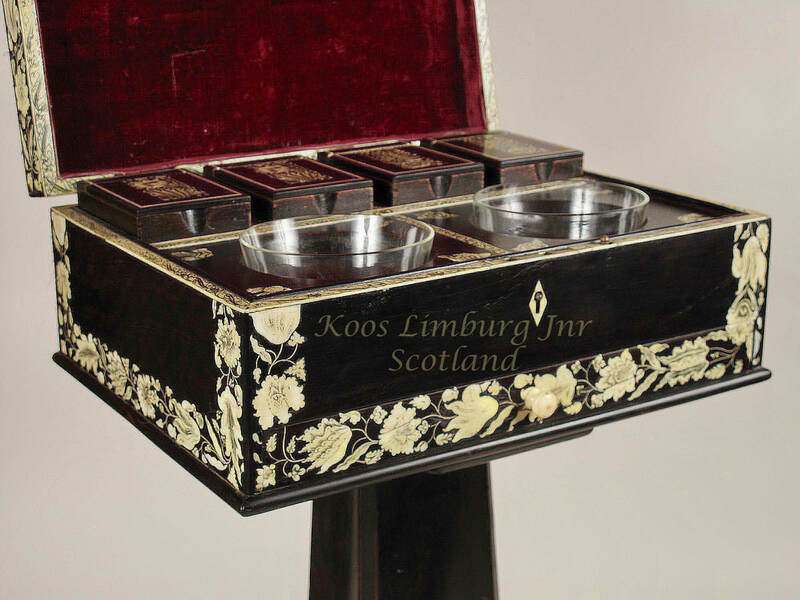 Unusual is to see that the original enamel dial is decorated with Scottish Thistles. 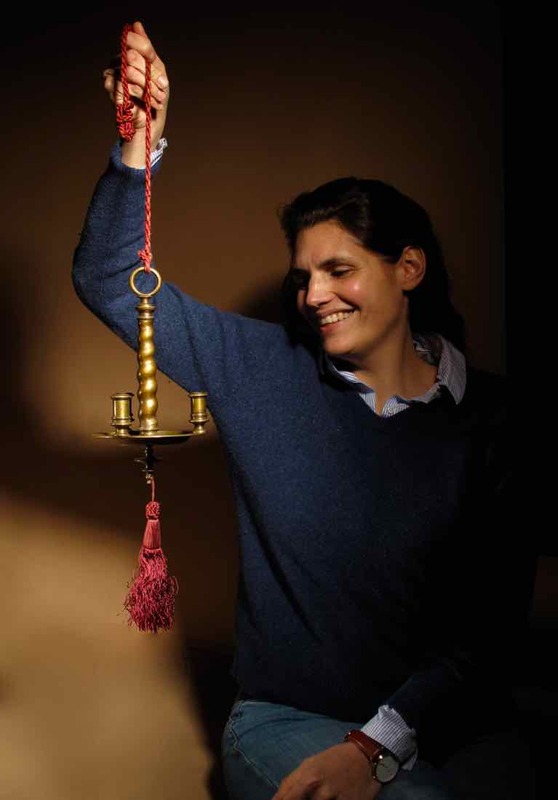 Still with the original pendulum. Chiming the full and half hour on a bell. 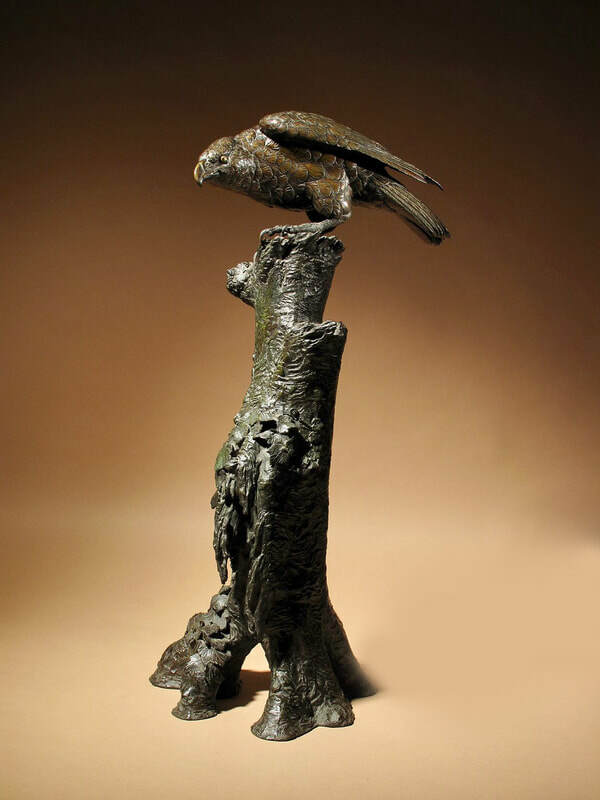 Still with the original honey colour patination. Still with the original zinc liner. 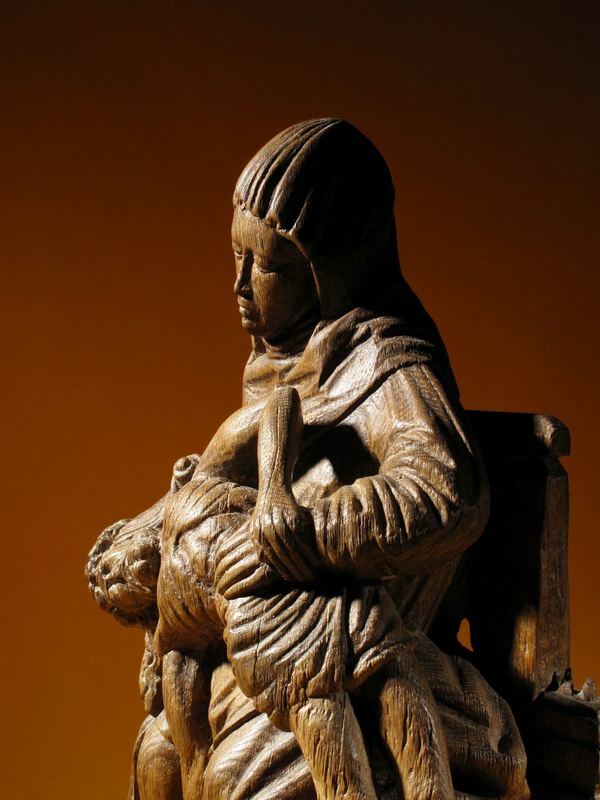 An expressive and very impressive beautiful Medieval Gothic carved oak Pieta sculpture. 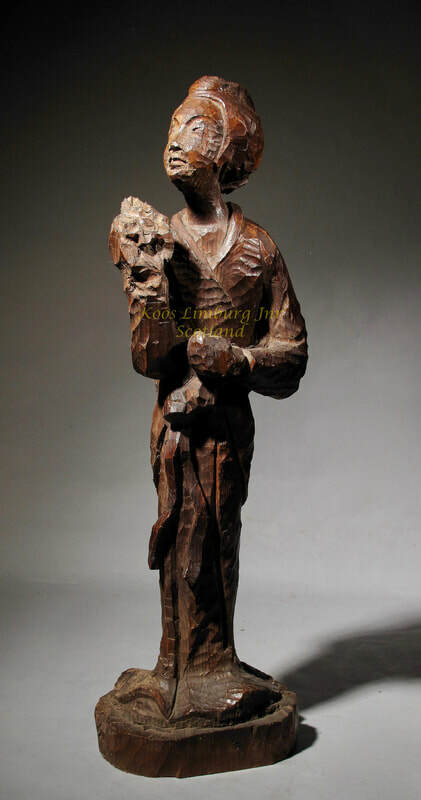 on the other side a finally carved monk. With very fine carved details allover. 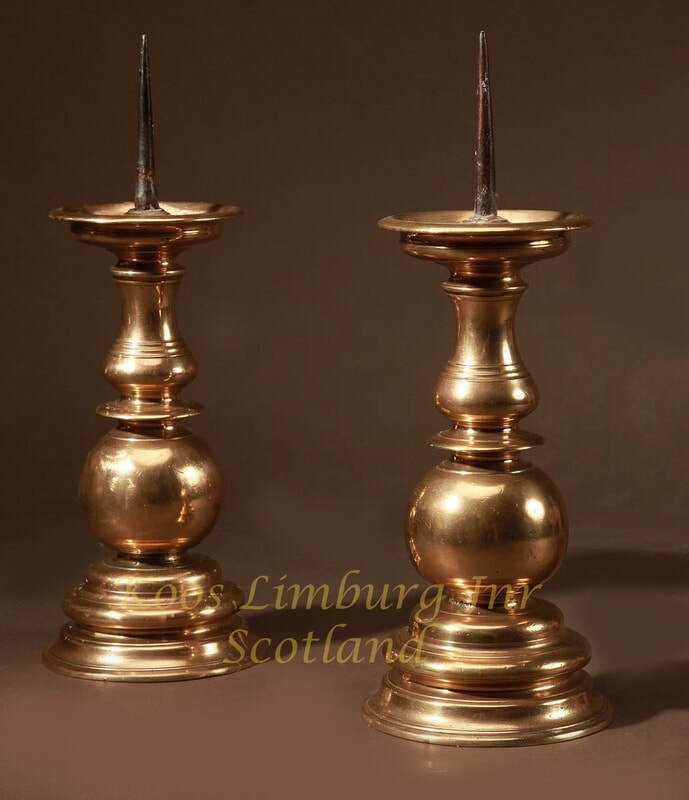 : A real pair of original Nurnberg brass candlesticks. 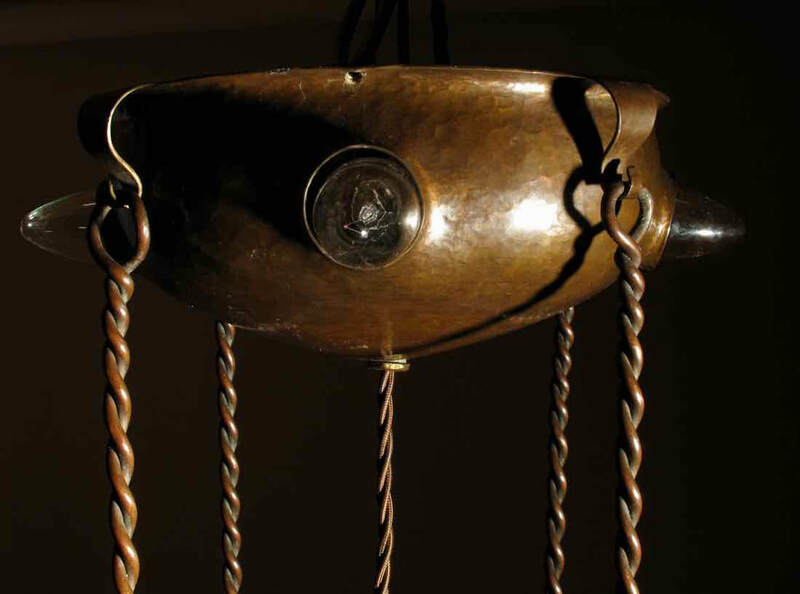 With original fully cleaned and tuned movement and original pendulum in working order, striking on a bell every half hour, running for a week. 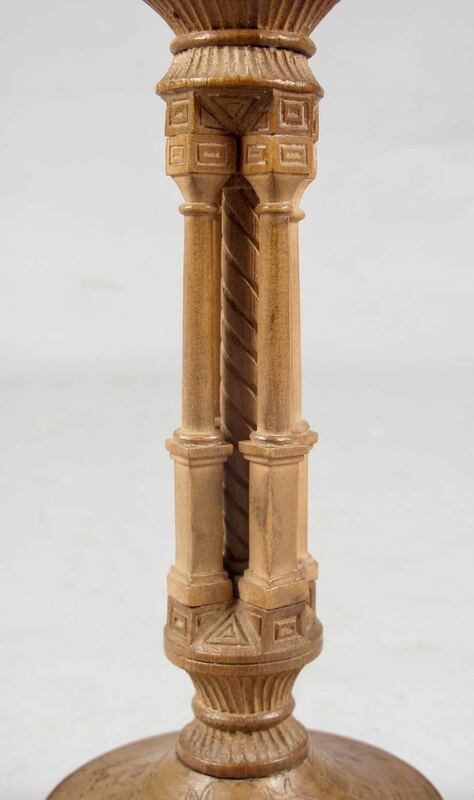 It is unusual to find a twisted portico clock with original light brown columns, normally you find black twisted columns. 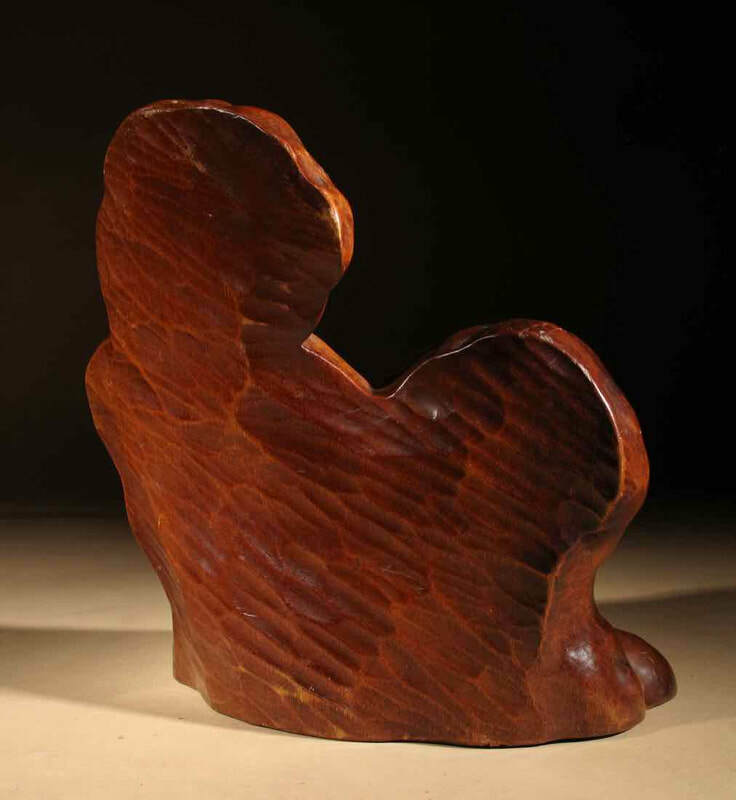 47cm high 25cm wide 14cm deep. 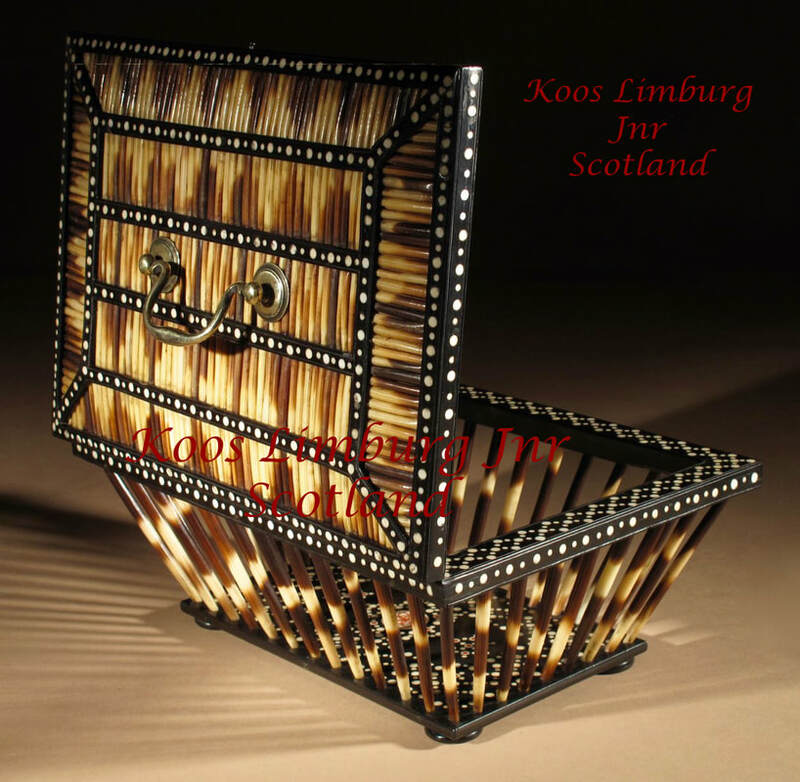 Anglo Indian Porcupine Quill Work/Knitting Ebony Inlaid Basket. ​In very good, straight and strong condition. 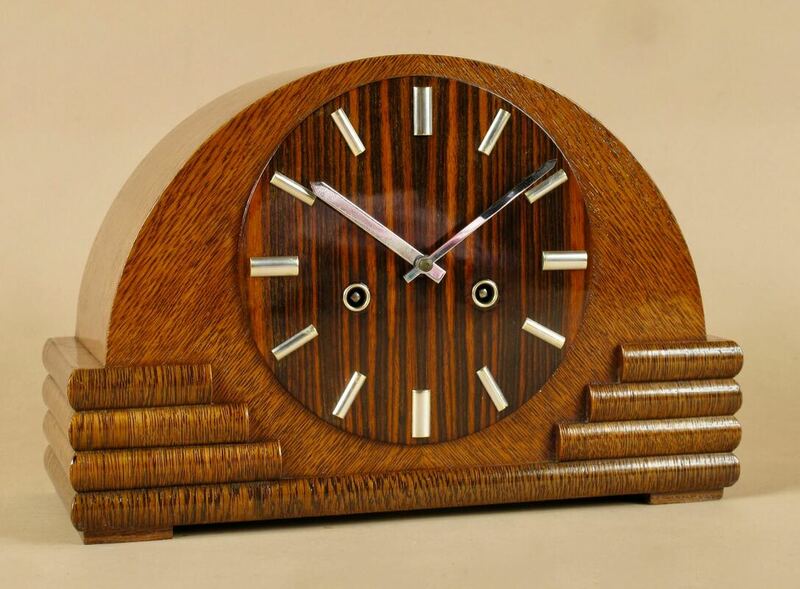 A very stylish Signed French Art Deco Bulle Electrical Macassar Ebony and Lemon Wood Mantel Clock. The original dial, hands and original movement numbered for the year 1928, in working order and cleaned. 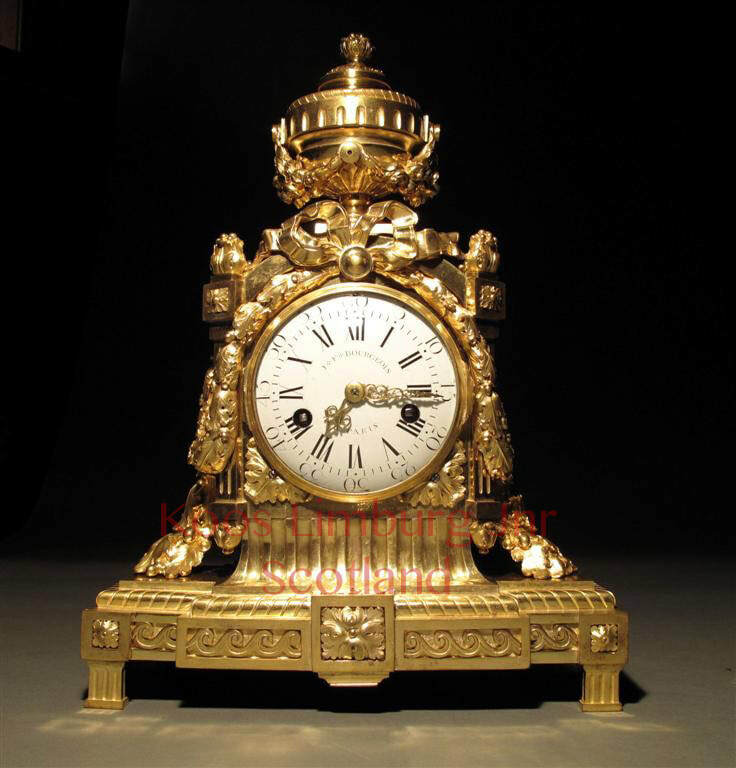 A very decorative and original French " Le grand Tour" Gilded Patinated Bronze Mantel Clock / Pendule. With original beautiful old patination. 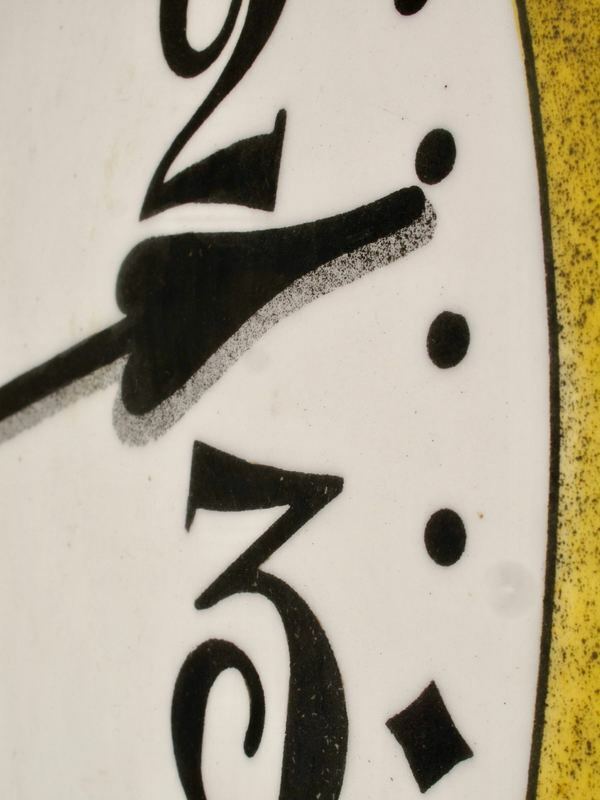 A very decorative original Black forest reverse Painted Glass ( Verre Eglomise) Dial Wall Clock. 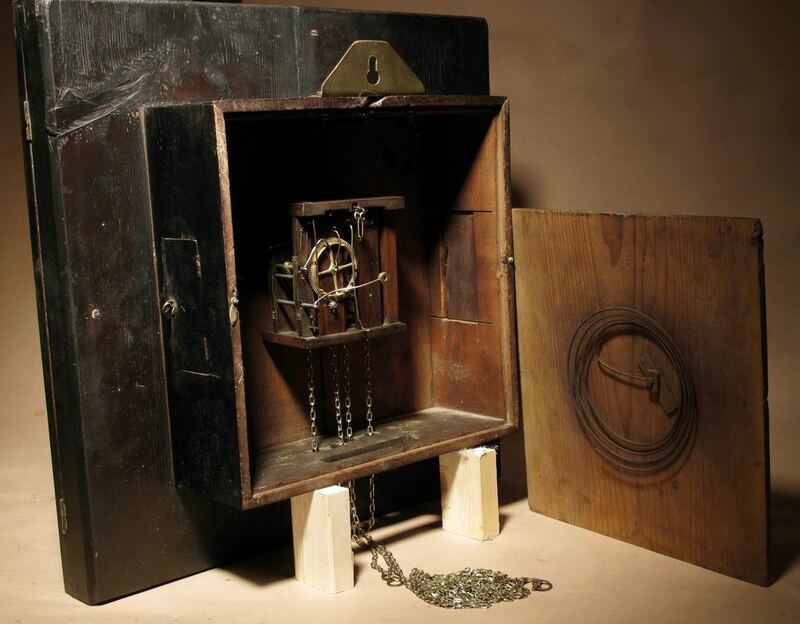 Still with the original gold dial surrounding, original black forest wooden plated movement, pendulum and weights, in working order. Striking the full and half hours on the original coil. 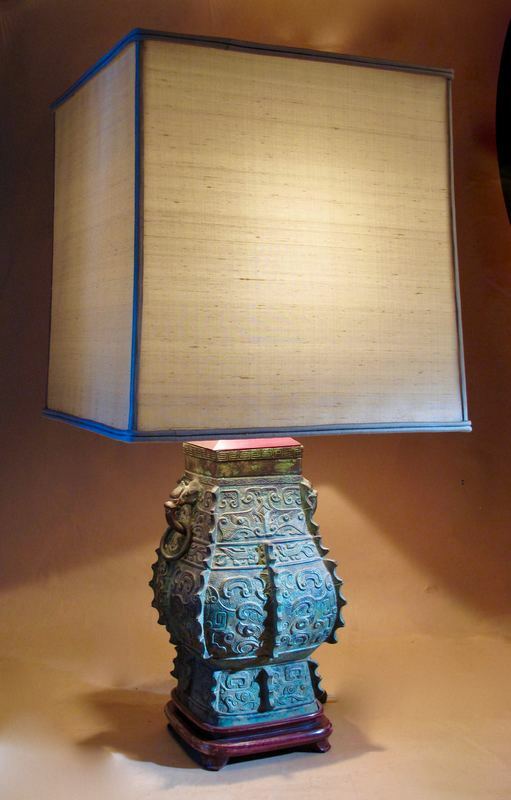 A decorative Champleve Japanese bronze vase now fitted as a table lamp. 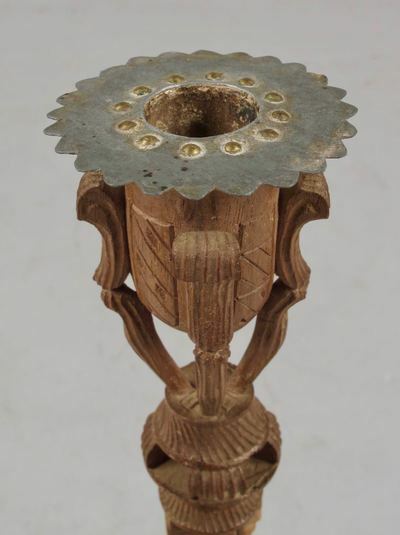 The bronze vase is decorated with the champlevé technic with inlayed coloured enamel on wooden base. The new light green shade wrapped in plastic. 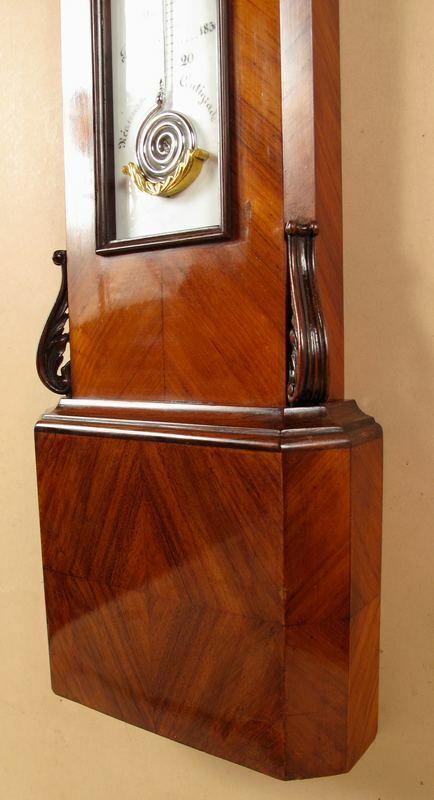 A George 3 (1738-1820) very decorative and original Scottish oak longcase clock. 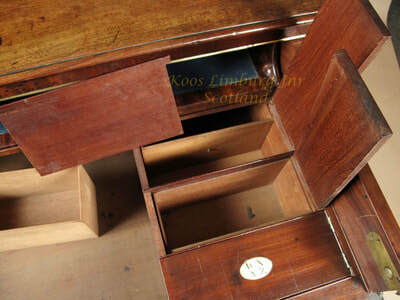 In very good condition and in fully working order, movement controlled, restored and cleaned. 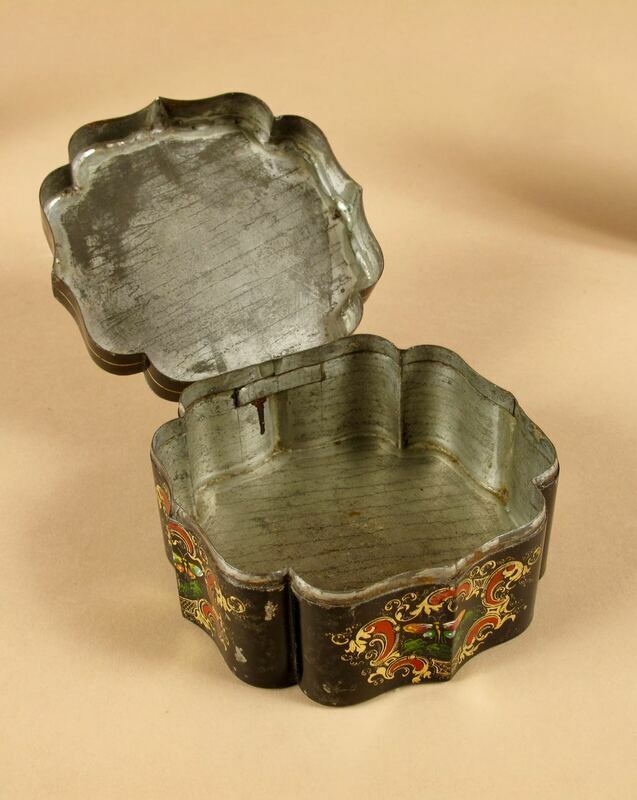 The case with beautiful old patination. It is rare for a Scottish Longcase clock to find a central date hand. The moon dial with two fixed marker hands. 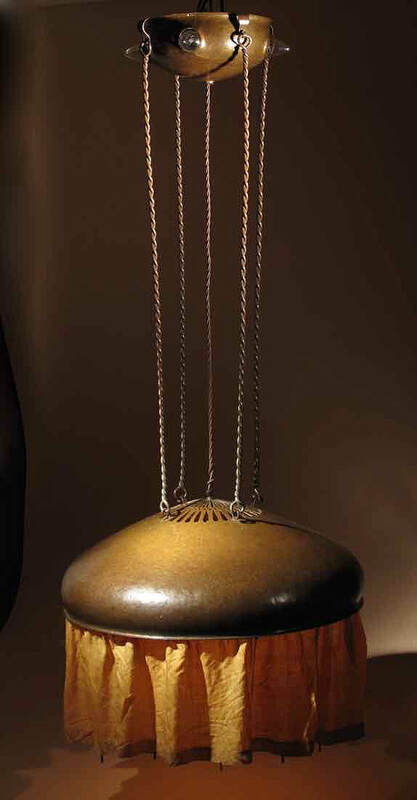 8-day movement, chimes on the hour on a bell. 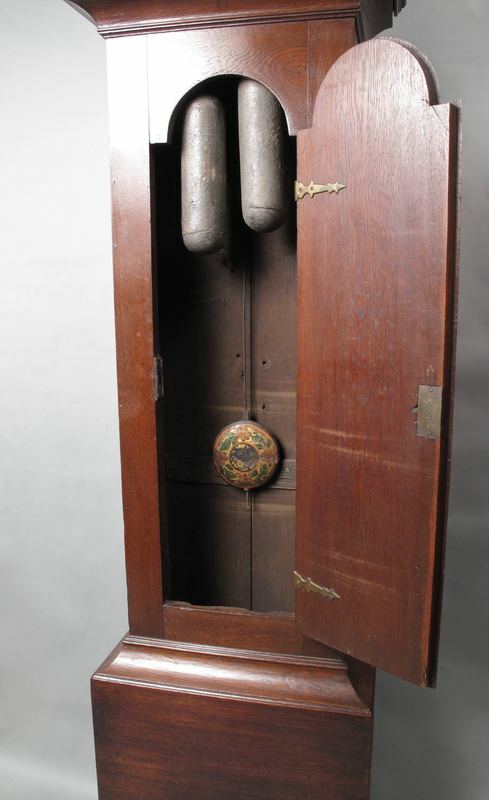 With originally painted pendulum bob, two iron weights and key. 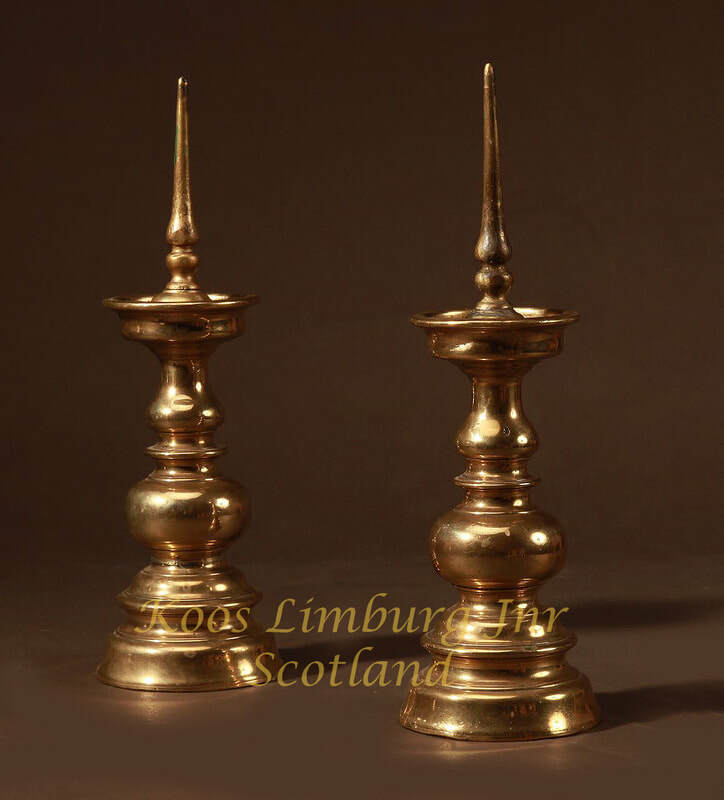 The brass finials are of a later date. 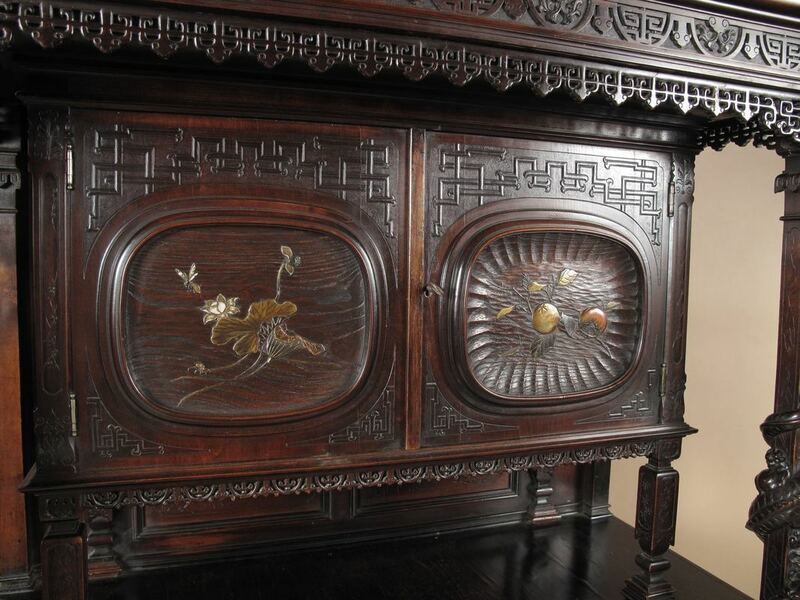 A very Large and decorative Chinese Finely engraved also with flowers Mother of pearl Butterfly in European frame. 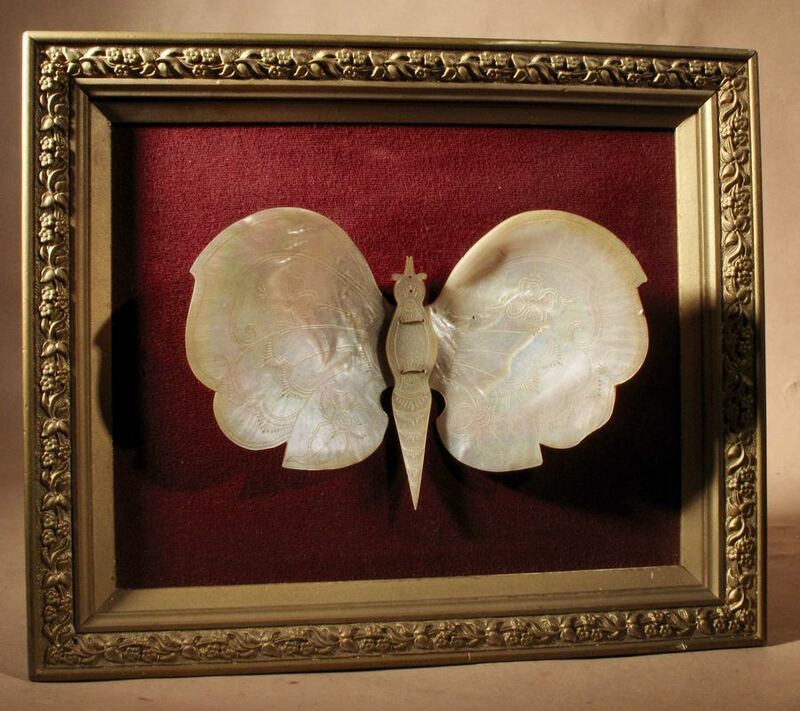 Full size butterfly from left to right 25cm 16cm high. 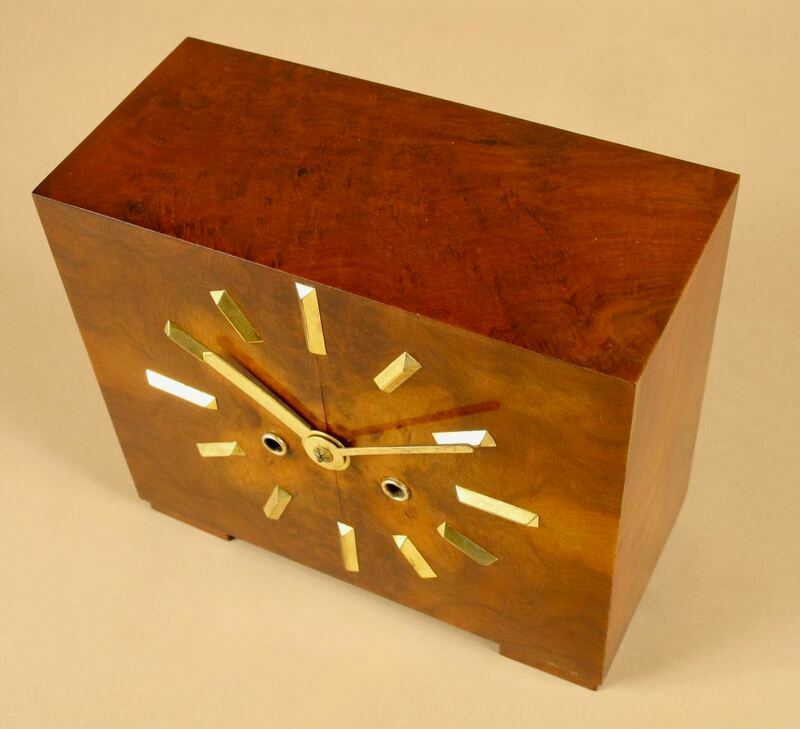 A very clean example of an electric Brillié master clock. 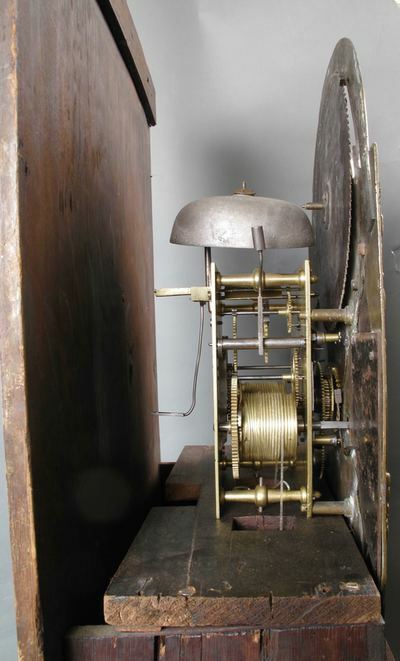 In working order, with central seconds hand. 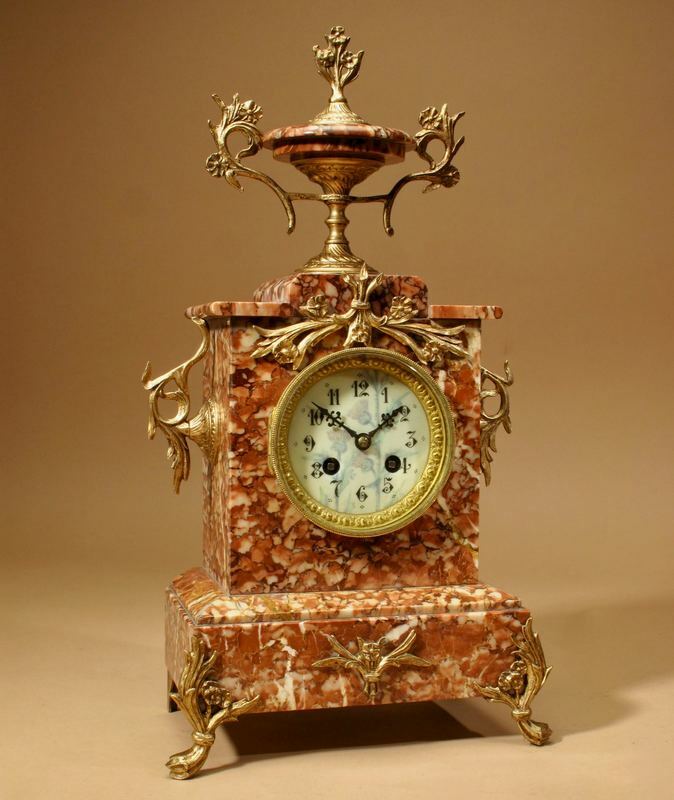 The clock is mounted on a slab of white marble (original), surrounded with its original glass oak case with nice patination. 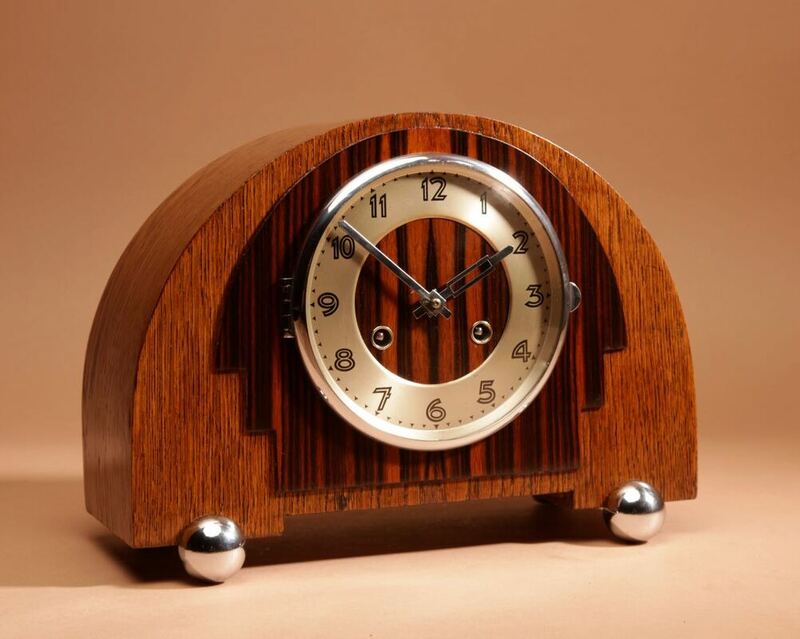 the clock is original working on 1.5volt (new) batterie and is invisible behind the dial. 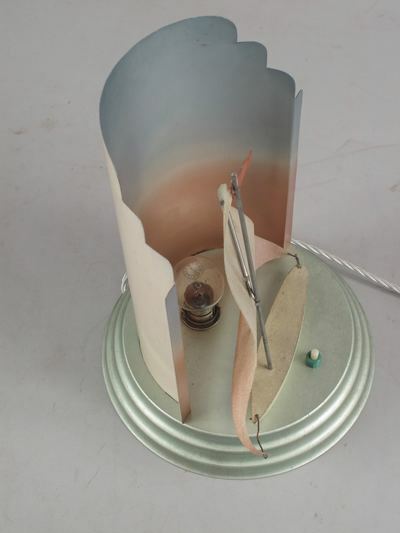 By swinging the pendulum, the magnet pendulum is going in and out of a wired wound coil, it will create an electric magnetic field. This is the (mother) master clock, with options to connected some slave clocks. 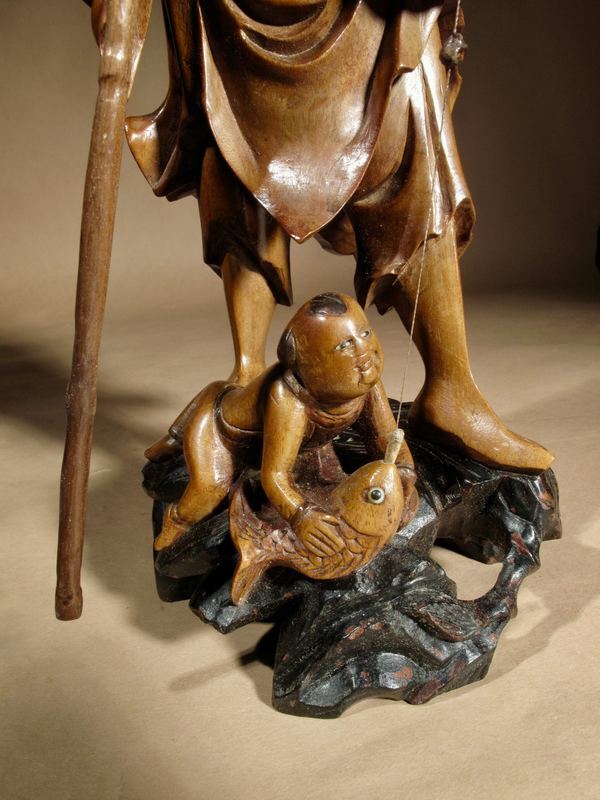 An amusing and very fine carved Chinese hardwood carving of a Fisherman and his catch. The fisherman, boy and the fish with a type of Glass eyes. 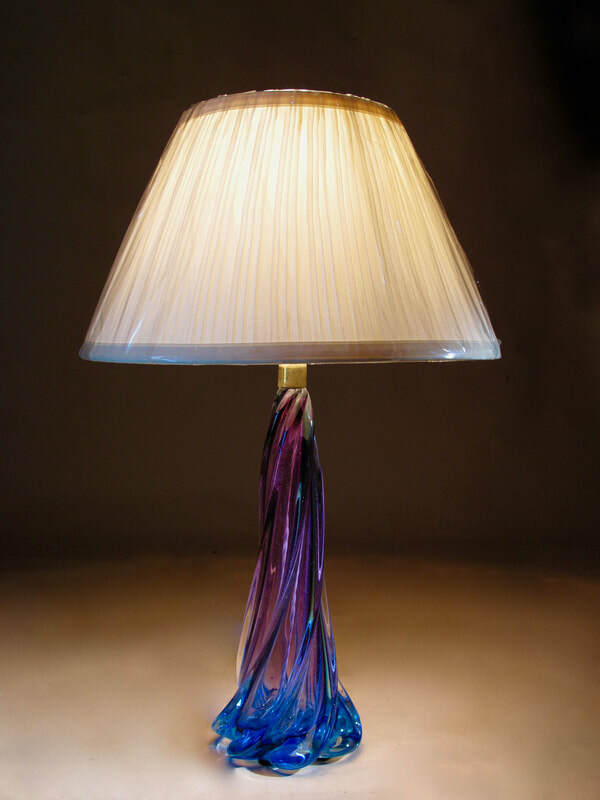 An interesting Murano glass table lamp base with Original makers Label and of beautiful deep strong colours of blue and purple. 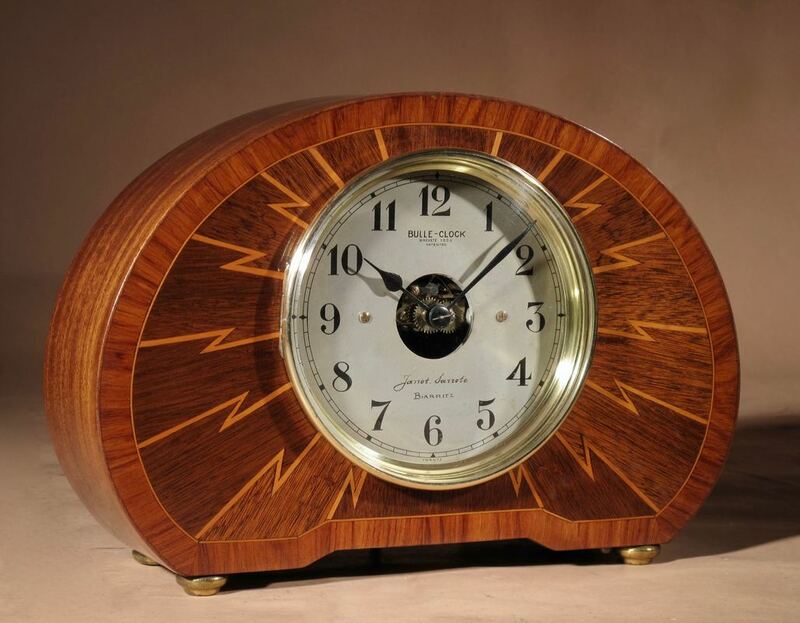 An Original French Art Deco Electrical Mantel Clock Inlaid with Rosewood Mahogany and Satin Wood. 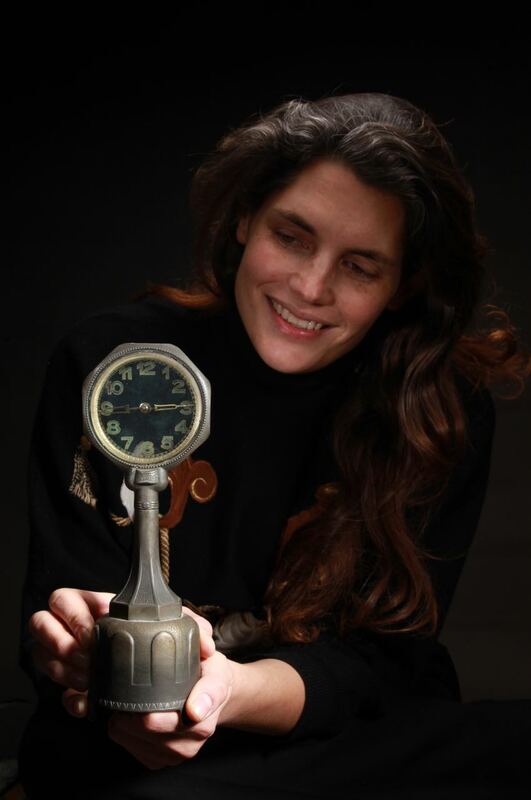 Signed Bulle-Clock, retailer Jarrot Sarrote Biarritz. The movement is number for the year 1934. 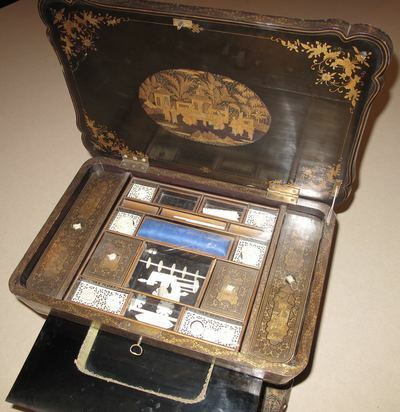 Interesting is to see that the front of the case is inlayed with very stylish flash of lightning, symbolising and showing that we have to do with a electrical clock. 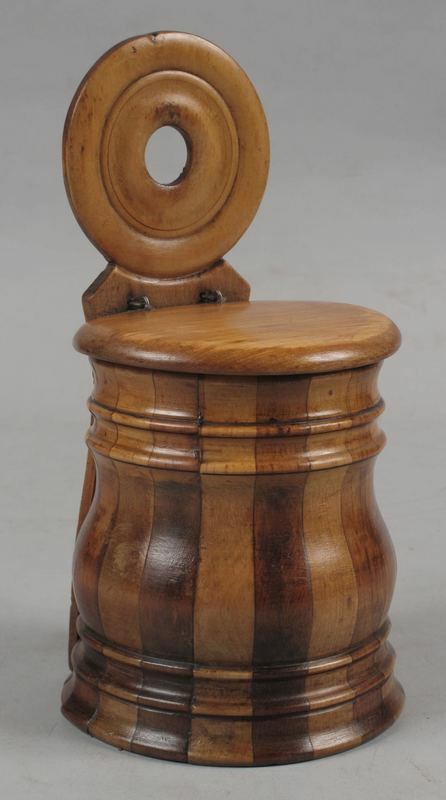 23cm high 33cm wide 9cm deep. 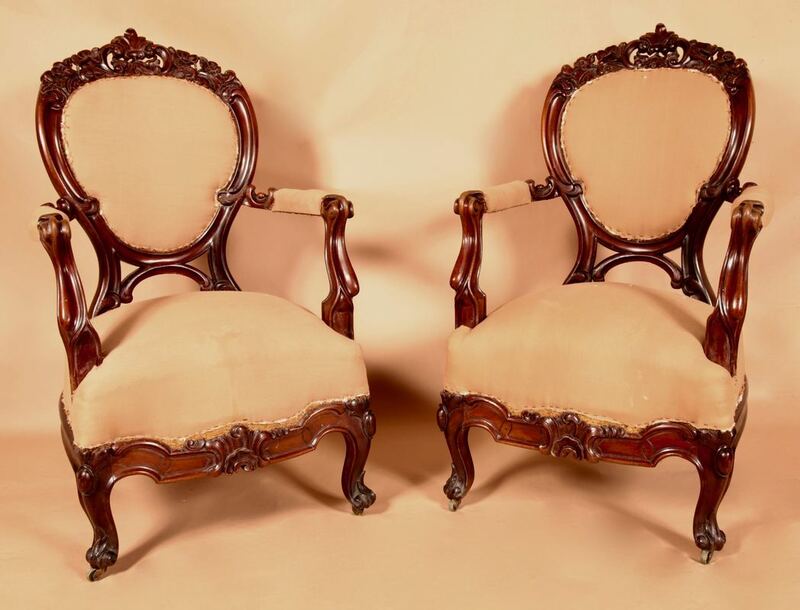 An exceptional and beautiful Victorian Cuba Mahogany 3 Piece Suite. 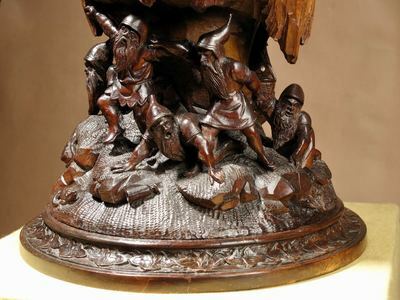 Finally detailed carved and still with the original finish and patination. The carving is very crispy. 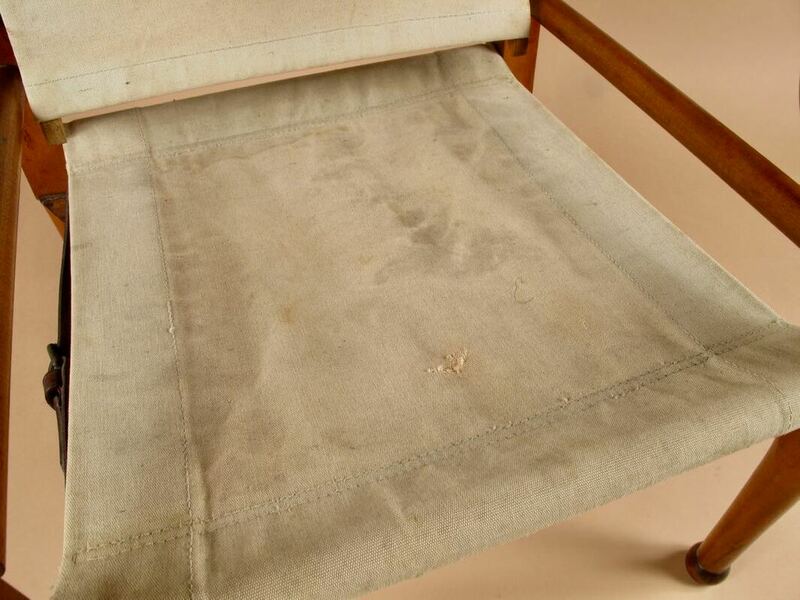 The upholstery is very good but only needs a new fabric. 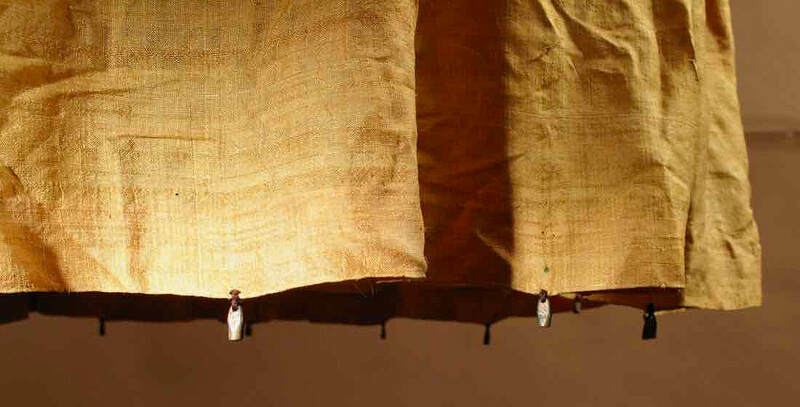 We sell it this way the buyer has to organise the new fabric after his or her own personal taste. 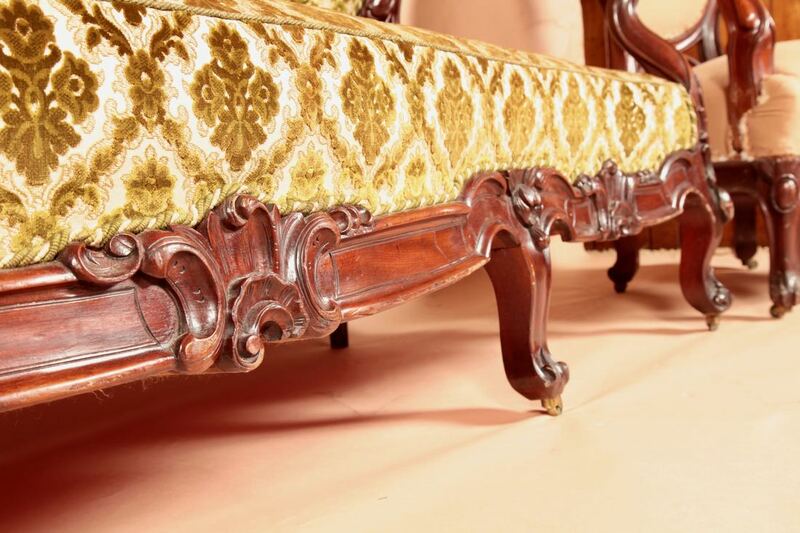 This suite is of an unusual design and dates from circa 1850 till 1900. 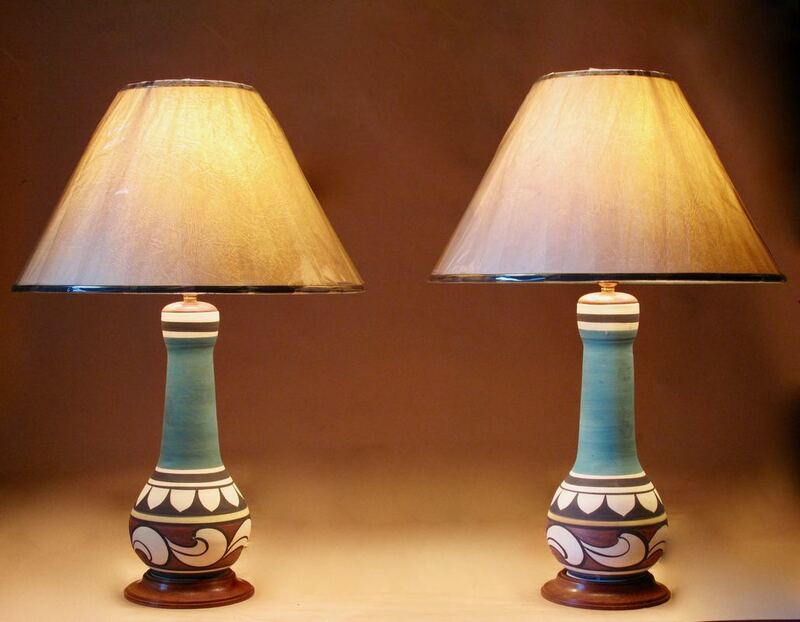 The left lamp is circa 1 till 2 cm smaller, but still very suitable as a pair. 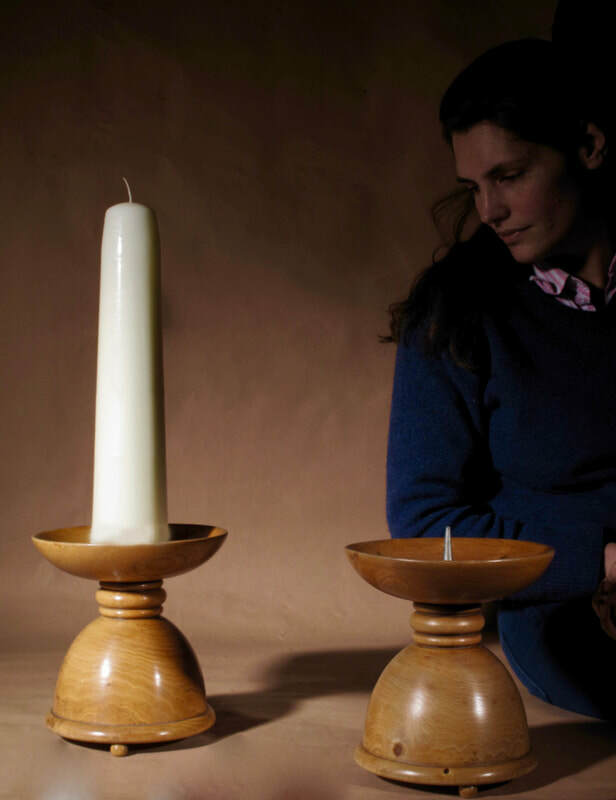 Both lamps are with mahogany turned wooden bases and tops. 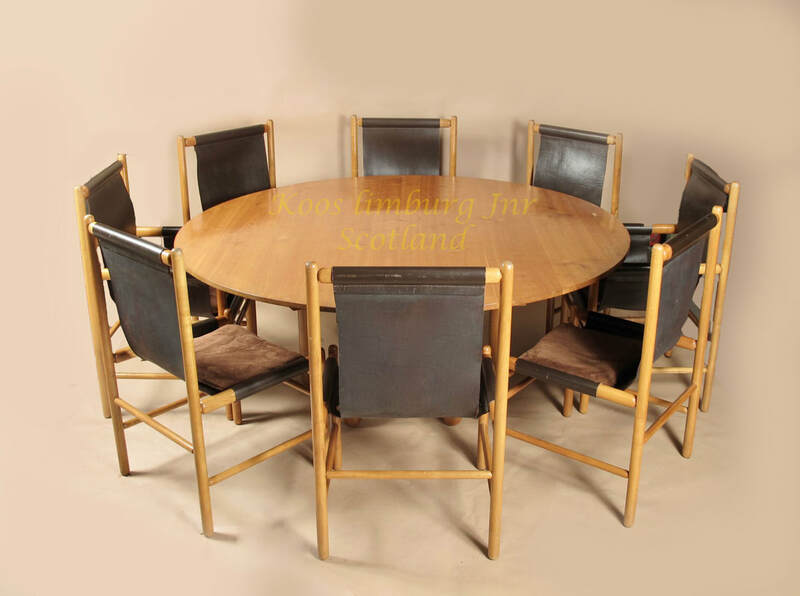 An Design original very decorative and stylish 1960s round table. 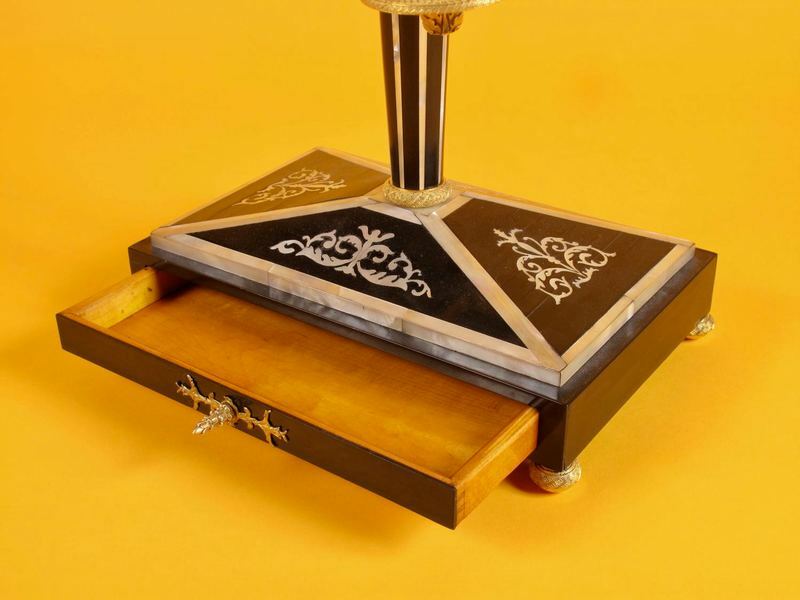 The top and bottom veneered with Mahogany, the four Columns veneered Ash wood inlaid with Ebony, simulating bookbindings? 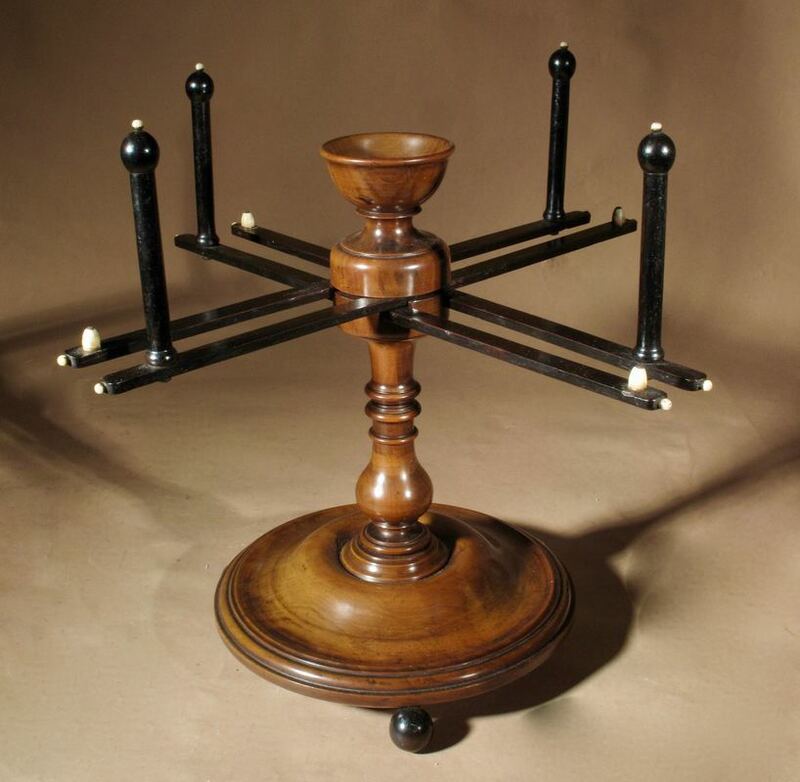 64cm high 65cm diameter top. 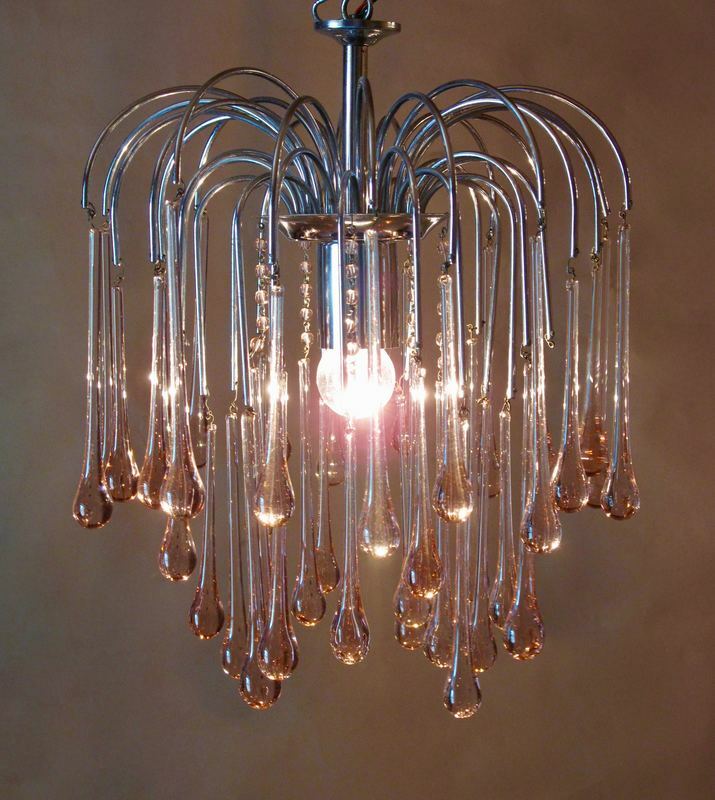 The drops from clear glass to pink. In the manner of: W.A.S. Benson. 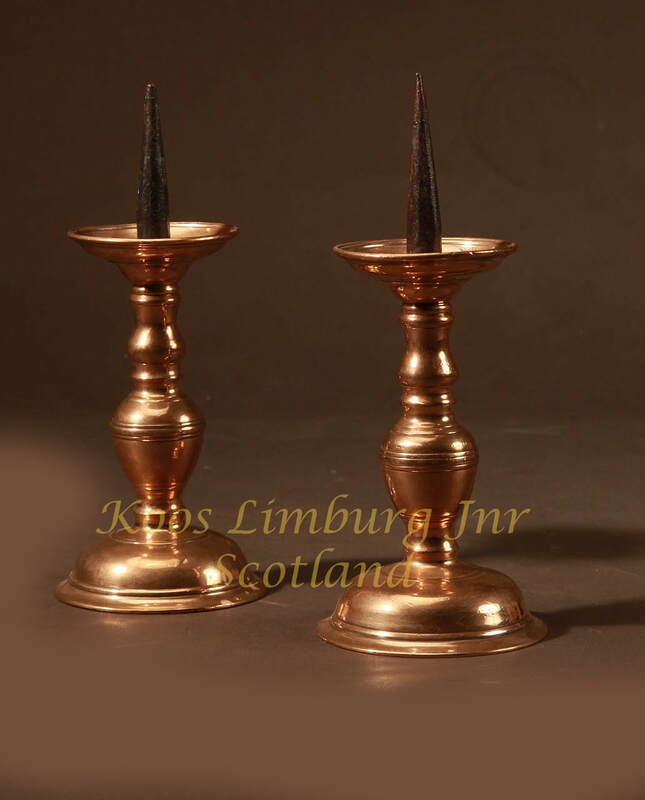 Now fitted for electricity, the copper and brass is lacquered, so no polishing is needed. 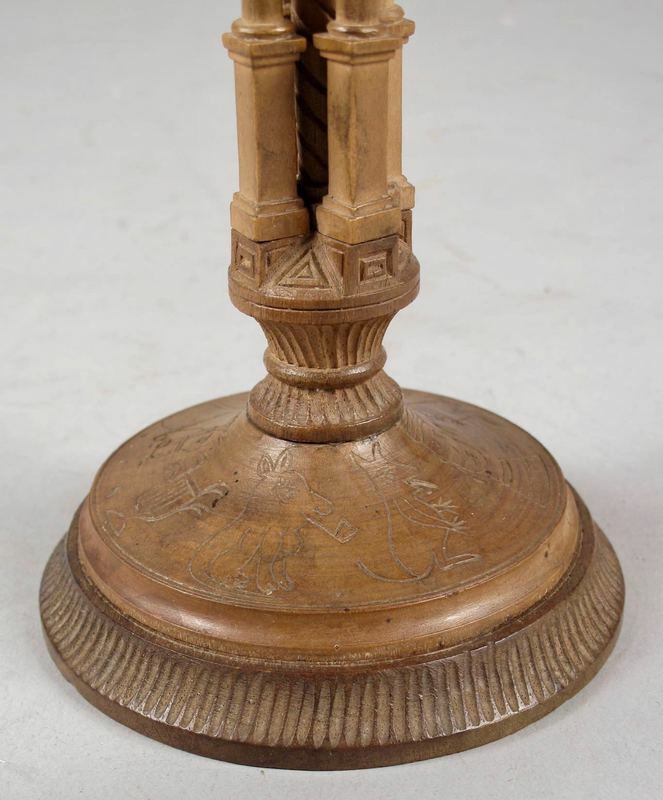 This lamp base was original for a parafine lamp. Very Large and decorative unusual Indian Pair of Brass Cast Table Lamps. 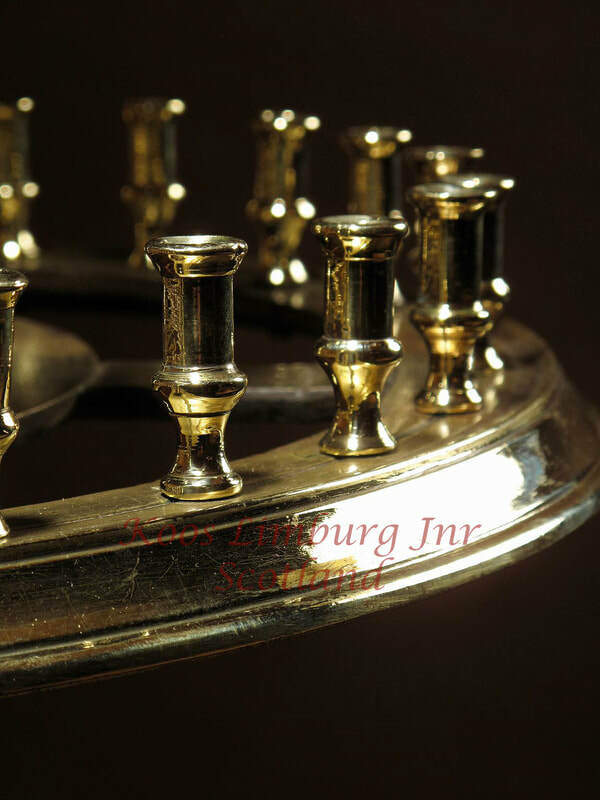 The brass is vernist so you never have to polish it. Both shades are light green and of the same colour in original used condition. the brass lamps are standing on wooden turned bases. The electrics have been controlled and renewed with an old style fabric cable. Original 17th-18th century wrought iron standing Rush Light on wooden base. 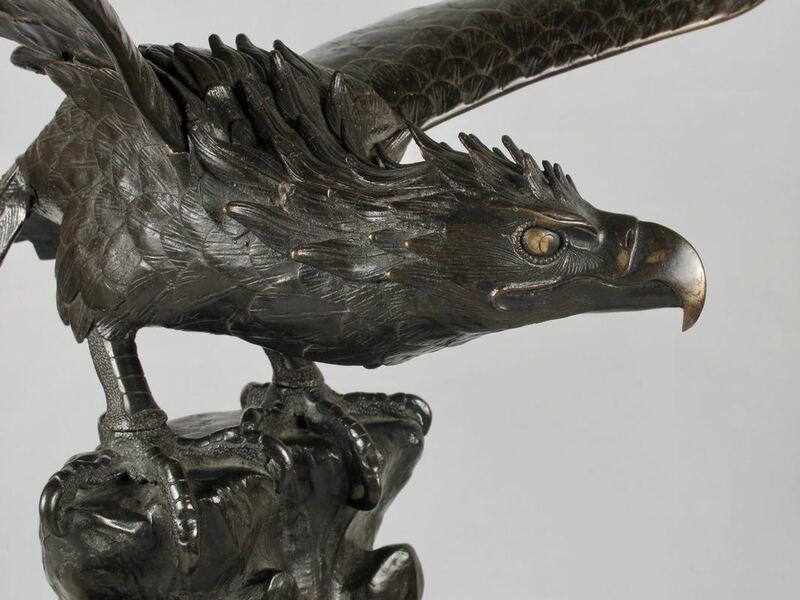 In original condition, with nice old patination. 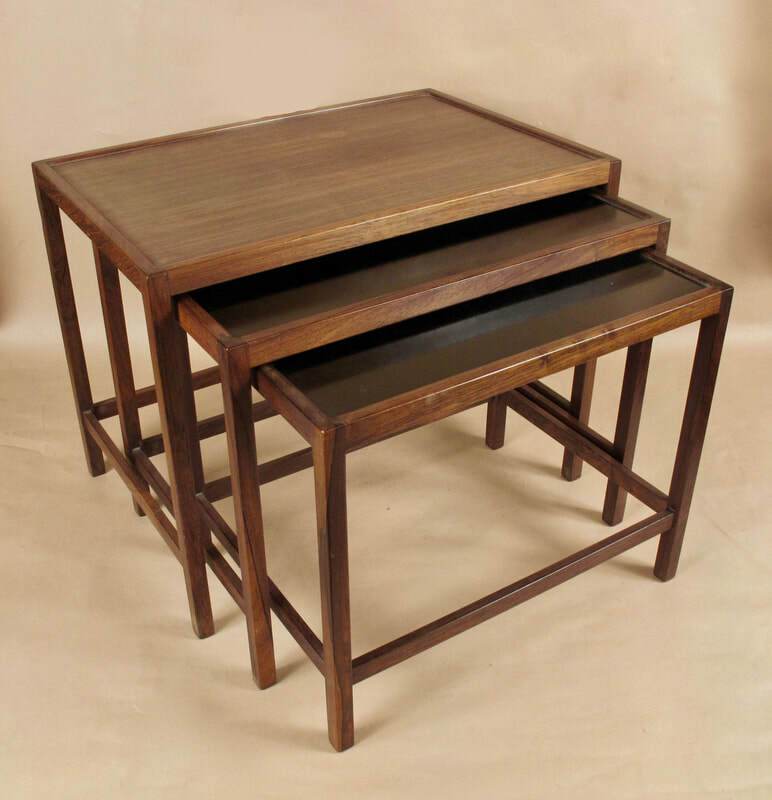 A stylish nest of 3 Scandinavian Hardwood Tables. 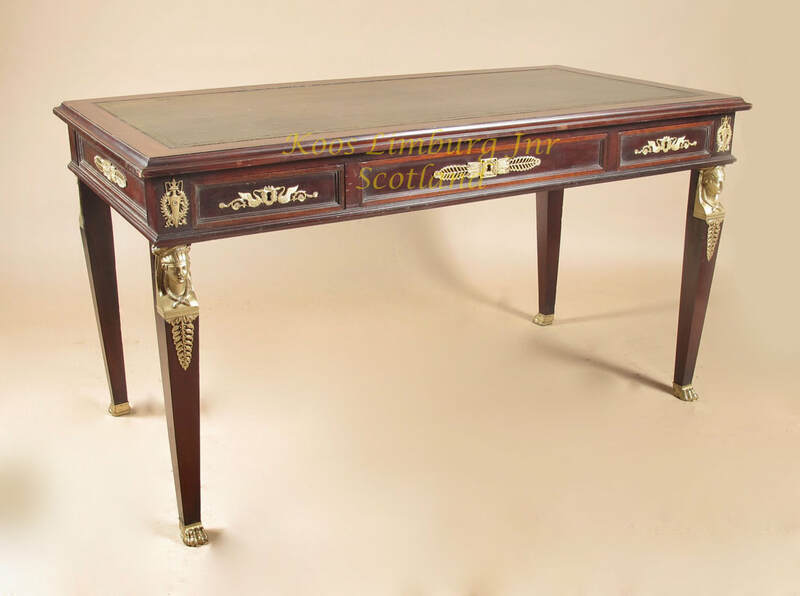 The large table with rosewood top the two other with black formica tops. The underside nicely finished with Hardwood. 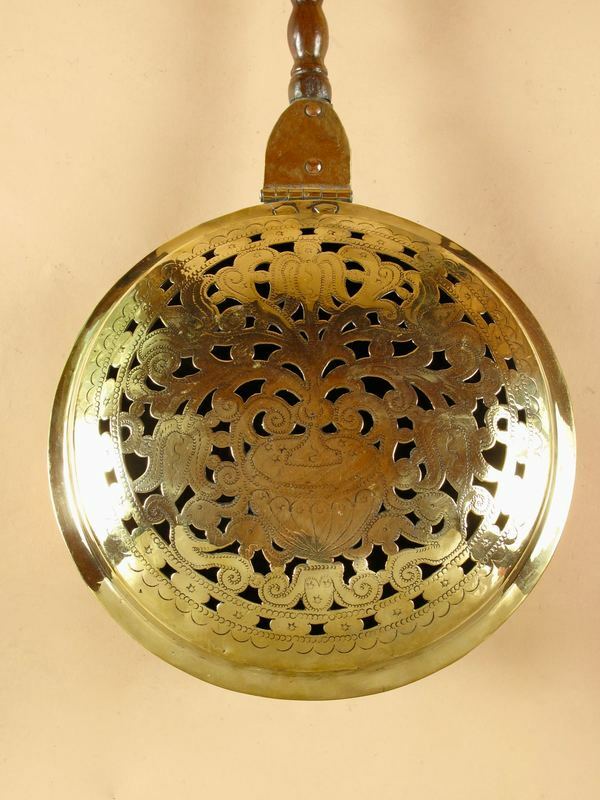 A very decorative original bevelled 4-glass electrical lacquered signed brass Bulle clock. With serial number: 53849 is dating for Circa: 1926. In orignal cleaned condition in fully working order on batterie or transformer. Still with the original beautiful old dial, not restored. 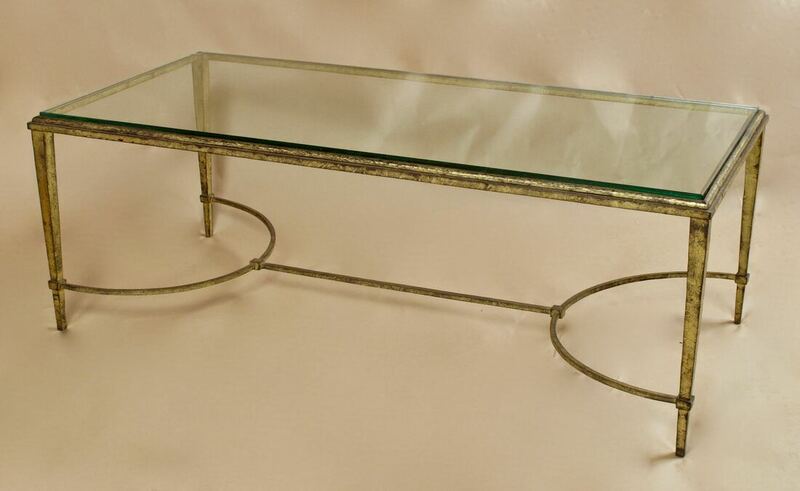 A very stylish and decorative oval lead birdbath planter and table center piece. 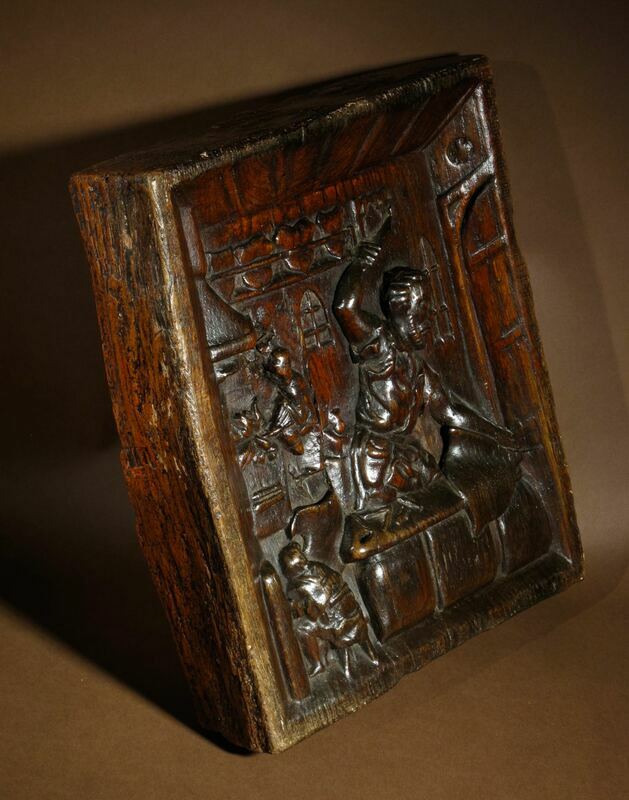 In very good condition with wonderful old patination. 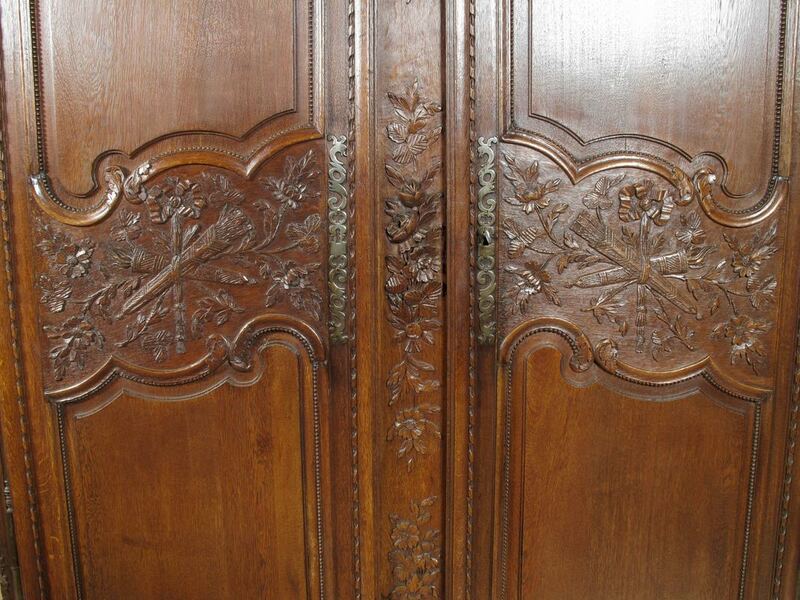 A very decorative fine carved original oak Normandy wedding armoire. 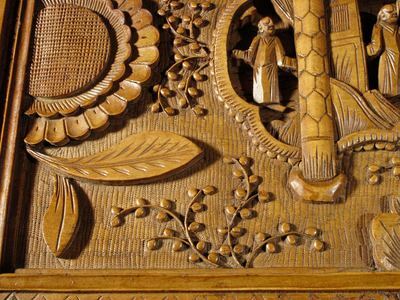 Carved with flowers and ornaments. 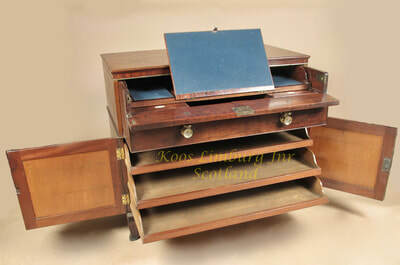 With 3 shelfs including 2 small drawers and 1 large drawer. 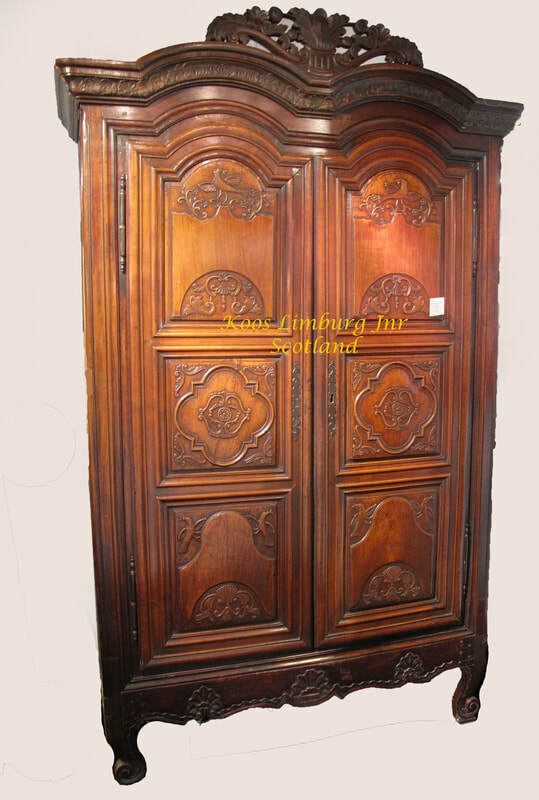 It is rare to find a Normandy armoire in this top quality condition, what means: the panels are not cracked or with old repairs and with a very nice grain. 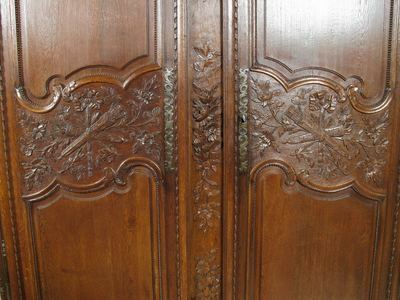 The very fine carving is also very fine crispy carved in detail, still with the original lock and hinges. 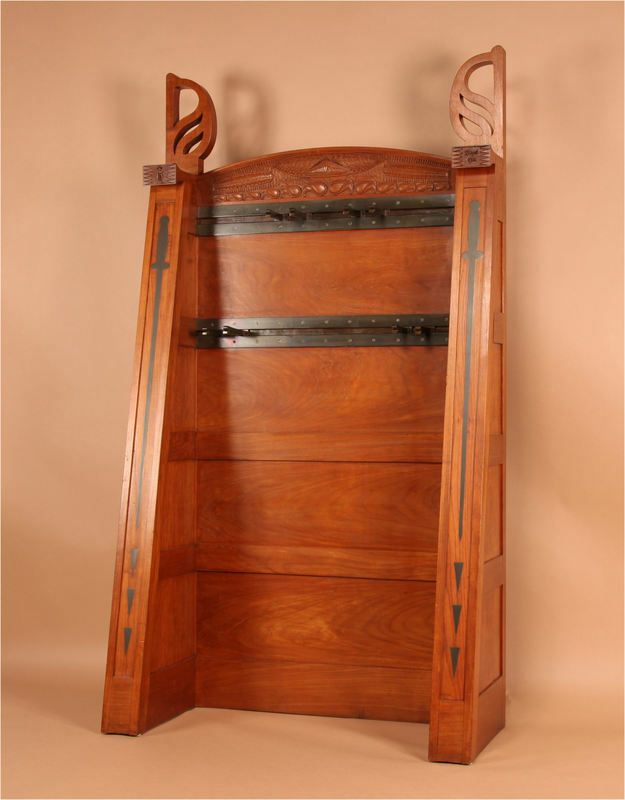 238cm high 54cm deep 146cm wide sides 163cm on the top. so well preserved and in principal nearly in untouched condition. A very decorative and stylish Chinese archaic style patinated bronze table tamp with original square shade. 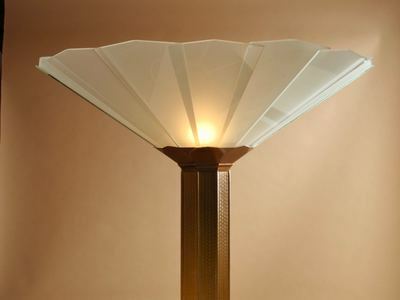 total height 84cm till top of vase 40cm high shade 44cm square. Electric cable have been renewed in old fashioned style cable, original paintwork, with nice old patination. 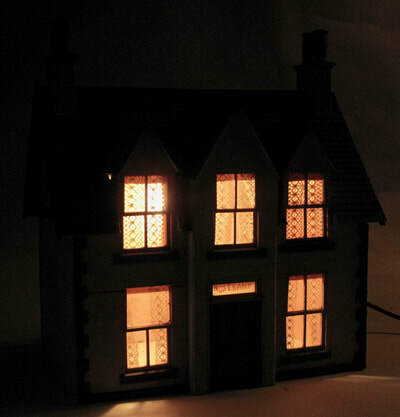 The clock has a lovely atmosphere specially when the lamp is burning! 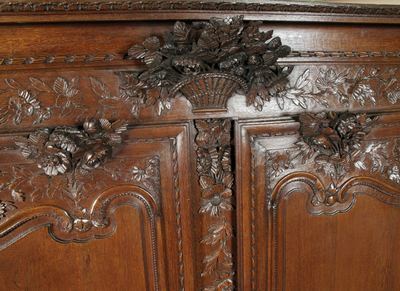 The wrought iron leaves are hand painted in green and brown and original. The movement is also original and in working order. A well known company starting in the 1930s in England. 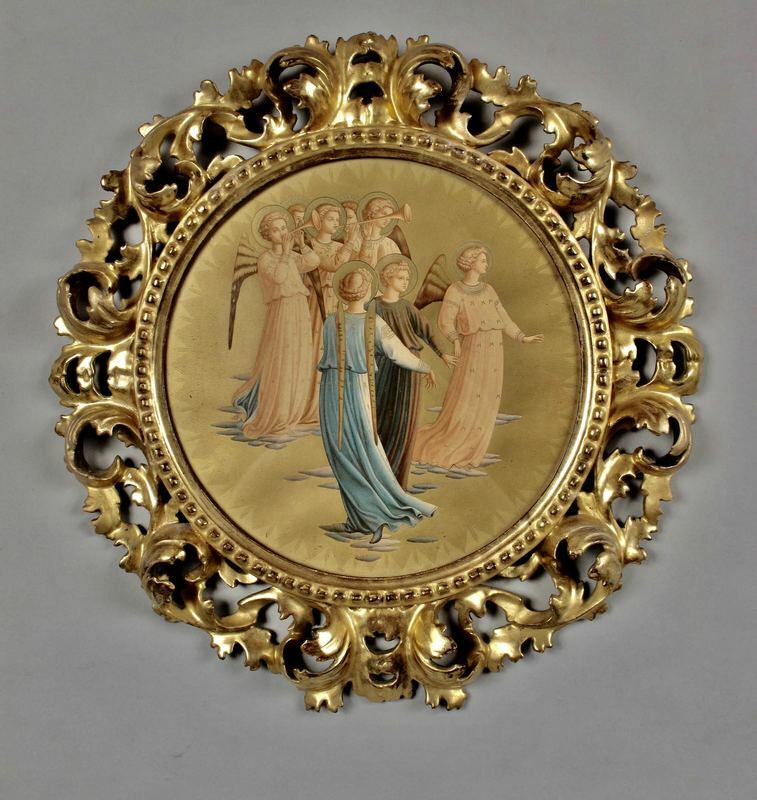 Interesting to see is the different designs of the subjects with fine gold paintwork. My price is based on the charger what is in good original condition and not restored, the broken one you can have for free to complete a pair what is always nicer. 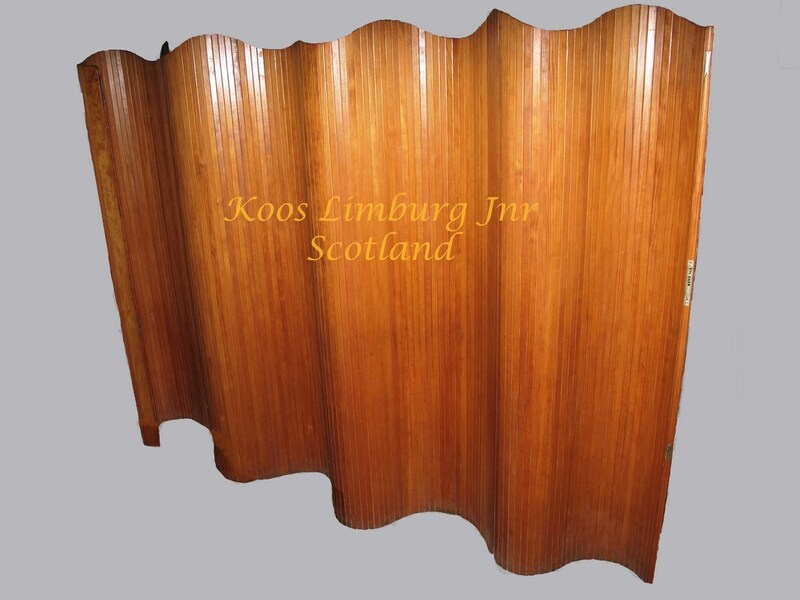 A Very large Articulated Paravent/Screen. 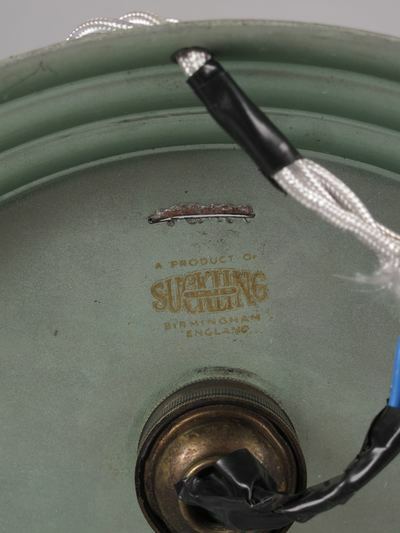 Still with the original metal makers label. For a baumann screen is this a very long screen by us one of the longest we have seen. An original Tiffany studios New York stamped floor standing lamp. 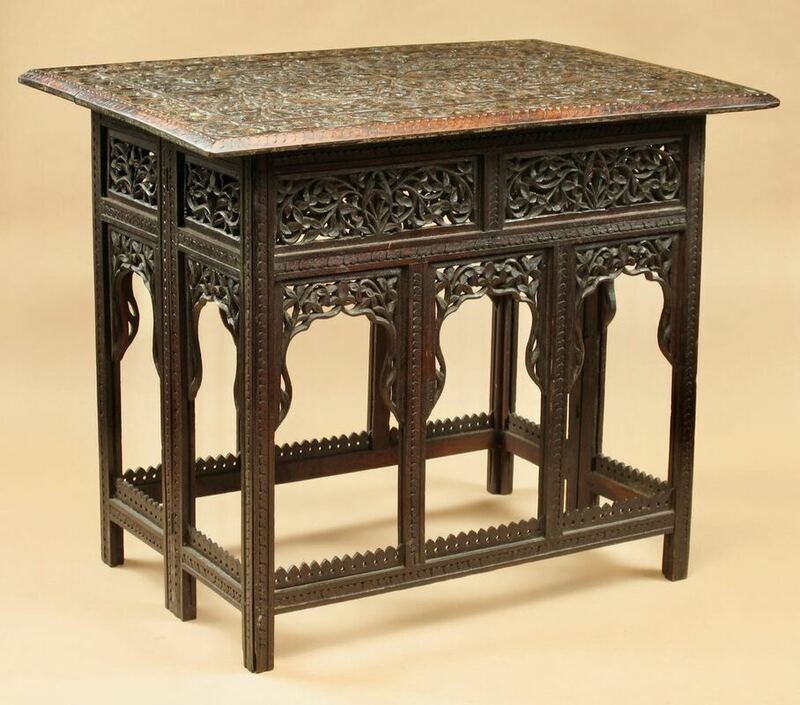 A very decorative and original antique inlayed table. 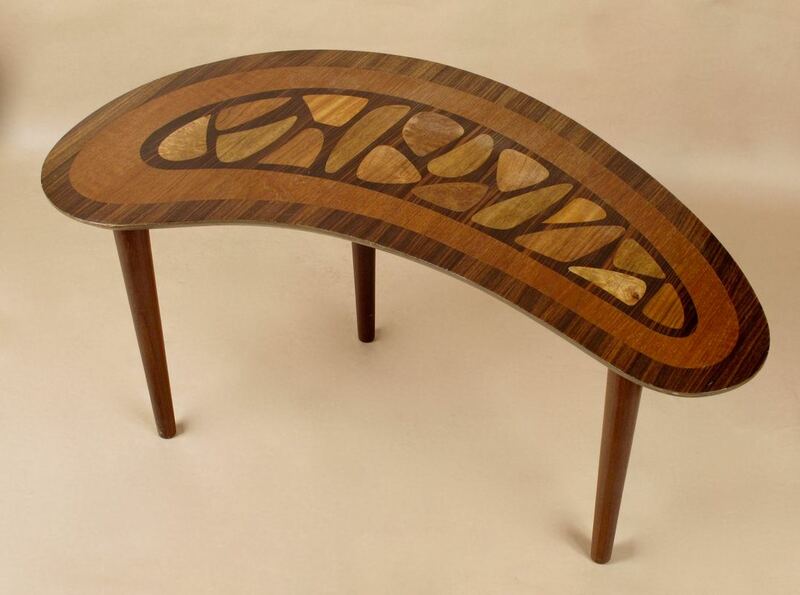 Inlayed with mother of pearl and all sorts of different wood. 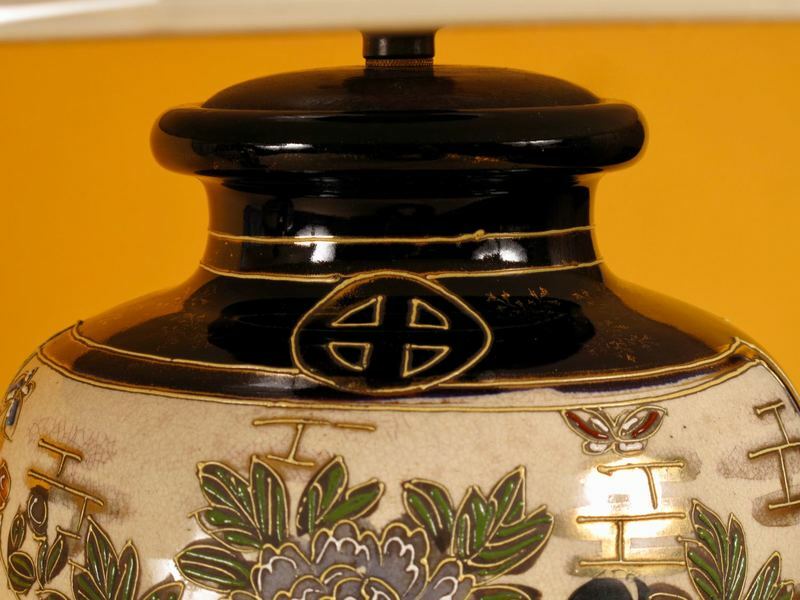 The top in the centre inlaid with a mother of pearl symbol. 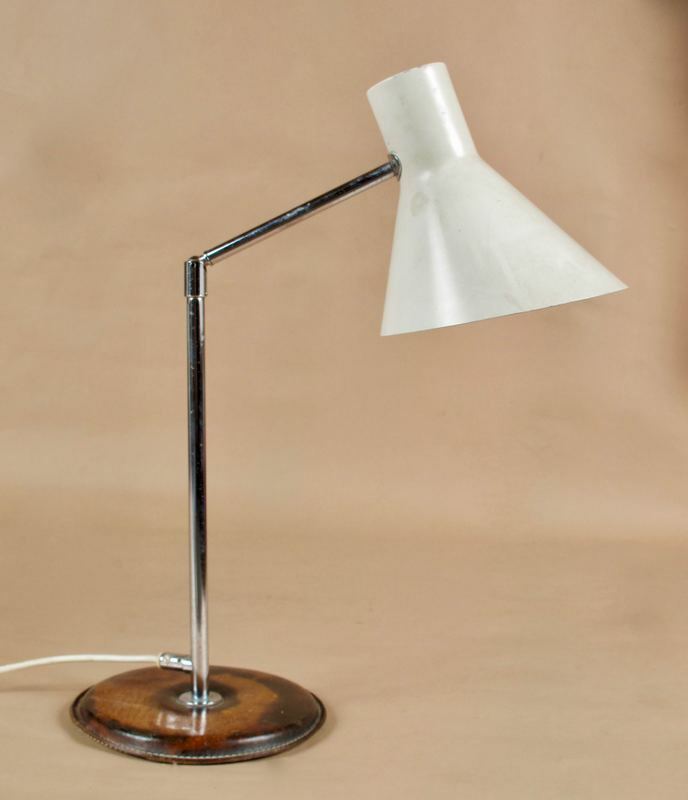 Very rare Anders Pehrson Table Lamp possibly a unique piece. 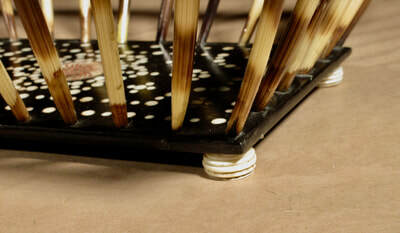 The base is covered with leather. Hight 59 cm fully extended till top. A decorative rare cast iron large mortar. A very decorative Japanese Lacquer Suzuribako. 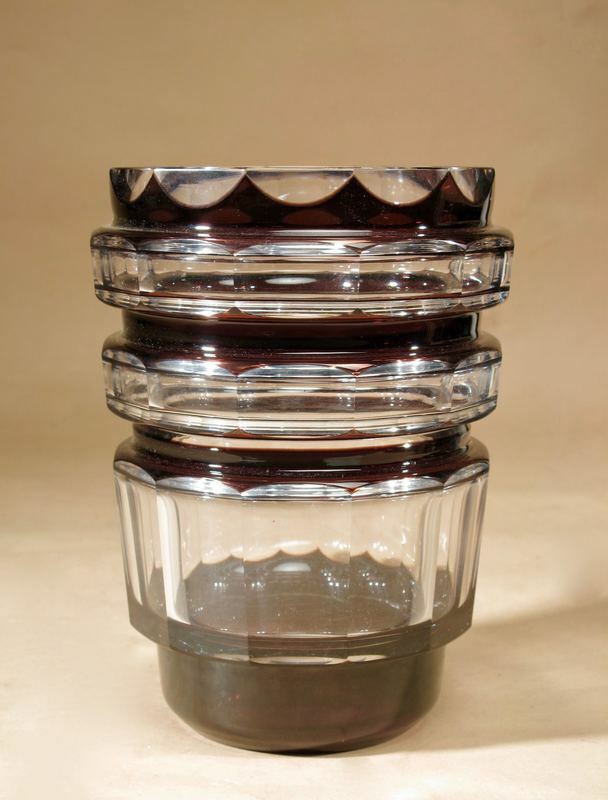 A large Art Deco Val Saint Lambert deep purple Formosa vase In thick cut glass. this is a beautiful unusual colour. 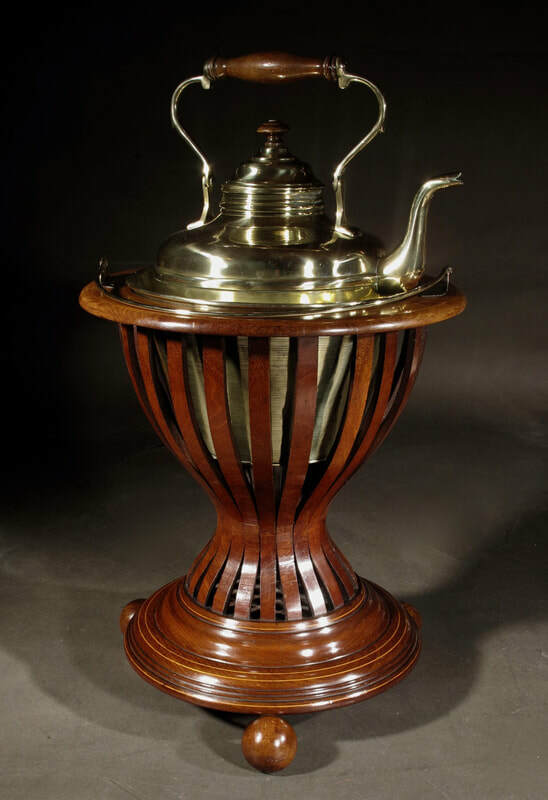 A very decorative original coopered peat tea bucket jardiniere tea stove made with different kinds of wood. Still with the original brass liner and twisted brass handle. 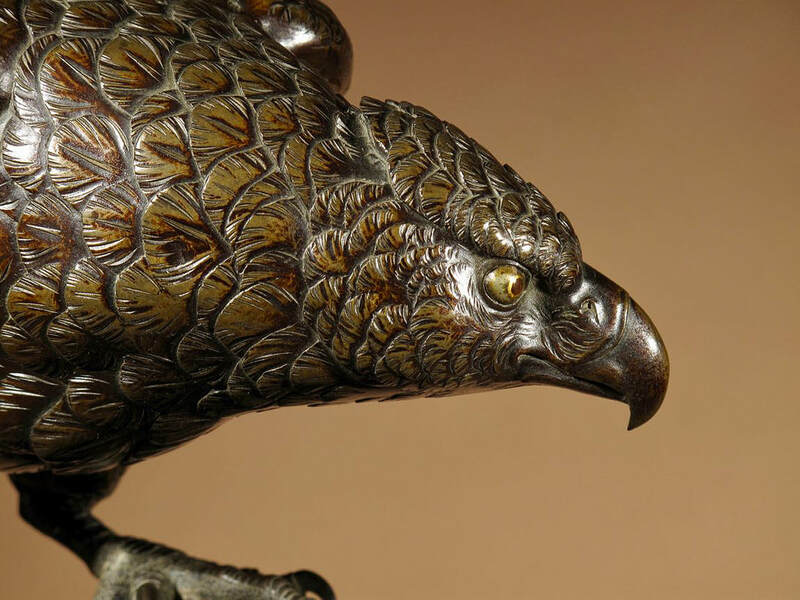 With a very nice patination. 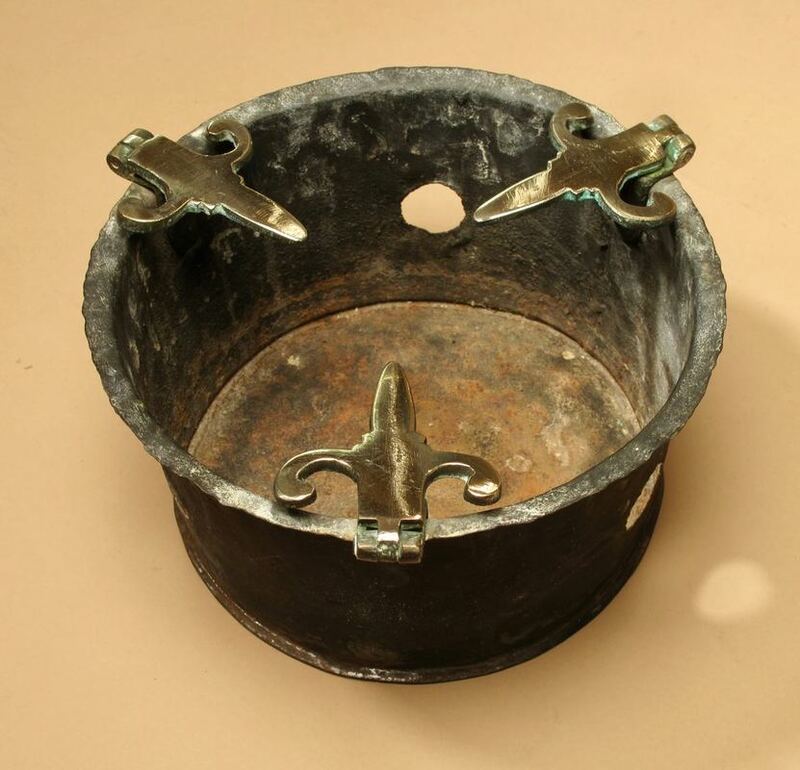 This cauldron belongs to a group of early type cauldrons, you can see this on the small size and the round bullet shape body. With original fully serviced movement and original pendulum in working order, striking on a bell every half hour, running for a week. 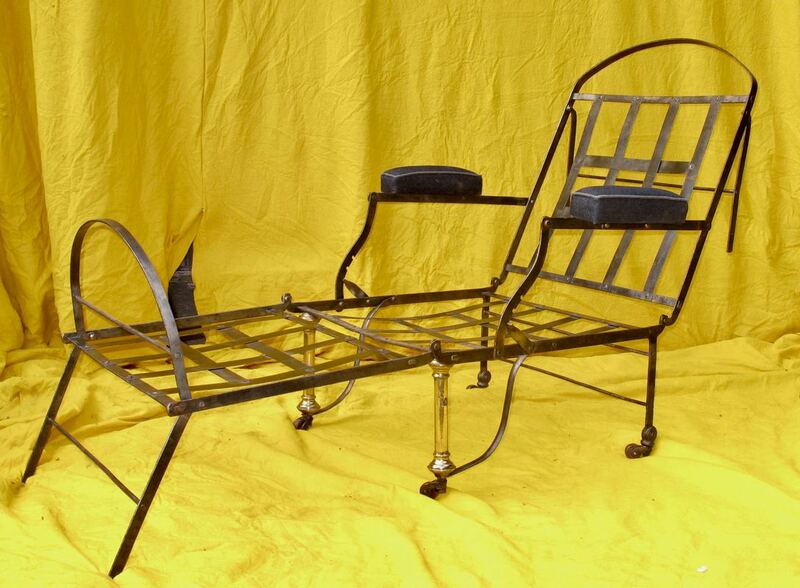 Whole over in good original condition and original old patination. 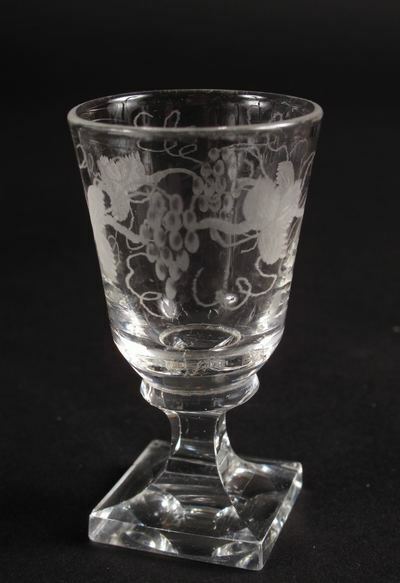 Still with the original glass. 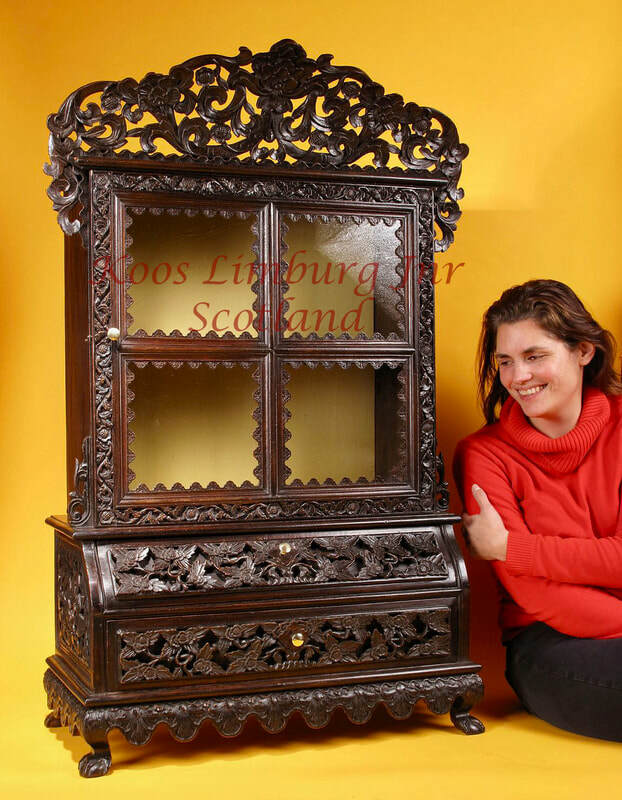 A small Dutch 17th century oak/ rosewood and ebony Gelderse kussenkast armoir. With beautiful carved oak frees on the top in Daniel Marot style. 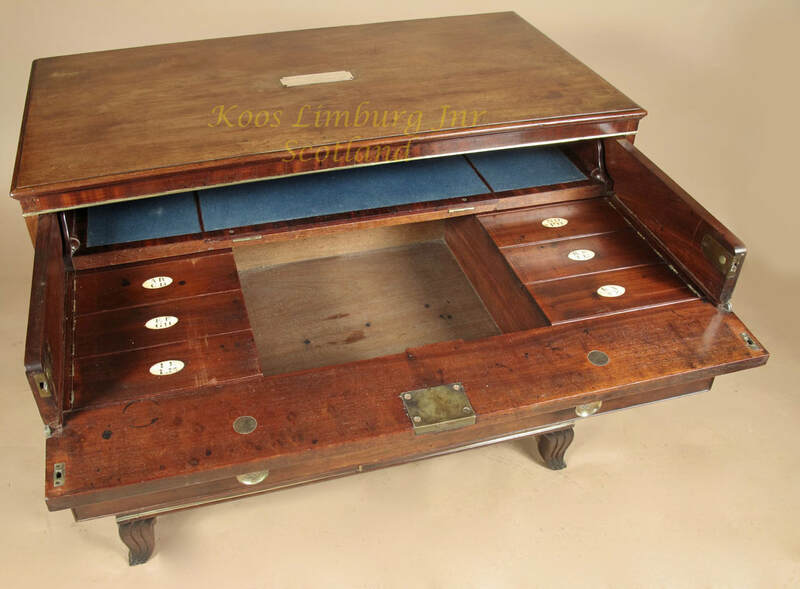 This type of Dutch "kast" is one of the smallest type of the Dutch 17th century. 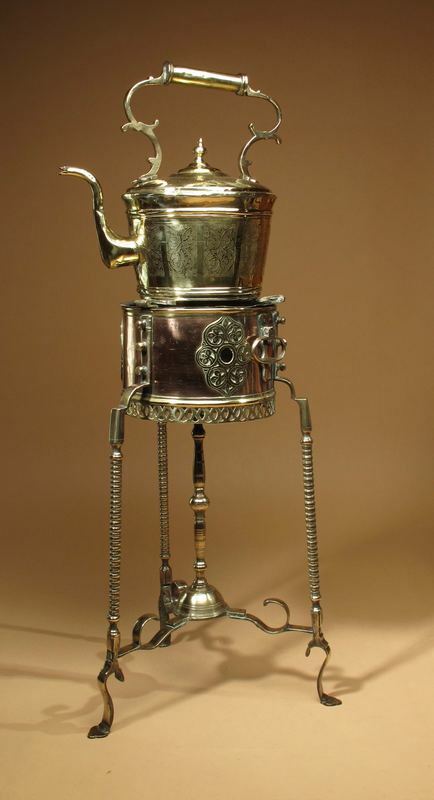 It is rare to find this type of tea stove's still with the original brass kettle and copper and brass charcoal burner. 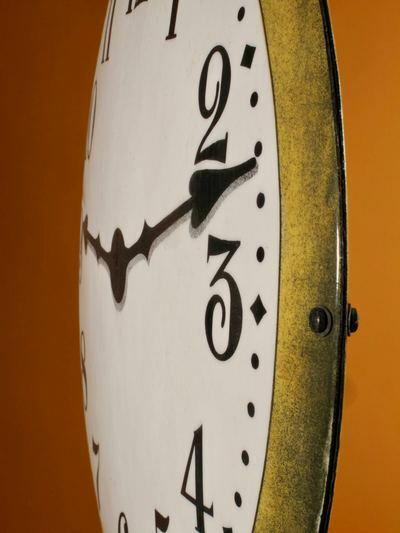 A rare and very large unusual Clock Watchmakers Enamel Double sided Shop Window Sign. 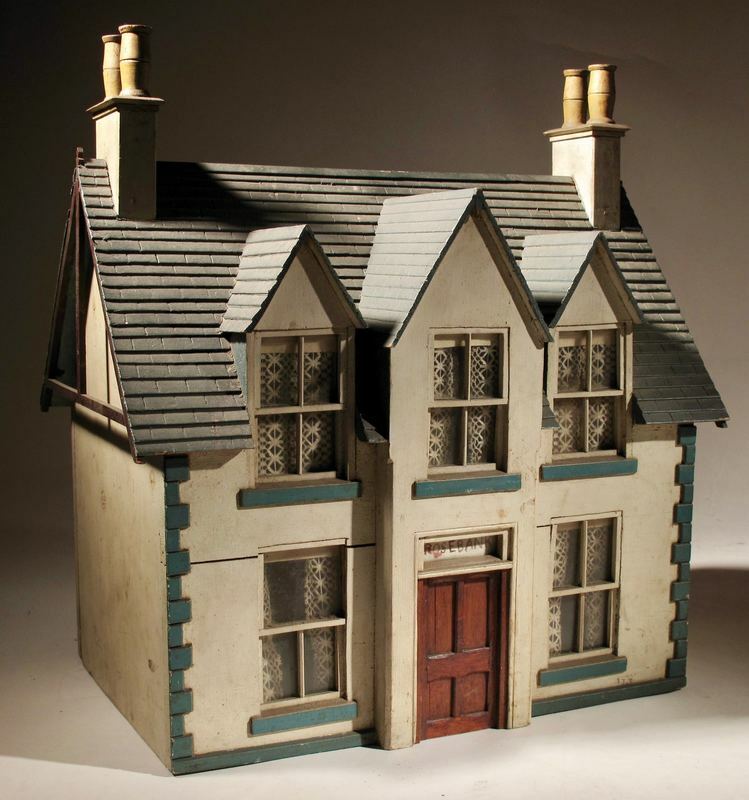 A rear and very decorative model house. 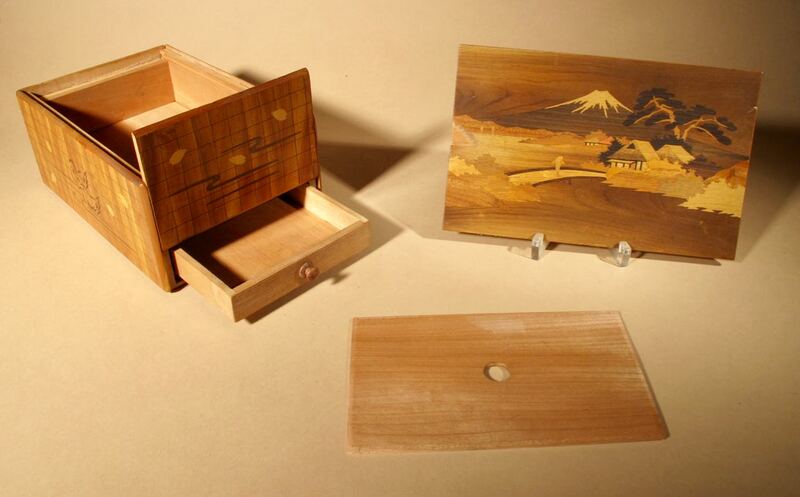 Made of wood and still original painted. Very charming when you place a light inside. It is not possible to open the walls or windows or door. 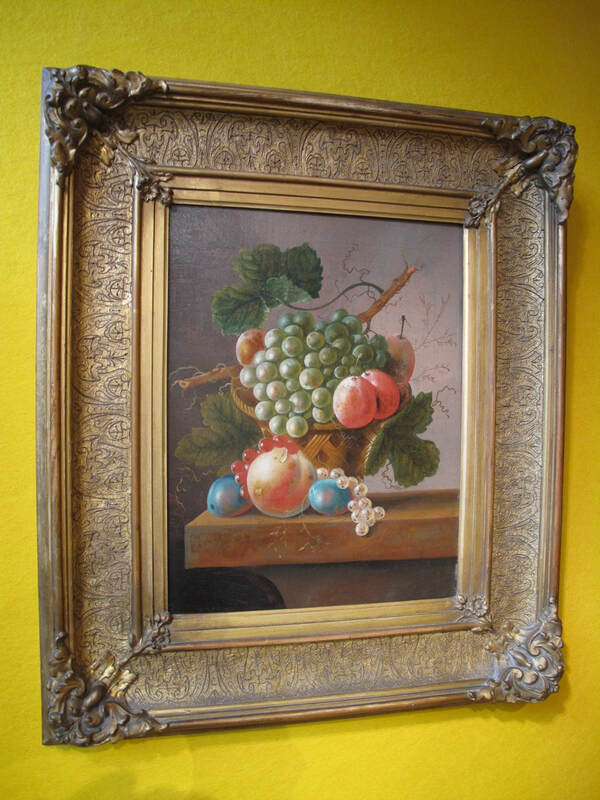 still with the original frame. 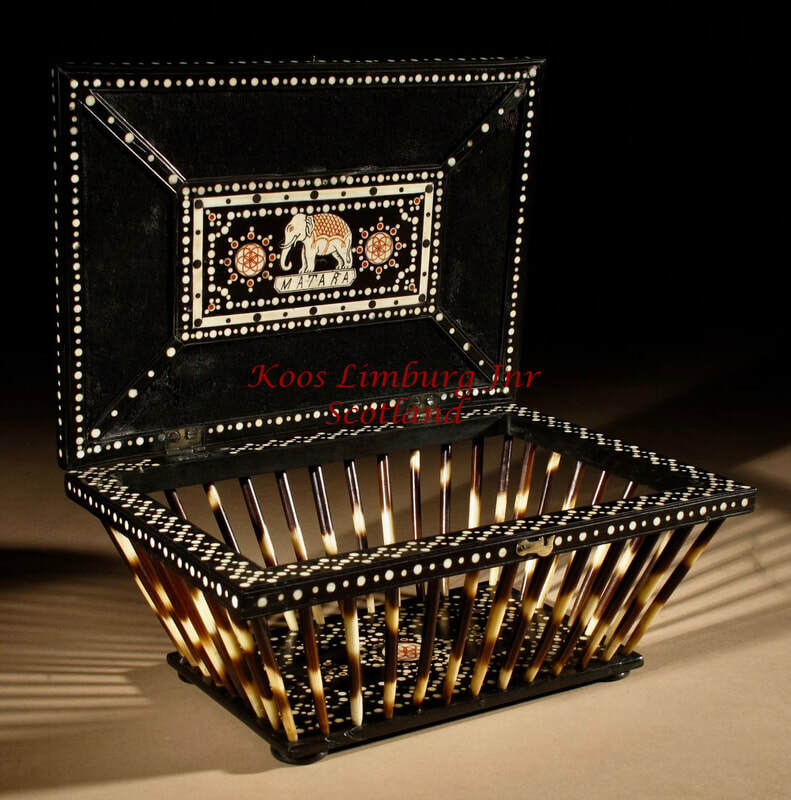 Very decorative original Dutch provincial five row Garnet and inlaid with Garnets golden clasp neckless. The large Garnet's are still sparkling. 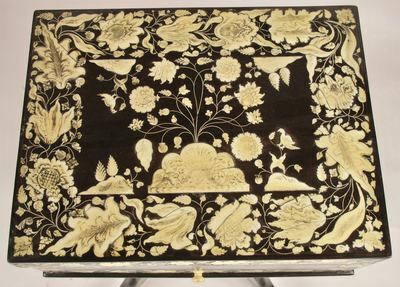 A very decorative Marquetry Art Deco tray inlaid with burr walnut, walnut mahogany and oak. 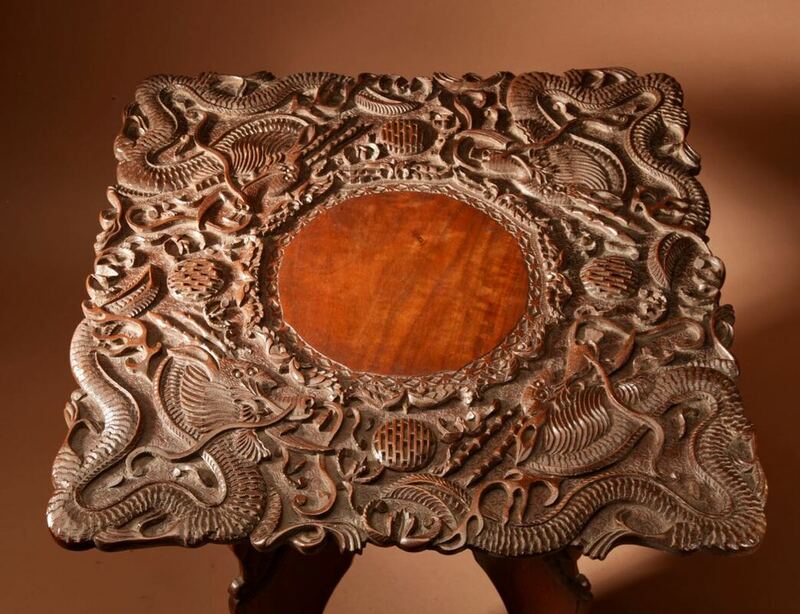 The mahogany tray has cloud handles made from walnut. 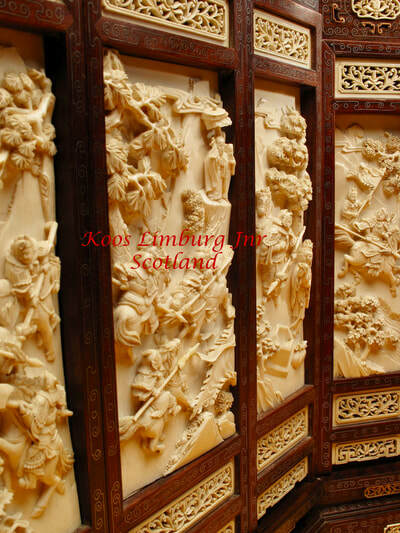 A very elegant, decorative and detailed Wooden Sculpture of Guan yin. With iridescent Lacquer work, with a very fine expression on the face. Still with the original plaited fiber. 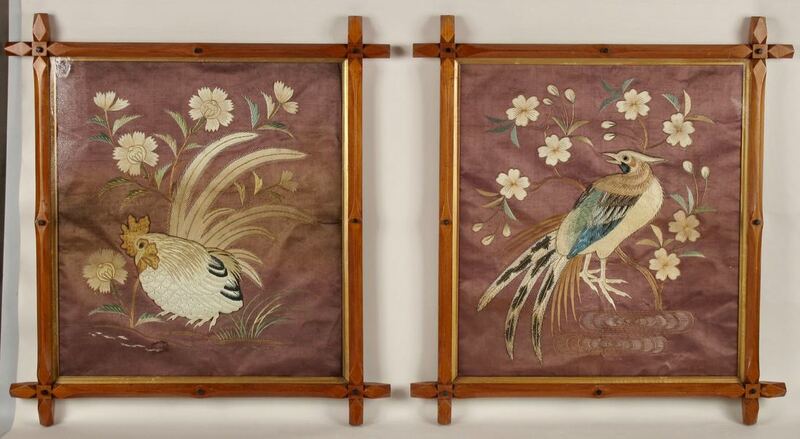 A very decorative pair of Japanese Birds embroideries, still in the original very decorative frames. 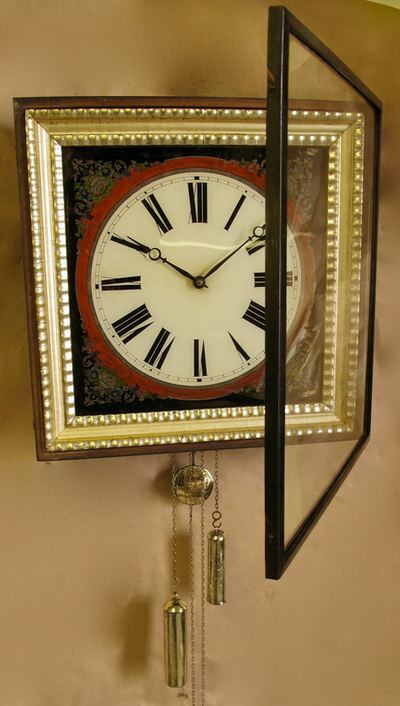 A decorative wrought iron and brass rare mantel clock. 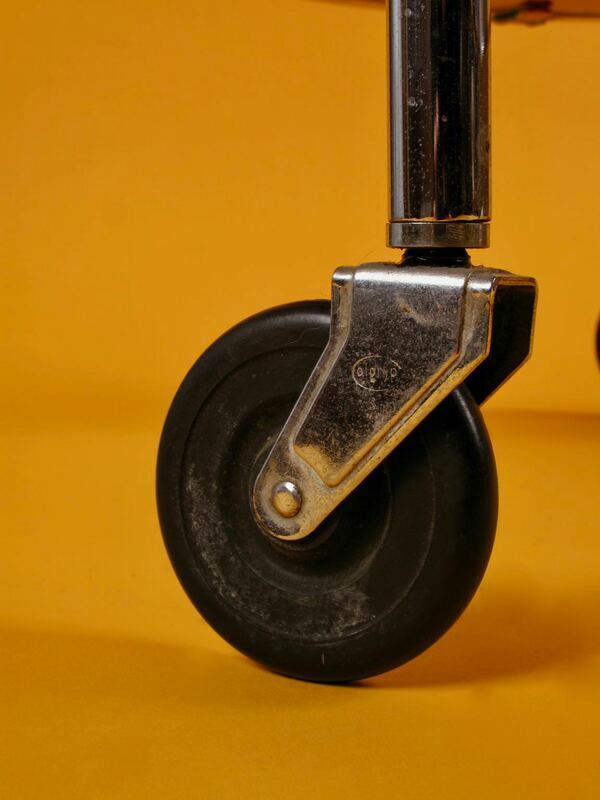 Still with the original cleaned movement. An interesting and decorative polychrome finally carved Indian figure. 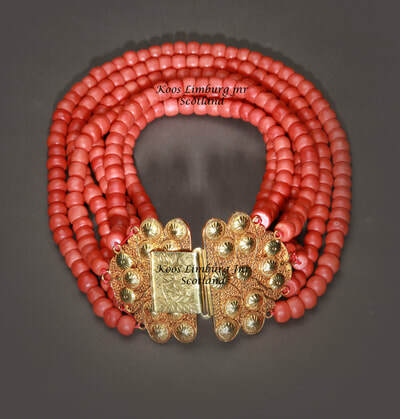 coral necklace with golden clasp. The total weight is 466Grams and the diameter of the coral is between 10 and 11 mm. 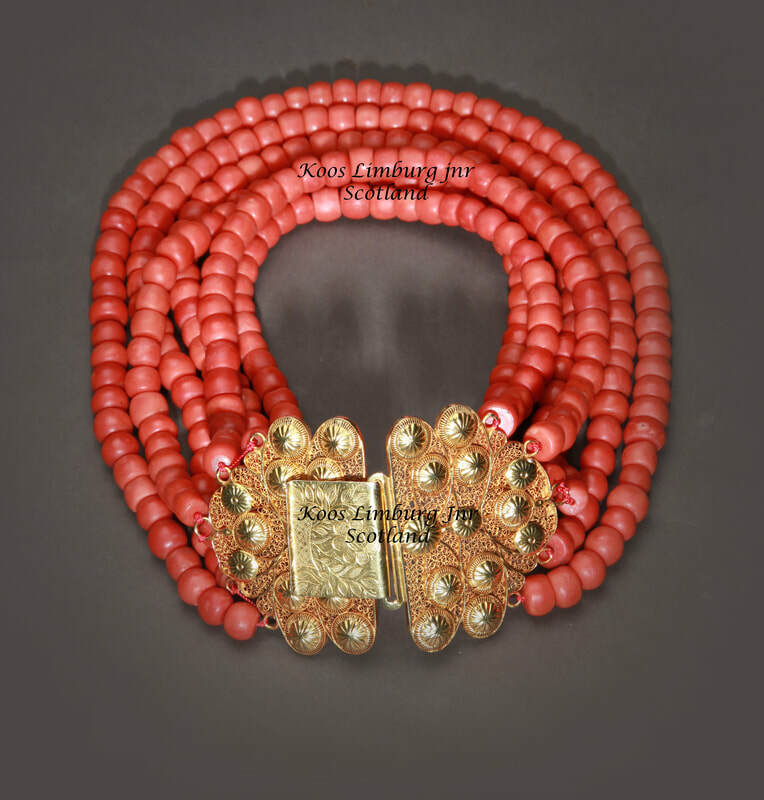 The golden clasp is wide circa: 6.5 cm and when the clasp is closed the length of the clasp is circa: 10 cm. in the Musea of Roanne in France. 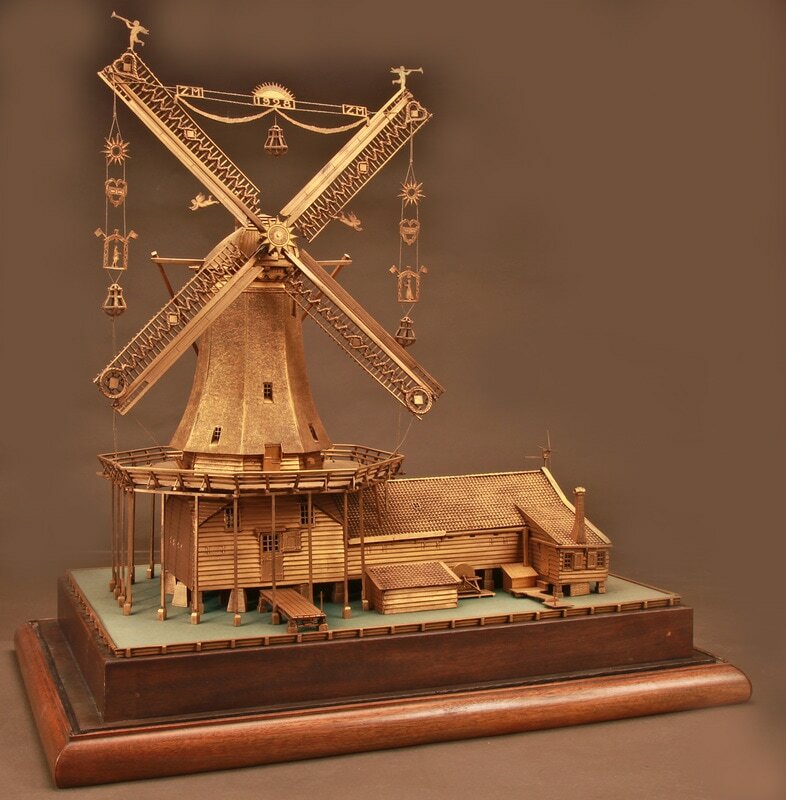 of: “ Het Zaans Windmill Museum “ in The Netherlands. who was the husband of Queen Wilhelmina of The Netherlands. for the occasion of the opening of the museum. 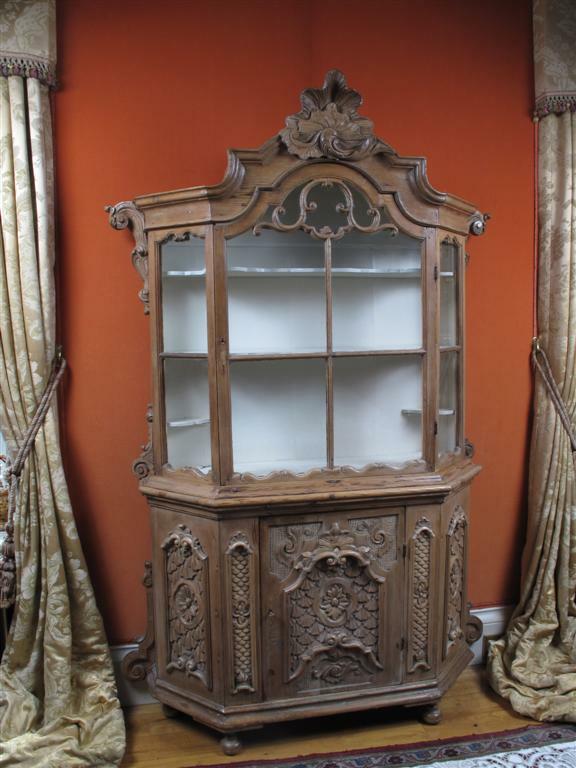 Still with its original periode display cabinet. 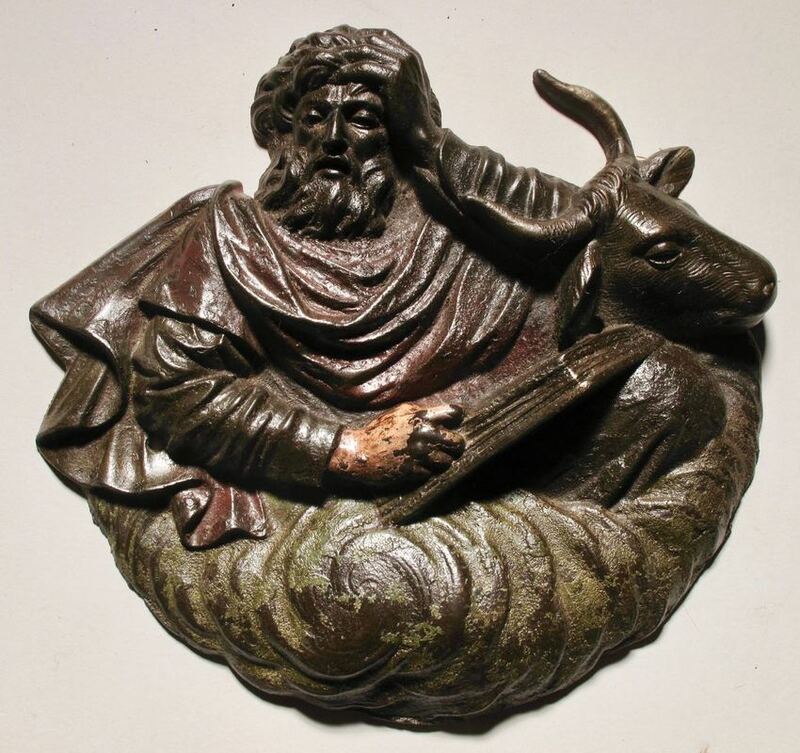 A very detailed fine cast iron relief of the evangelist Lucas and Bull. 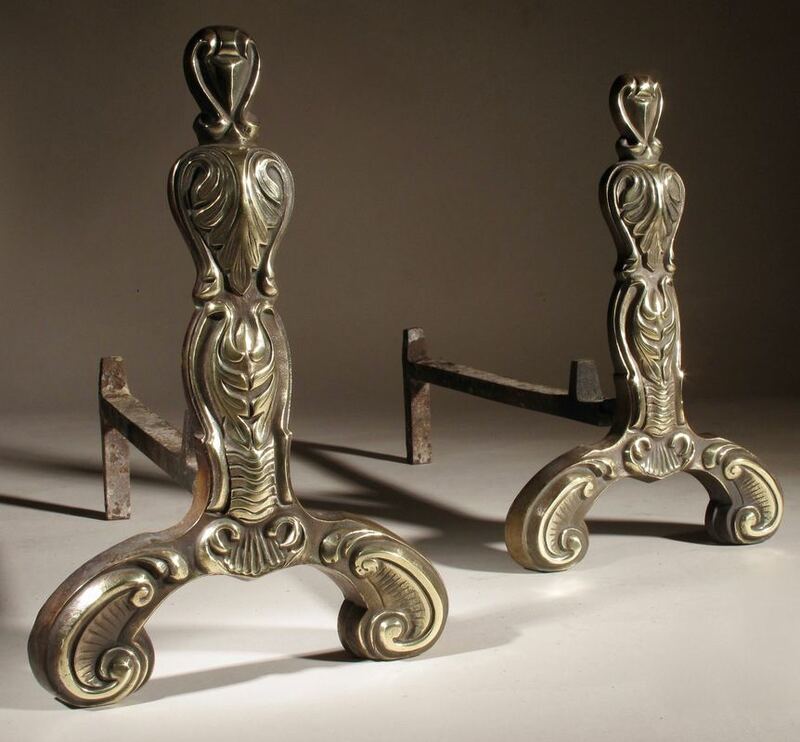 This is a very fine iron detailed casting! With very fine chase work. 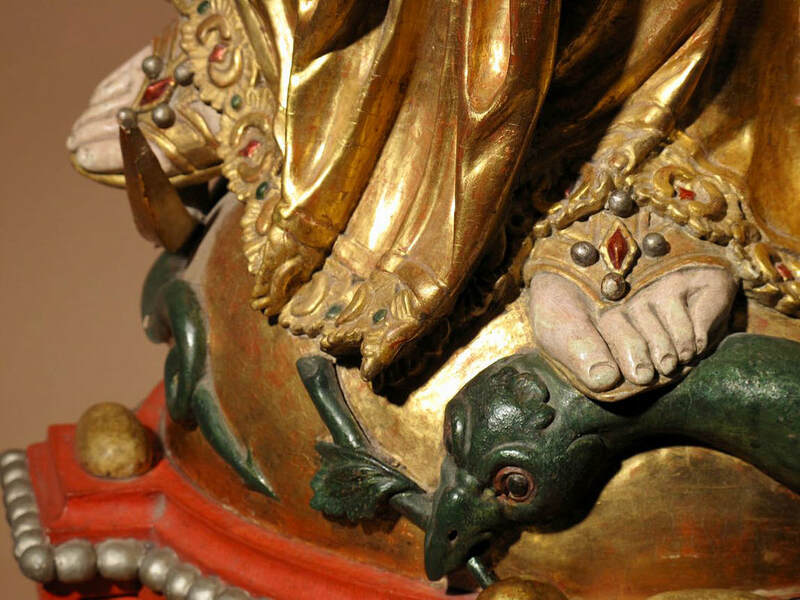 Still with parts of the original polychrome. 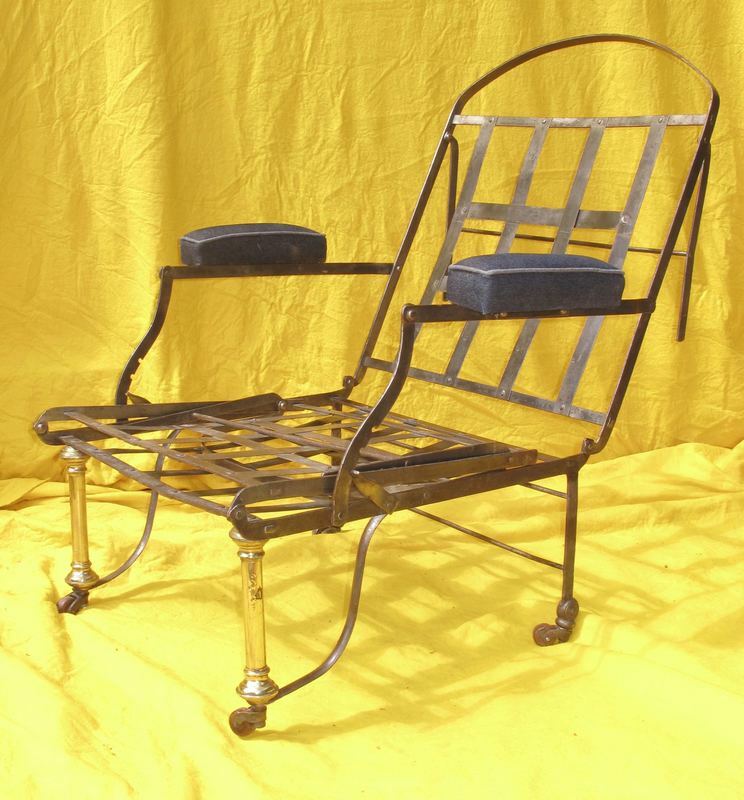 An original campaign wrought iron and brass folding arm chair . 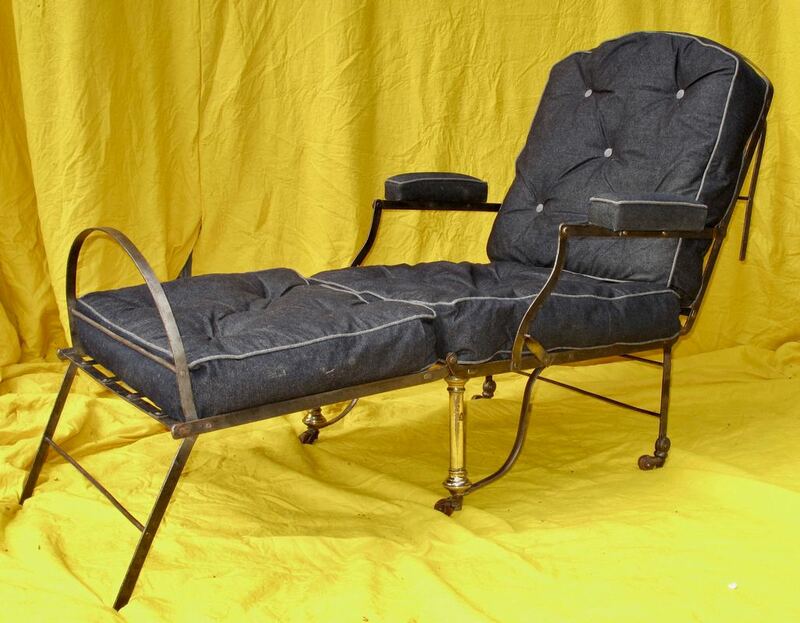 in very good condition, understandable with new cushions covered with jeans fabric. A magnificent art deco dining room suite, set. 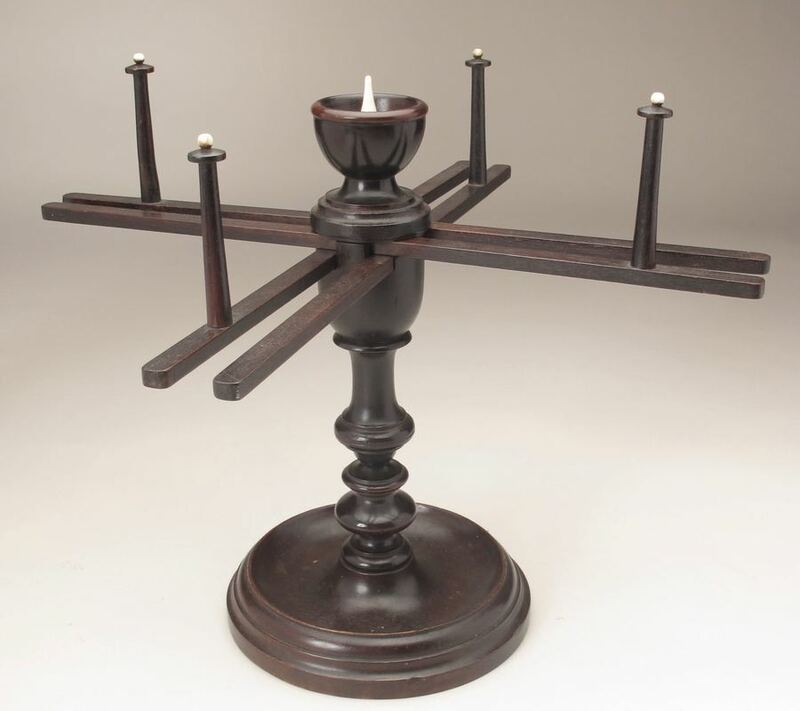 Made of walnut and Madagascar ebony. Covered with Muirhead Scottish leader. 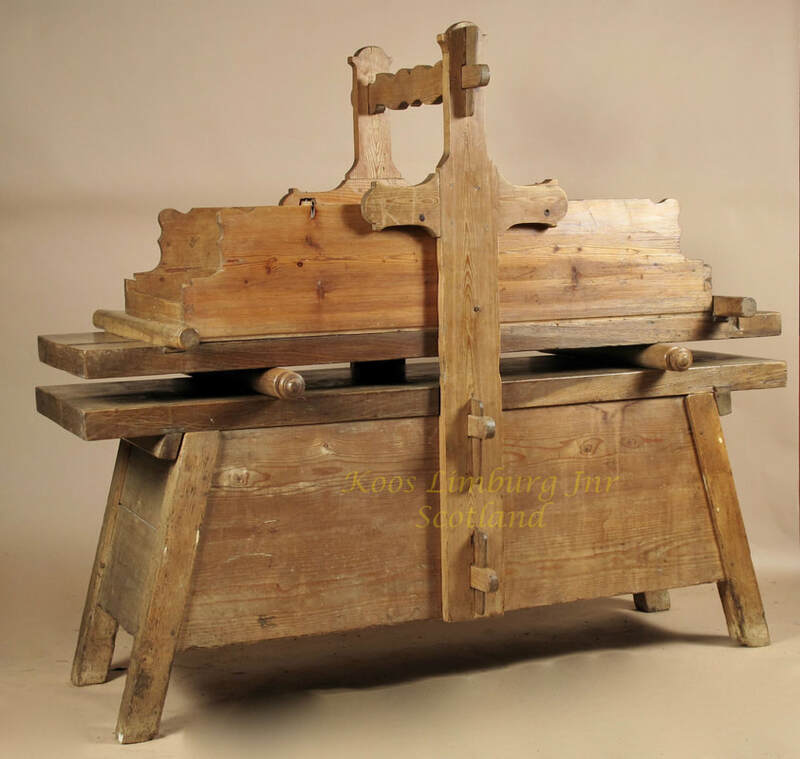 A very rare wooden mangling table, for mangling (ironing) linen. 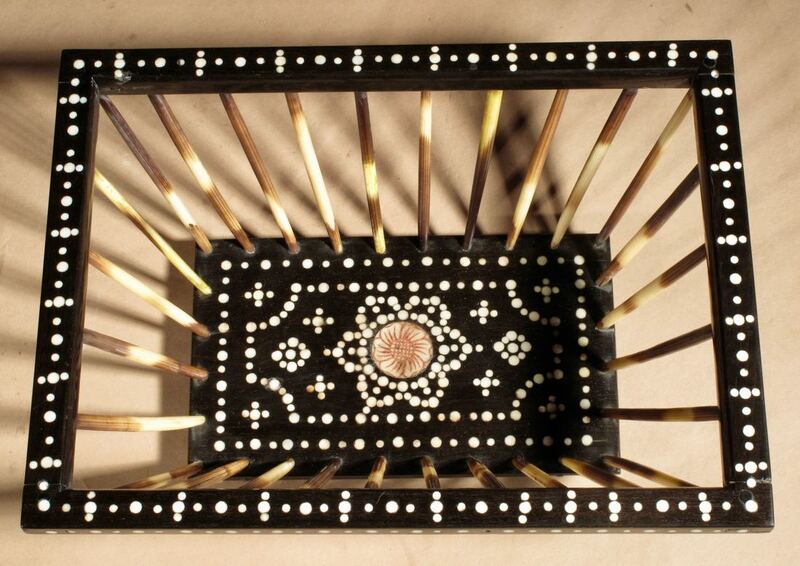 A very interesting and decorative original Sepik river shield. A very decorative Illuminated rare glass mirror frame made of hundreds of glass flowers. A rare Scottish Regency mahogany library secretaire. 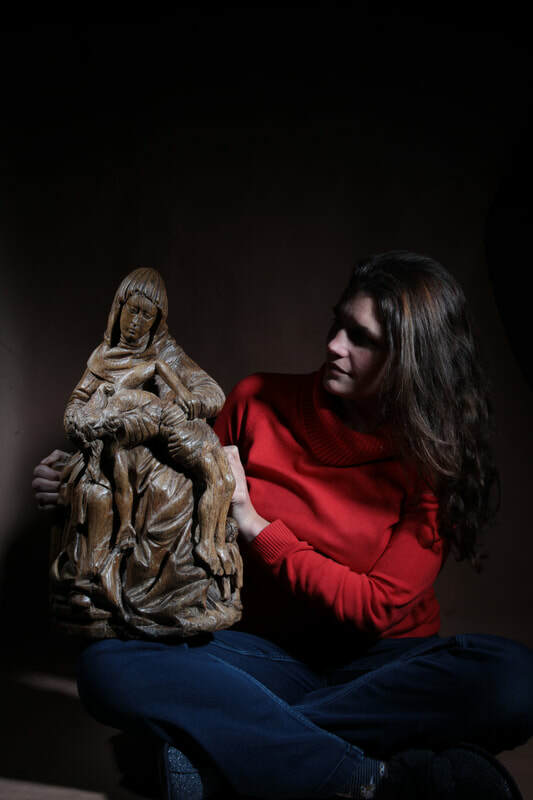 ,with the subject of the bust of a crownedLady, wearing a fur ( ermine?) stole. Wonderfull carving and detailed.Anglo / Dutch, end of the 17th. century. Still with the original old patination. Because of the subject and clothes, this could be Queen Mary. 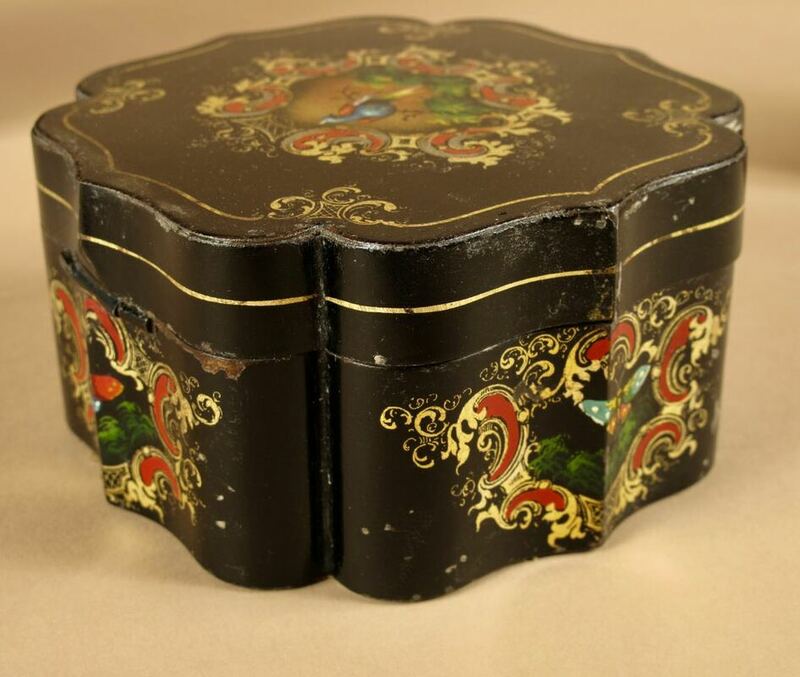 ​Still with the original lid. 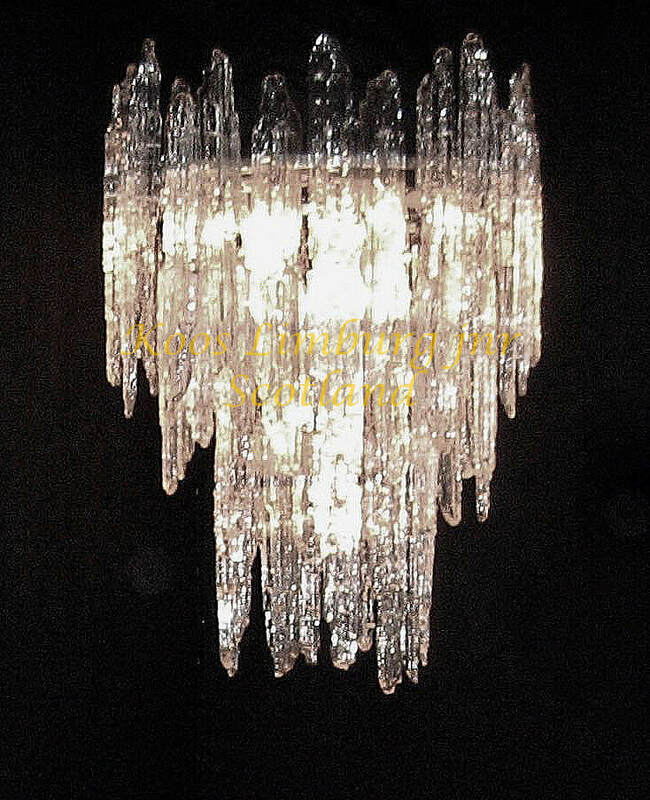 A very decorative and stylish leaded glass and brass hanging light. Still with the origin loose nozzles. made by himself for his wedding. With on the reverse the engraved text of his wedding. 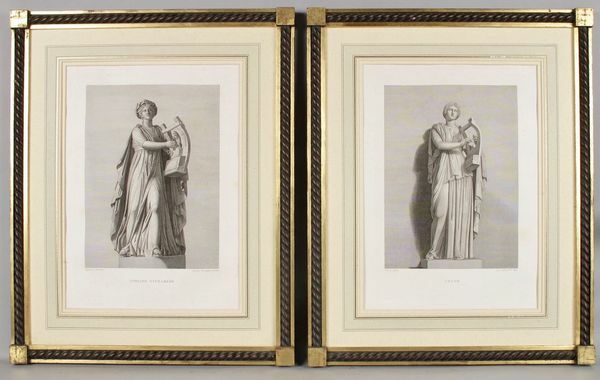 Still with the original marble frames. All in original condition, not restored. made for his wedding 18 february 1852. with Engelina Jager. Each relief engraved with text on the reverse. Als je niet en het dan is donderen. And lots on top of that. You were treated, but now not even half. 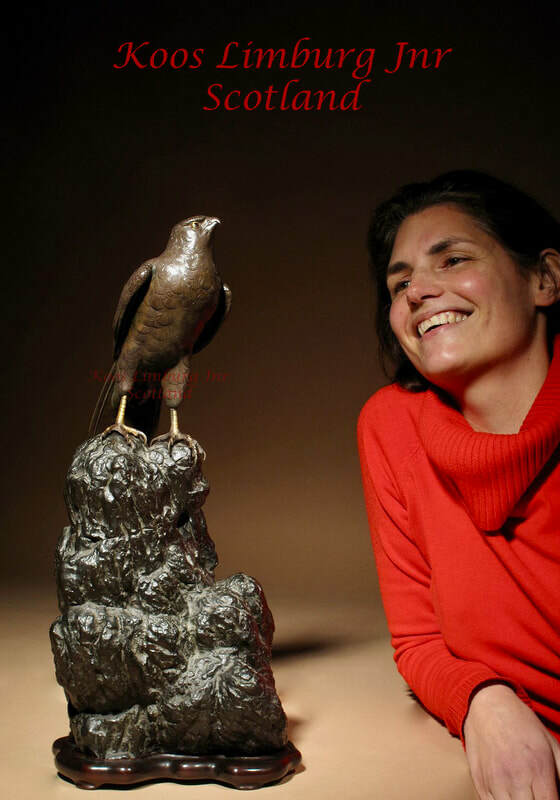 With Engelina Jager – it is a good soul. 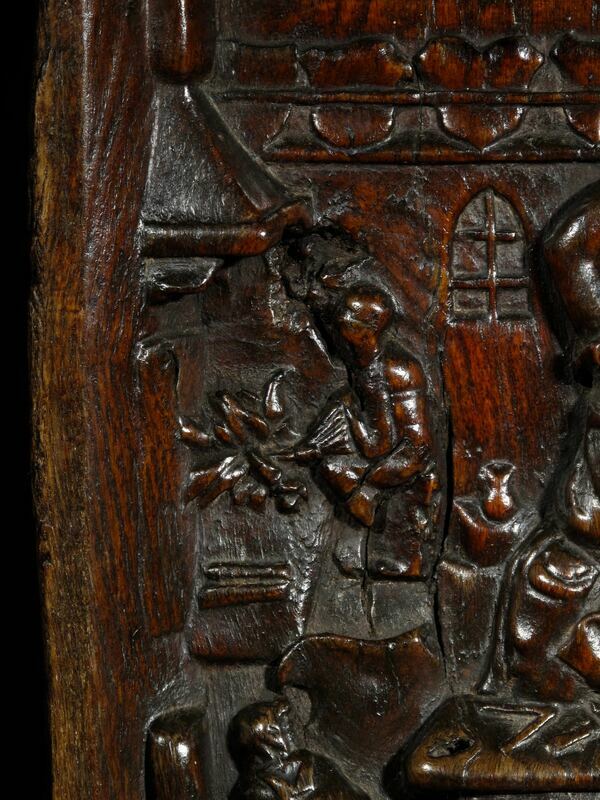 Interesting to see is that in the rim of the hat on the relief of the man there is a lottery ticket. 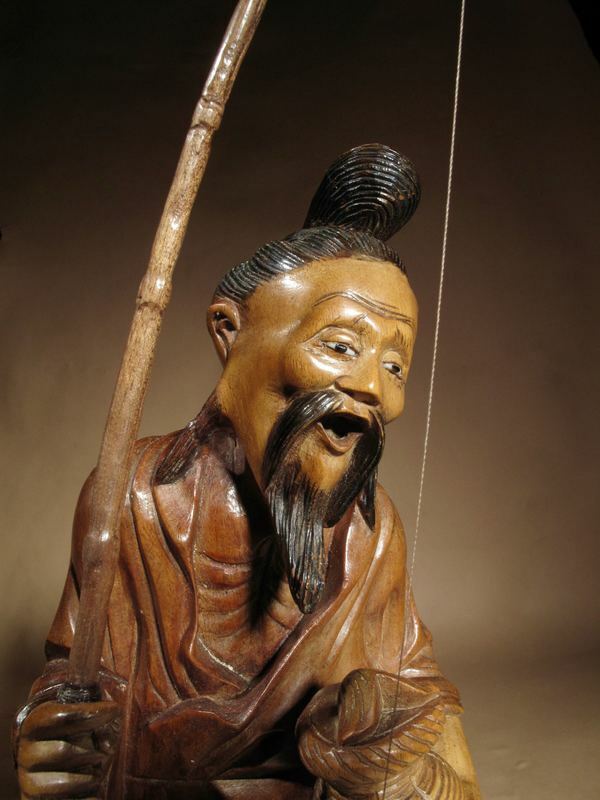 This has a typical symbolic meaning that the man has won the lottery. Still with beautiful old patination. the following text: Benin City. 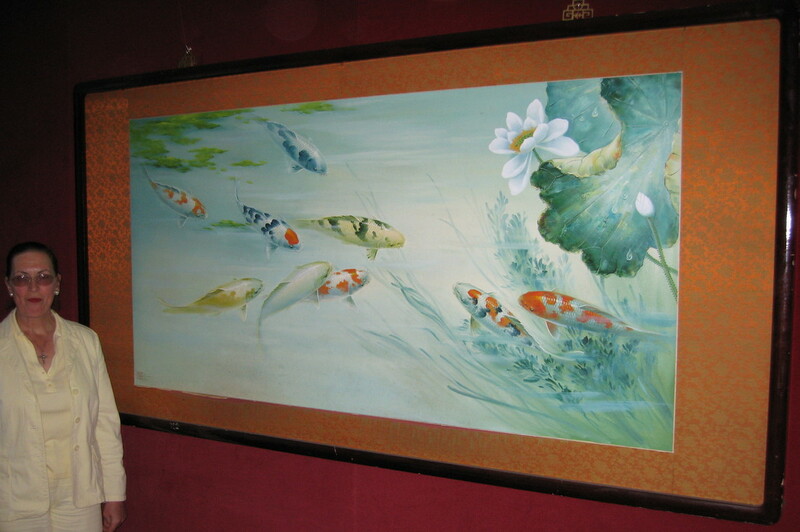 An unusual very decorative oil painting of koi carp, very detailed painted. Mounted in Japanese fabric and wood frame. Signed:Johnson TSA: and a painted seal mark. This company was a very famous company in Indonesia which sold jewellery, silver and gold to Roayals whole over the world and was very famous around 1900. 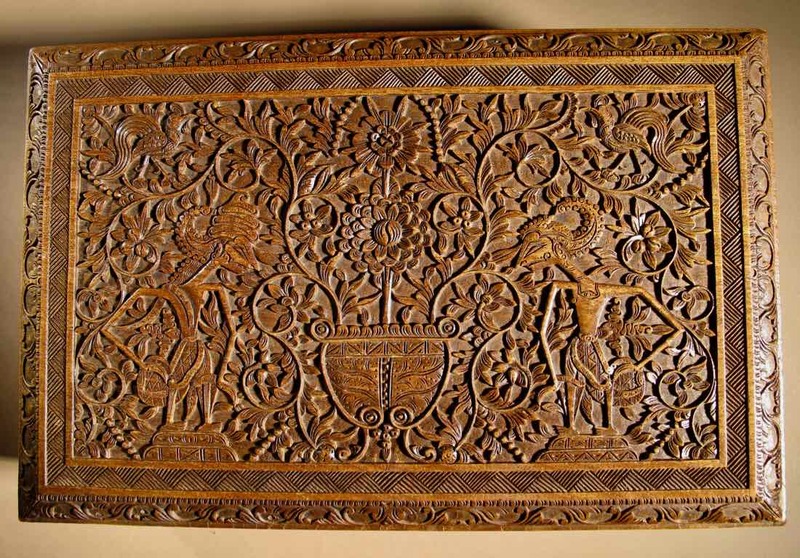 The long case clock is made of: Djatti wood, ( that is an Indonesian type of wood and very rare.) 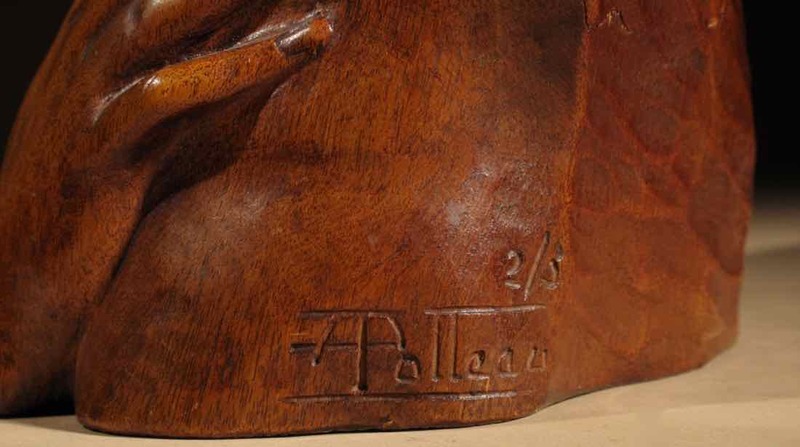 the original dial and hands are signed. The pendulum and the weights are original and the clock is high: 215 cm, wide on top: 58 cm and wide in the middle: 46 cm and deep: 25 cm. It is a heavy movement inside and there is a whole story to tell about the company. 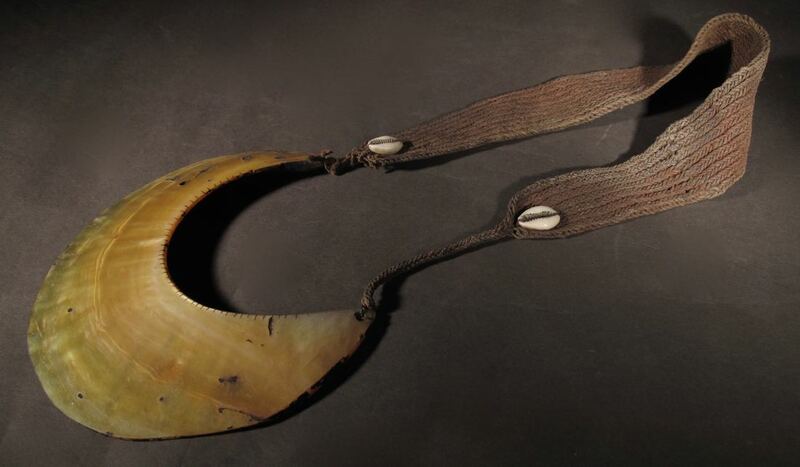 Historically interesting antique mother of pearl fishing lure before 1829. 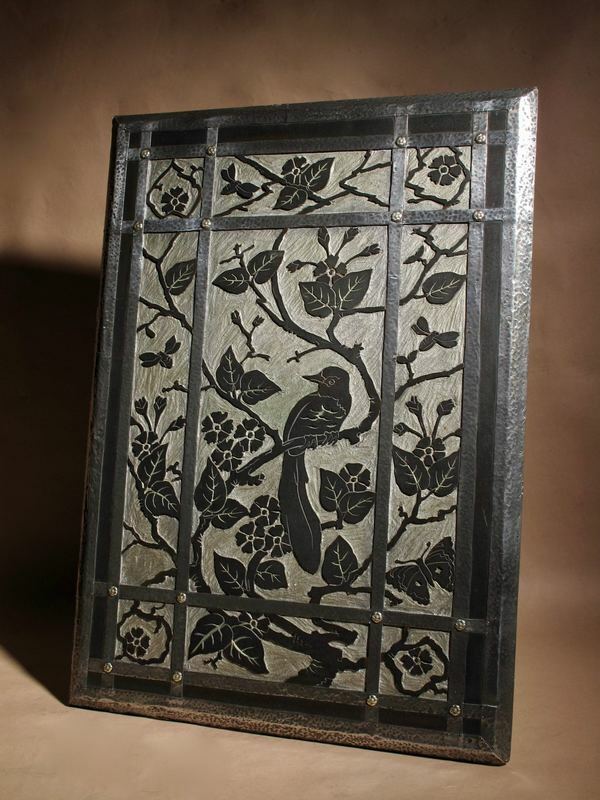 "Fishing hook made and used by pitcairn islanders 1829"
A Large very decorative and unusual Tiffany Style Leaded Glass Parrot and Fox Door Window still in the original wooden door with amusing decorating of a parrot with a cherry in his beak sitting in a tree with a fox looking up to two swallows with the sunset on the horizon. 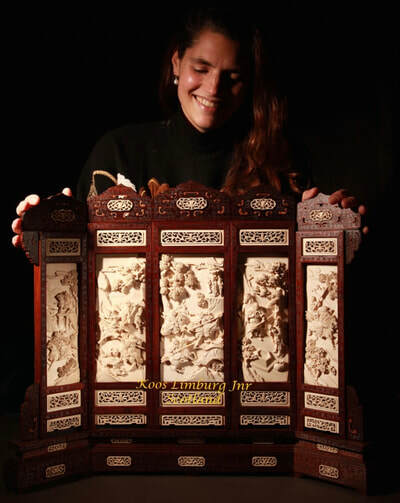 A magnificent Japanese cabinet with 13 panels including the doors, beautifully on laid with deep ivory carvings of flowers and some animals. 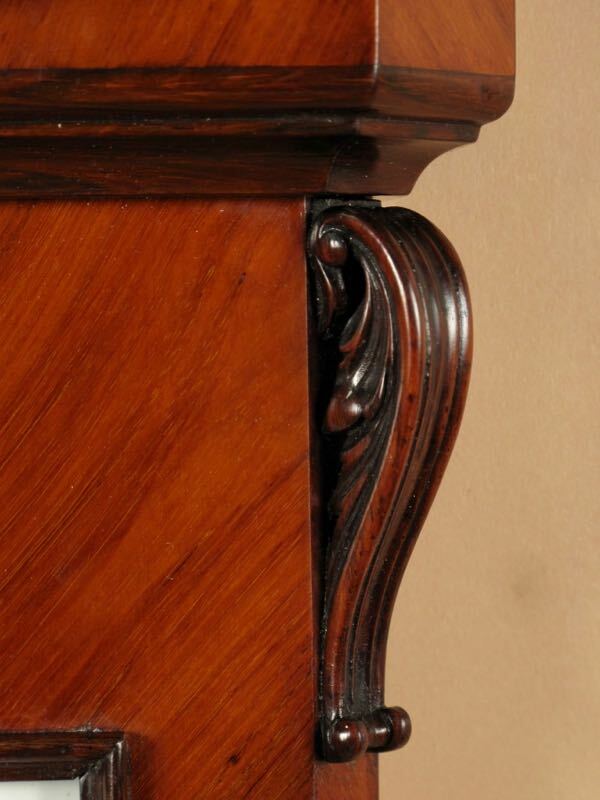 The whole cabinet is in a very good condition, of course you can see that it was used and has lived, but to say it simple, in “perfect” state. The top part is: 109 cm wide and 33 cm deep. 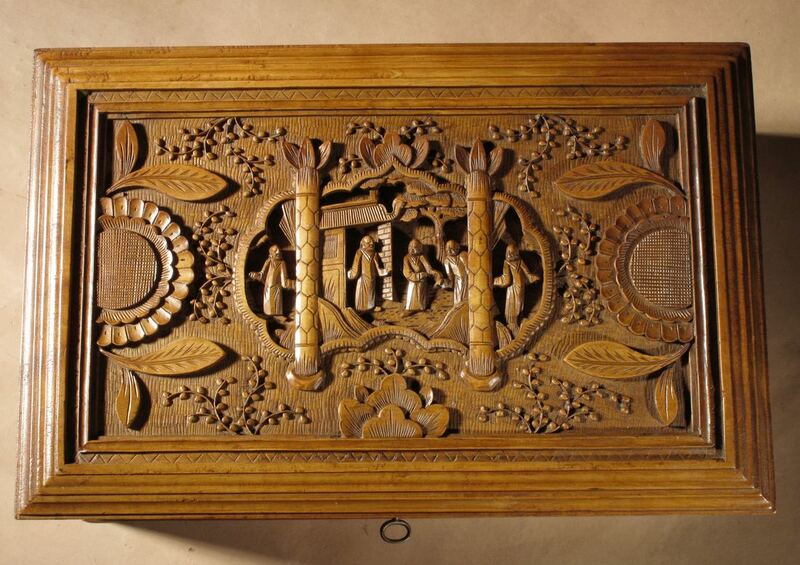 Also, the wood work is finely carved. Dates from the second half of the 19th. Century. of an angler’s catch of coarse fish and a float. 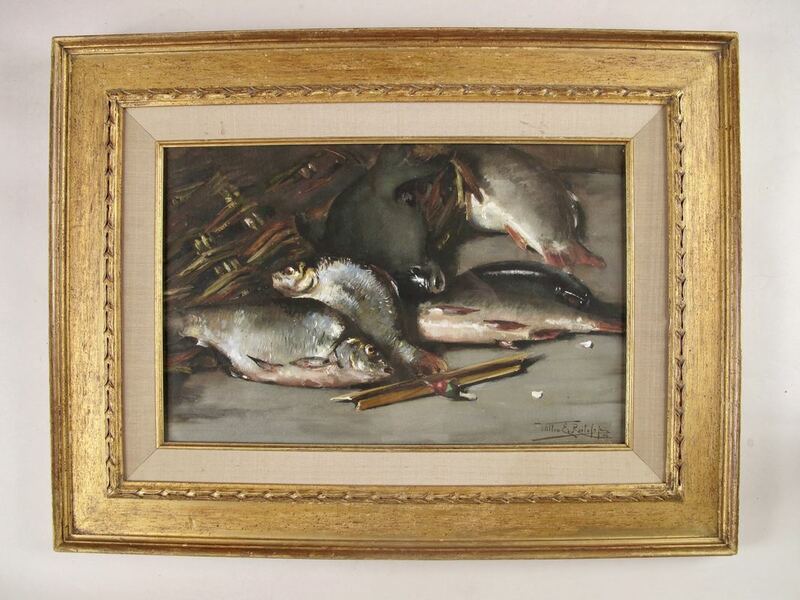 Born in Belgium: 1874, died in Holland : 1940.
of the time, he has painted sea fish. 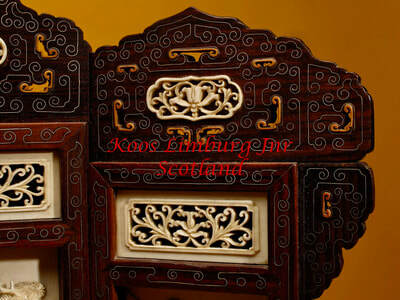 A very interesting European walnut cupboard, mounted with Japanese lacquered panels. Very fine carved with dragons, flowers and ornaments. 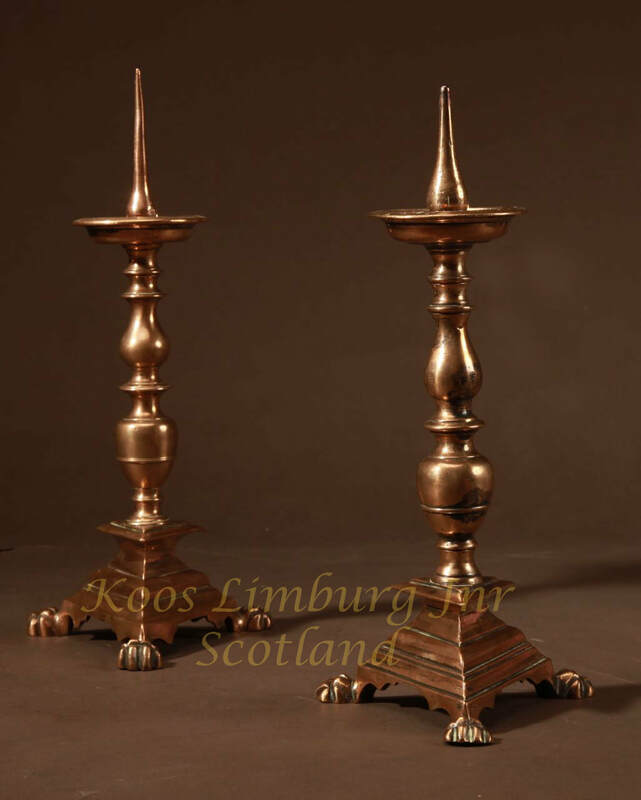 Original antique very decorative dutch brass companion set circa 1900. 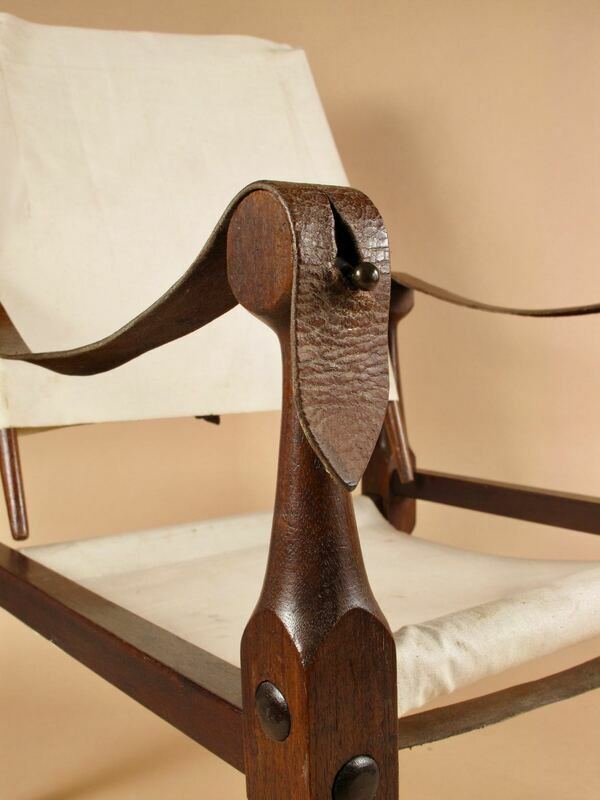 Stil in very good condition and very compleet with the tools. The wings of the mill you can turn by hand. 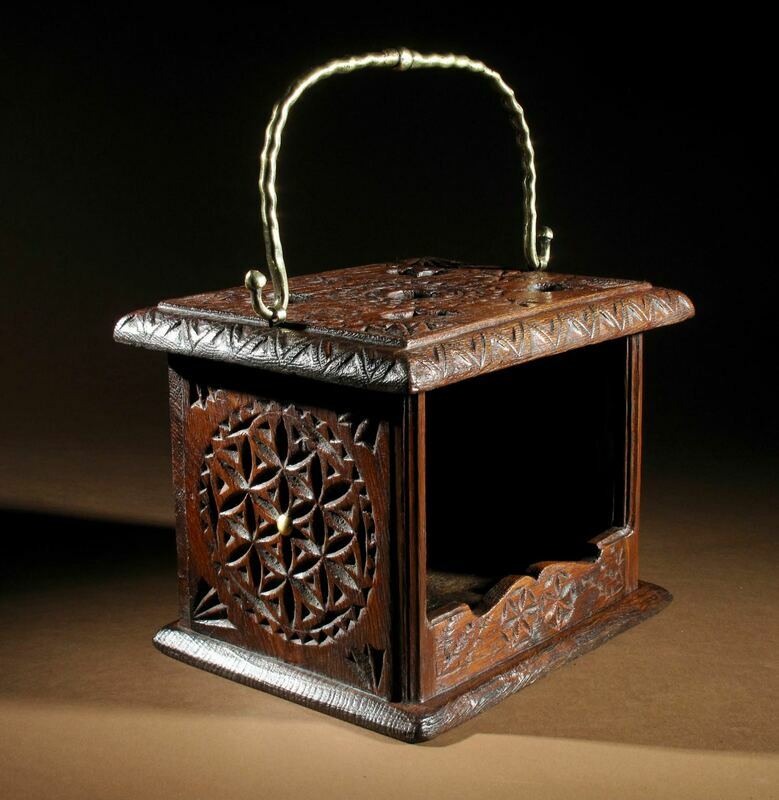 High quality decorative item in original condition. 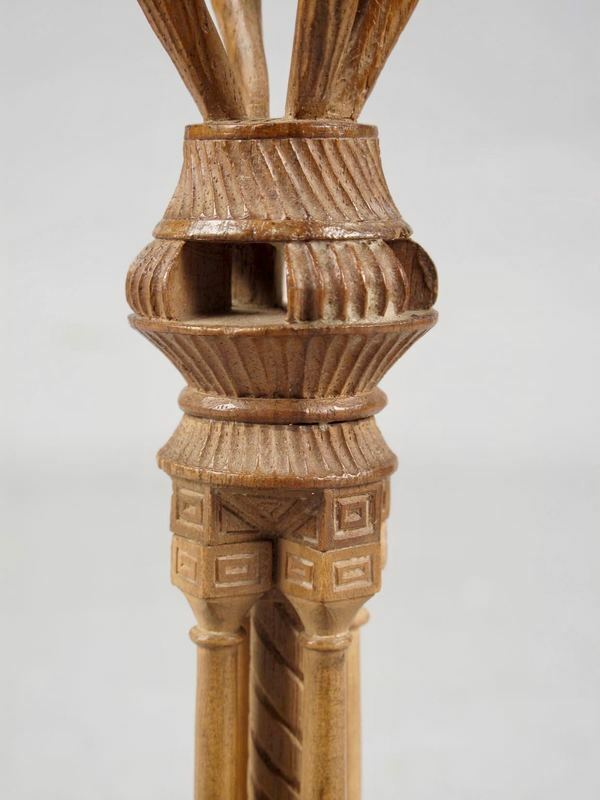 Original Medical Chinese Rare Carved ivory Phallus. 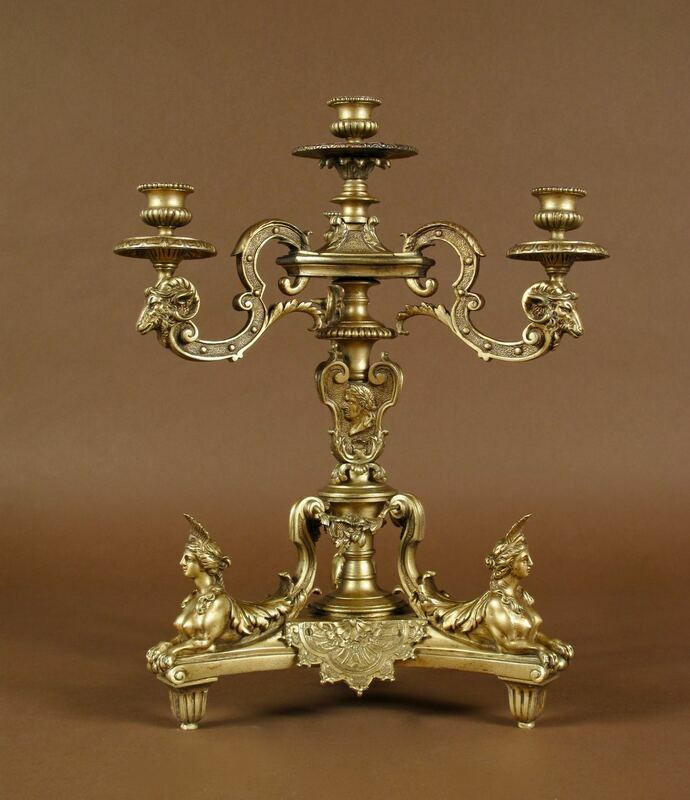 A rare antique original Royal Worcester porcelain hanging light circa 1900/20. 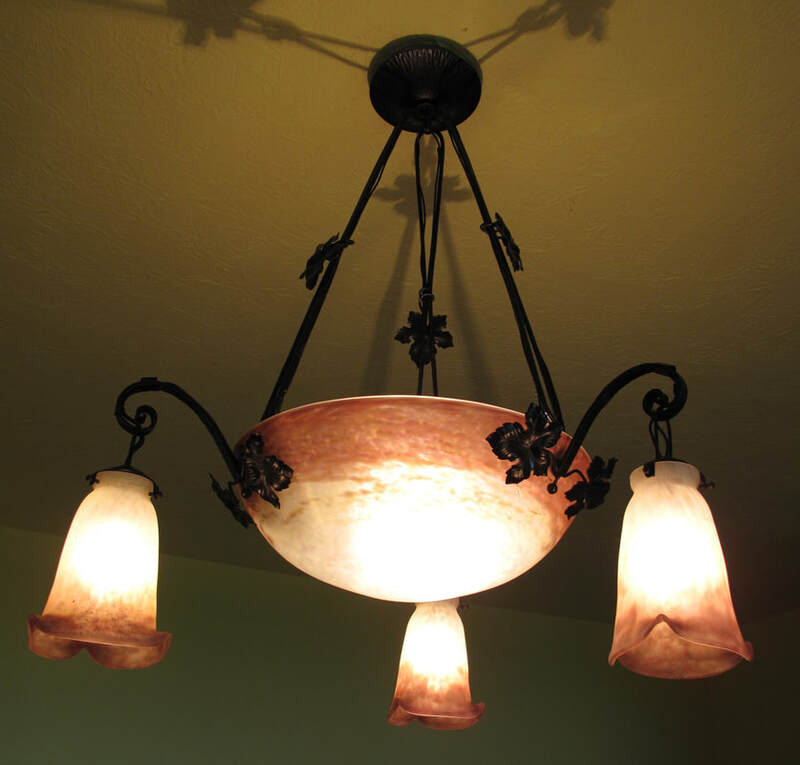 Still with the original porcelain bulb holder and fittings and chains. 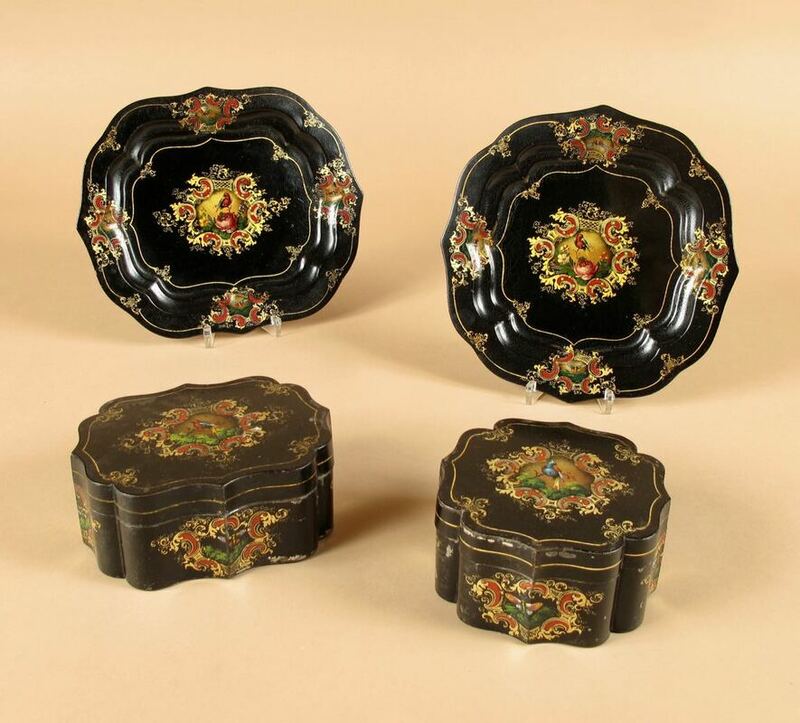 Stamped:"Royal Worcester England" with design number and R D N number. 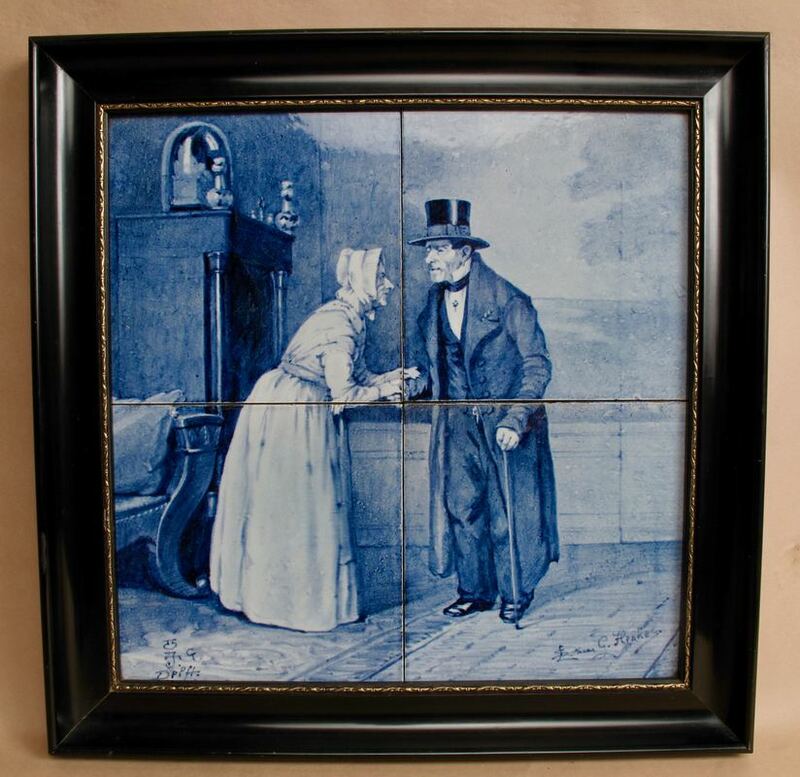 An early and Rare Dutch Delft 4 tile tableau. 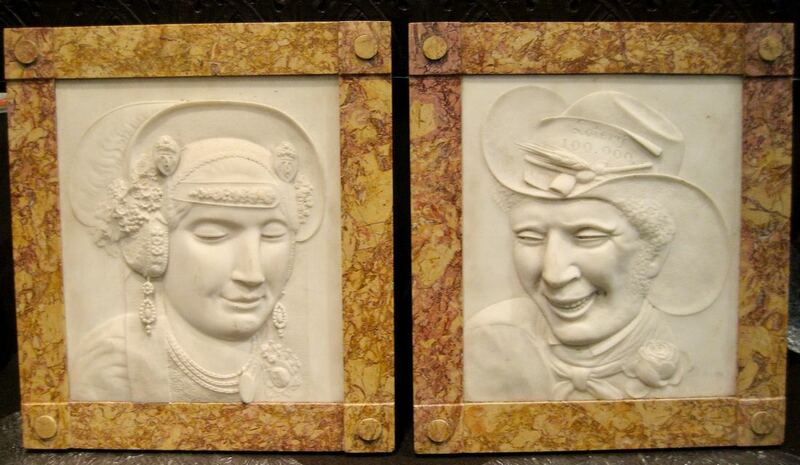 Usually you find Porceleyne Fles tile tableau's with the subject of landscapes, town views or portraits. 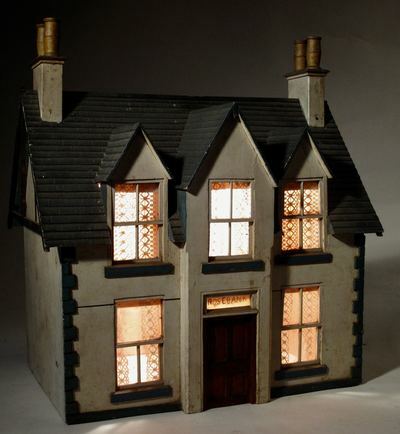 After an model of 12/13th century. Partly gilded brass/bronze with beautiful old patination. Still in its original frame. With the paper label of the framer in Houndsditch. In very nice antique condition, for a cork carving in very good condition. 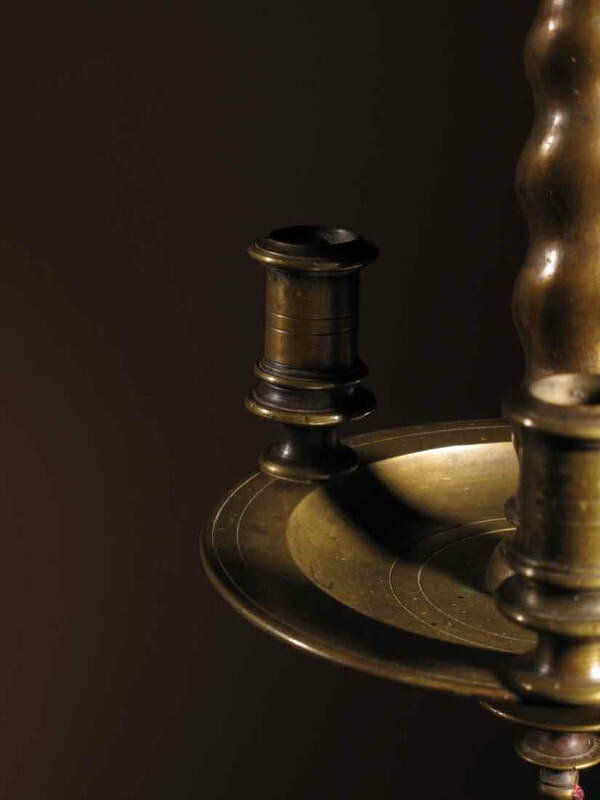 Batavia / Ceylon, 18th. Century. all still with the original leather/suede cushions. 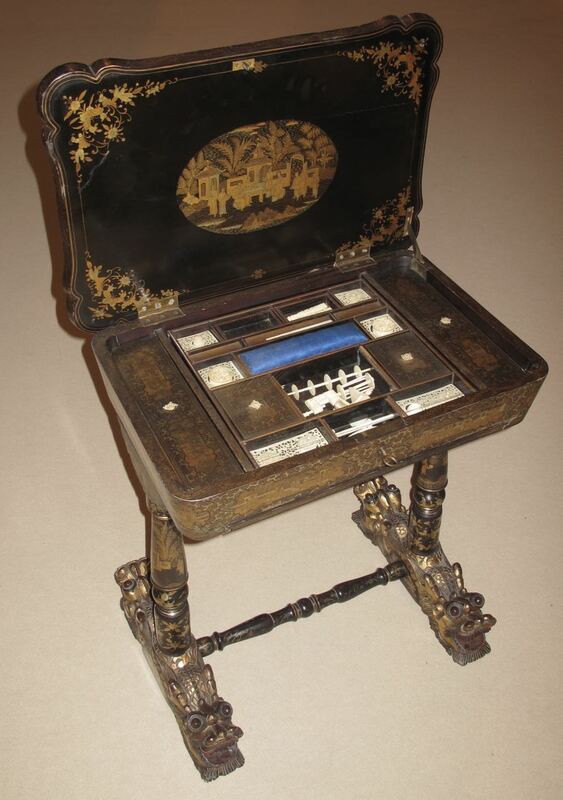 A originally lacquered sewing/work table still with the original gold paint work, Chinese, 19 th. 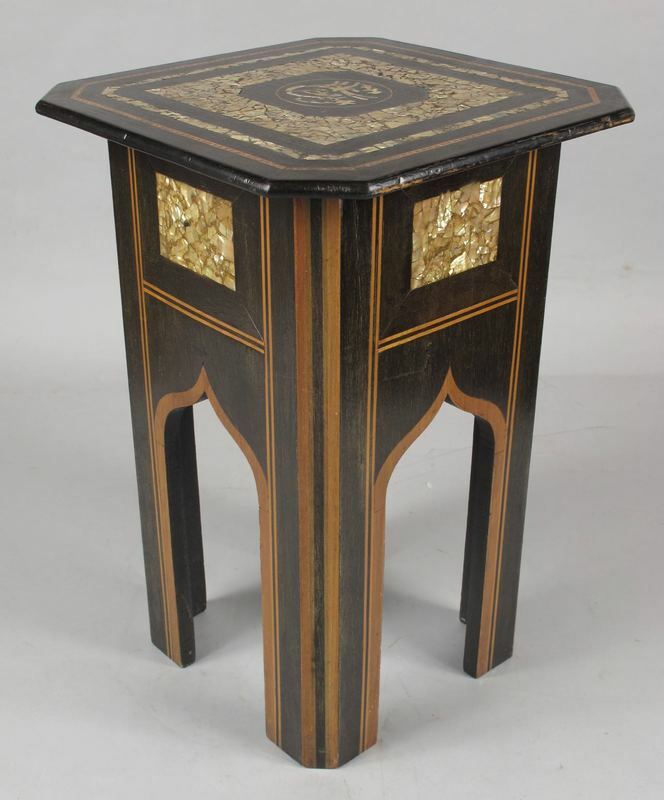 century, What is rare by this table, is the overall condition, the golden paint work is still there. 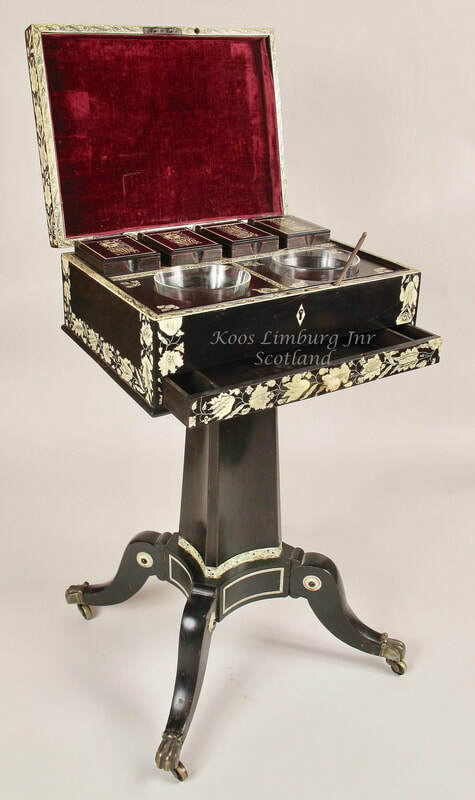 Of course you can see that it was used, but for this type of lacquer work it is in unusual good original condition. 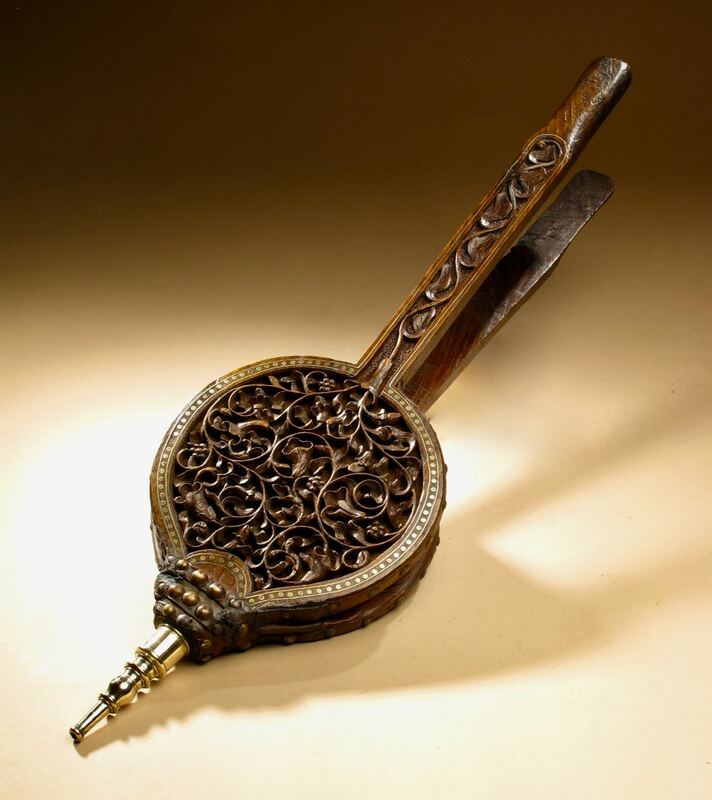 And also what is very rare, there are a lot of ivory sewing tools and mounts still there . The height of the table is: 75 cm, the max. size of the top is: 66 / 45 cm. taken from three different places of the camel. 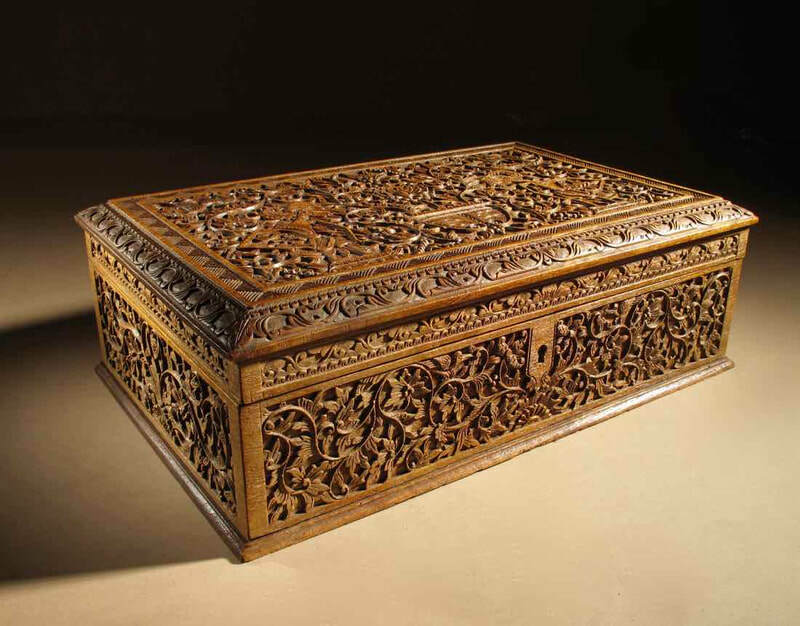 An original Kashmir (India) inlaid marble chest table. 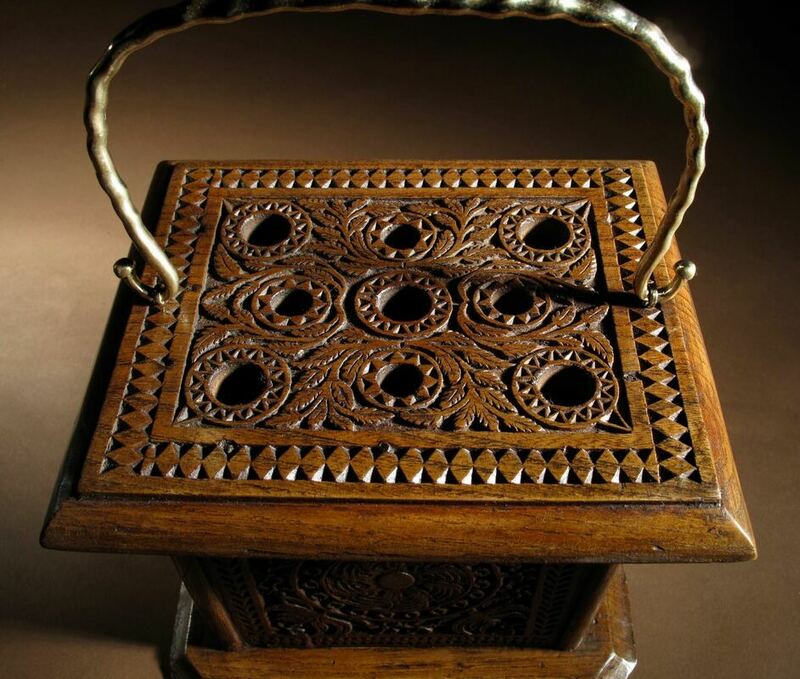 This oak table is specially made for this beautiful inlayed marble chest board, also in the second half of the 19th century. only a square dial and hood. The clock dates from circa: 1705. ​showing a fisherman and woman. because Rozenburg only made 10 of them each year. Prov. An Estate in Scotland. 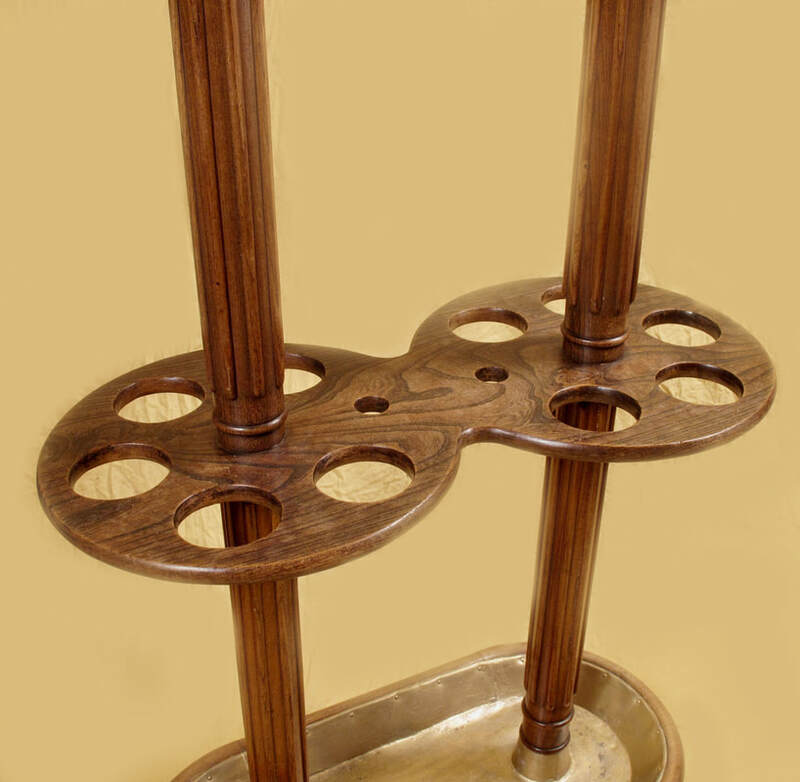 A unique, very decorative Djatiwood sable stand. 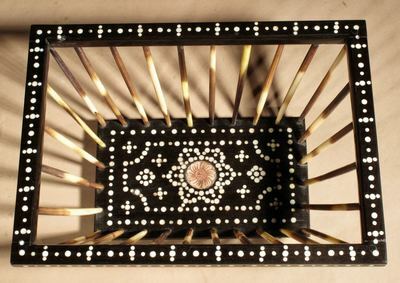 Mounted with copper rails with moving hooks. 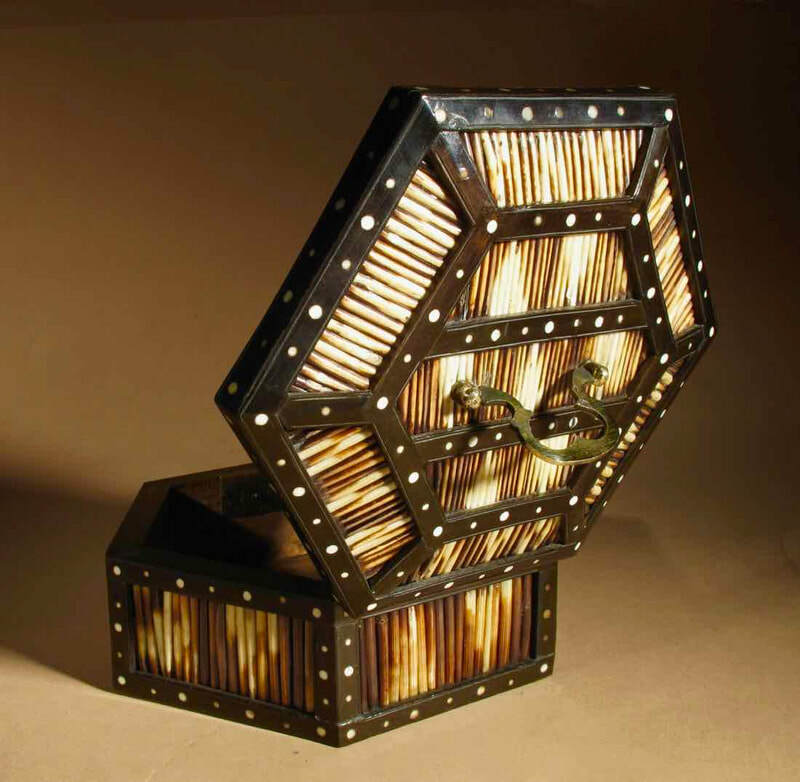 Inlaid on both sides with copper sables. 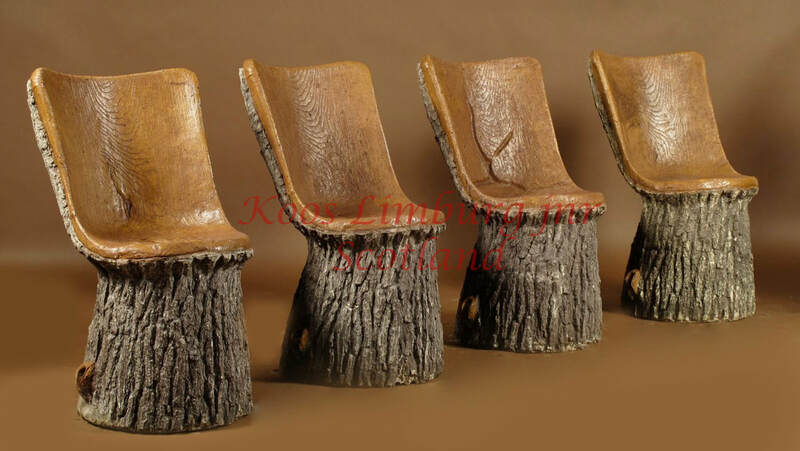 Designed by: Chris Wegerif, who was the owner of Arts and Craft Den Haag. 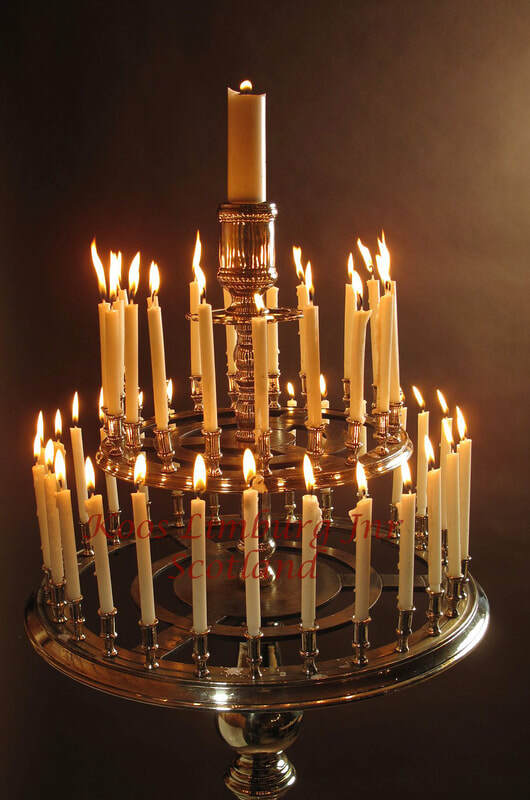 Which was the birthday of Prins Hendrik. 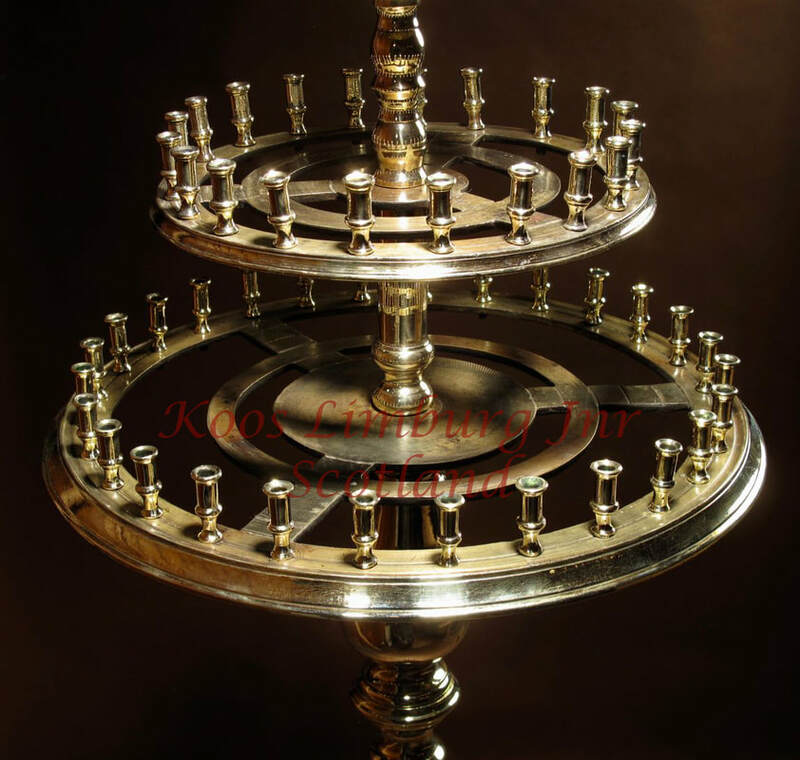 And in the centre at the top the Royal Crown. 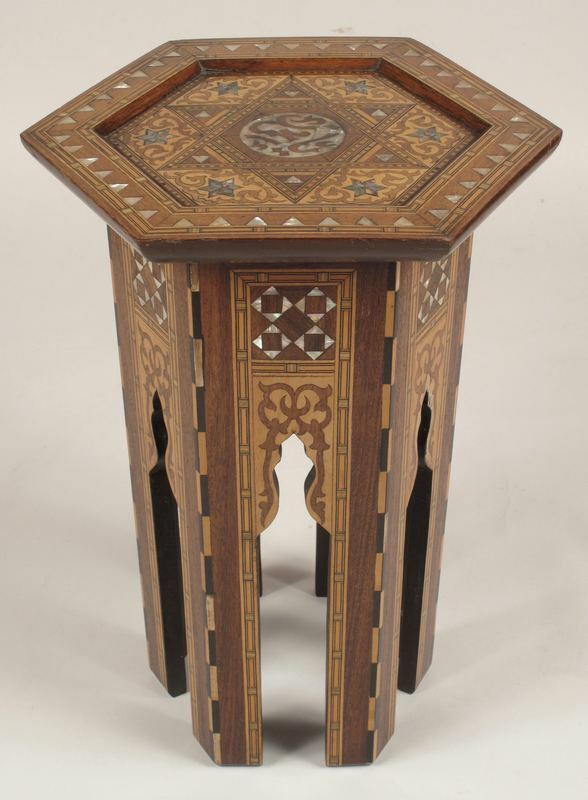 An original and very decorative Islamic table. 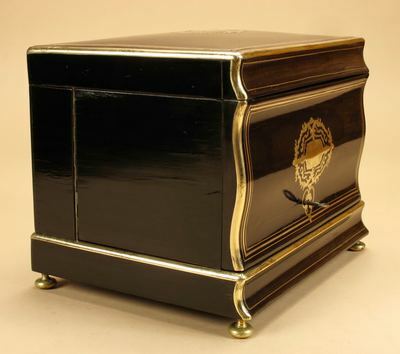 Inlayed with ebony and satinwood and Mother of pearl. 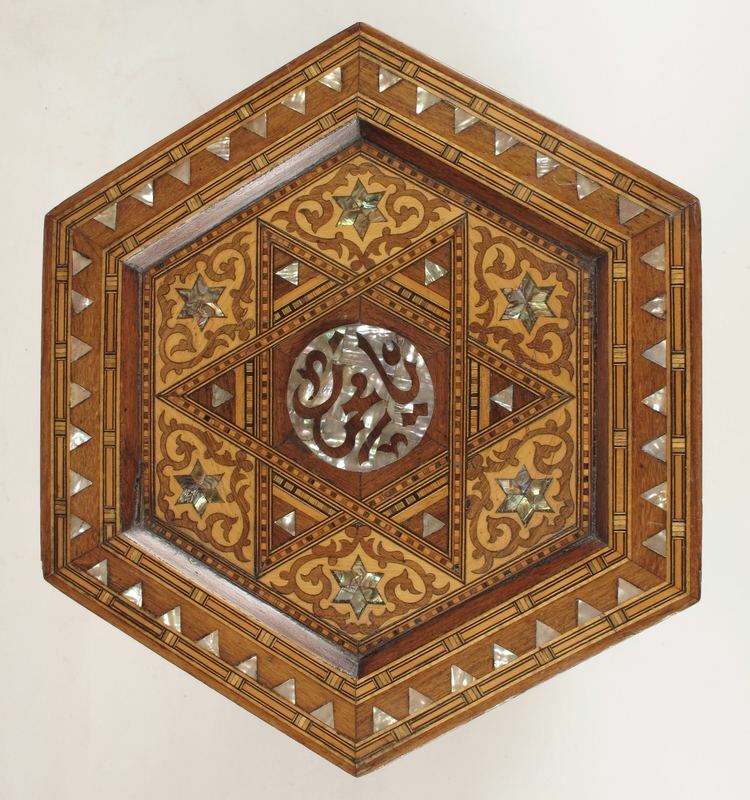 the top in the centre inlayed with mother of pearl Islamic symbols. Hole over with a beautiful old patination. Wide: 78 cm, deep: 72 cm and high: 81 cm. 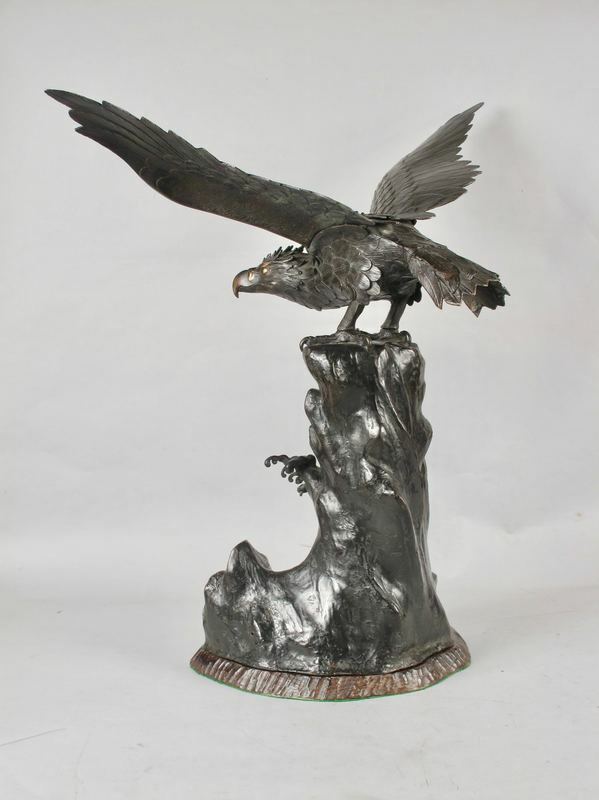 The subject shows an eagle standing on a rock edge of the sea. You can see the magnificent water drops of the waves agains the rock. 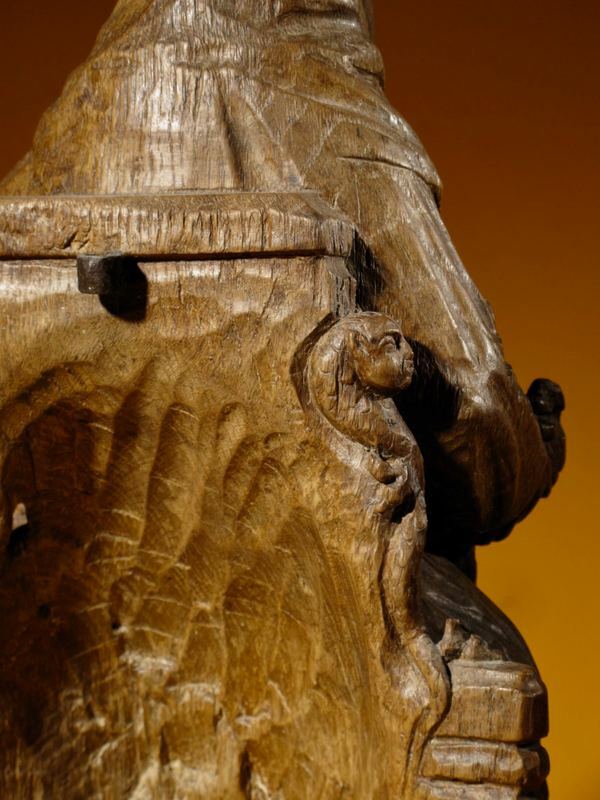 The sculpture is hole over in original condition and still with the original wooden base. 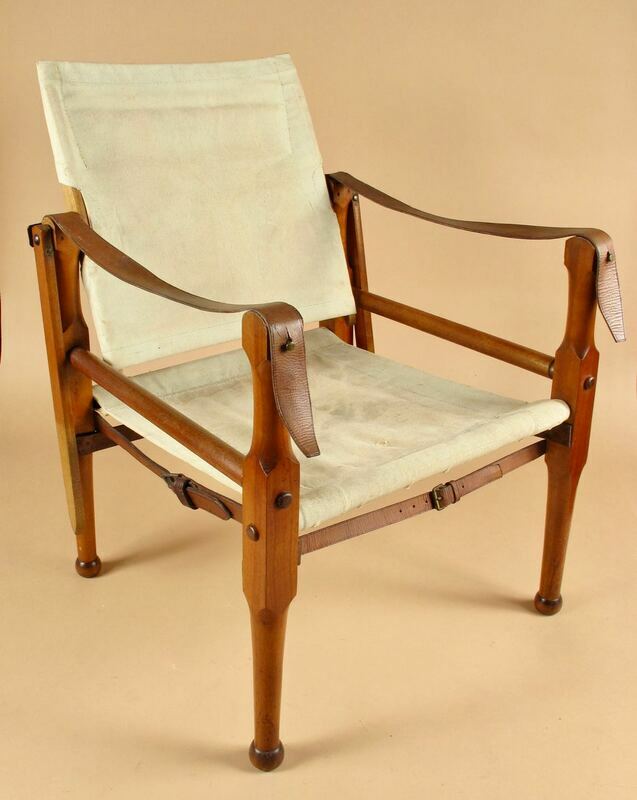 In very good original condition no repairs or what so ever. 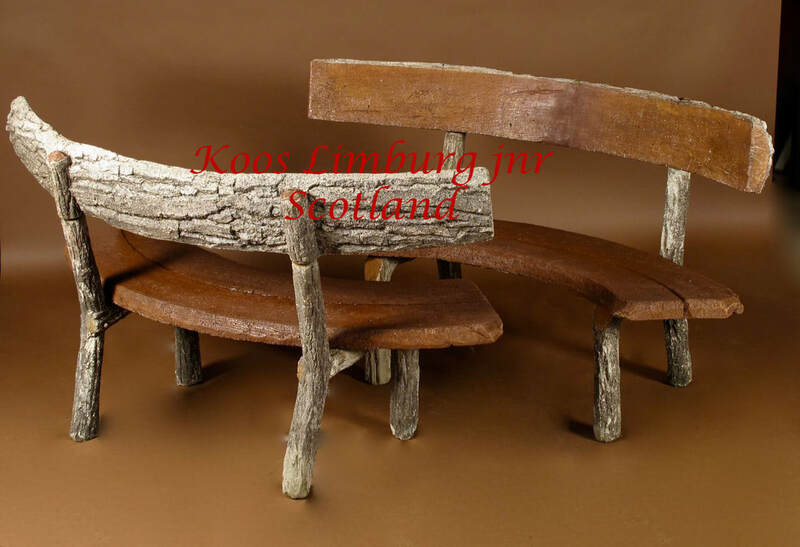 The sculpture is build up in 5 loose parts excluding the wooden base, this is the way it was made, a very impressive sculpture! ​ 85cm high from wing tip to tip 90cm the base is 40cm wide. 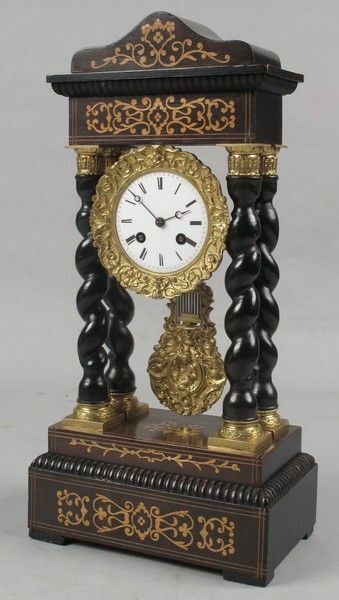 Original antique very elegant french simulated tortoiseshell mantel clock. 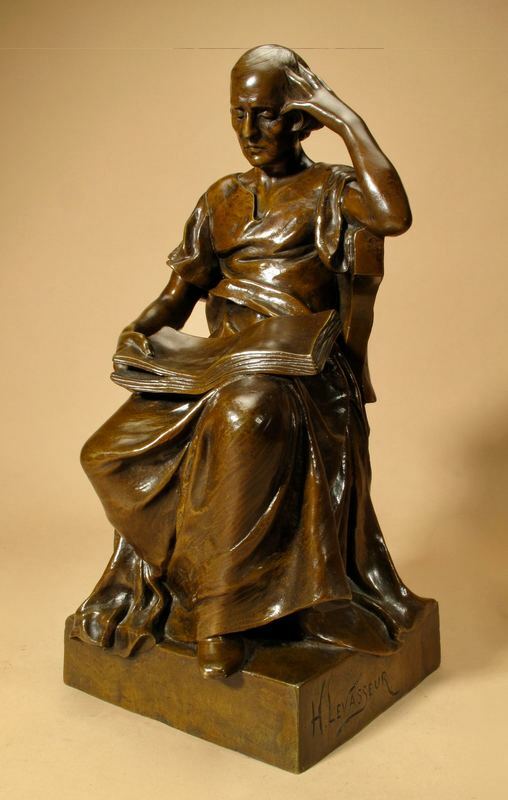 Still with the original gilded bronze and hands. Original cleaned movement with balance escapement in working order with key. 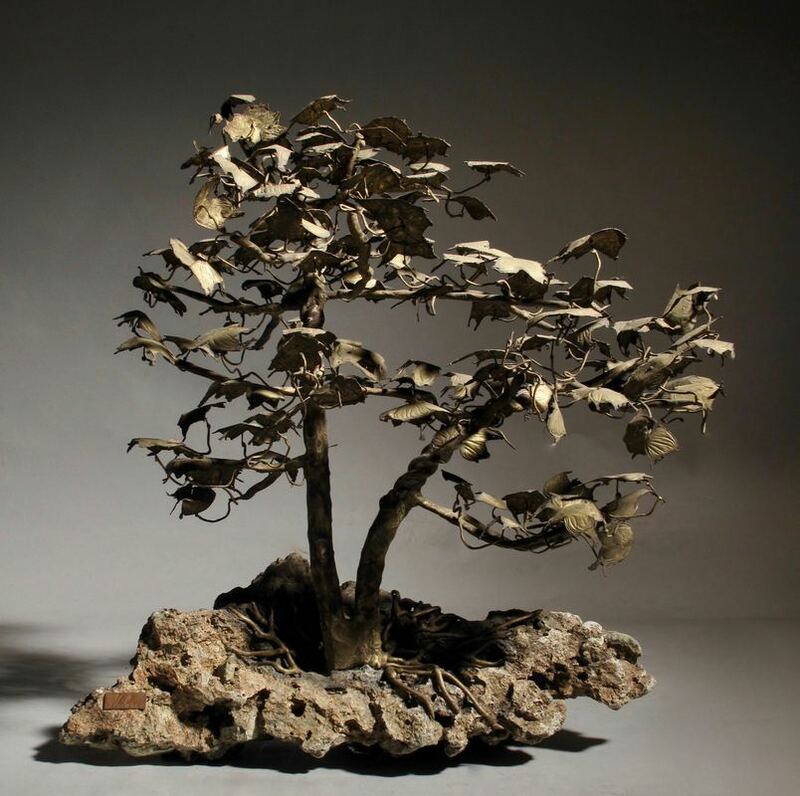 A very decorative and beautiful made miniature tree, standing on a natural rock. 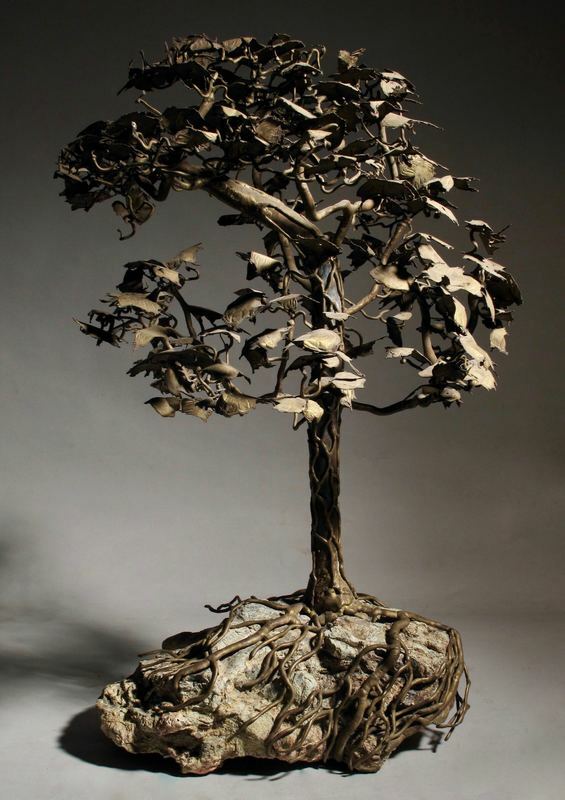 The bronze tree is very fine detailed, made also the roots who are growing around the natural stone base. This is really a piece of art! 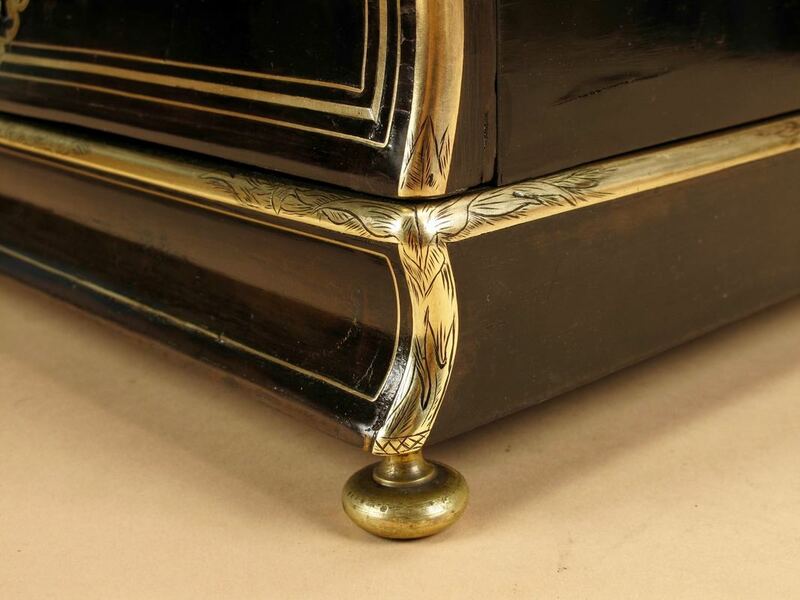 Original German French Rosewood Chest of Drawers. 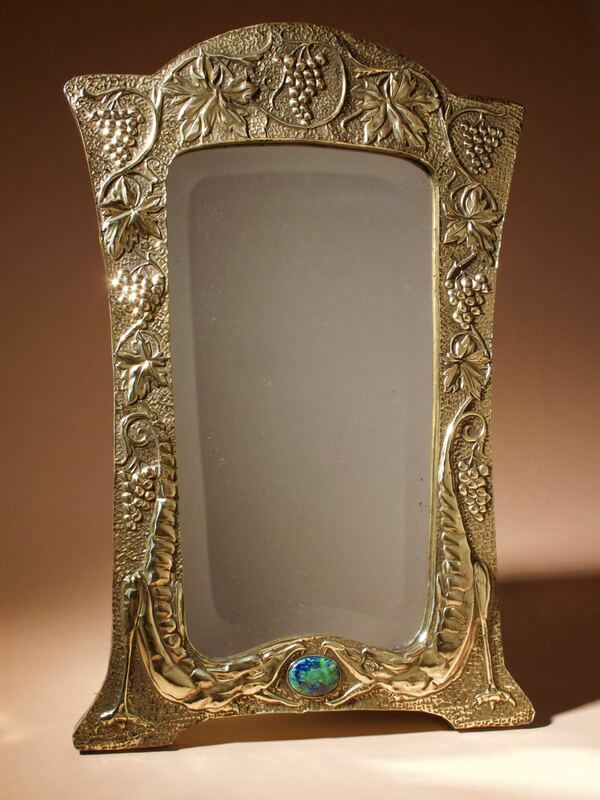 With above a hand carved gilded mirror still in the untouched old condition. Very interesting is to see that the table is decorated with Chinese dragons and Chinese symbols, typical for furniture made in Srinagar. 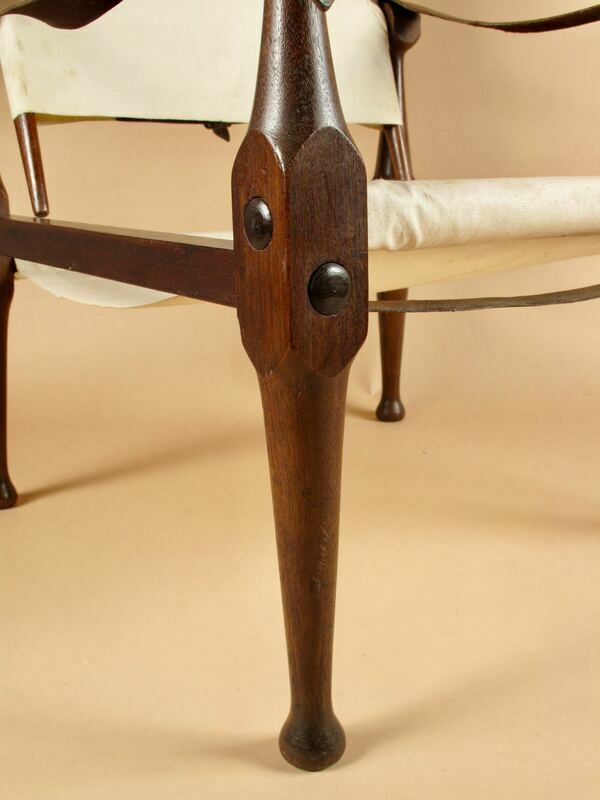 In original very good condition with nice old patination. 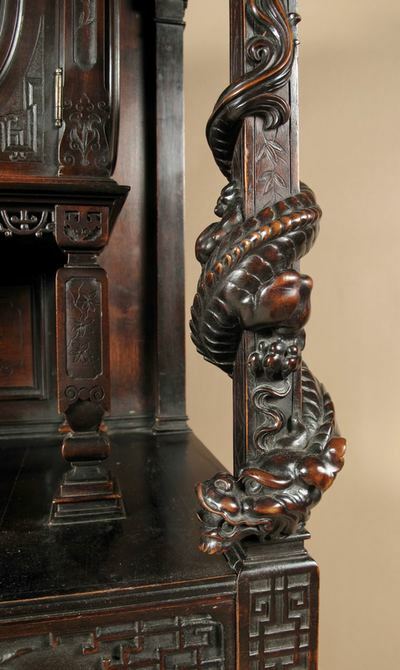 beautiful carved after a design of Daniel Marot. 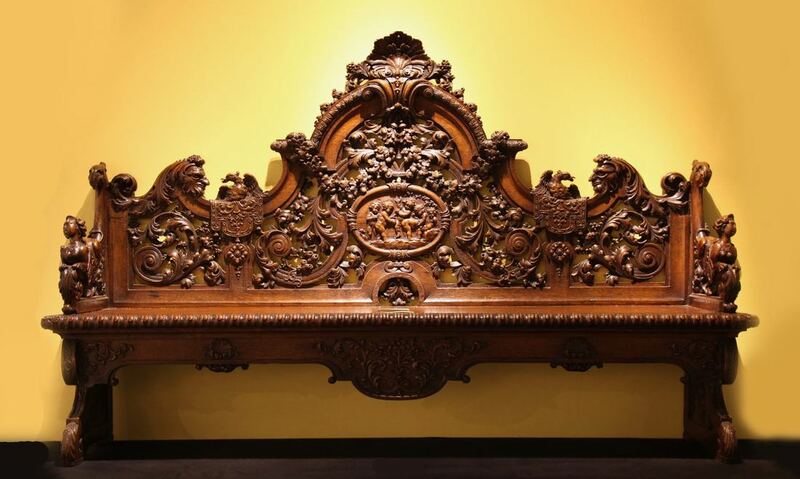 the bench dates from circa: 1715.
the same Satyrmasks are carved out above the front door. 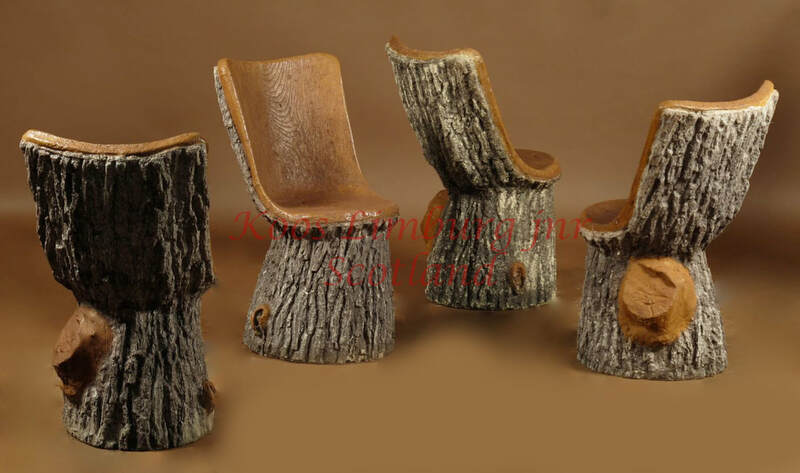 after designs of: Daniel Marot. These tiles have exactly the same panel and subject with the playing children as on our bench. between our hall bench and the blue and white tiles made for Hampton Court. Signed: Defsine par Bartolini / Gravé par Pierre Fontana, de Rome. 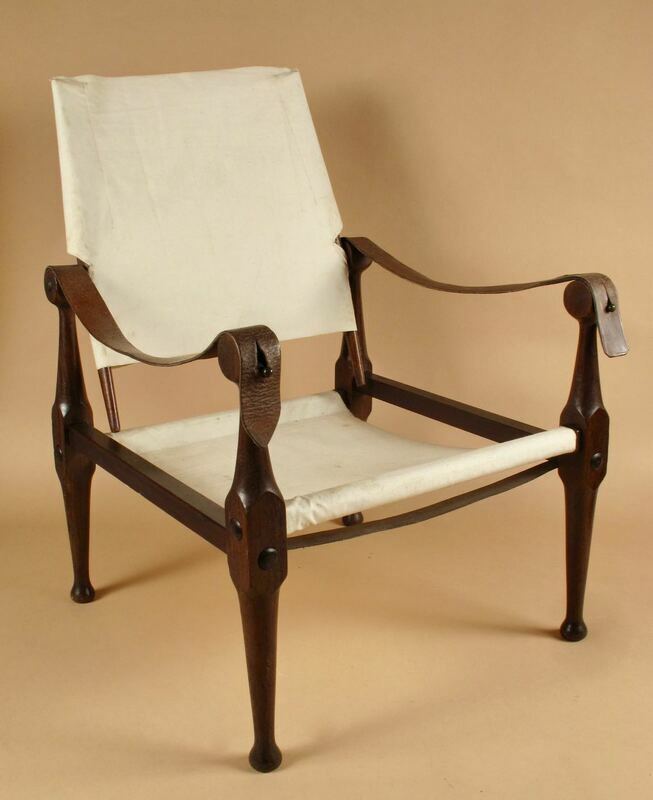 The frames contemporary but in the classical style. 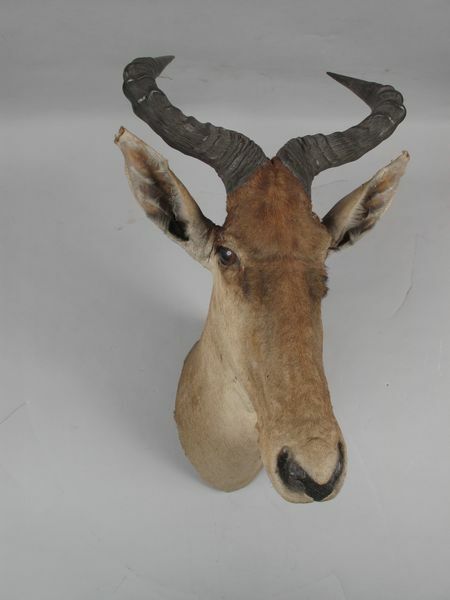 With original taxidermy label at the back. 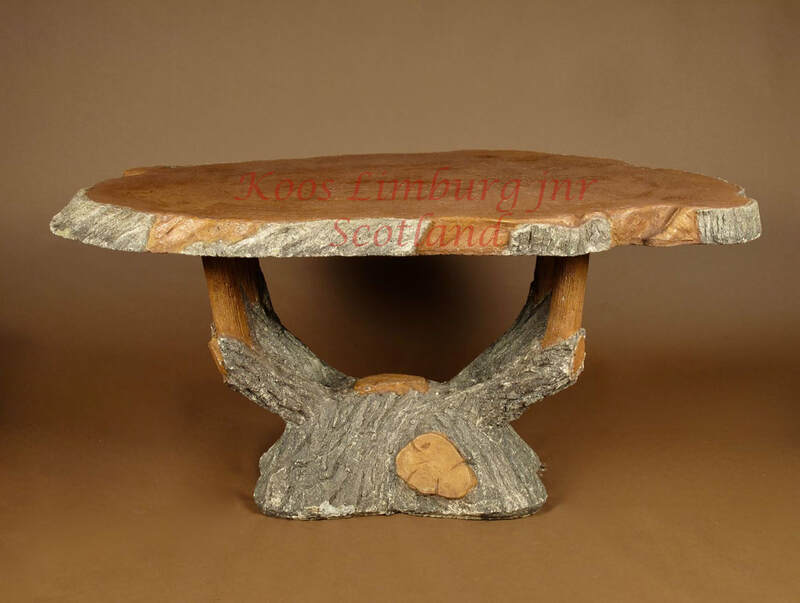 The bronze tree is very fine detailed made also the roots who are growing around the natural stone base. 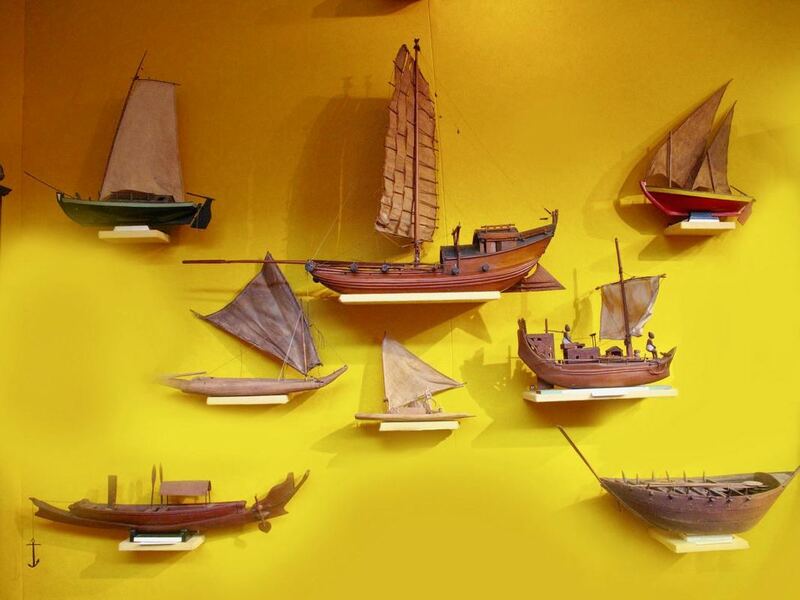 A very interesting international collection of eight ship/raft models. 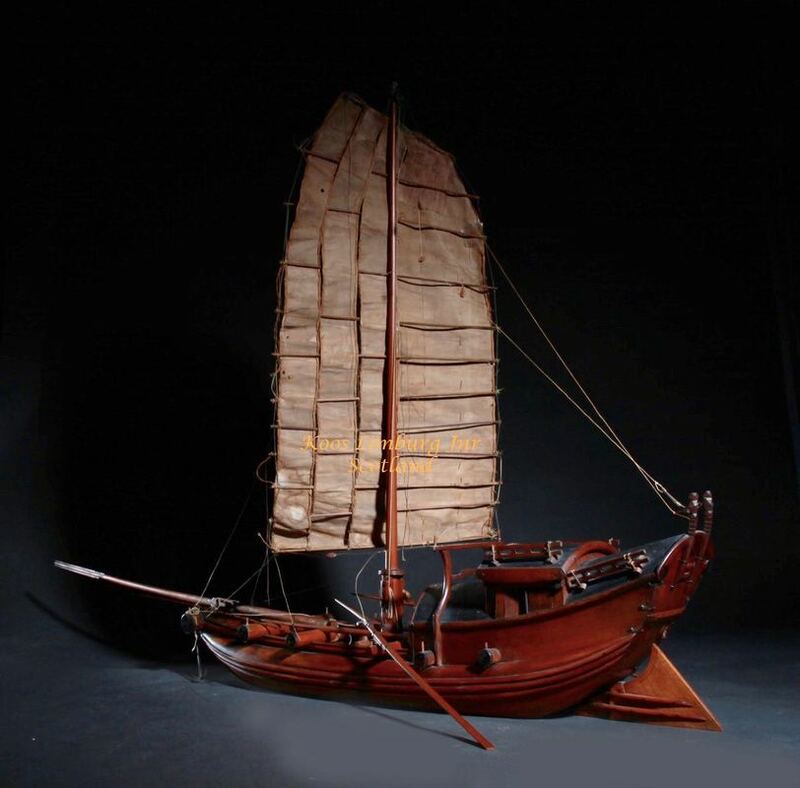 ​With very interesting documentation and old photographs about this type of models. 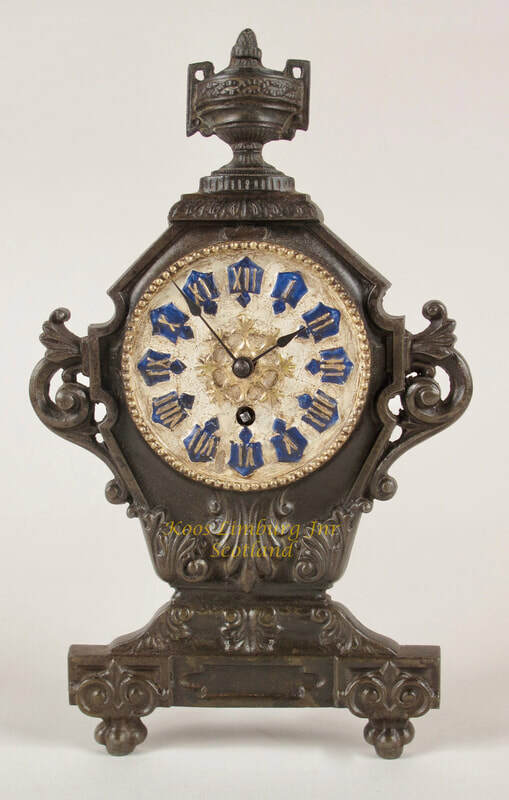 A very decorative and interesting art nouveau Black Forest carved oak and painted wall clock. 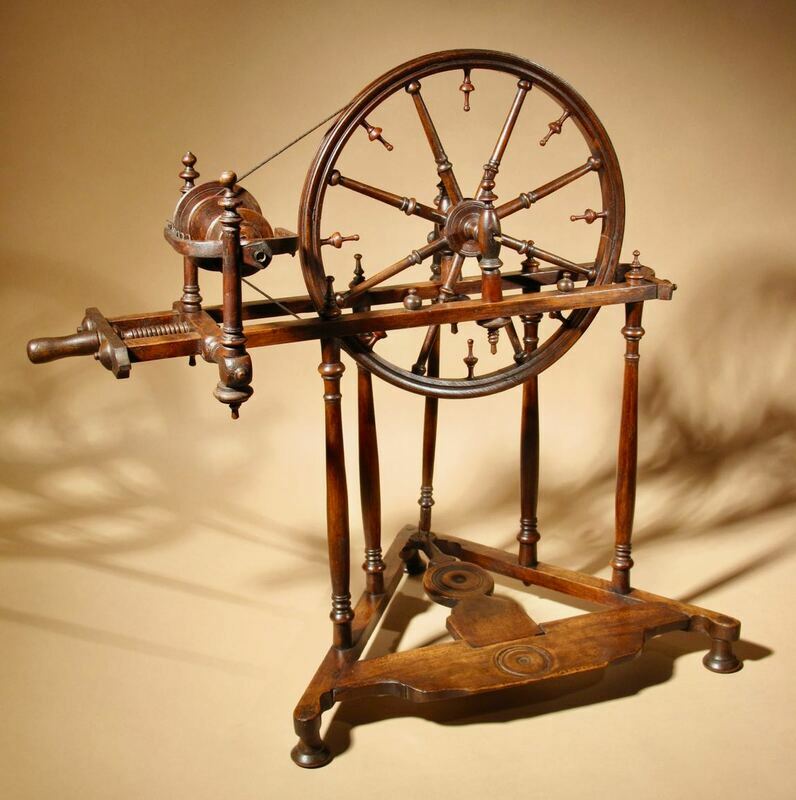 and with the original movement. Ph. Haas and Sons in St. Georgen. where Ph.Haas and Sons had a stand. 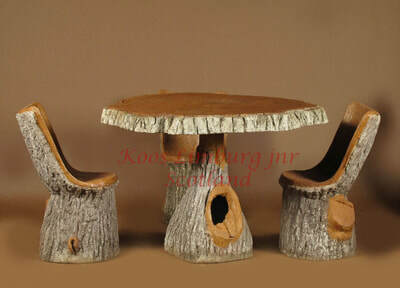 ​130cm high 49cm wide 15cm deep. 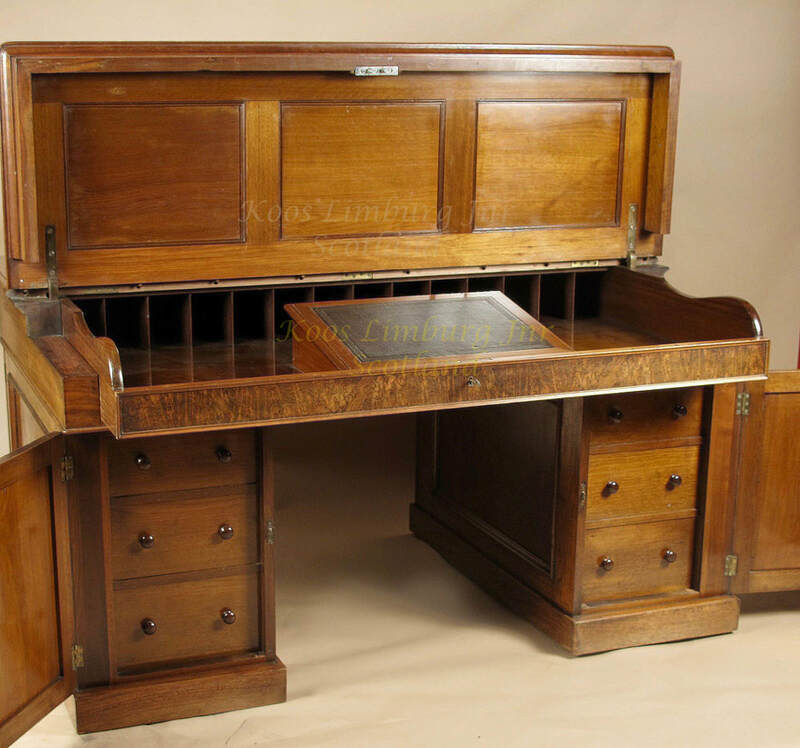 and burr walnut writing/ partner desk. England, first half 19th. century. 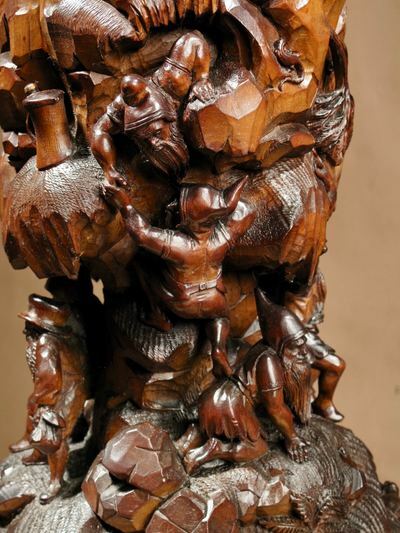 Still with the original patination. 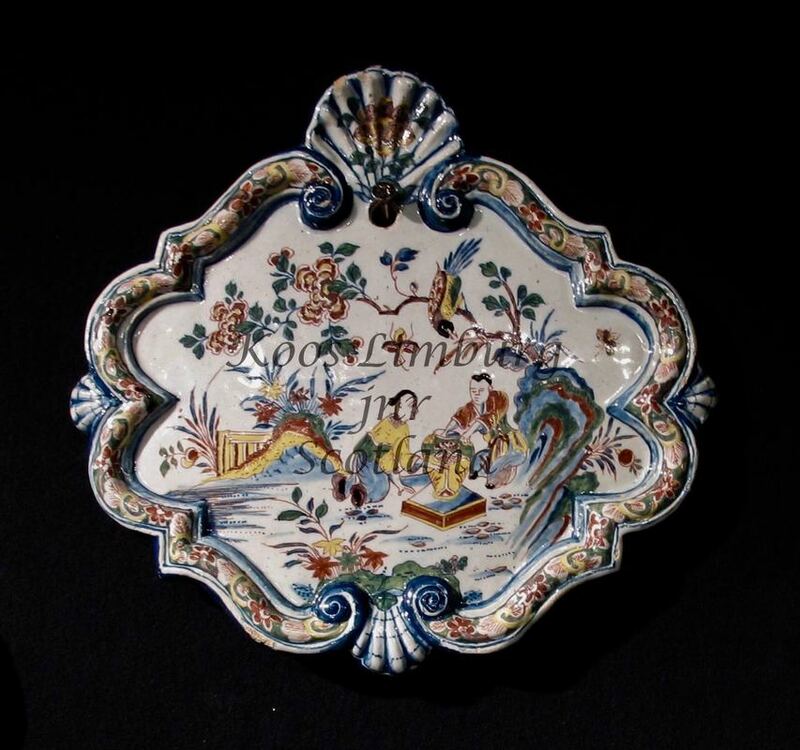 Signed: Jan Gobels Amsterdam, Jan Gobels was working until circa: 1767. 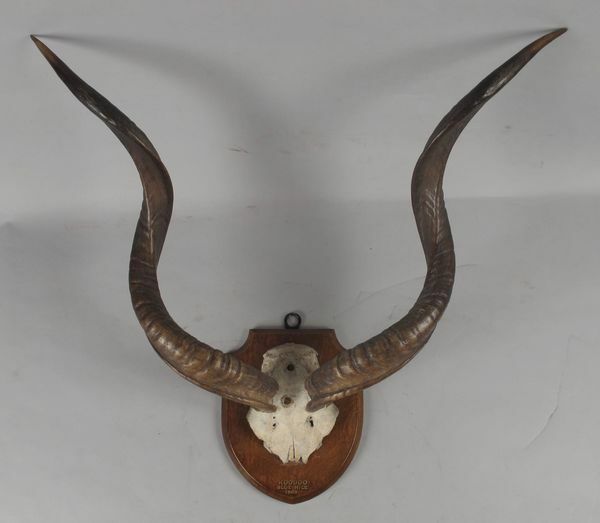 This is one hunting trophy of different trophy's ( including a few pairs) of a small collection what is coming from a Scottish estate. 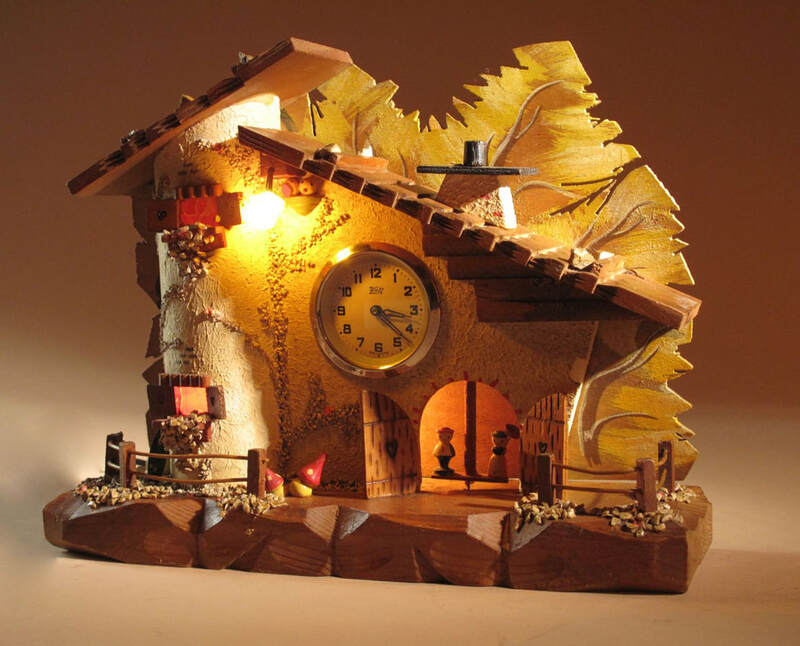 A very decorative and original Black Forest wall clock. Still with they original painted gilded dial plate. Decorated with eagle and flower trees. 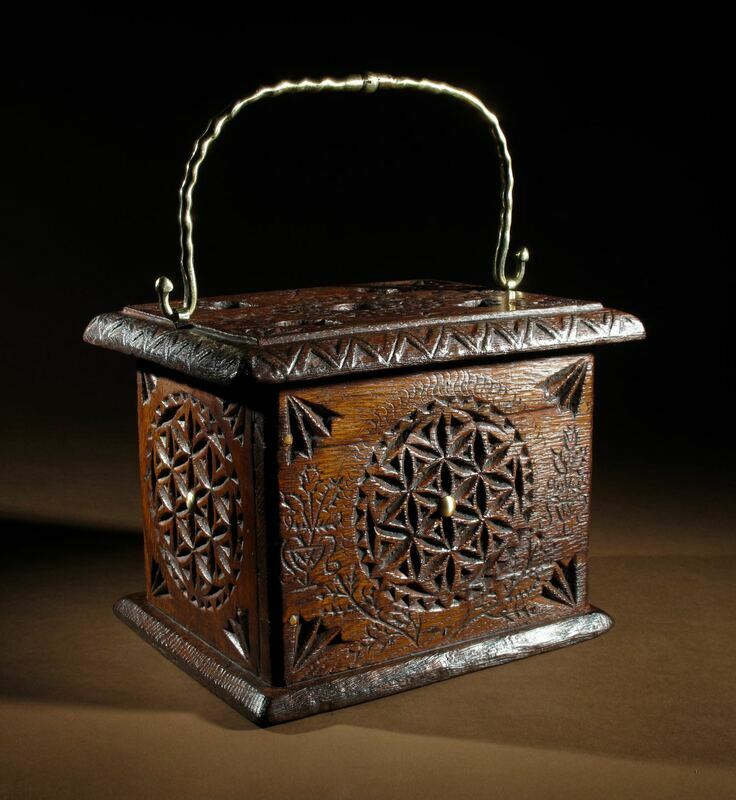 Interesting to see is that they also have used an 18th century Vizagapatam box from the period from circa 1740-1750. 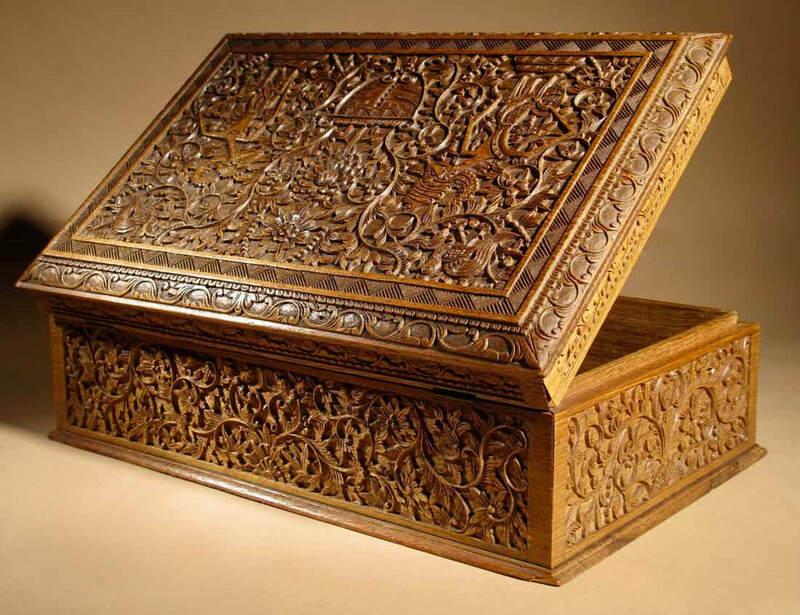 The top of the box is inlaid with an elegant tree-of-life, standing on a stylised rocky mound. Friesland, first half of the 17 th. Century. 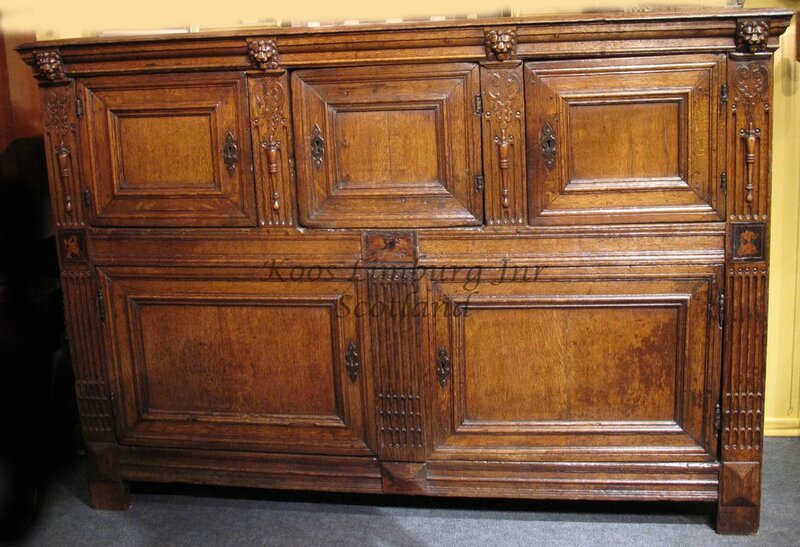 This is a so called: Amelander kast. 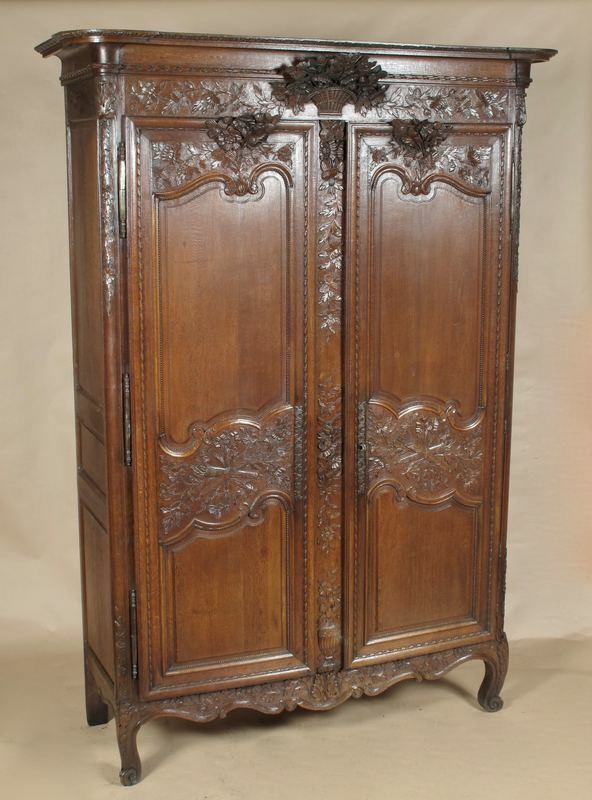 This type of Amelander armoire is difficult to find. 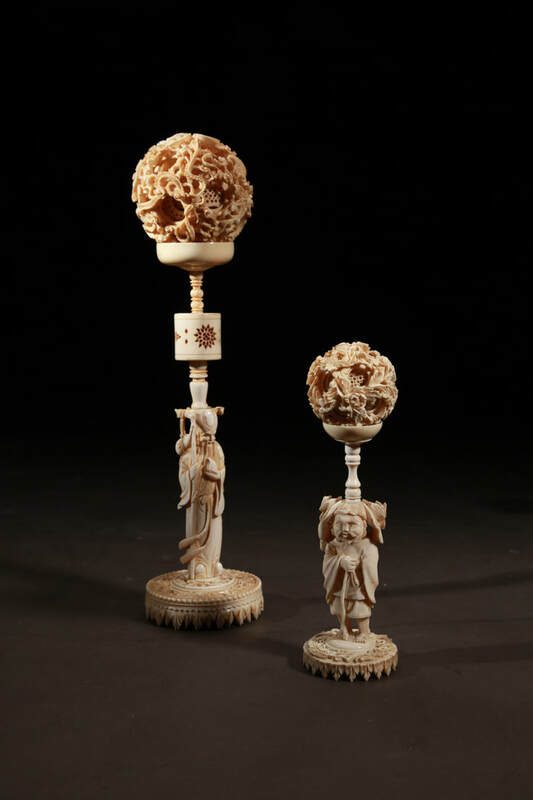 An impressive and very decorative finely carved ivory tusk on original wooden stand. 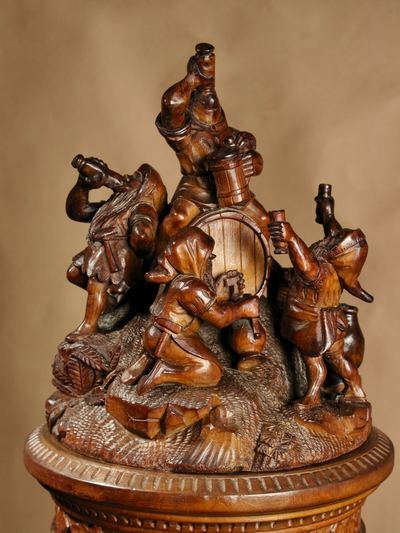 This tusk is extremely fine carved with many figures in a village scene. 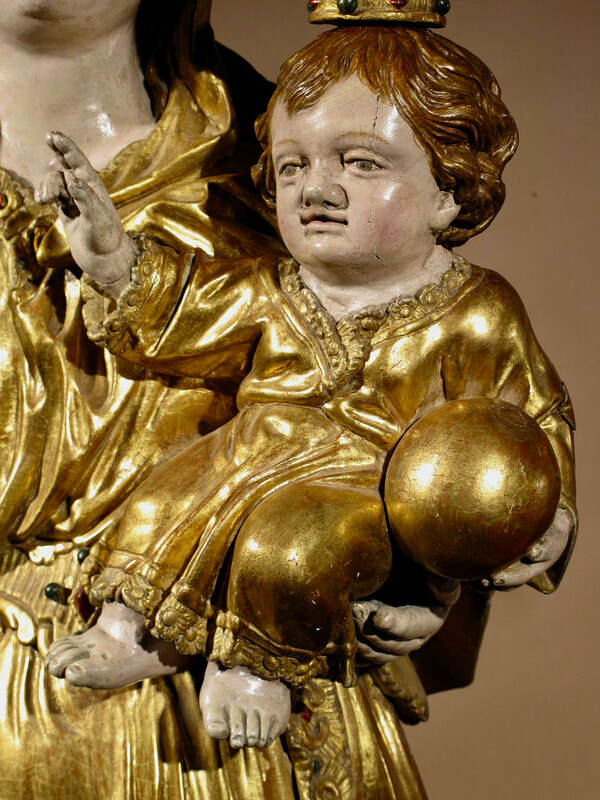 It is in original condition with no restorations and nothing is missing, still with the original patination. A really extremely fine carving! 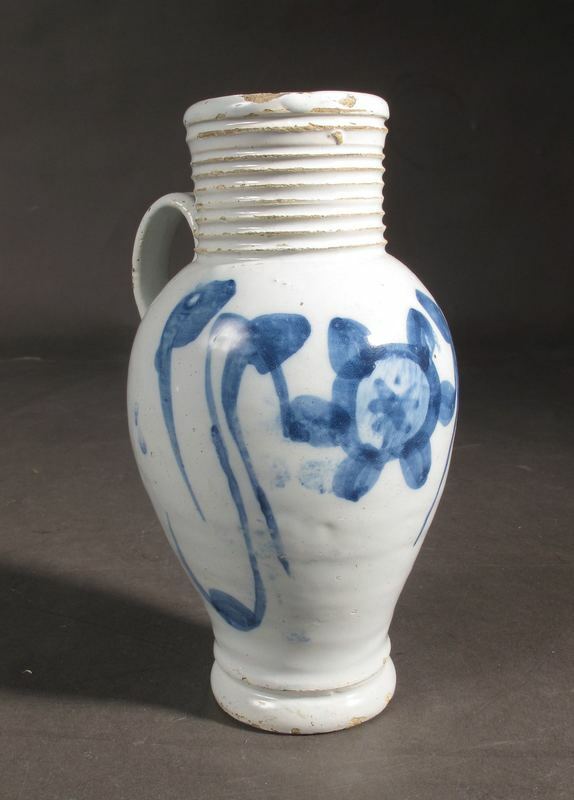 18th century English Delft jug with beautiful glaze. 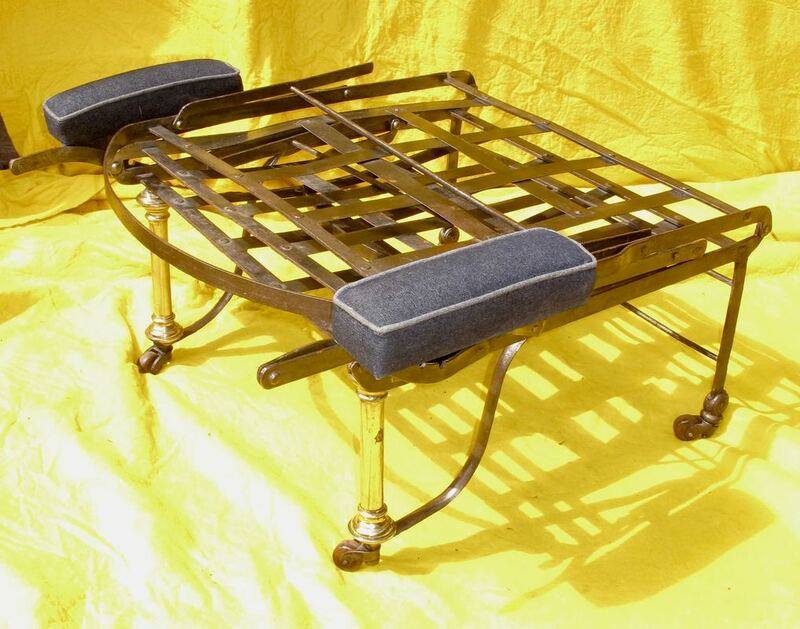 in very good original condition not restored. 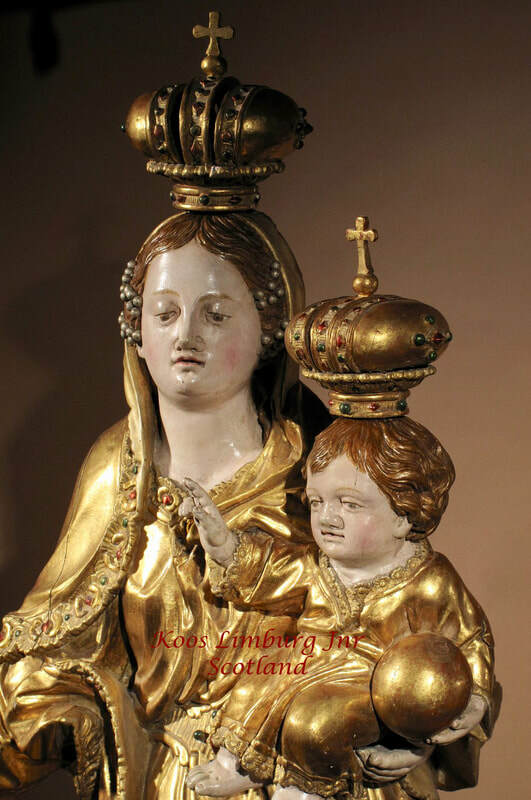 i h s and the family armorials of the family Van Doetinchem. Wide: 47 cm, high: 43 cm. 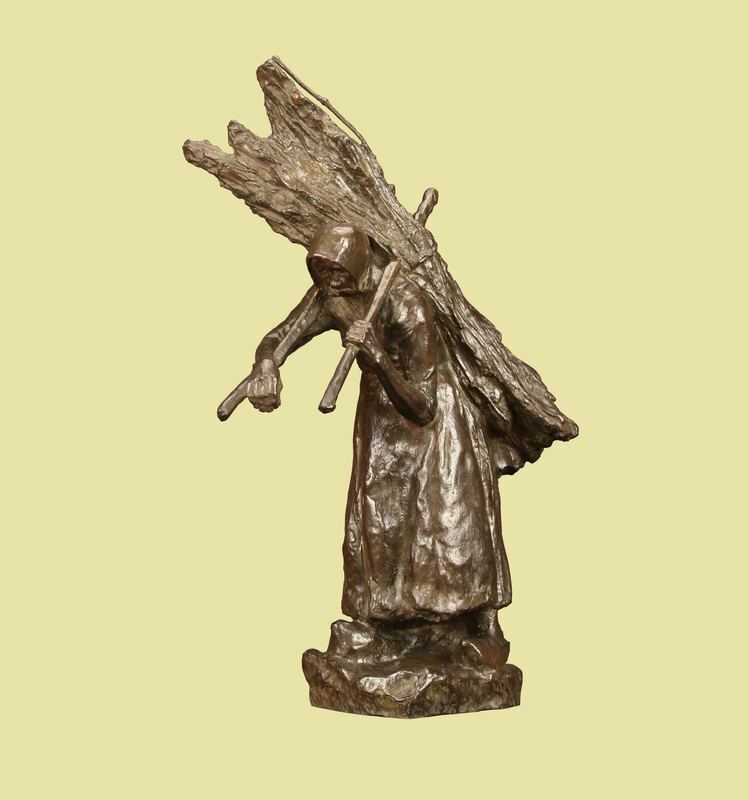 “ Het Zwolse goud en zilversmids ambacht en zijn meesters”. 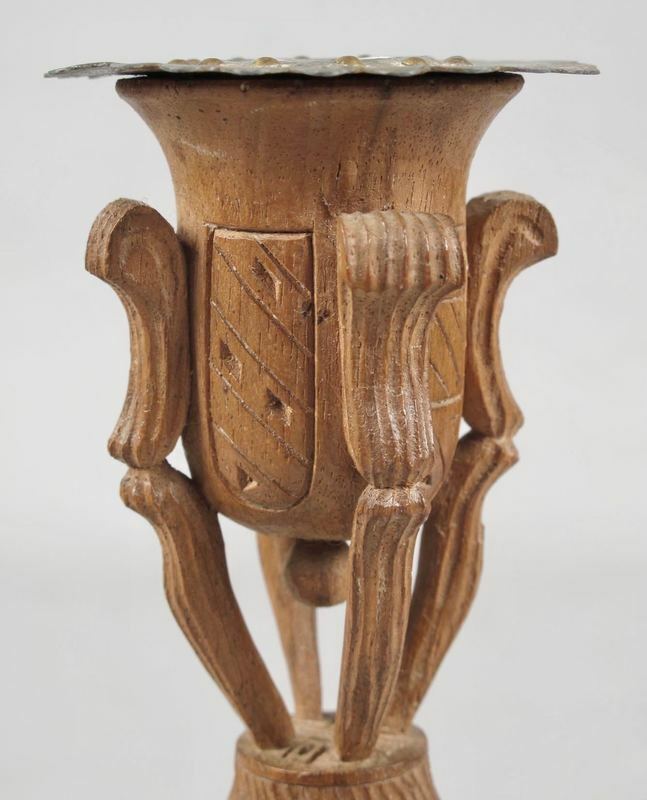 Van Doetinchem family armorials, made in the second half of the 17th. century, by the Zwolle gold smith: Derck Lambersen Bergh have the initials: VA ( Van Aken ) in addition to the Van Doetinchem Arms. 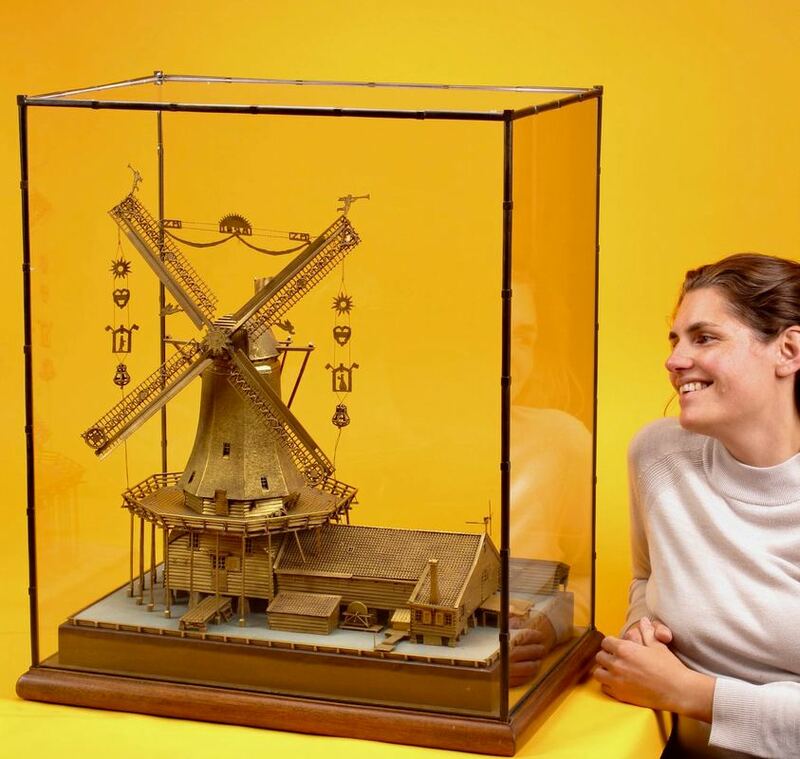 Till now on it is not known how the connection was between the family’s Van Aken and Van Doetinchem. 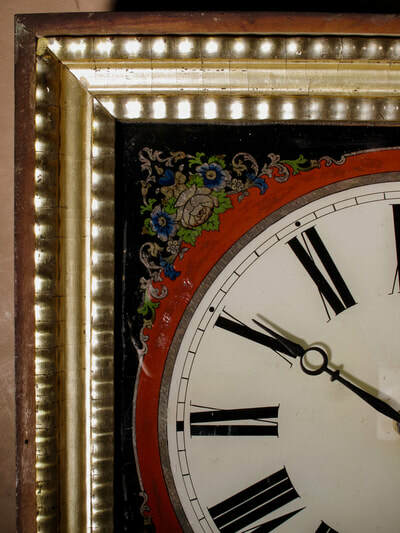 Still with the original painted decoration on the clock case and with the original porcelain pillars. A very decorative and original moving eyes Black Forest Owl wall clock. 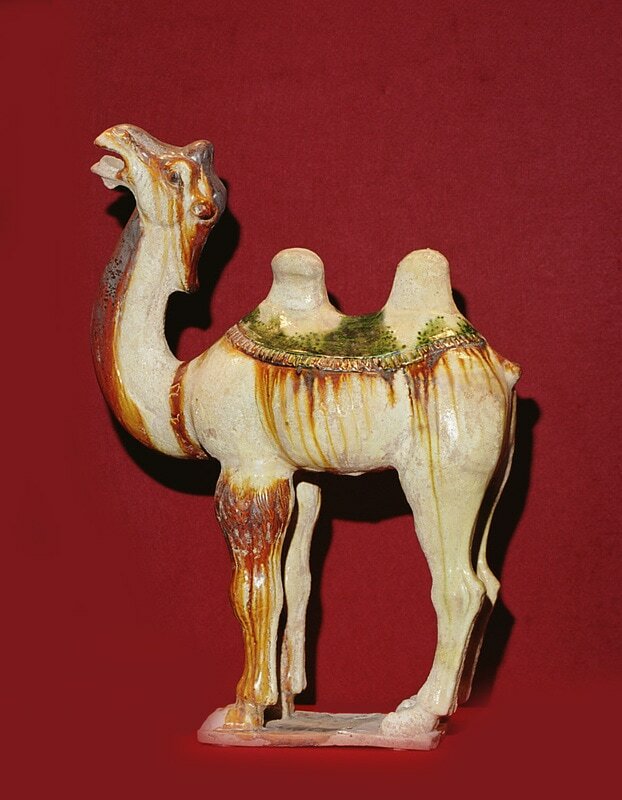 In original condition and patination. 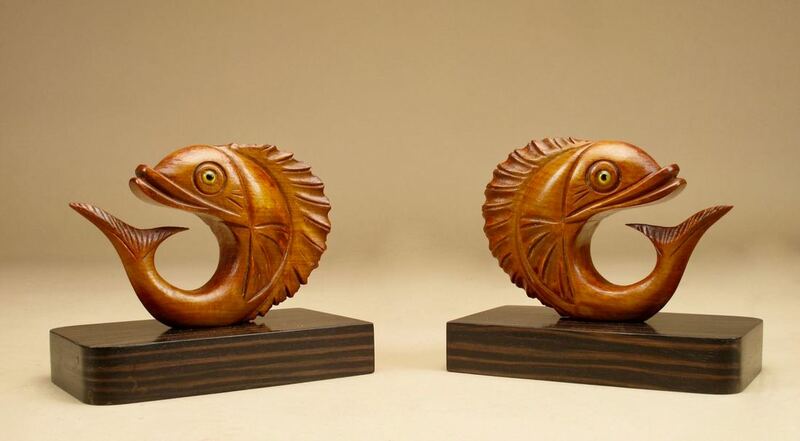 A pair of very rare and decorative original Japanese nodding heads bookends. Decorated with a man and a woman, and still with the original paint work and patination. 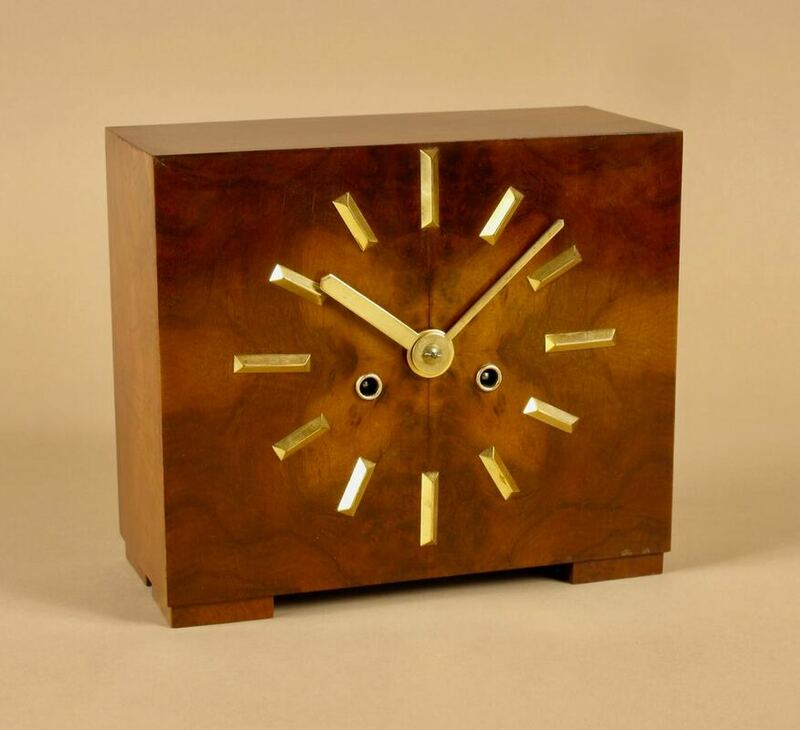 A very interesting and rare art deco mirrored wall clock. The glass of the normal coloured mirrors deeply engraved with the zodiac symbols. The dial engraved with England. 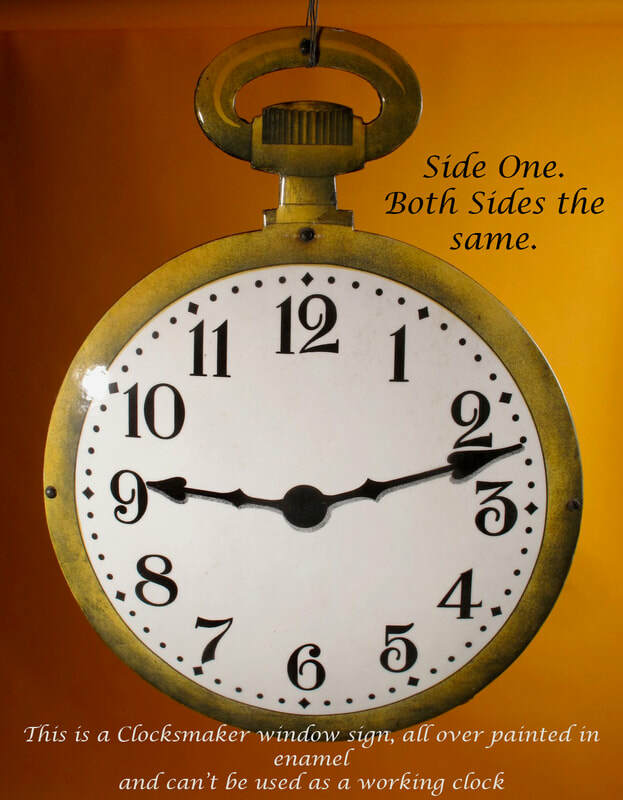 Still with the original movement. ​Whole over in original untouched condition. 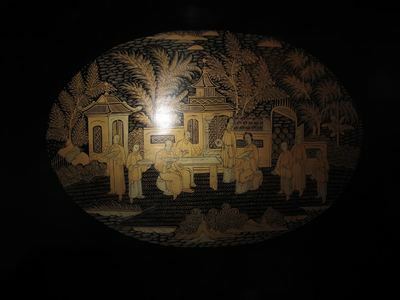 The reason for this is that we have put black paper in front of the clock, to see the beautiful engraving better. 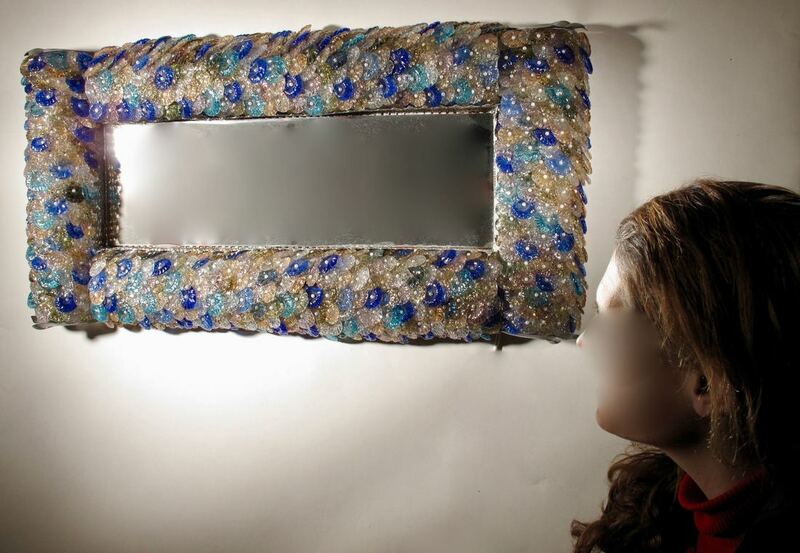 all the mirrors have the normal neutral mirror colour. 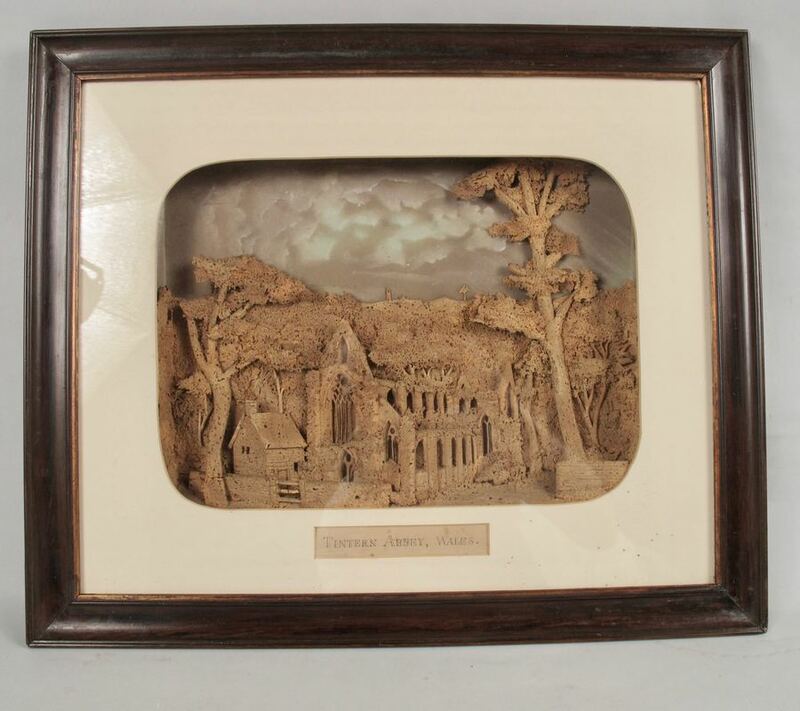 A very decorative crisply carved picture/mirror frame. Still with the original gilding and also with the original religious print. On the back with original makers label of Angiolo Valdinoci Florence. 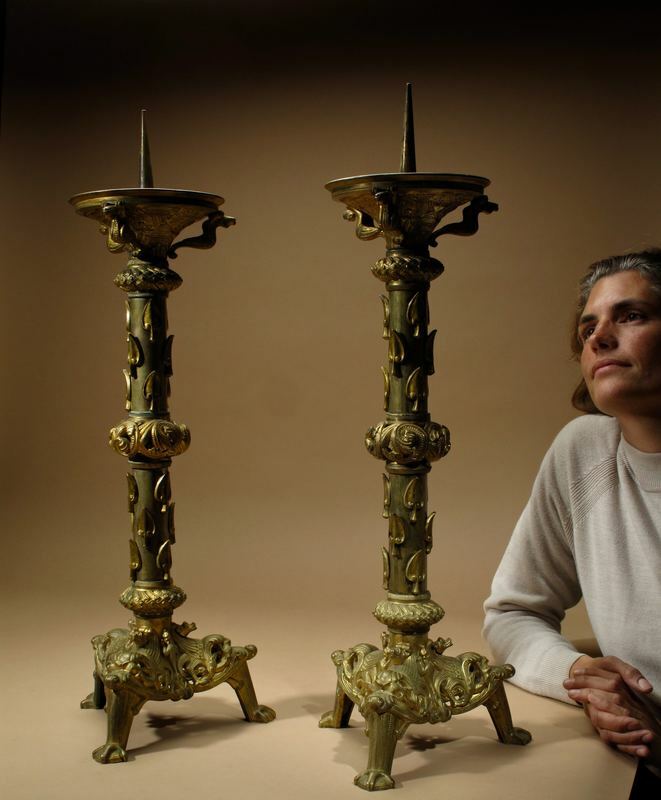 Both sides with the same bronze gilded mounts. 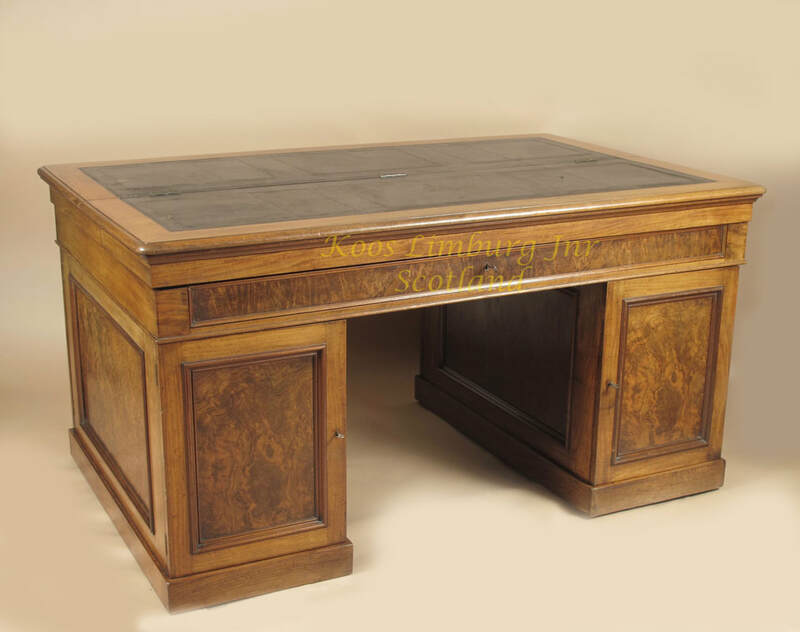 A magnificent very stylish yew wood table in the shaker style. In original good condition with nice old patination. 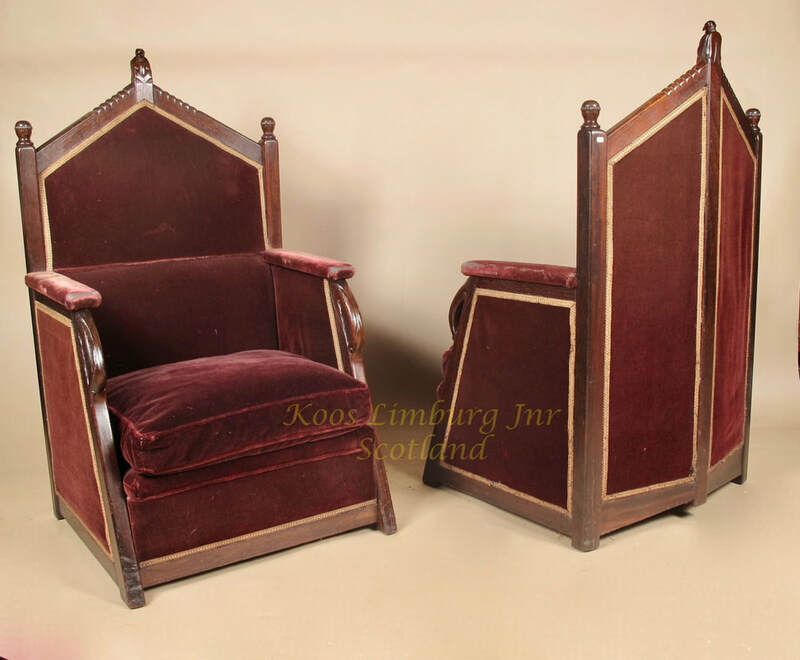 In original untouched and unrestored condition. 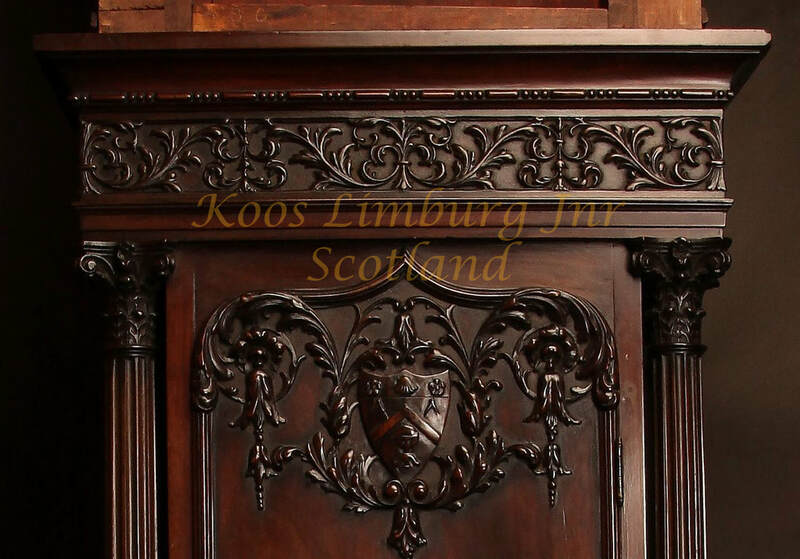 At the front the mark of the family: Imhoff, one of the most important trade families of Neurenberg in that period. 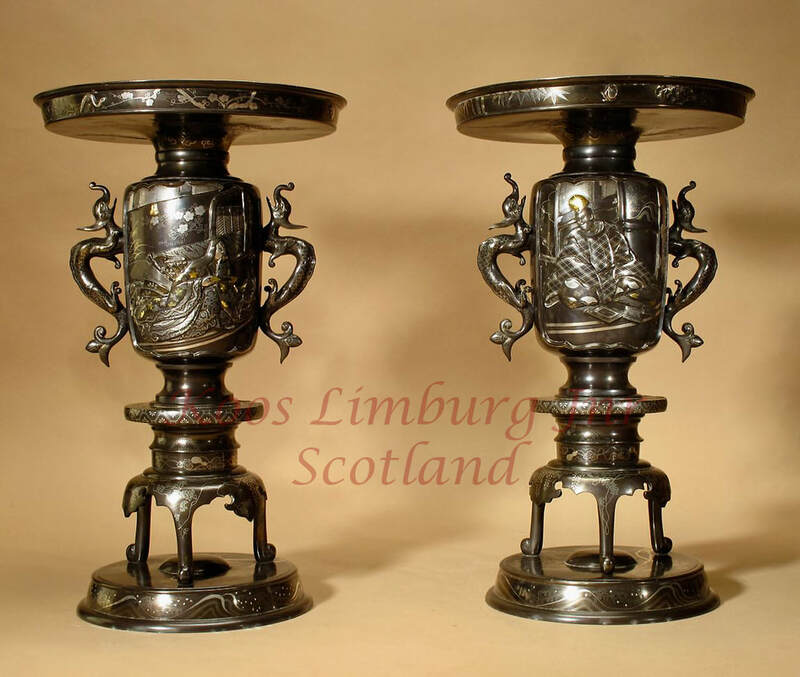 fine quality to compare with engraving on silver. An exceptional elegant Dutch "Kabinet"
carved with the four seasons on the doors and beautiful carving on the top. 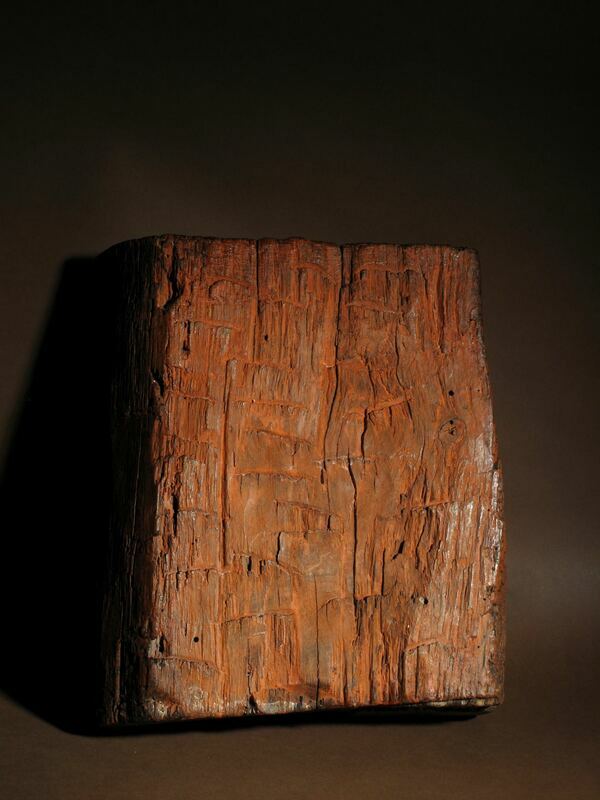 ​Still with the original old colour and patination. The same type of kabinet is in the collection of the Rijksmuseum in Amsterdam. 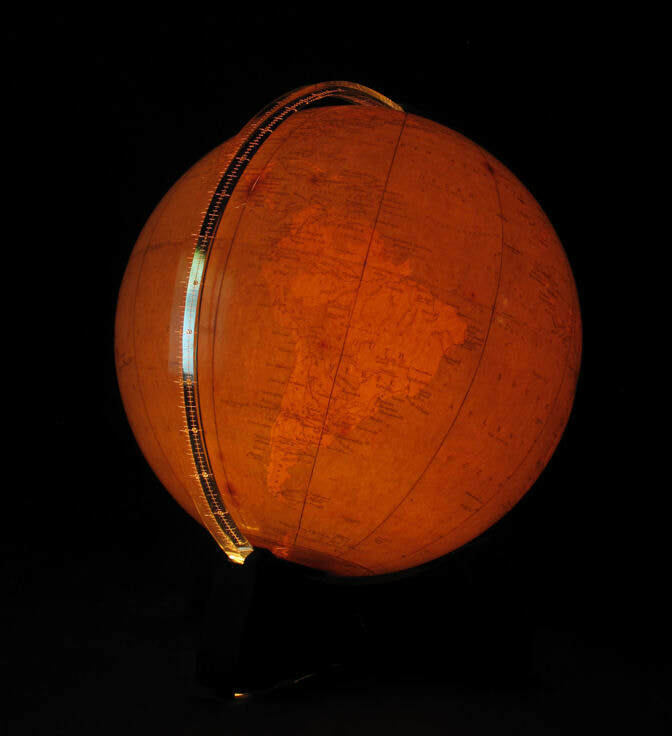 The cabinet on the image is slightly to red and is in real more yellow. 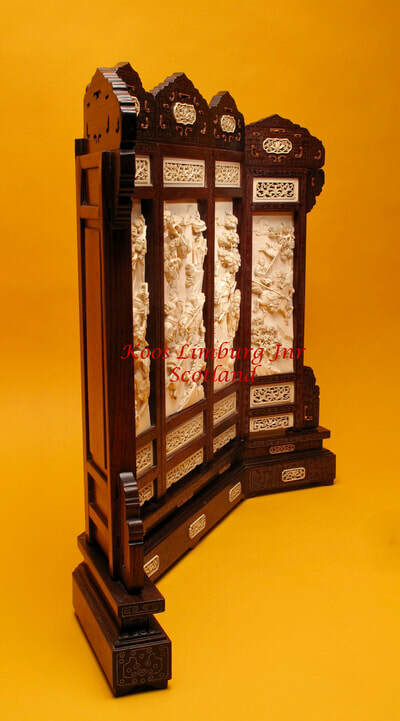 With very beautiful finely carved original base. 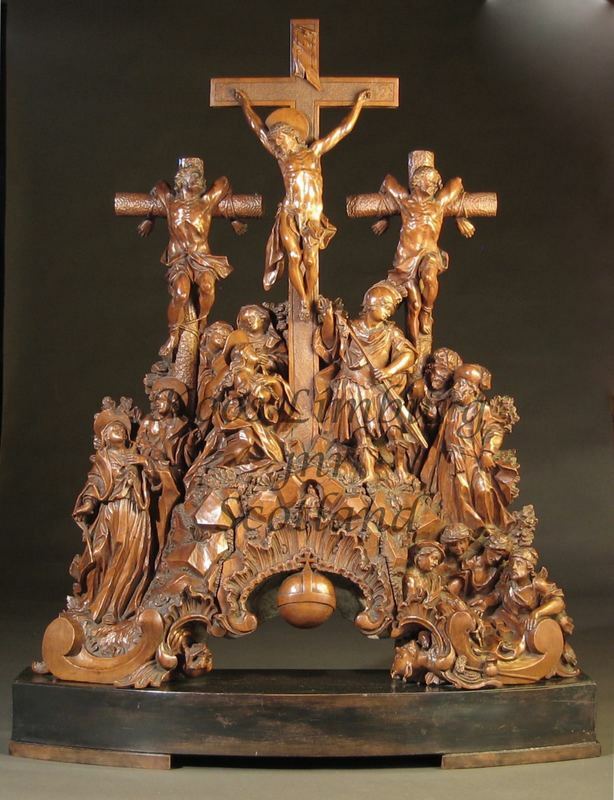 A magnificent carved pear wood group of the Crucifixion. 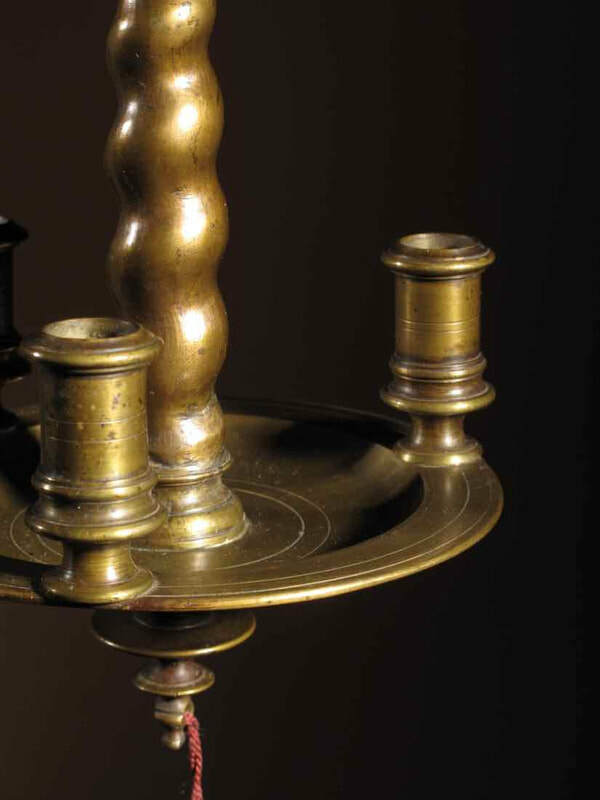 in das Main Frankische Museum in Wurzburg. 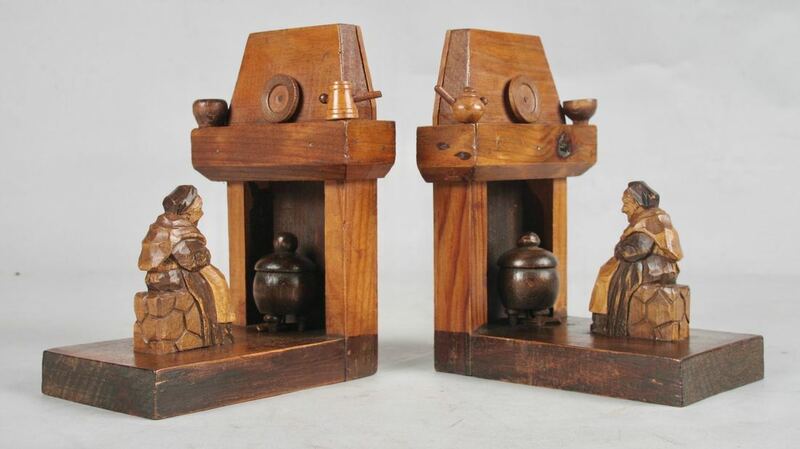 A pair of very rare and amusing very decorative wooden black forest bookends. In original condition with nice old patination. 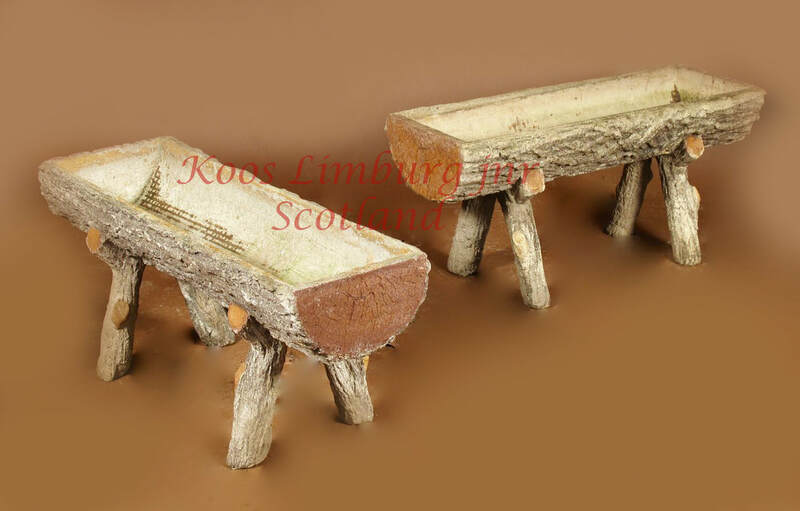 This type of black forrest bookends we have never seen before. 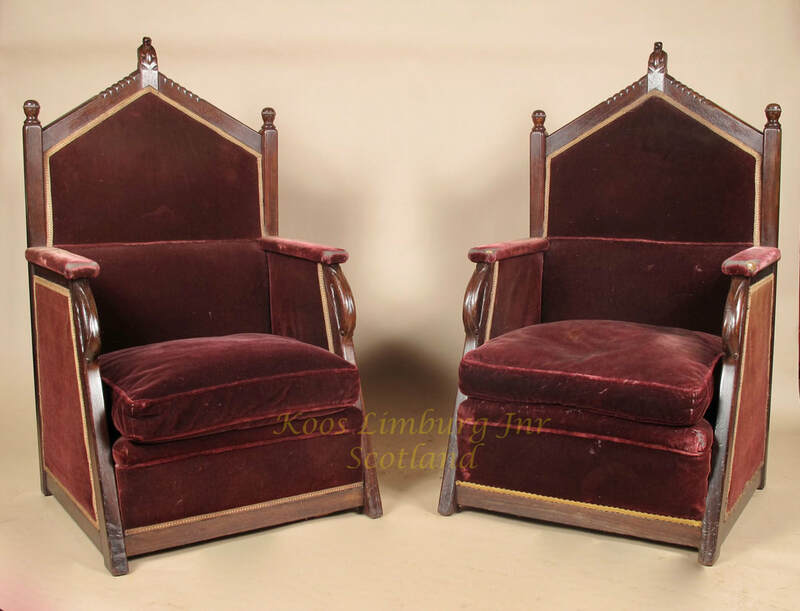 A very impressive,stylisch and exceptional pair Jati wood throne chairs. Marked for Jac. van den Bosch plus retailers metal label. 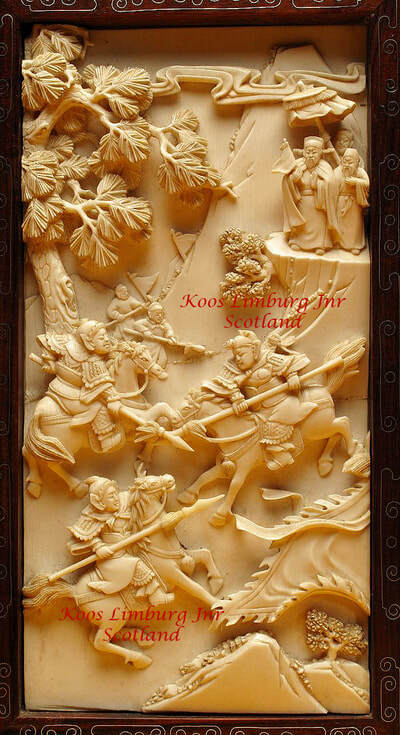 With very nice and very stylish carving. who became King and Queen of Bayern six years later. home of Princess Marie von Preussen. and the coat of Arms of Bayern. 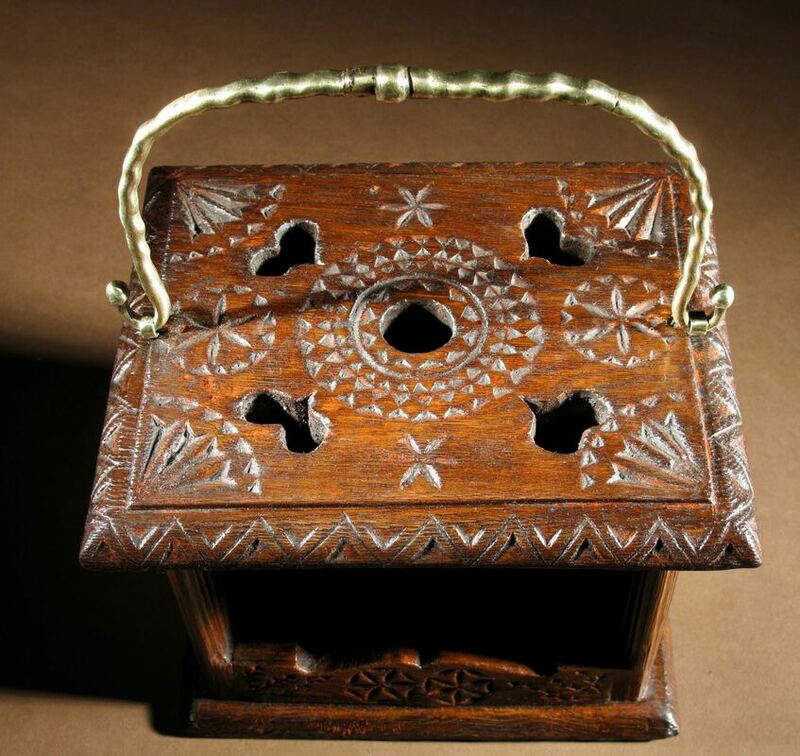 Still with the original lock and key. 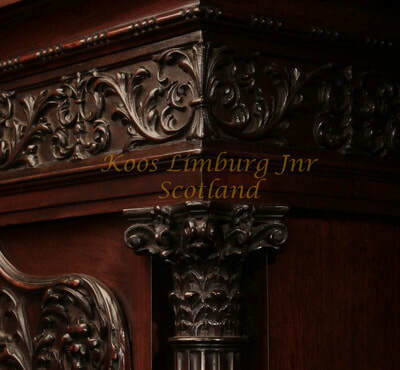 This policy applies to information held about clients and prospective clients, suppliers and prospective suppliers, contacts and all other persons about whom Koos Limburg Jnr. holds information. By ‘information,’ we mean personal information about you that we collect, use, share and store. ♣ information in relation to your purchase of our artwork, antiques or use of our services. 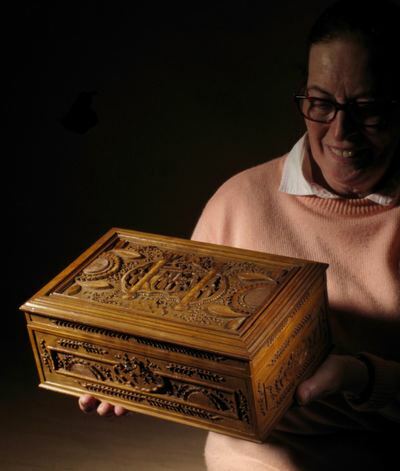 ♣ provide information about our antiques / artworks / works of art and services to you. ♣ keep you informed about antiques / artworks / works of art, artists and events that we think you may find interesting. ♣ carry out our obligations arising from any agreements entered into between you and us. ♣ for security and to check your identity. ♣ law enforcement agencies, other governmental agencies or third parties if we are required by law to do so. ♣ to not be subject to a decision based on automated processing and to have safeguards put in place if you are being profiled based on your personal data. 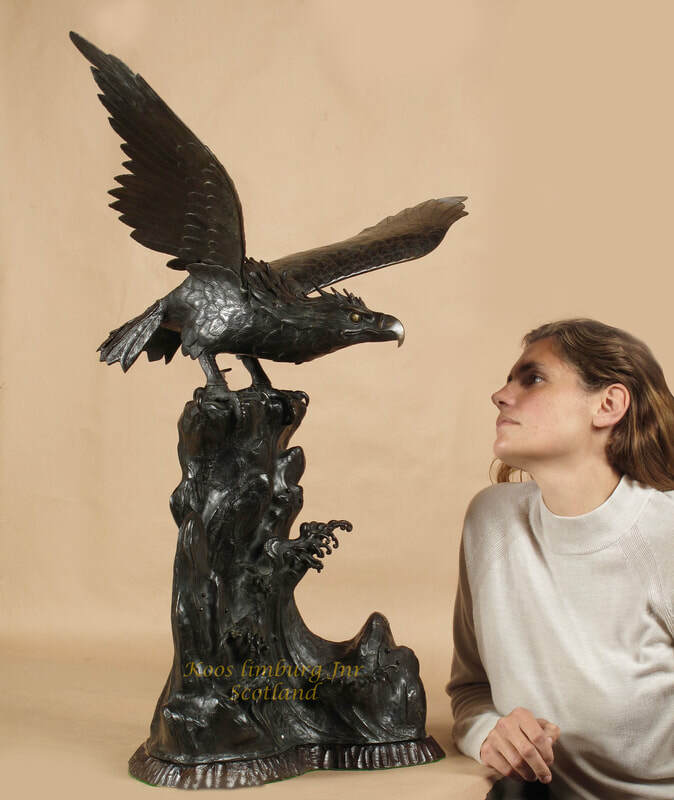 Where you are one of our clients or have otherwise agreed to be contacted for marketing we may use your personal information to send you information about our artwork, antiques, events, and art and antiques fairs. 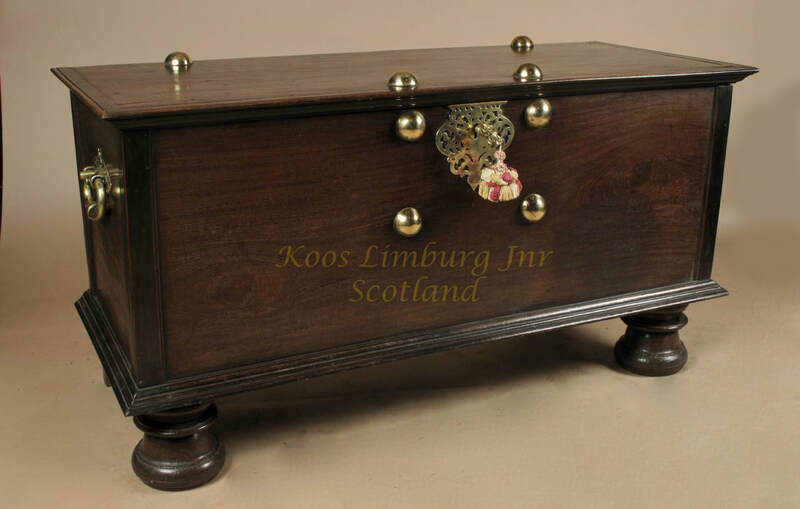 You can stop receiving marketing messages from us at any time by sending us an email: antiques@koos-limburg-jnr.com or post us a letter.